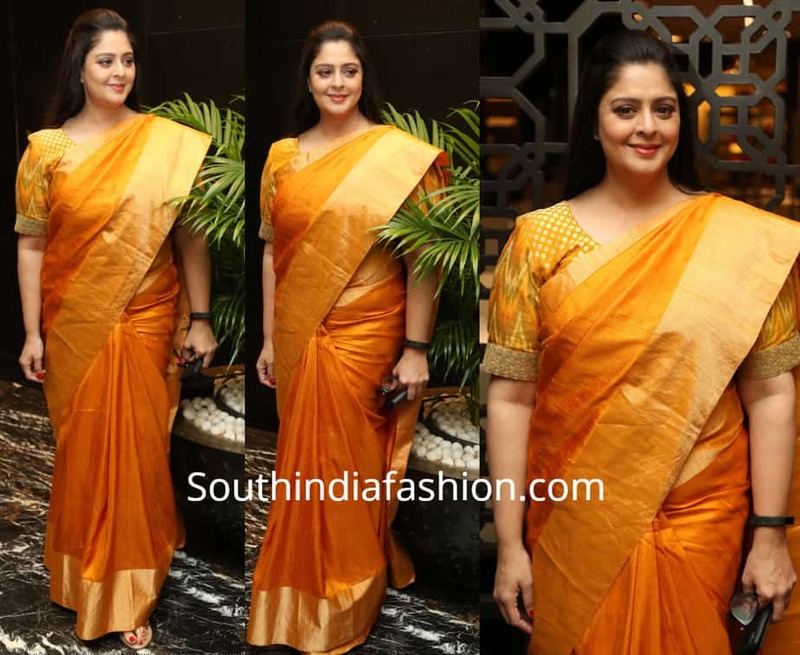 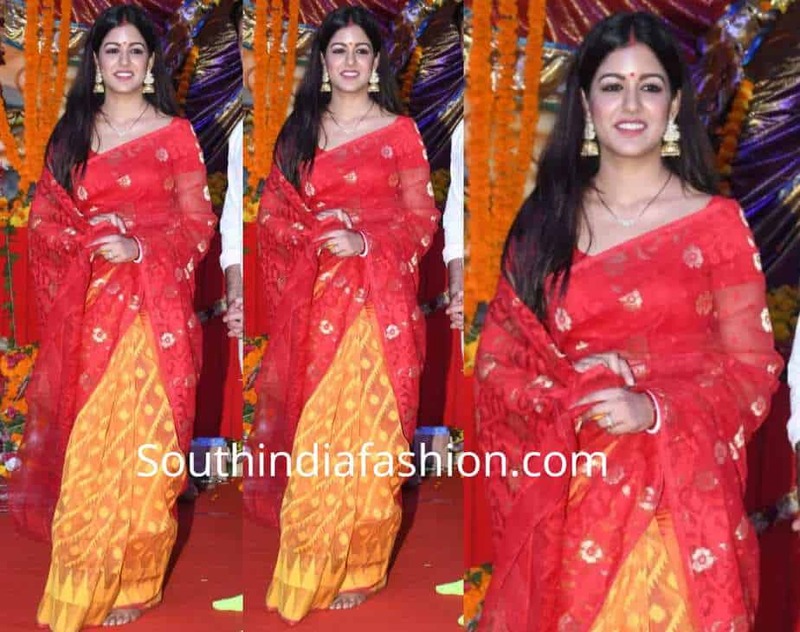 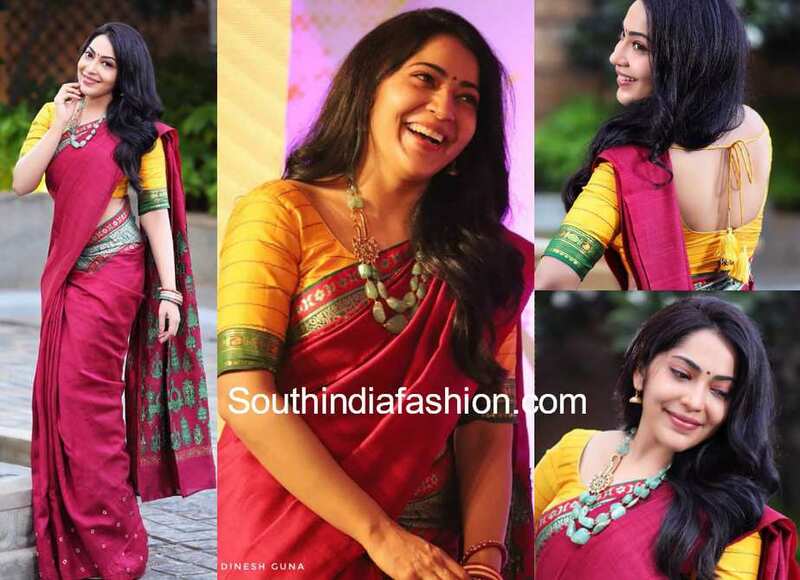 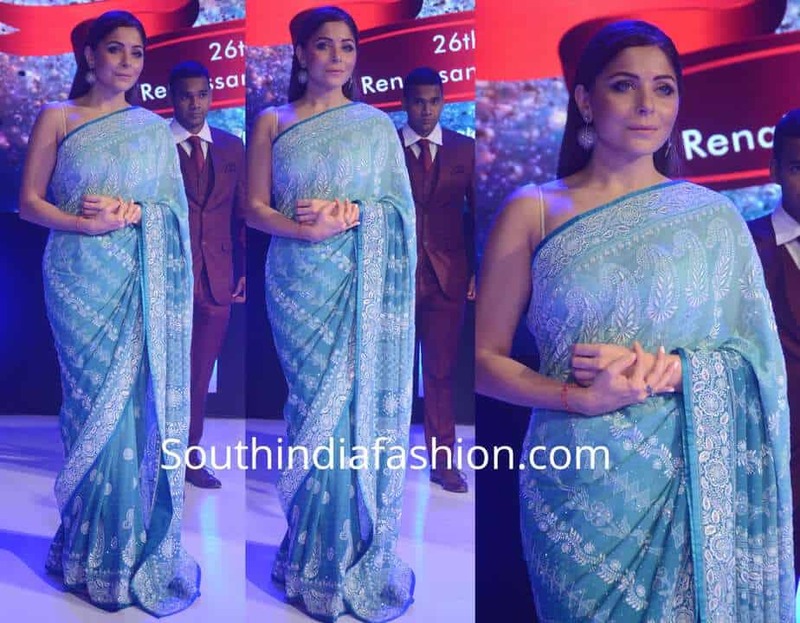 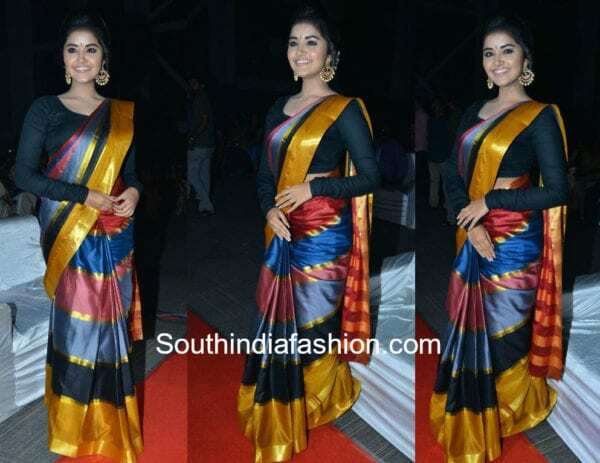 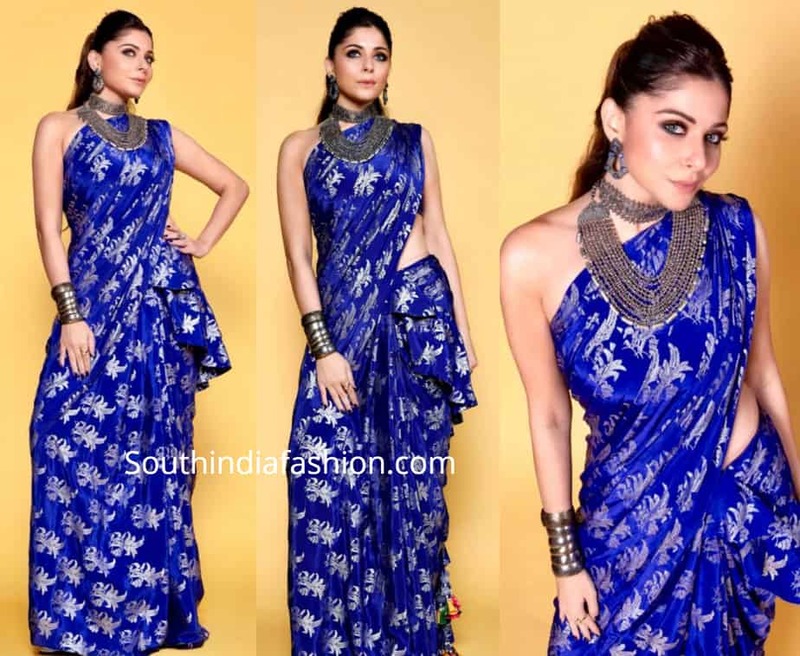 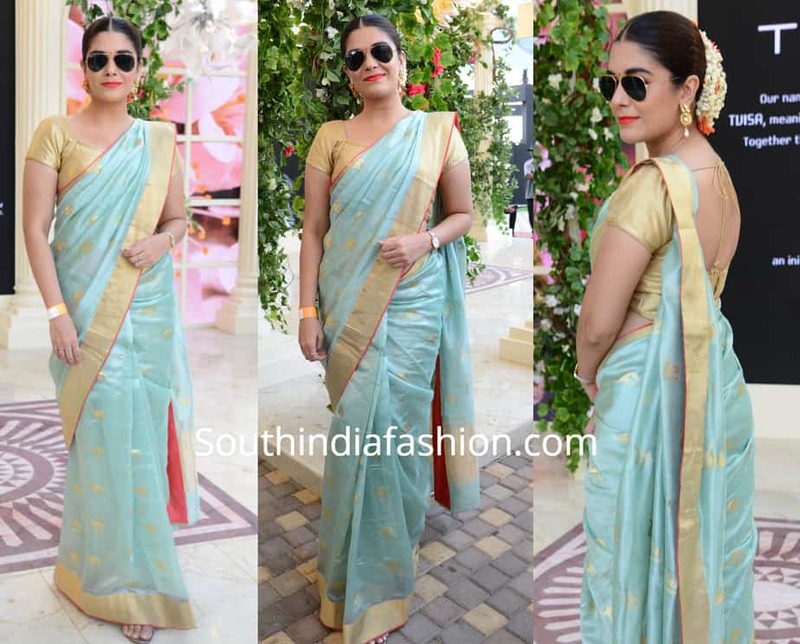 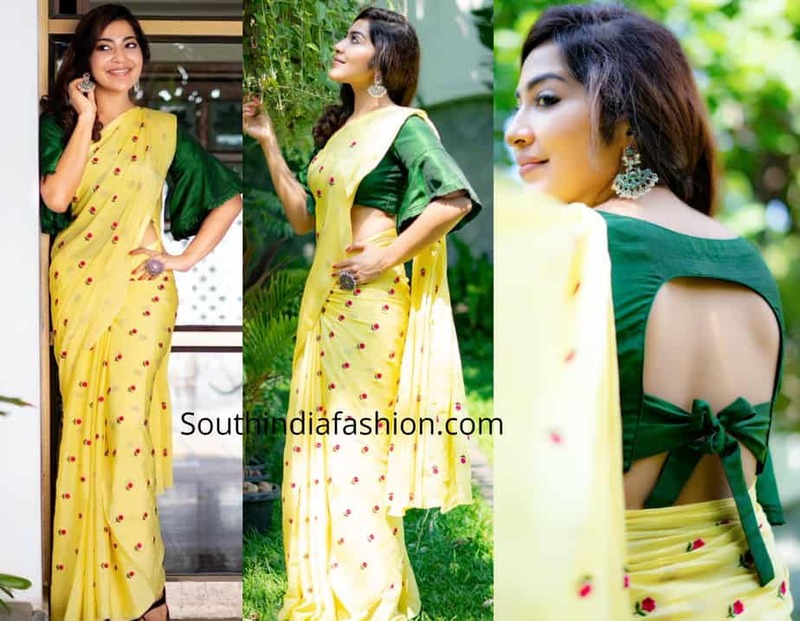 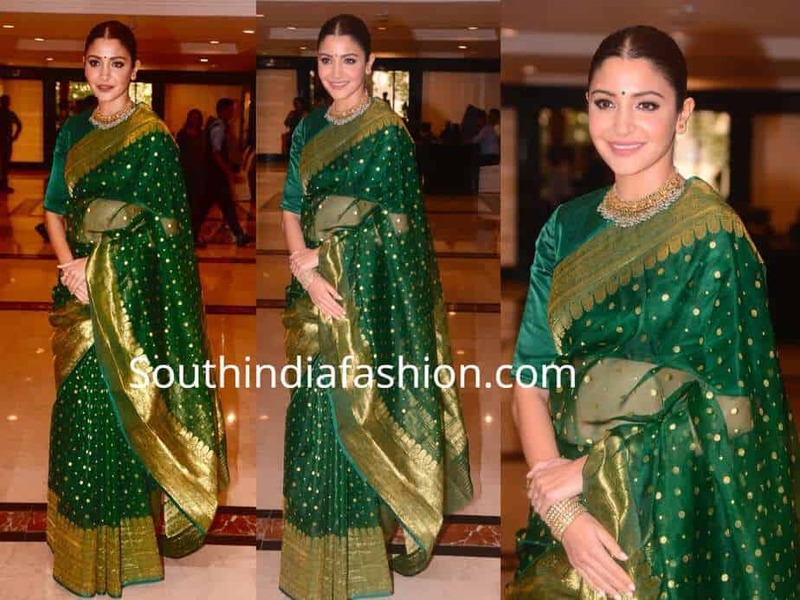 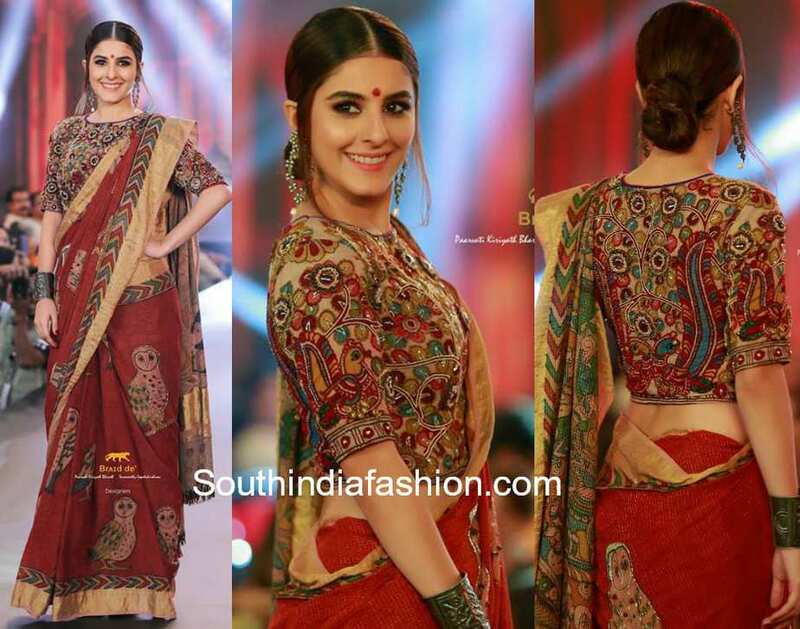 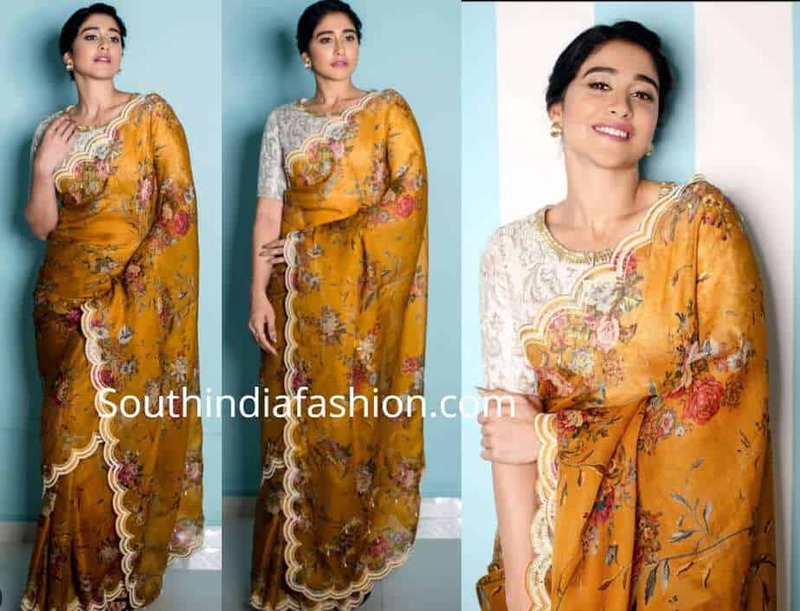 Raashi Khanna’s Summer Saree Look! 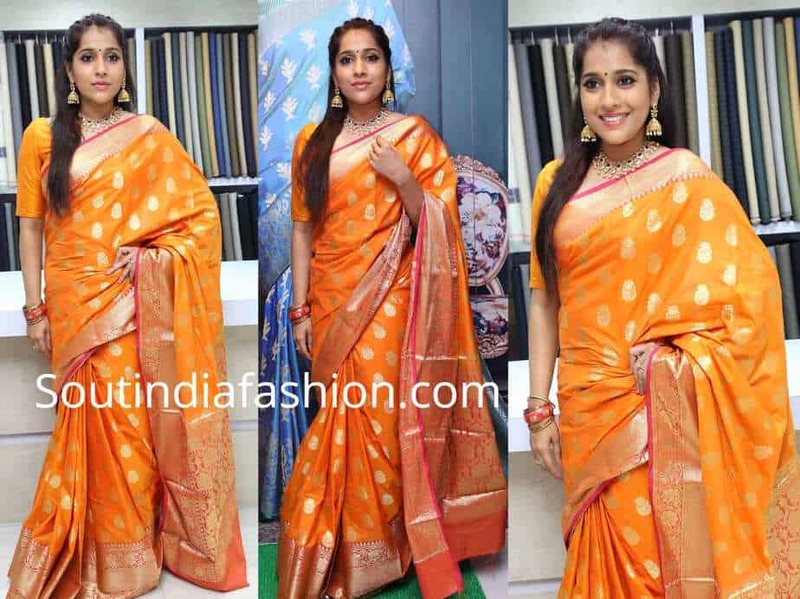 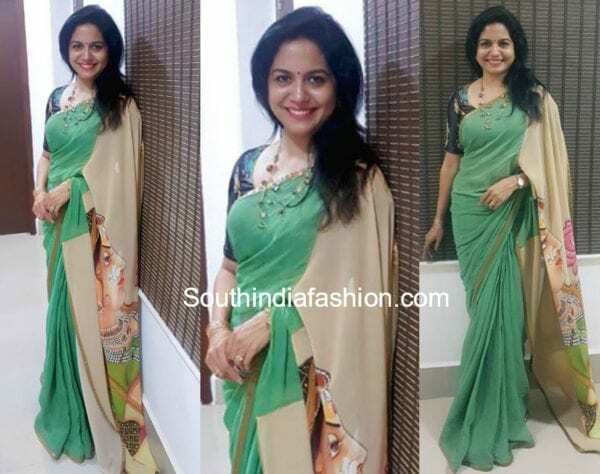 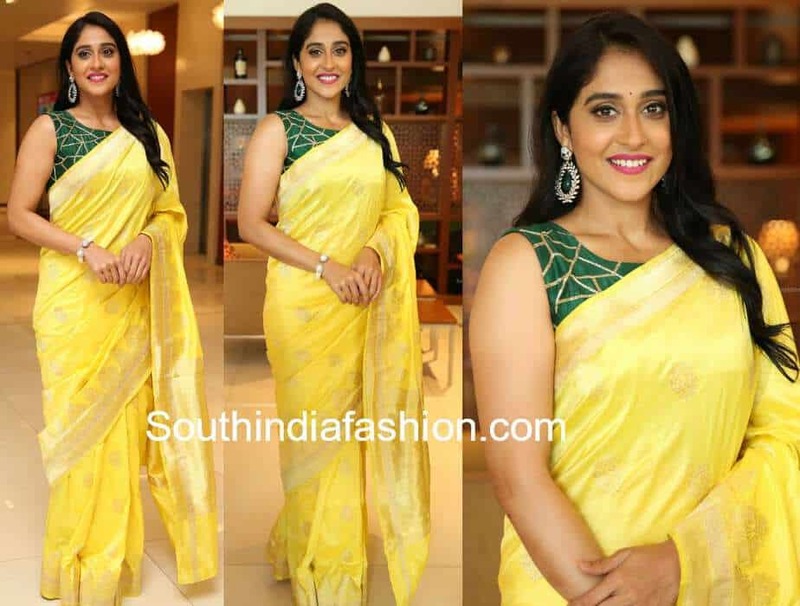 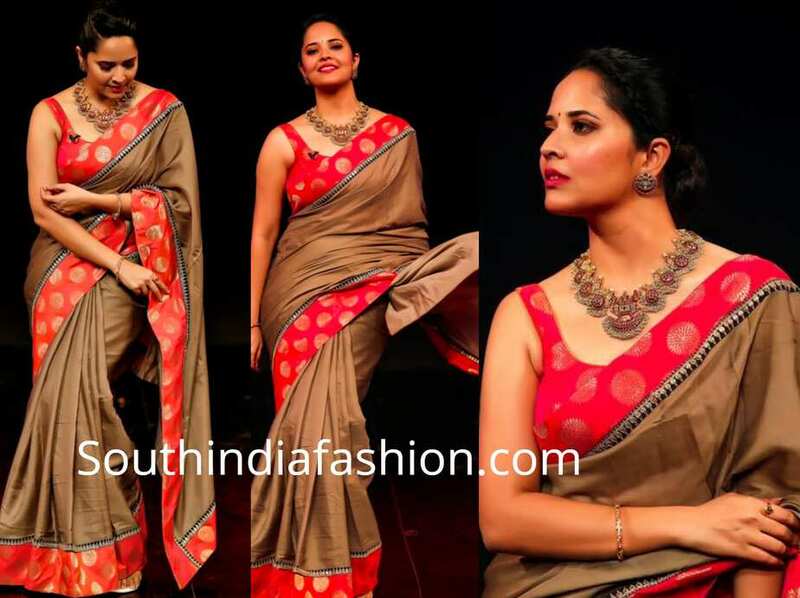 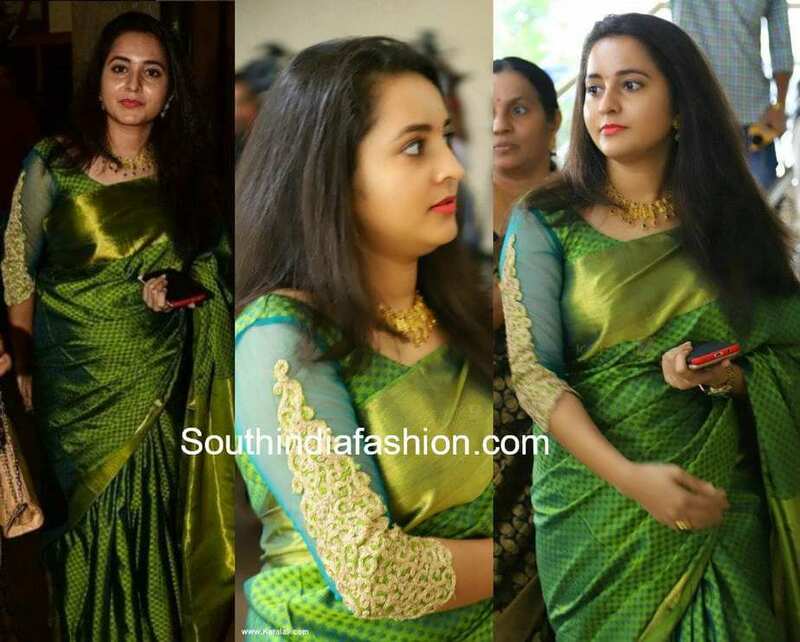 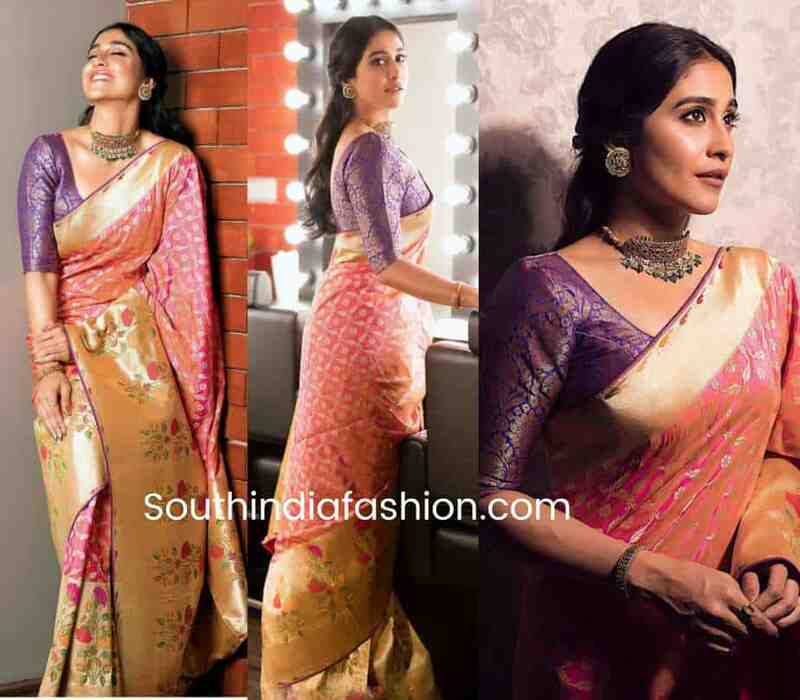 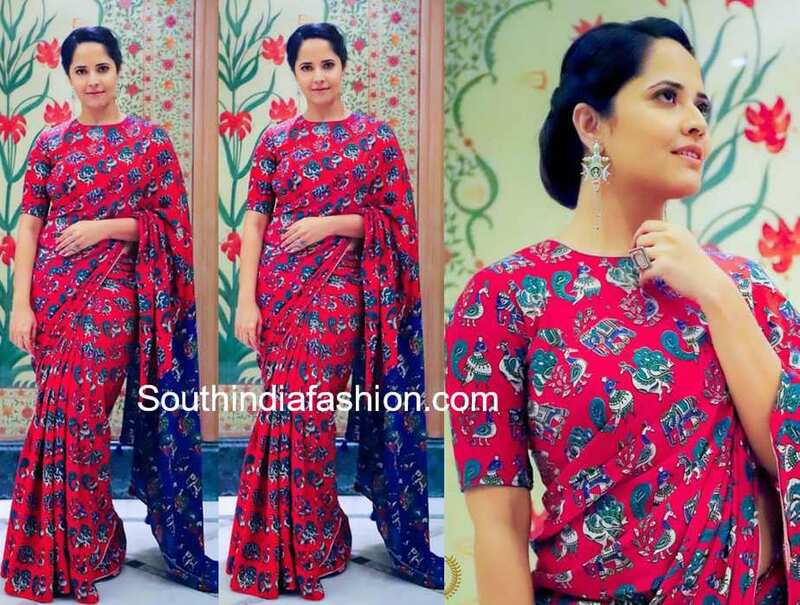 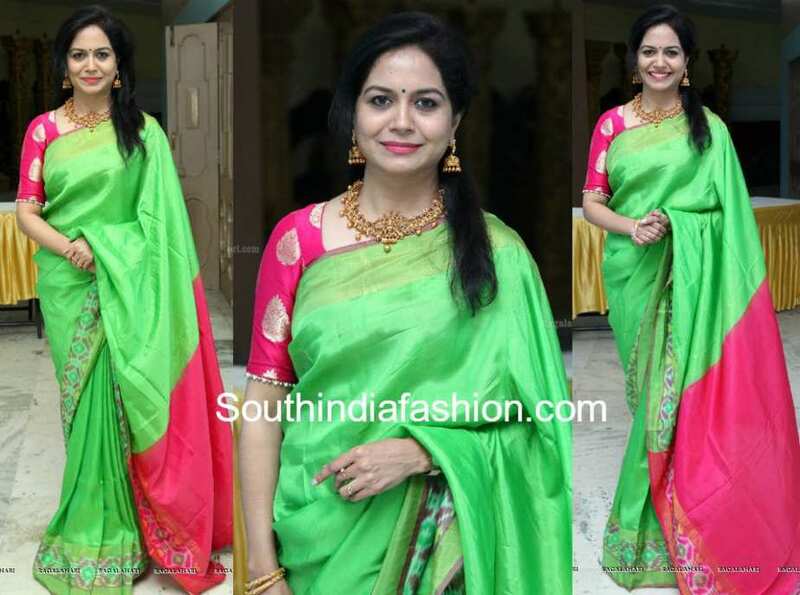 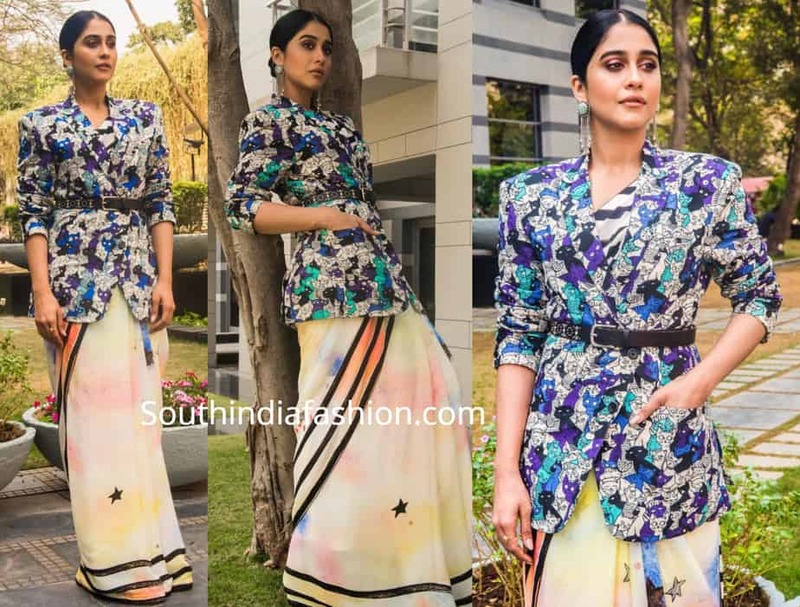 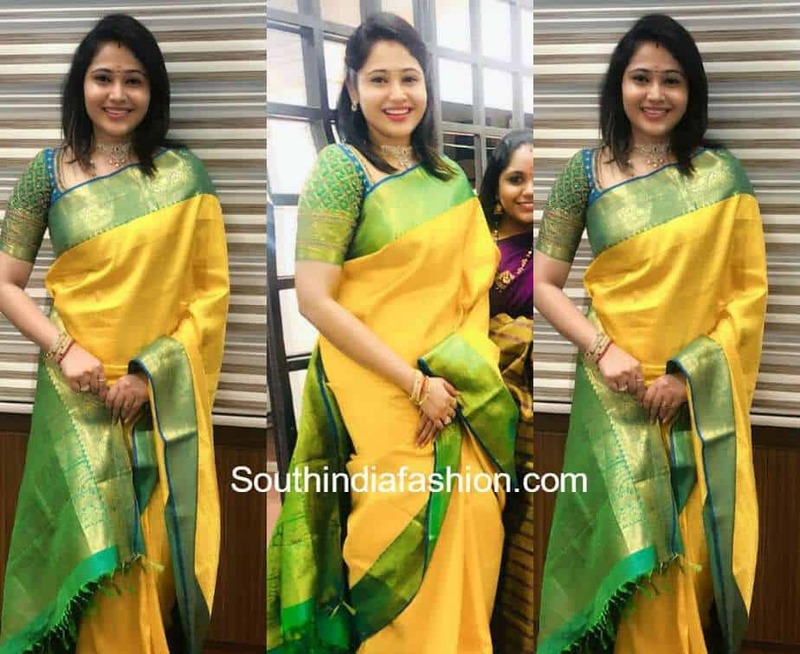 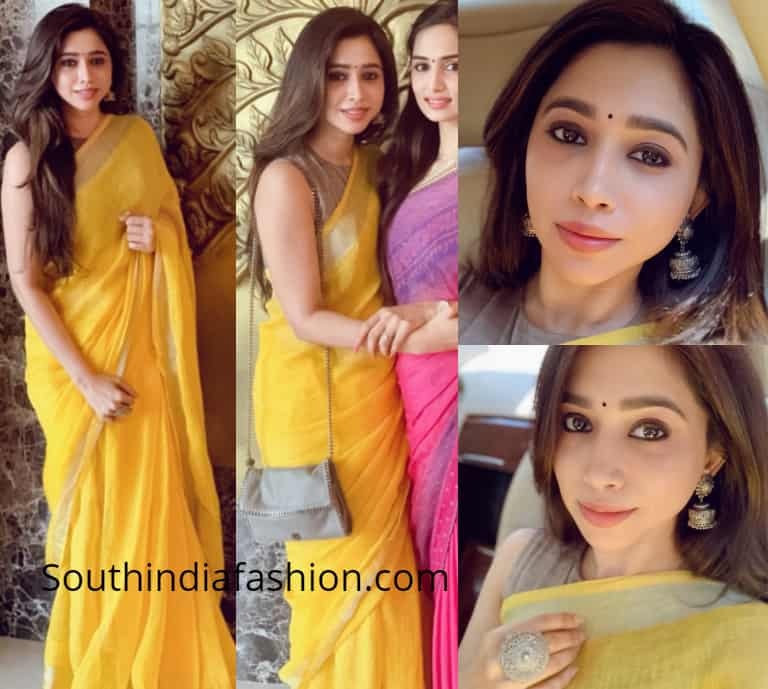 Anchor Anasuya’s Summer Saree Look! 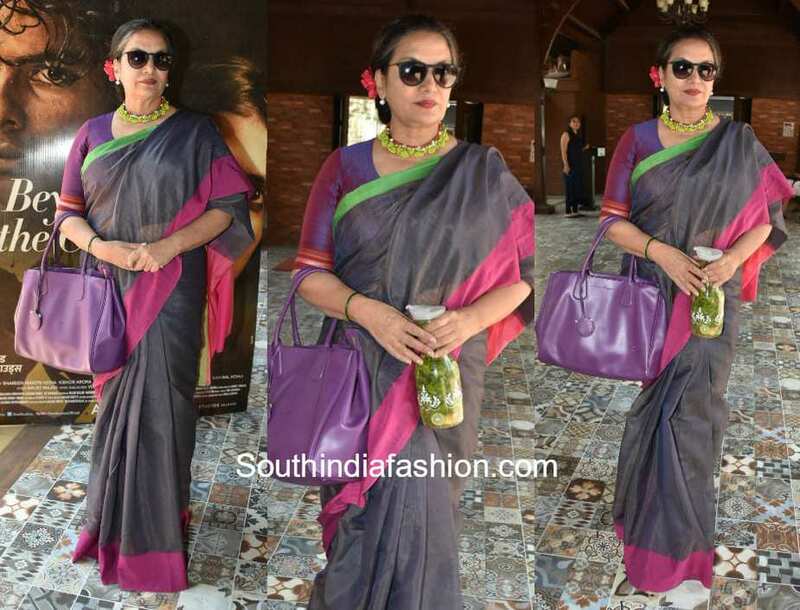 Kangana Ranaut’s classy airport look! 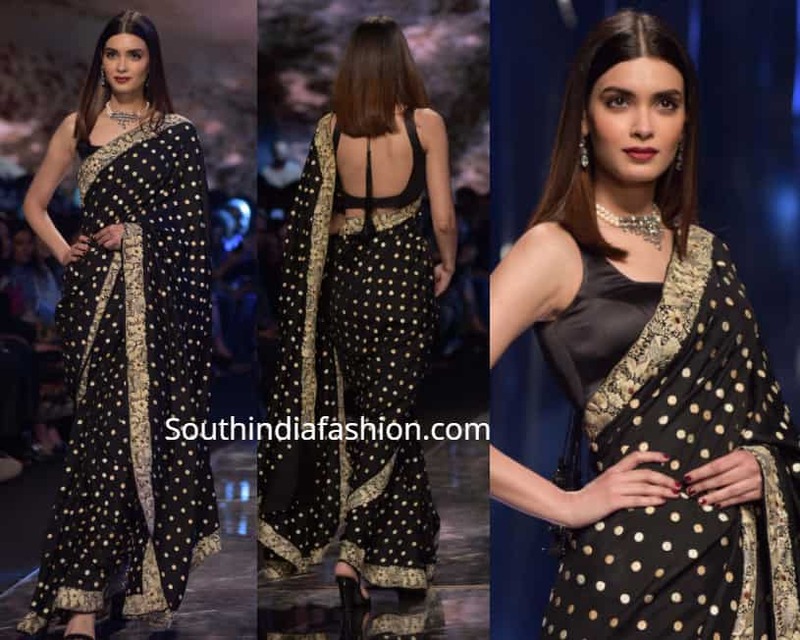 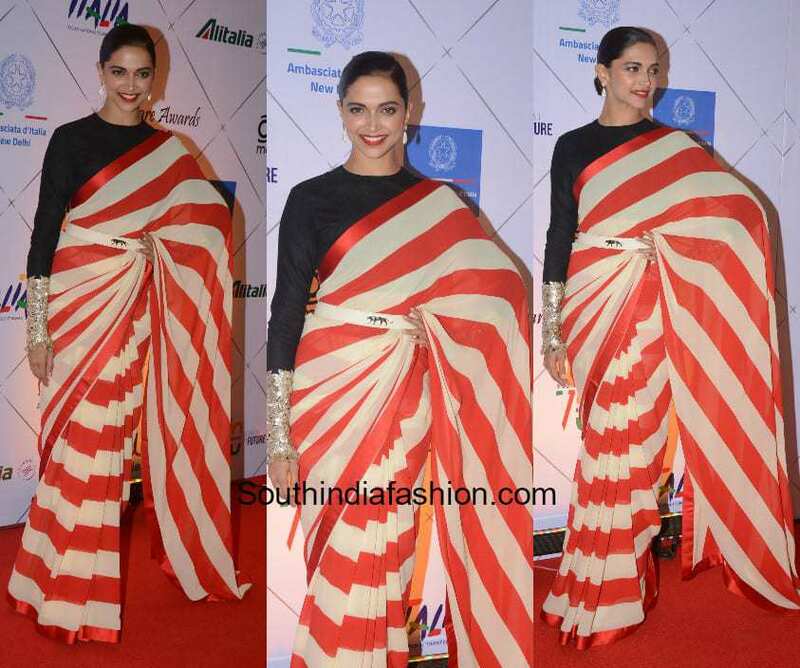 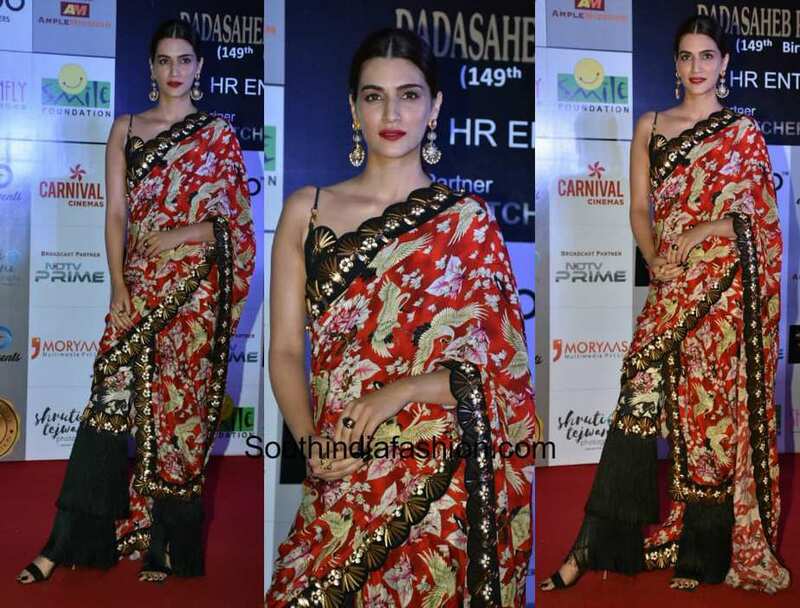 Sonam Kapoor’s Fusion Saree Look! 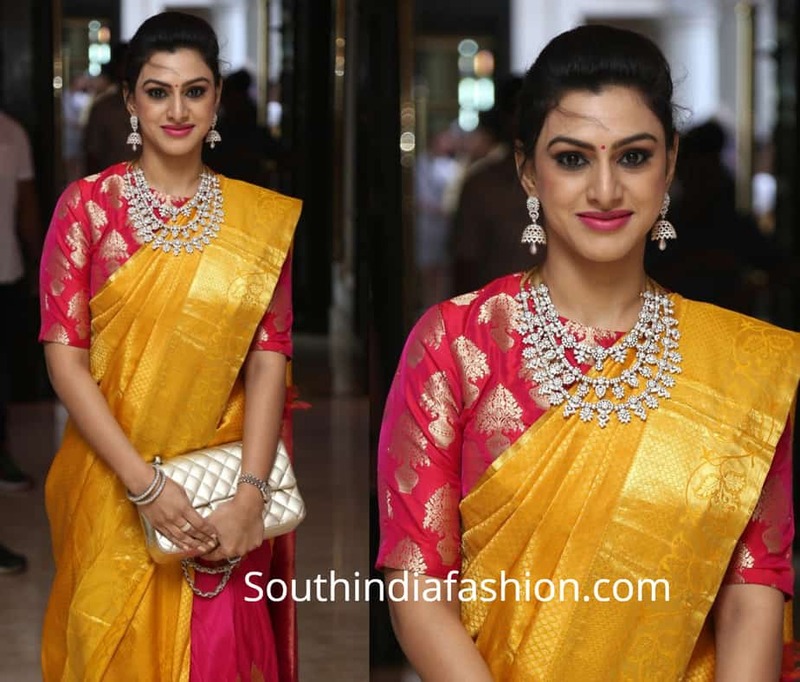 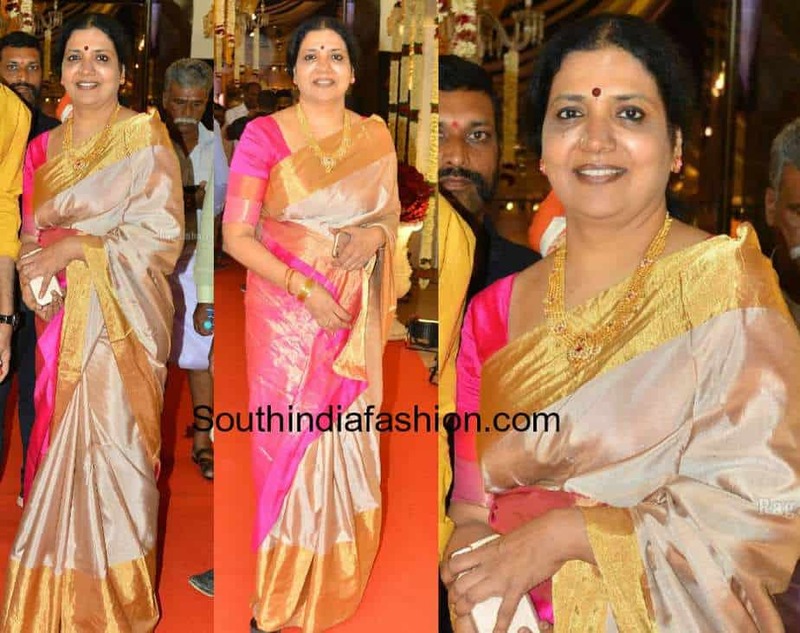 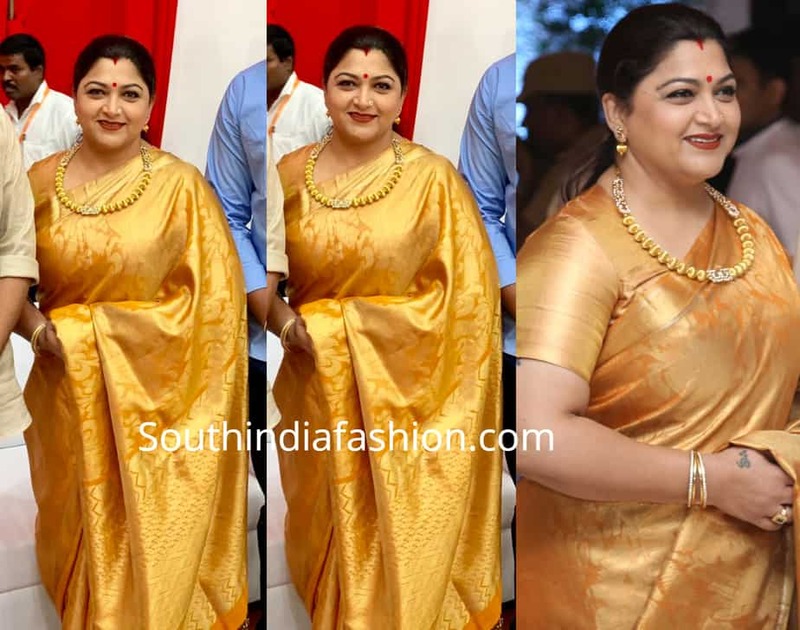 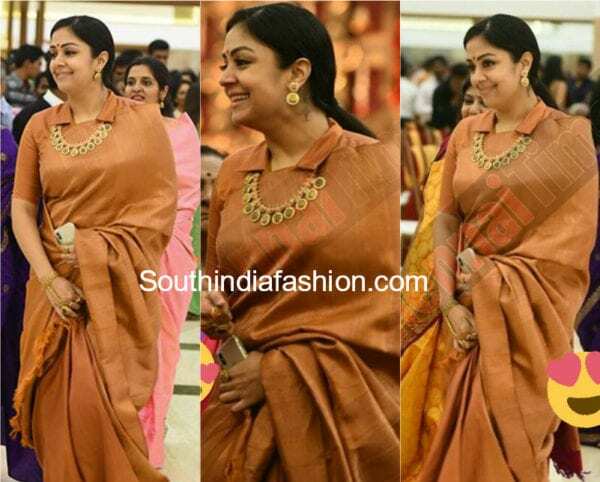 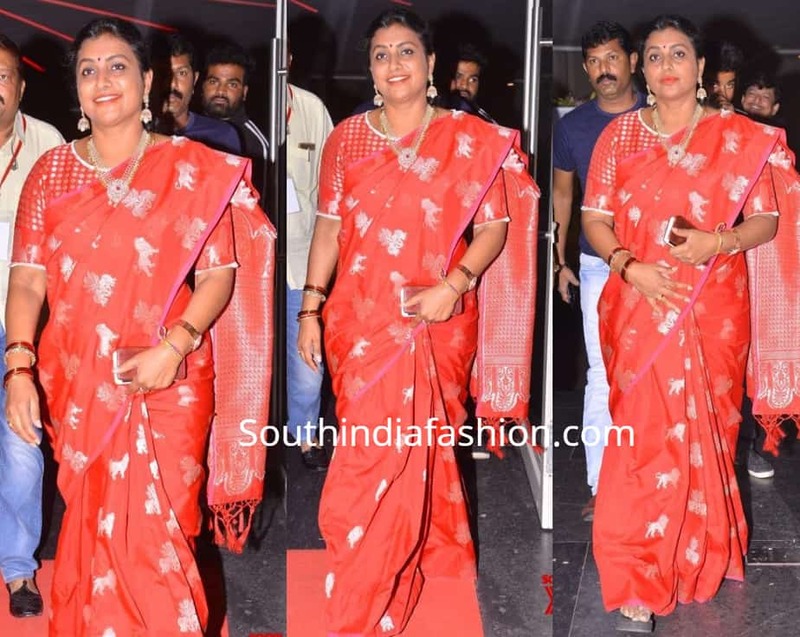 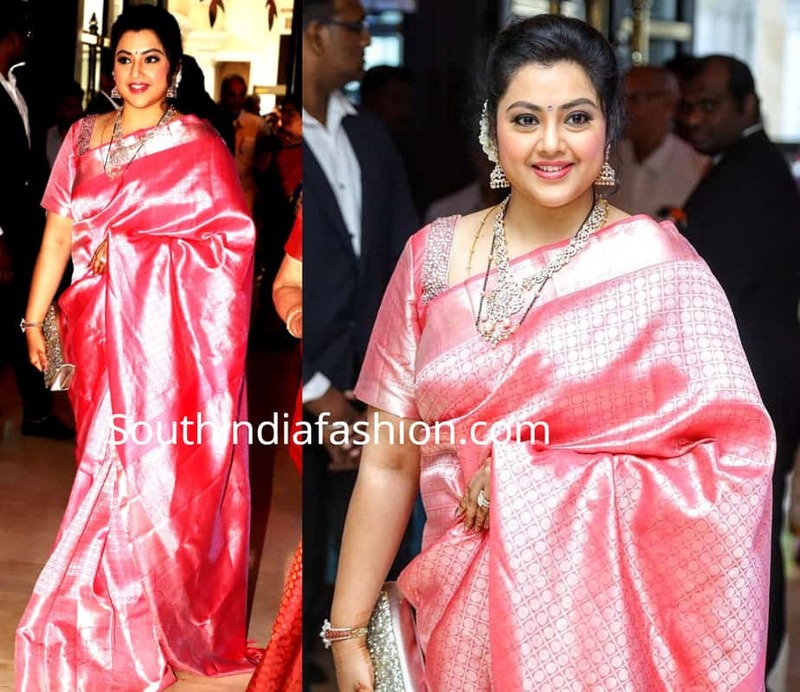 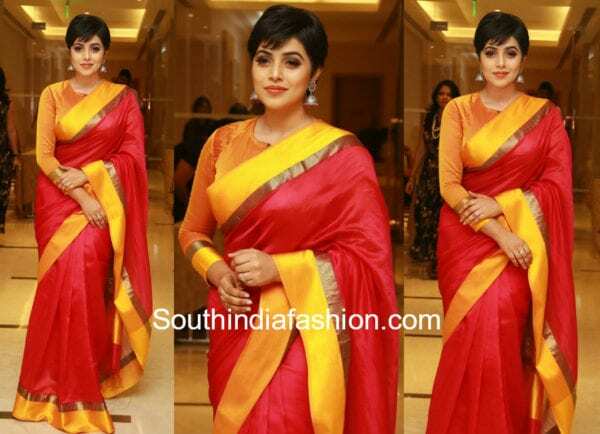 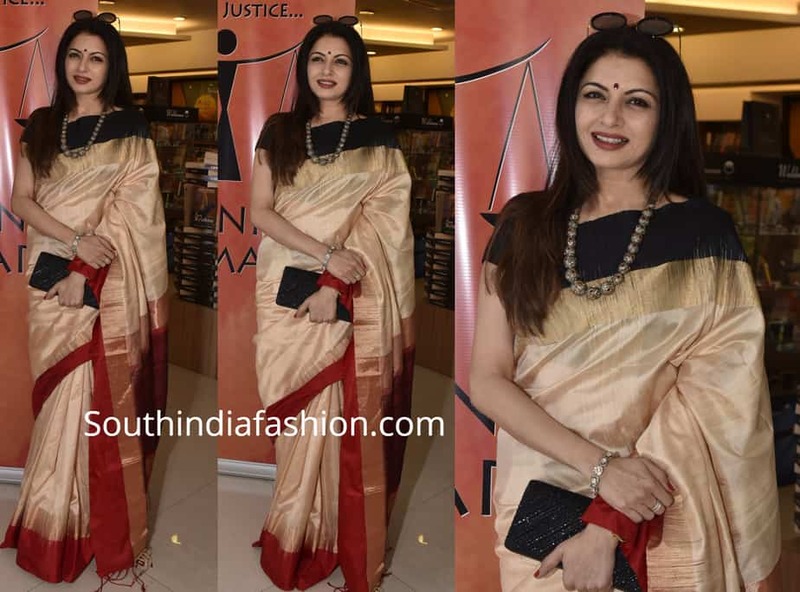 Roja in a red silk saree at Sobhan Babu Awards! 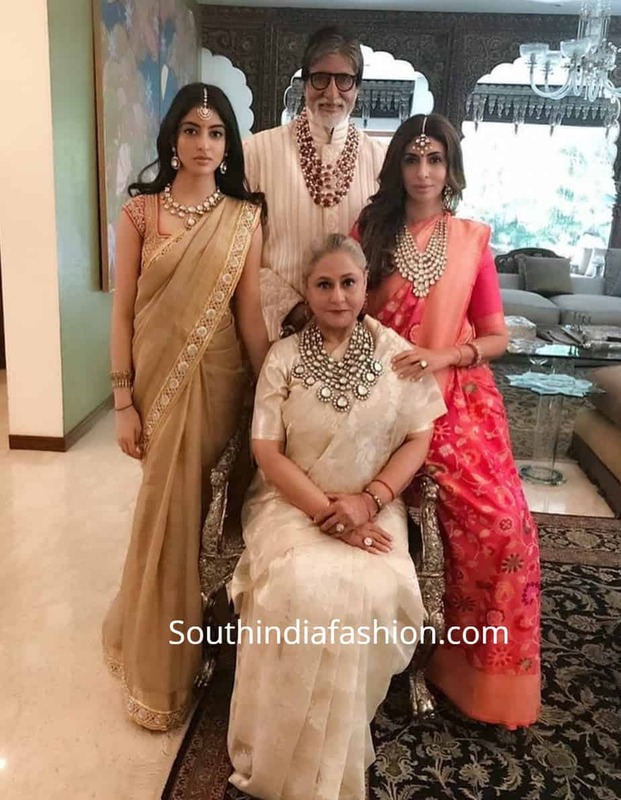 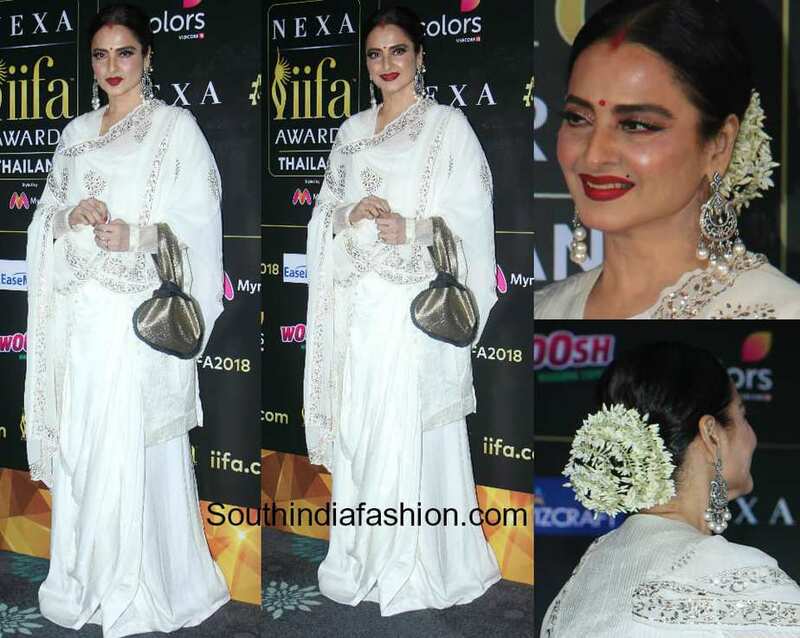 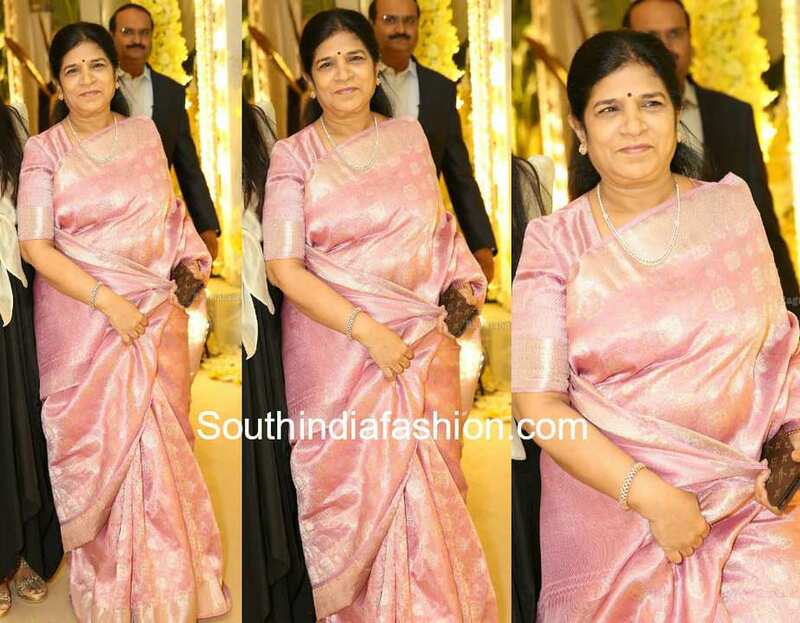 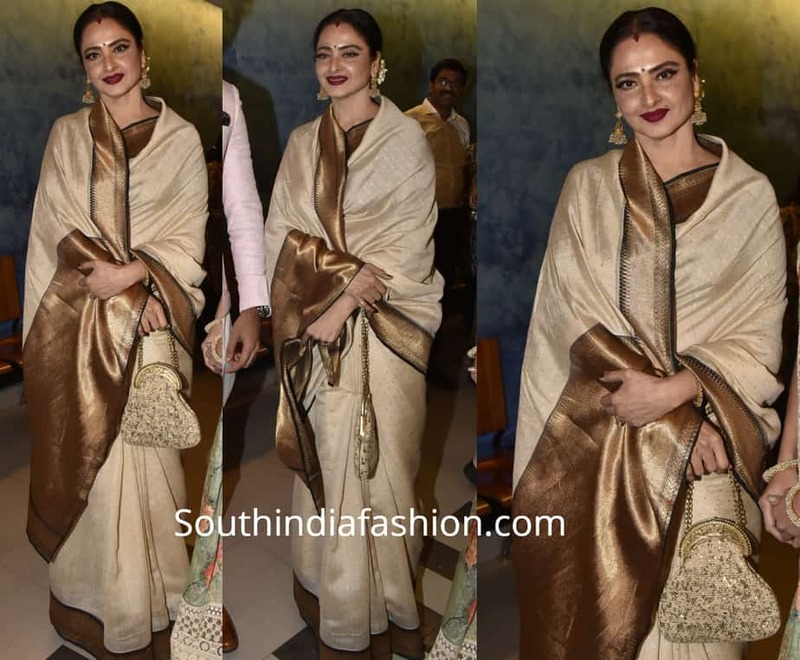 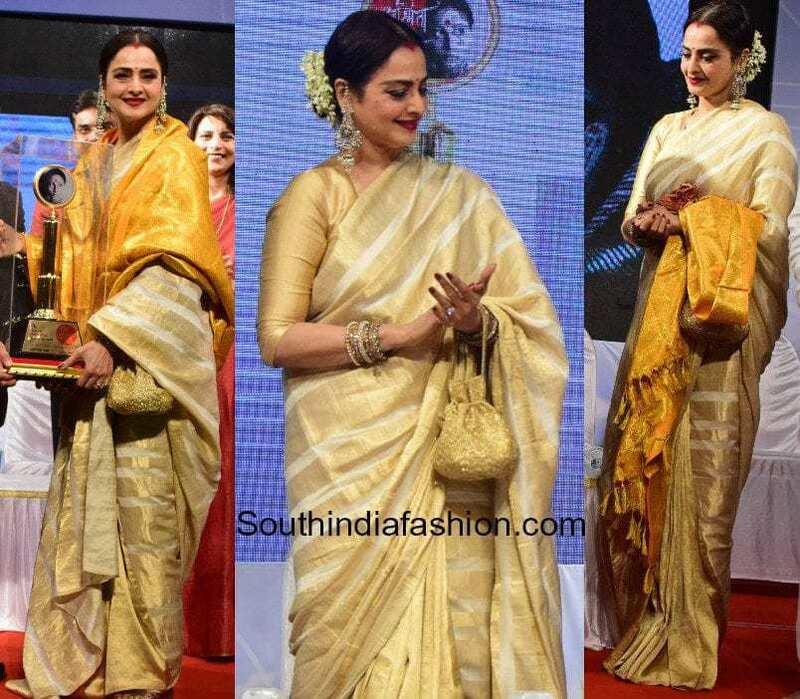 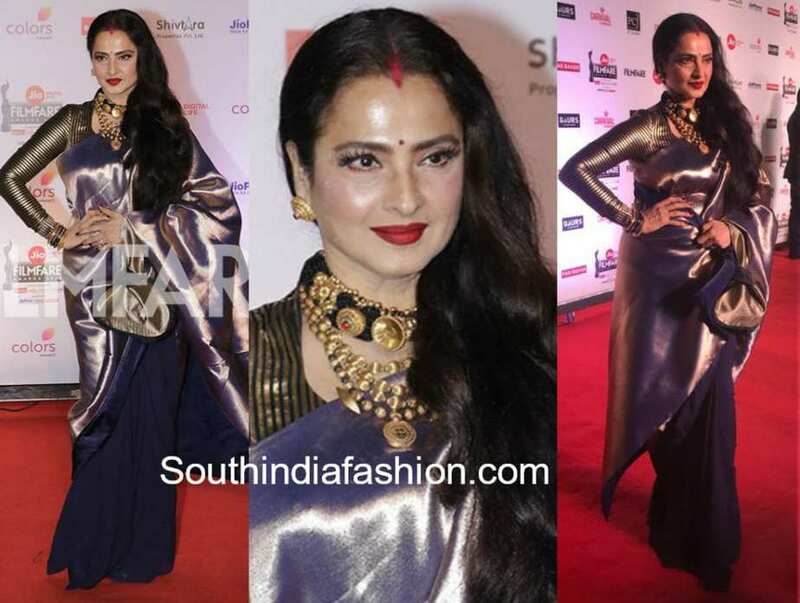 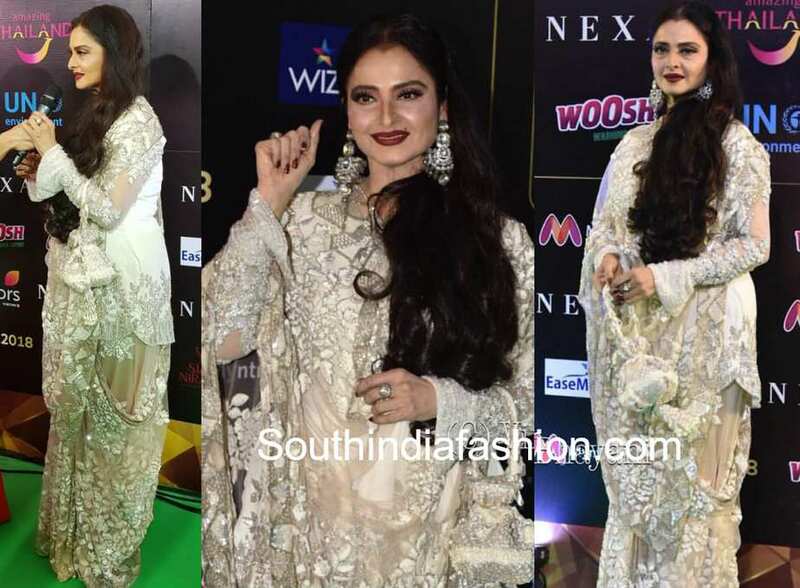 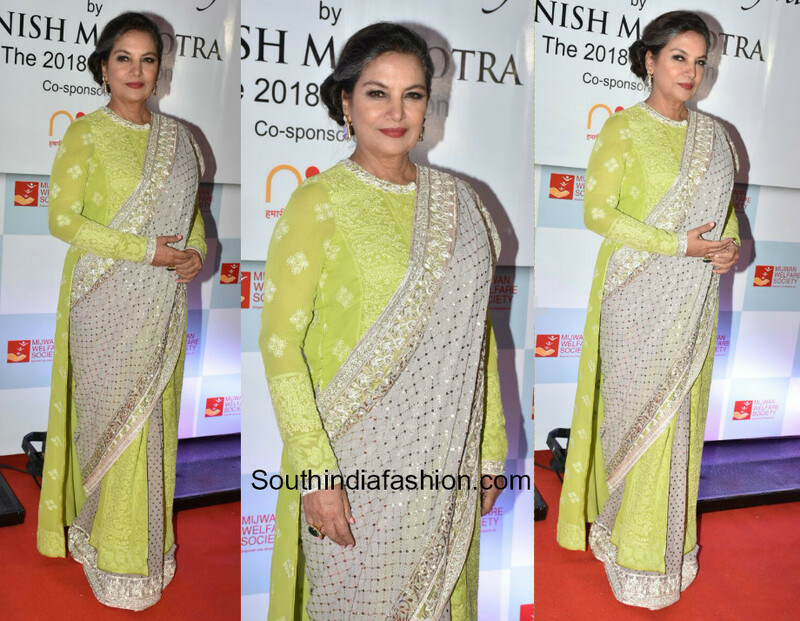 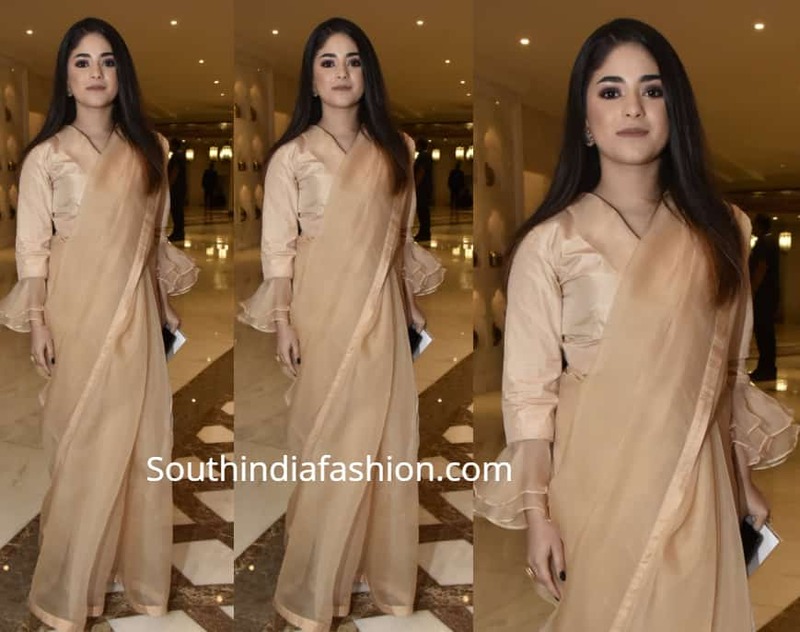 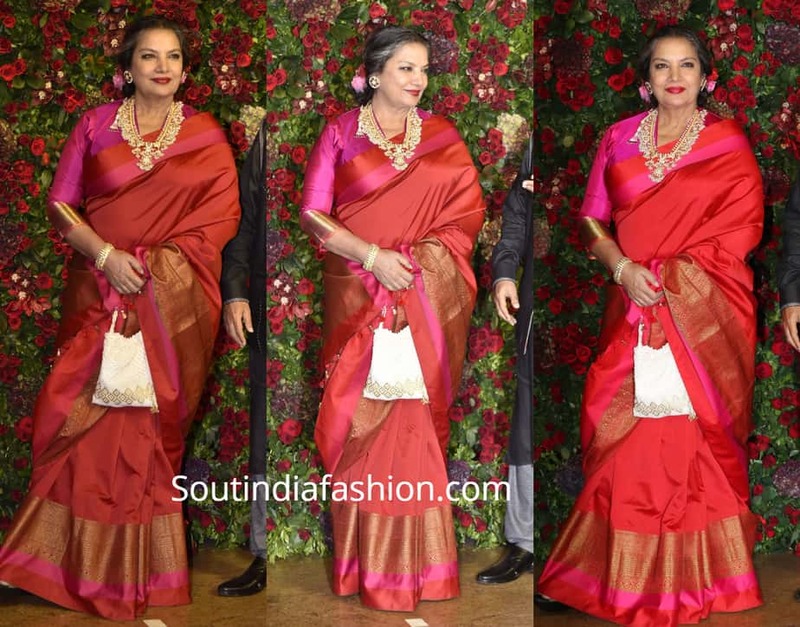 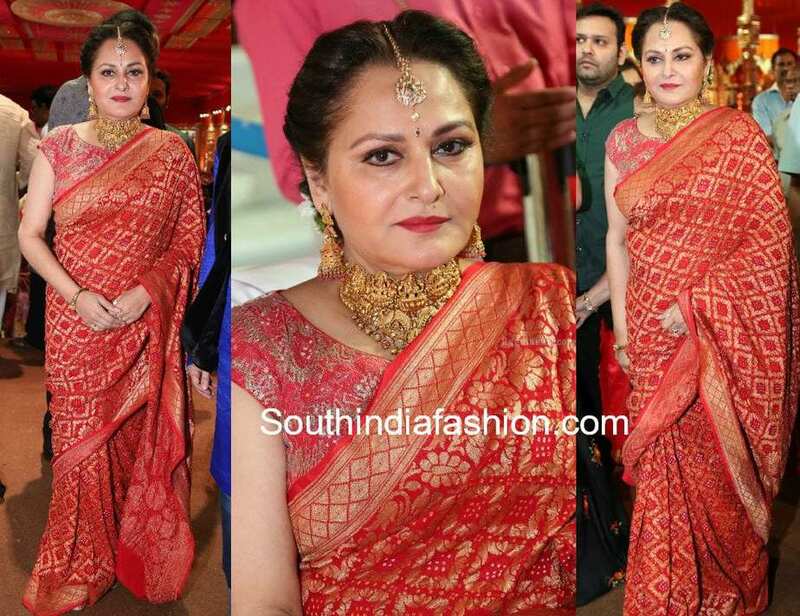 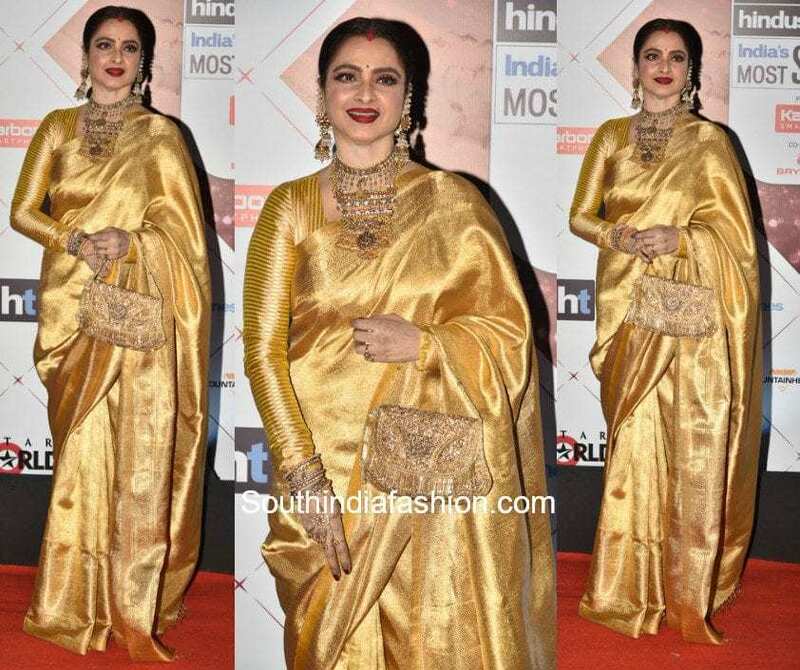 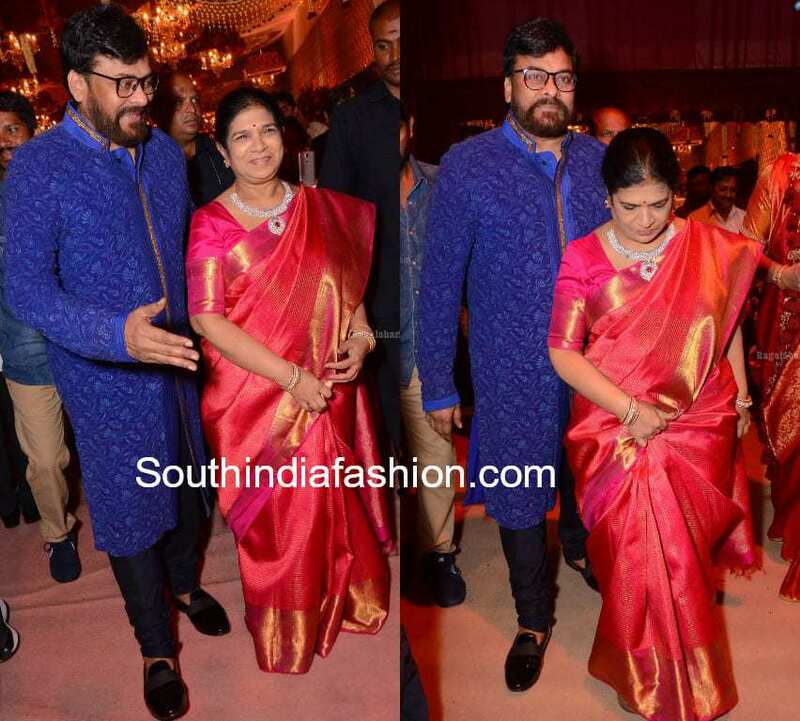 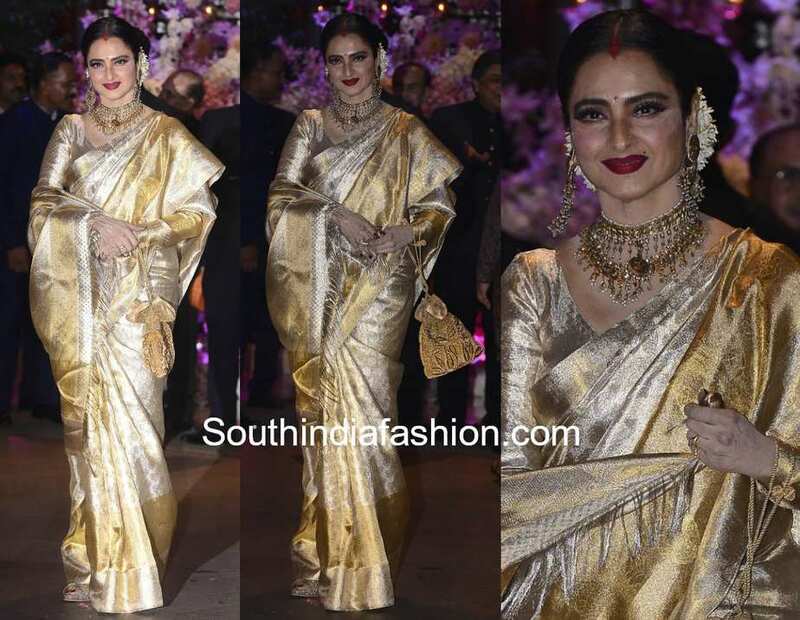 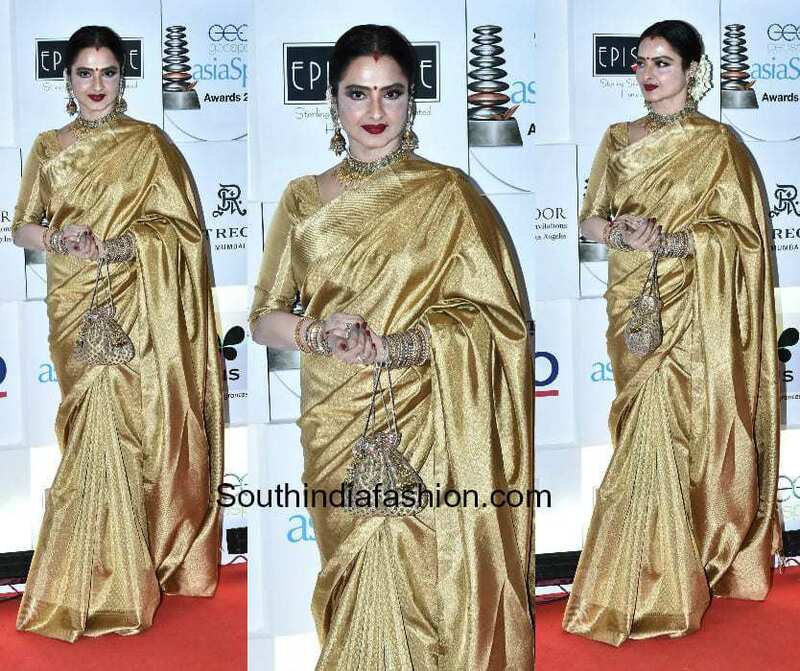 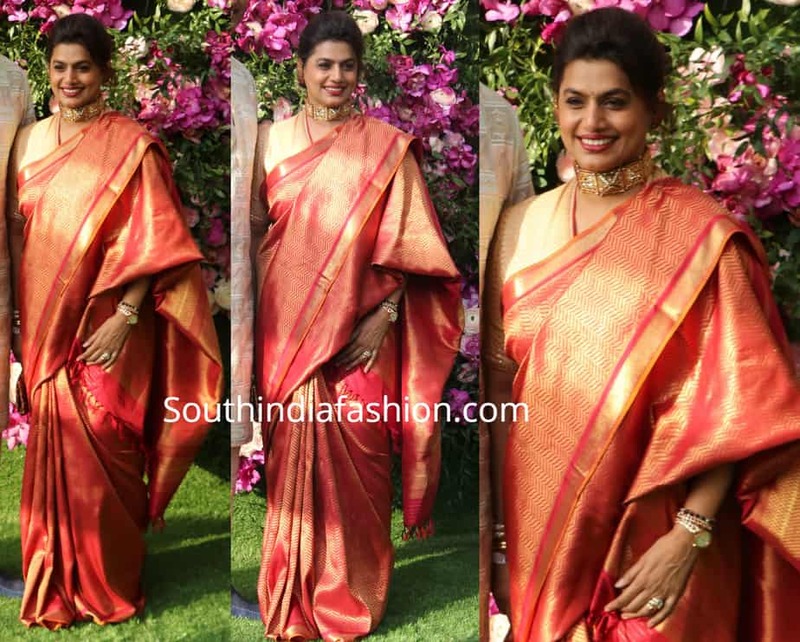 Rekha in a Banarasi silk saree at Isha Ambani – Anand Piramal wedding! 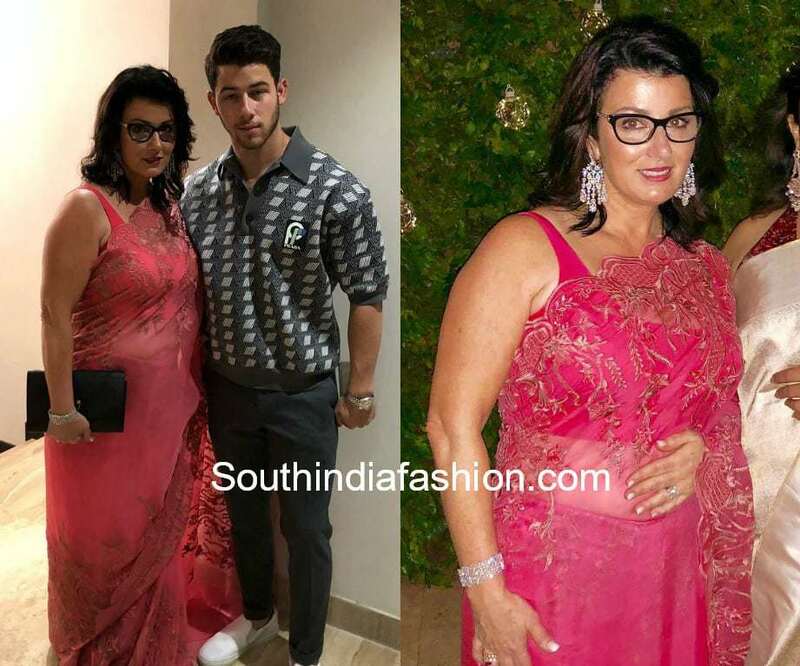 Newlyweds Priyanka Chopra and Nick Jonas Snapped at Jodhpur Airport! 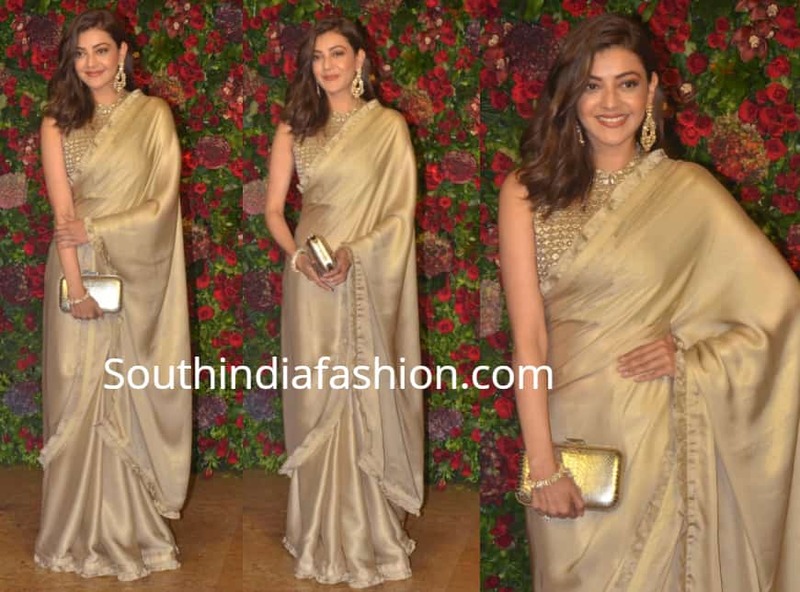 Kajal Aggarwal in a gold saree at Deepika & Ranveer’s wedding reception! 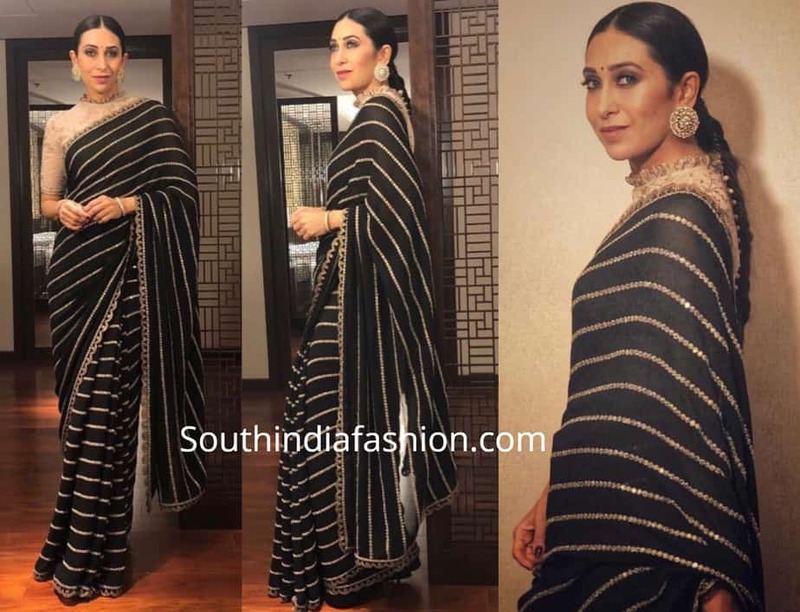 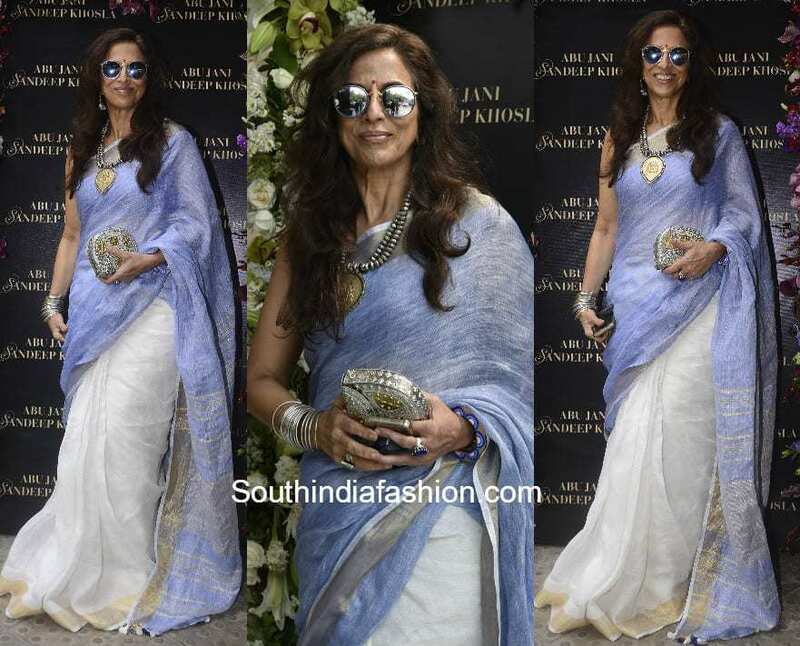 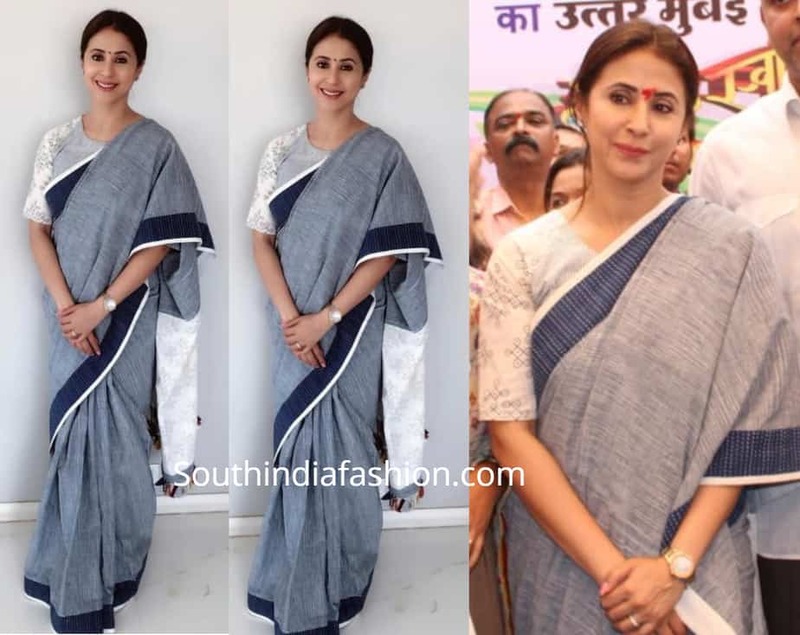 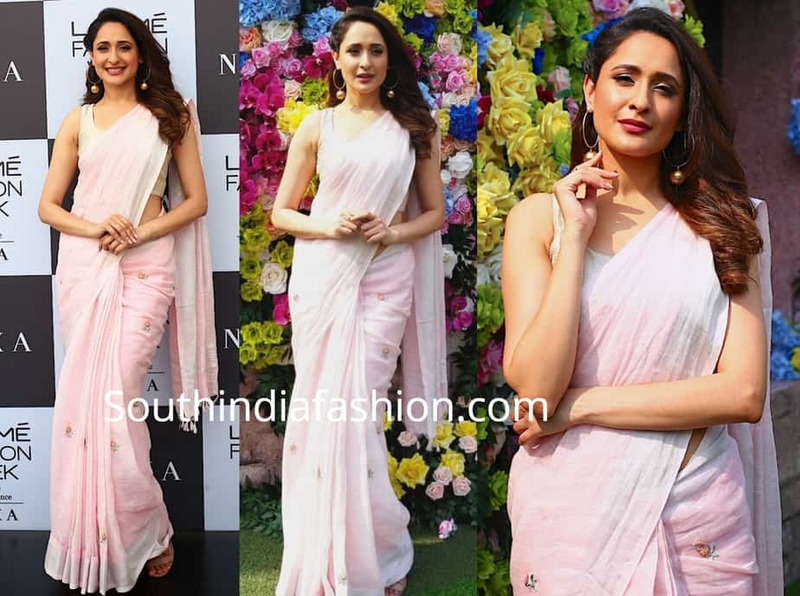 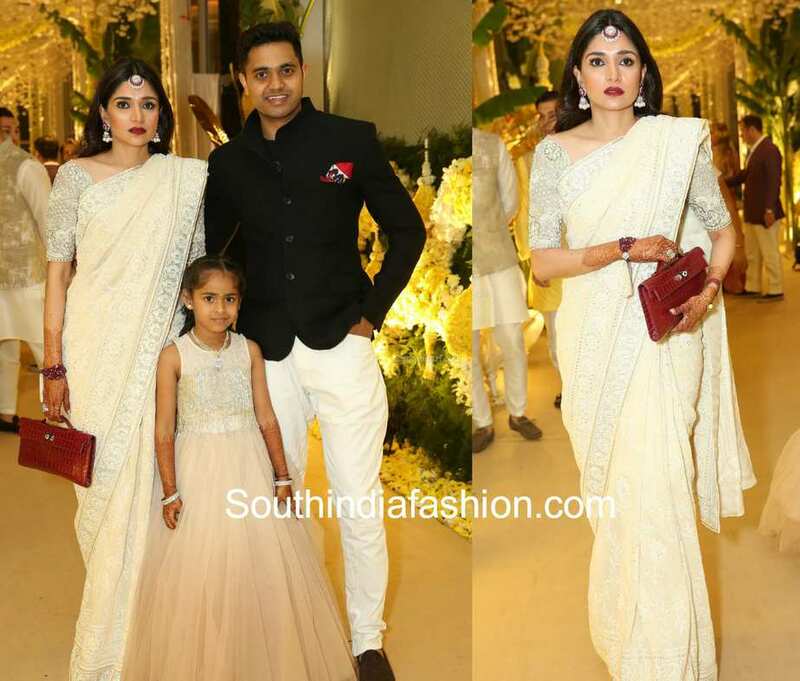 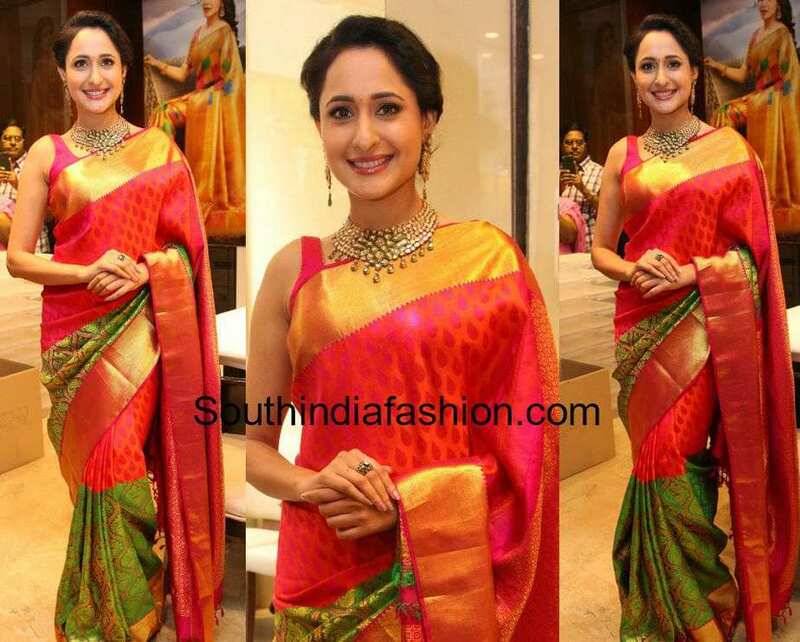 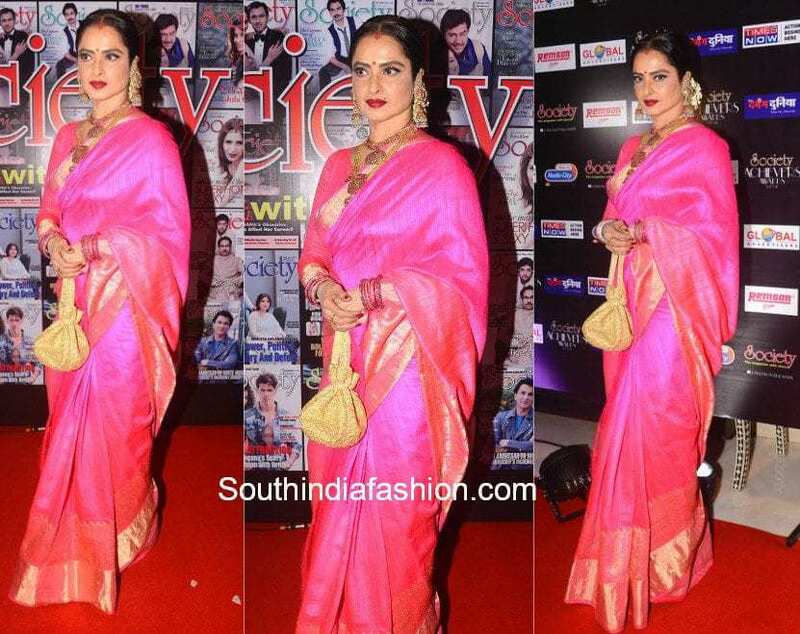 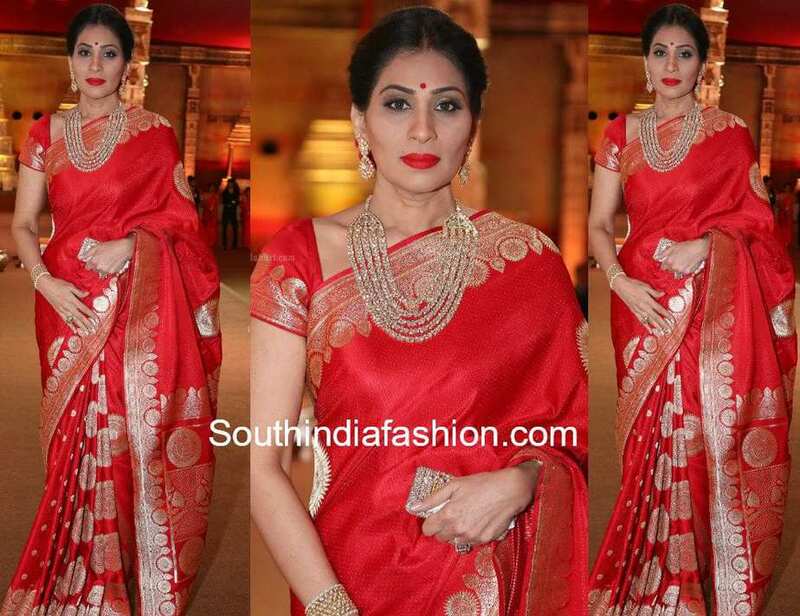 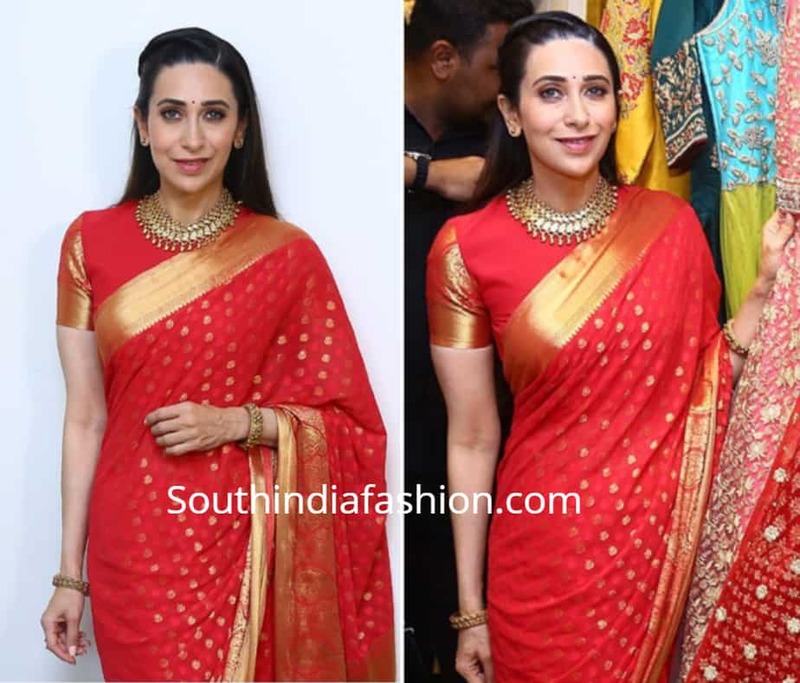 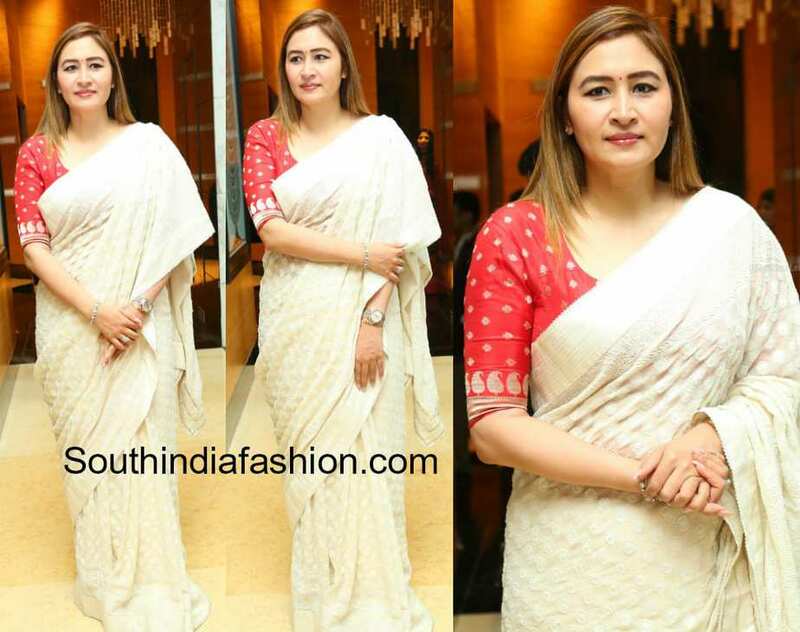 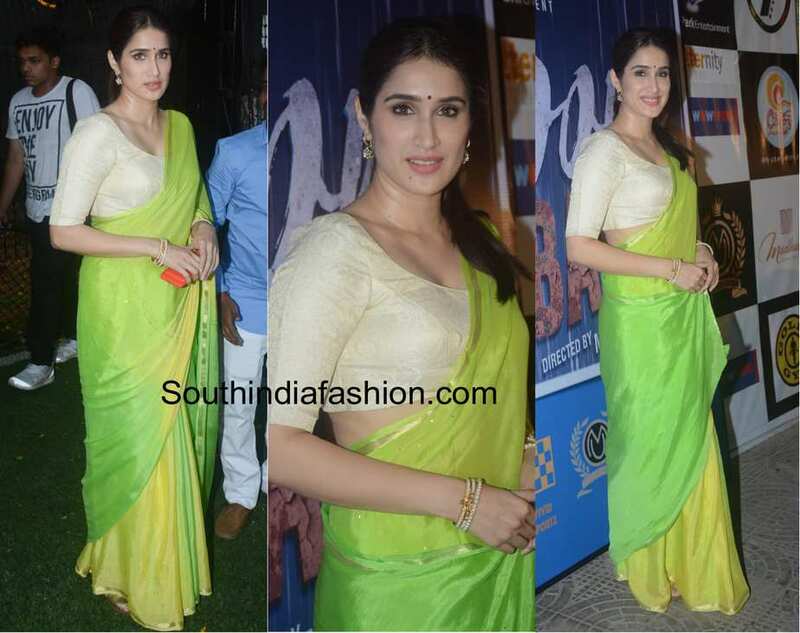 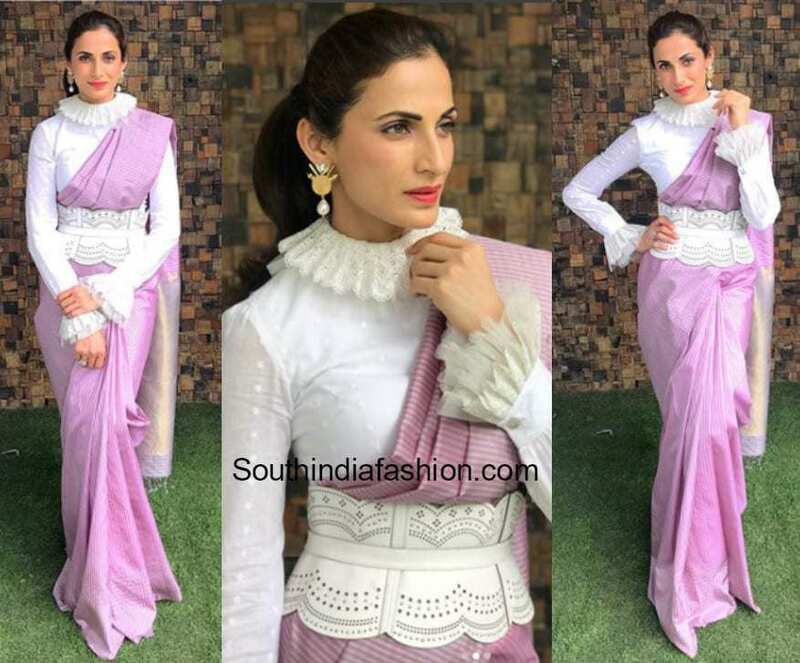 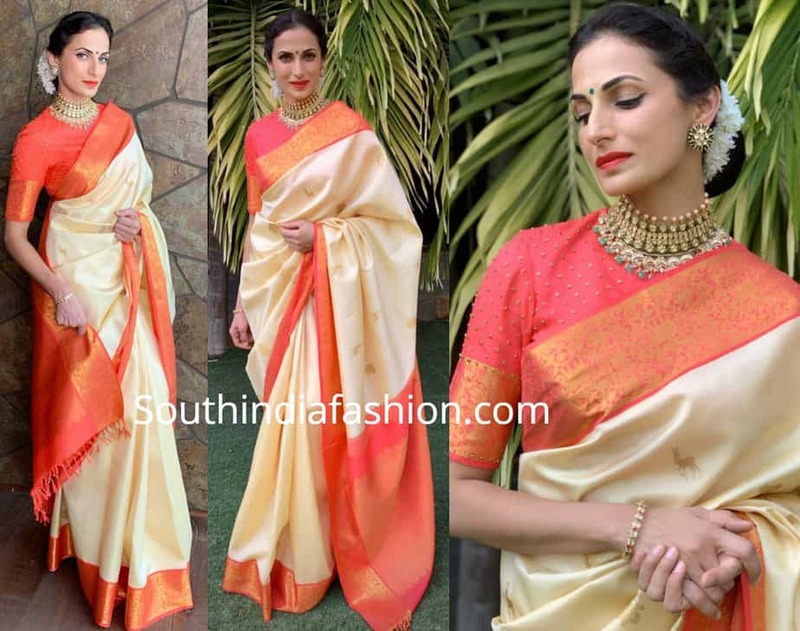 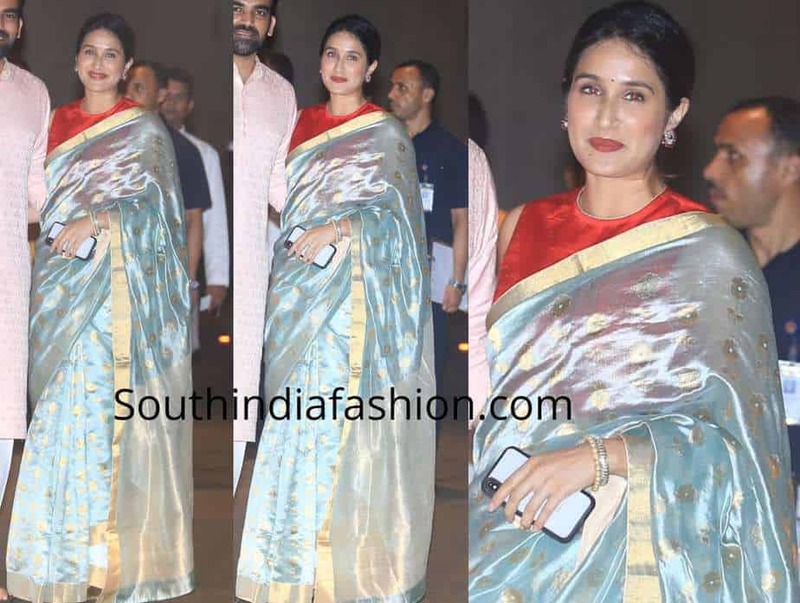 Shilpa Reddy’s Monochromatic Saree Look! 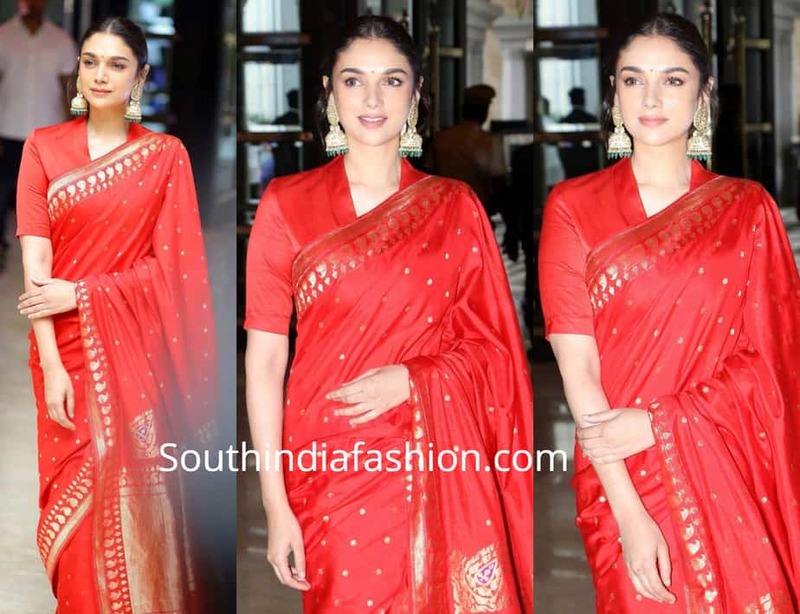 Kangana Ranaut’s Latest Airport Look in Saree and Pigtail Braids! 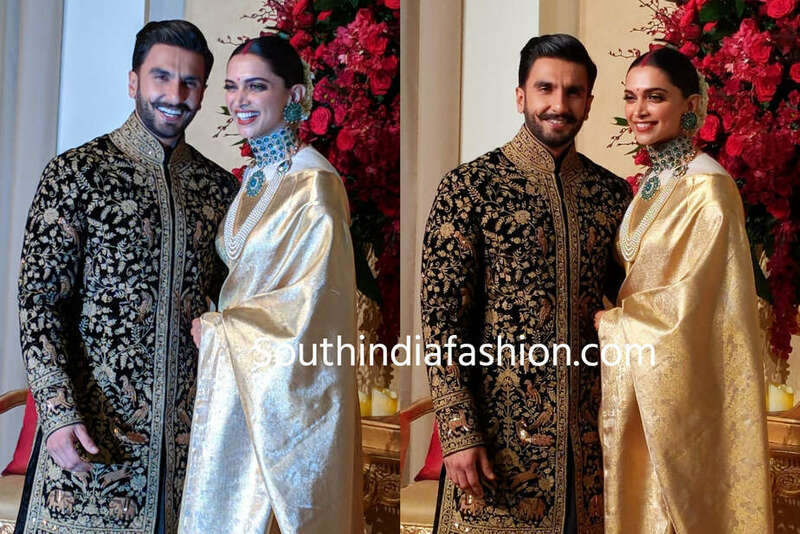 Ranveer Singh and Deepika Padukone at their Bengaluru Wedding Reception!! 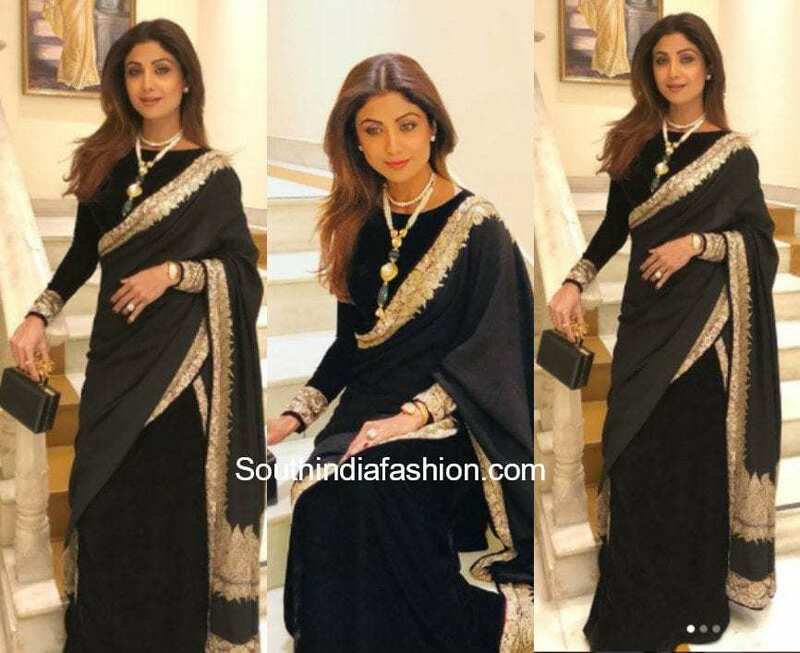 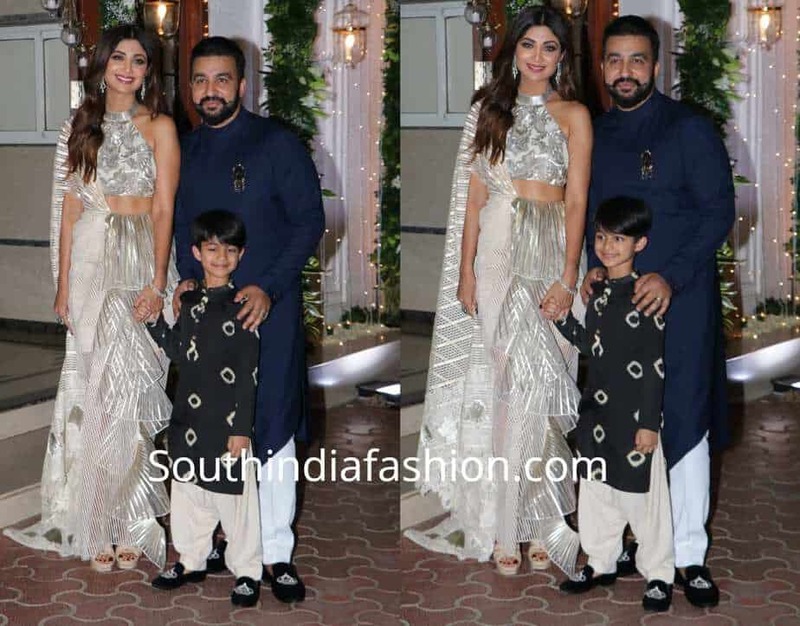 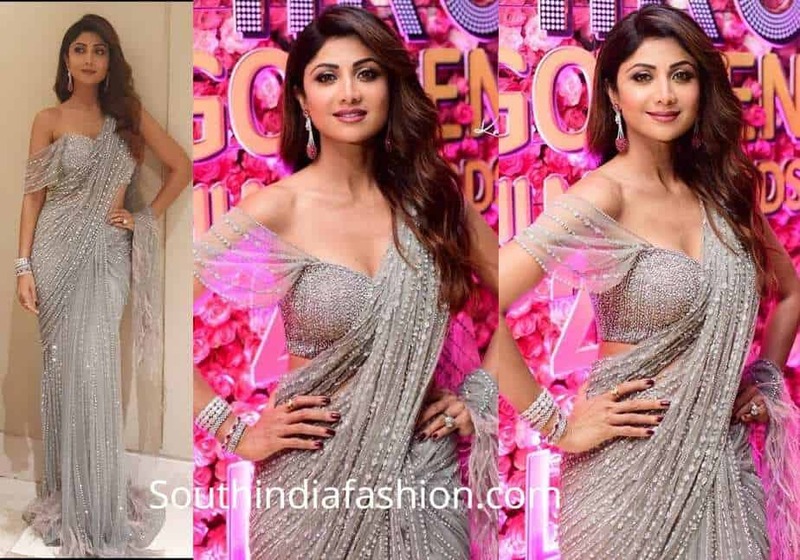 Shilpa Shetty in a floral saree at Ekta kapoor’s Diwali bash! 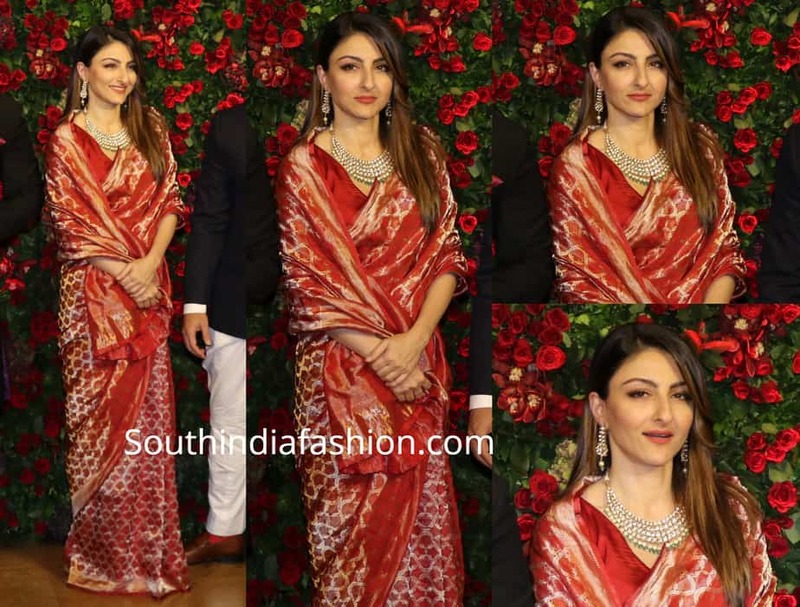 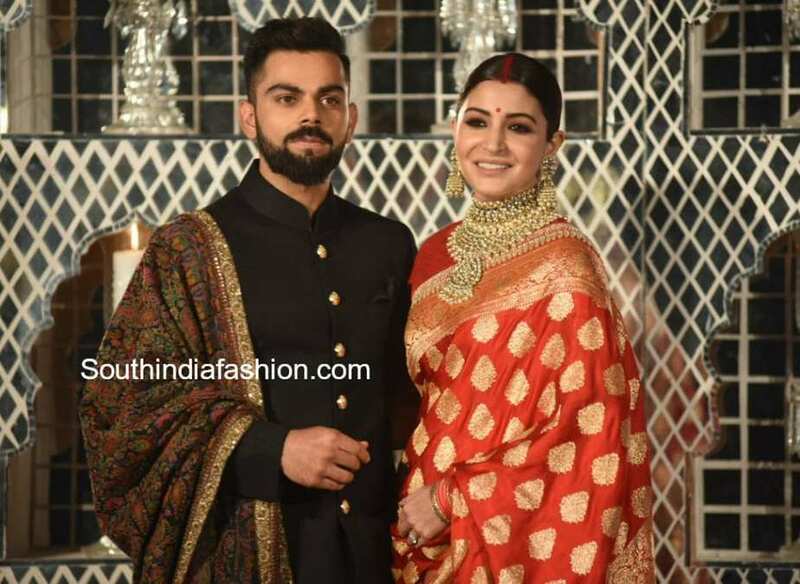 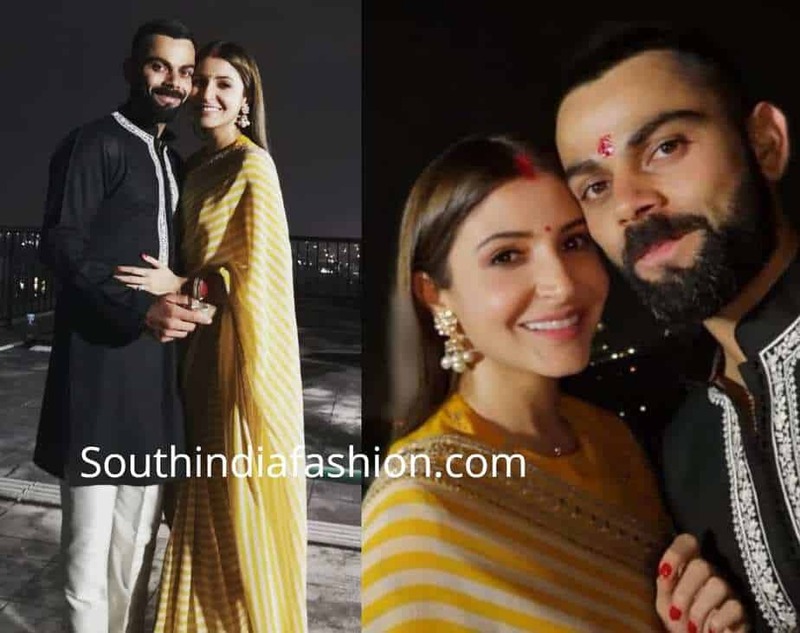 Anushka Sharma’s Karwa Chauth Look! 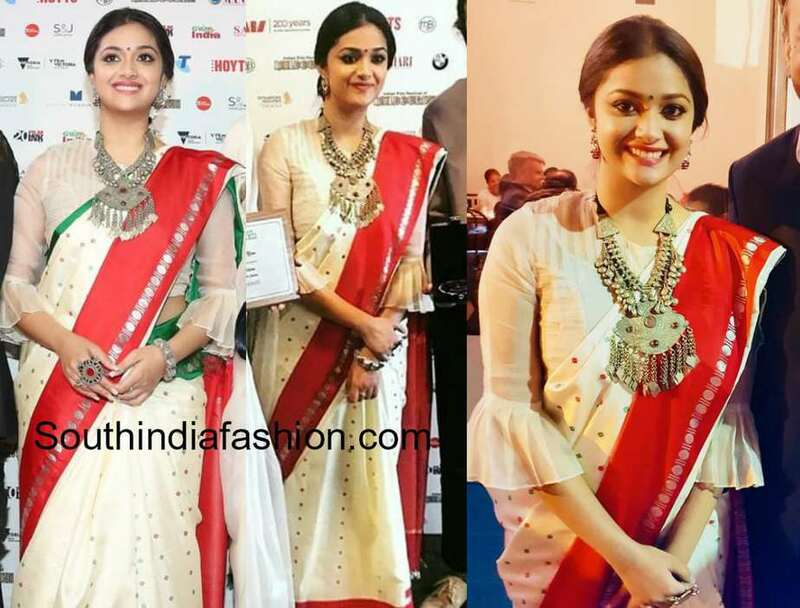 10 Saree Looks of Keerthy Suresh That We Cannot Get Over! 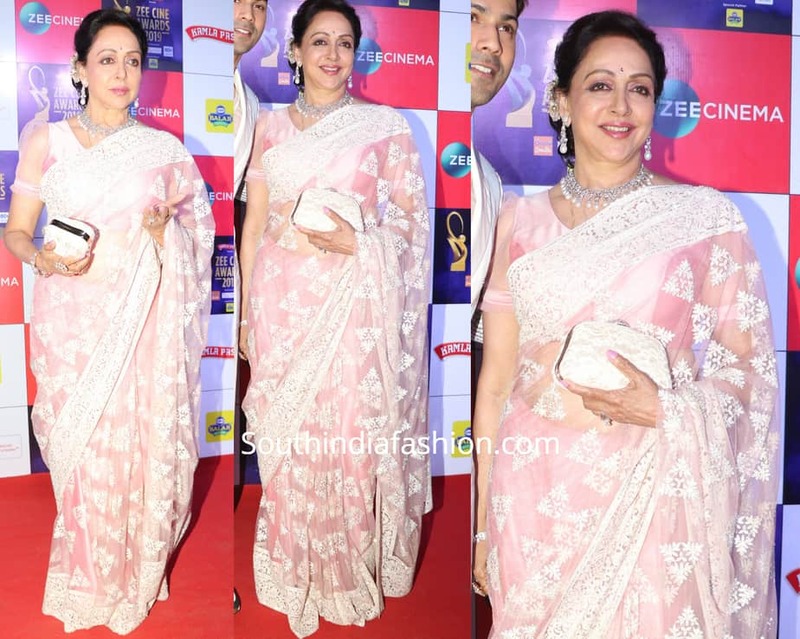 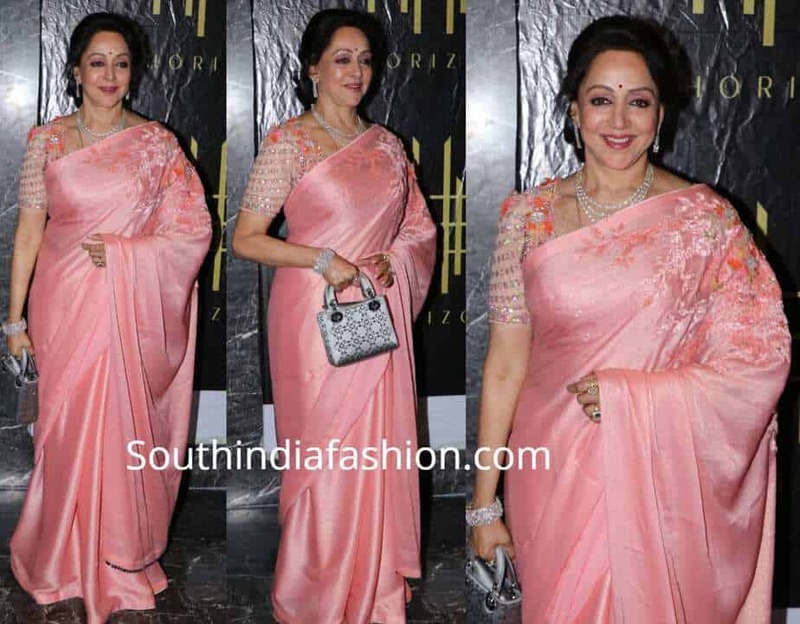 Hema Malini at her 70th birthday bash! 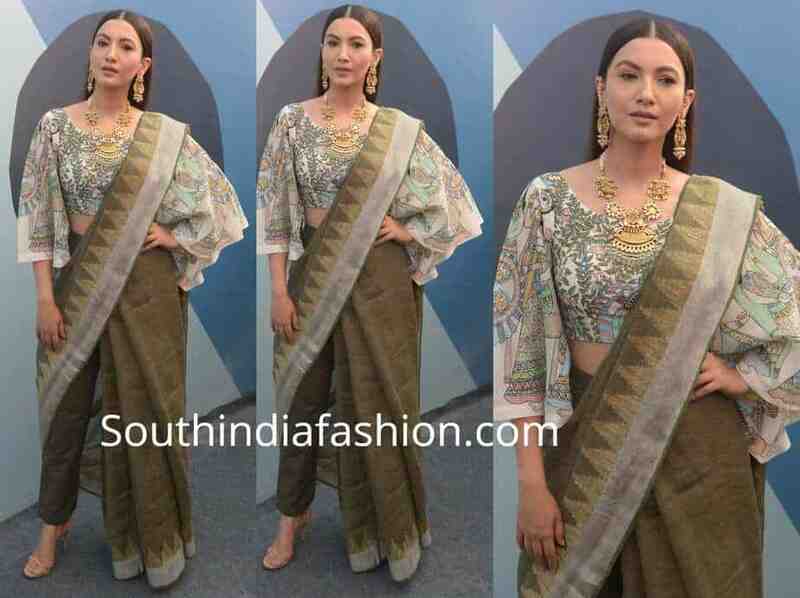 Gauhar Khan’s fusion saree look! 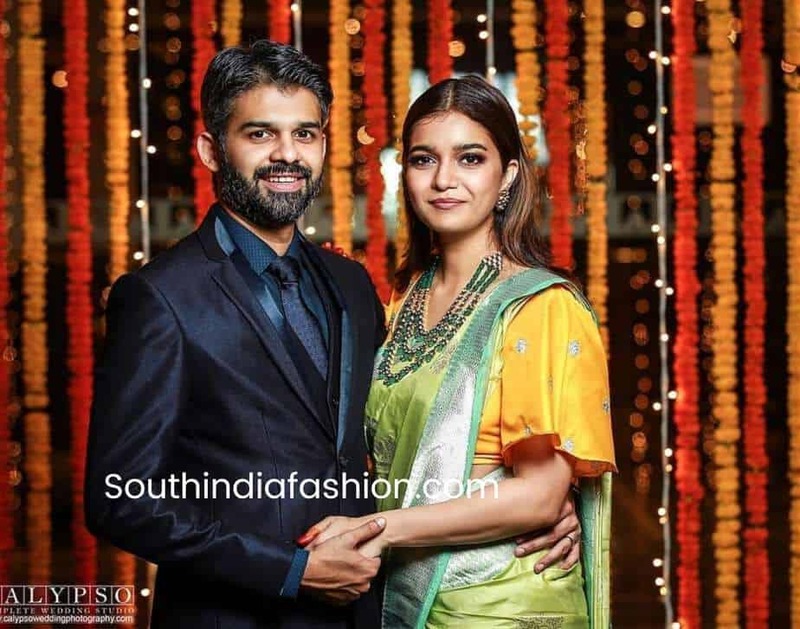 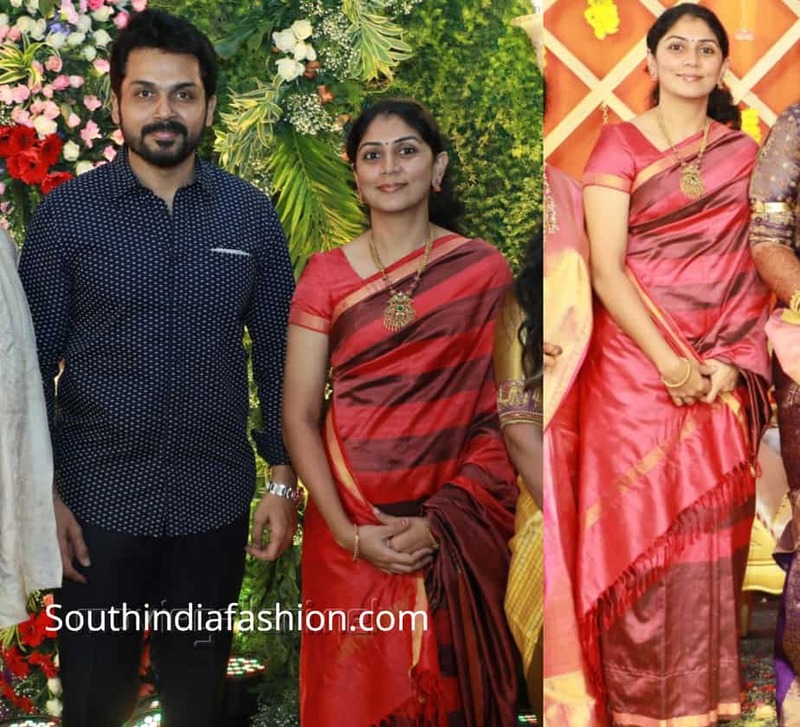 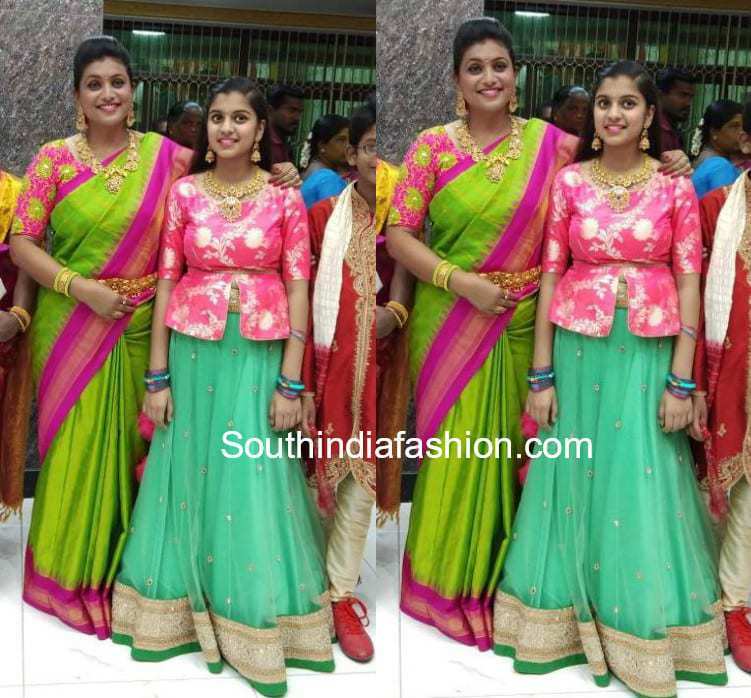 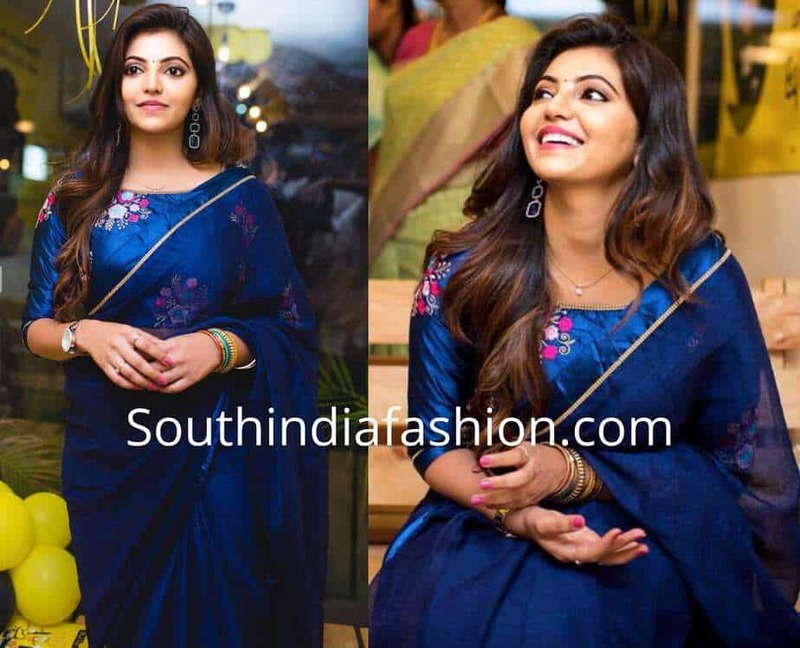 Swathi Reddy and Vikas Wedding Reception! 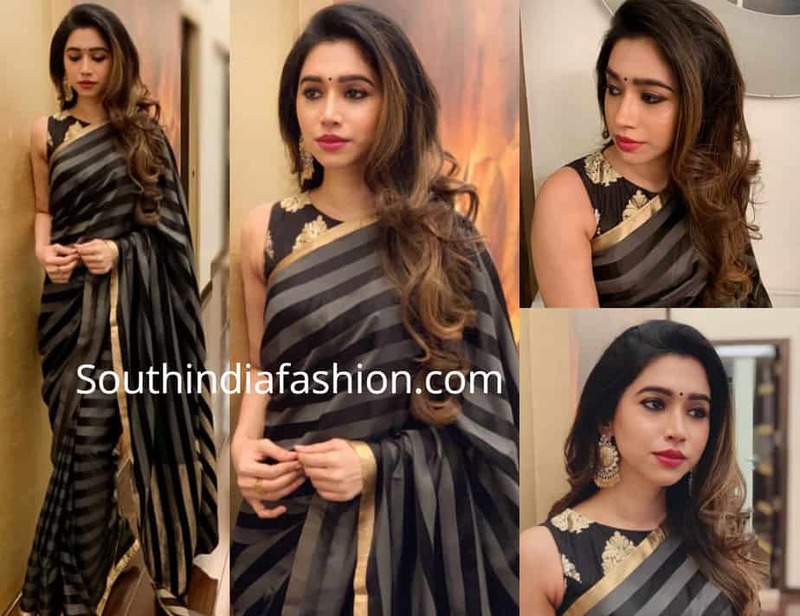 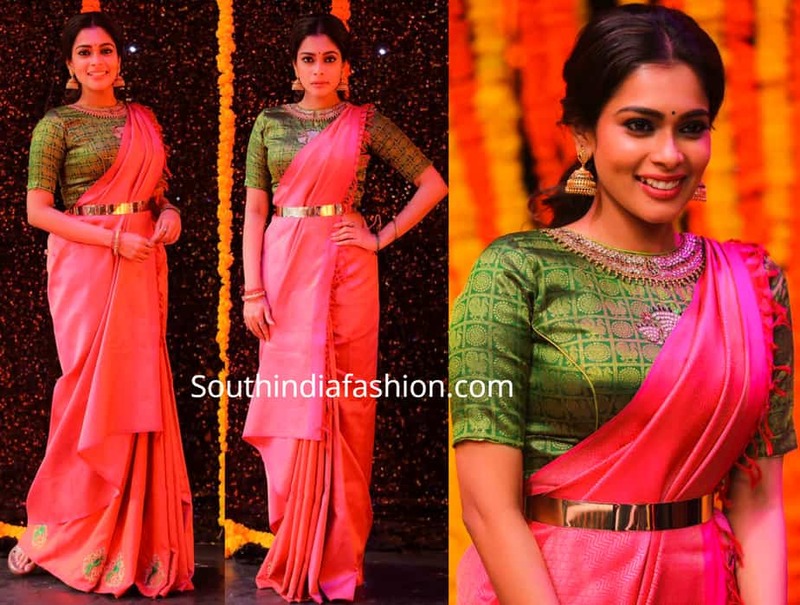 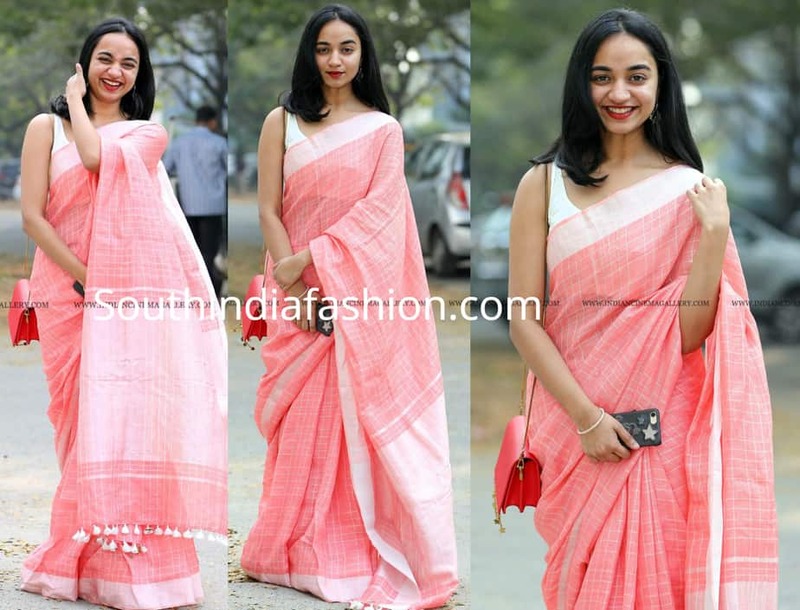 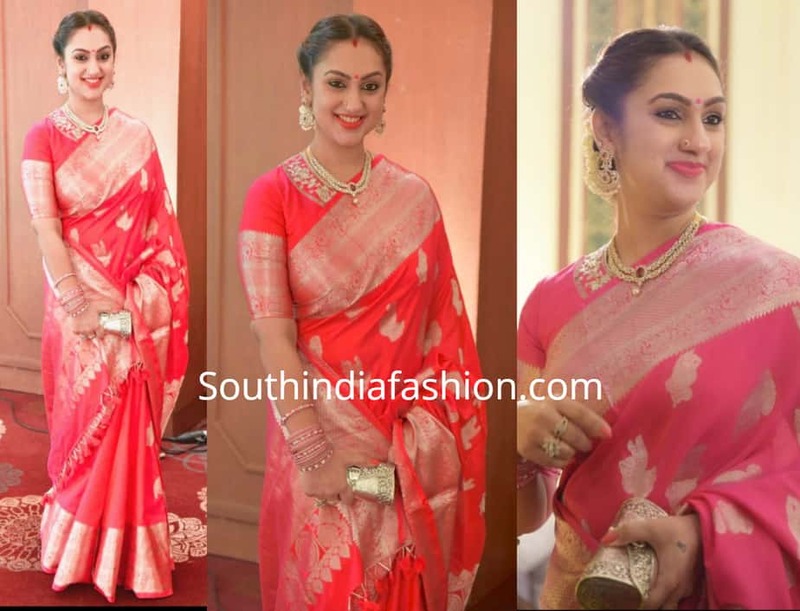 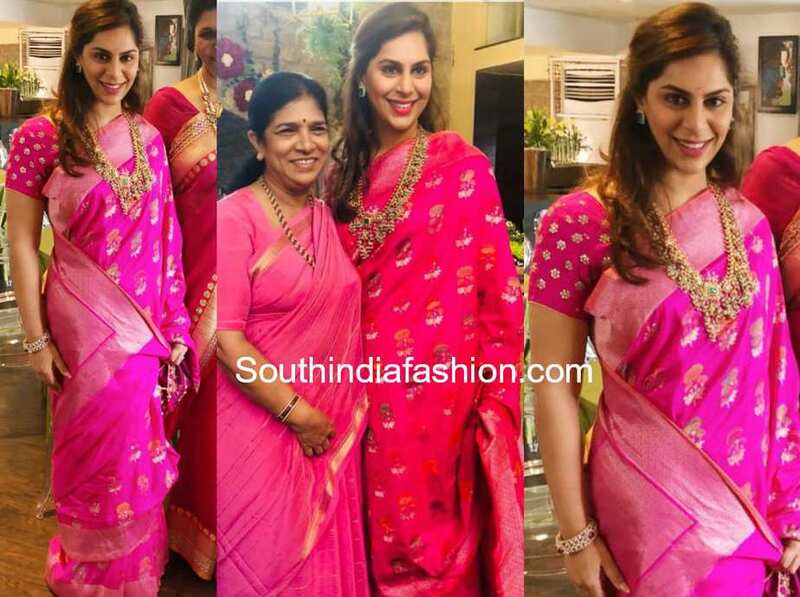 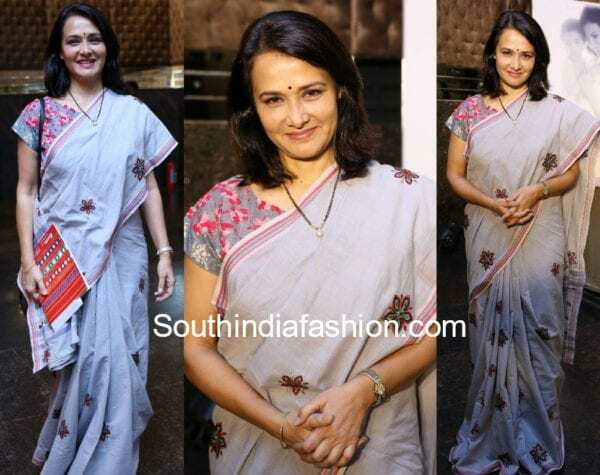 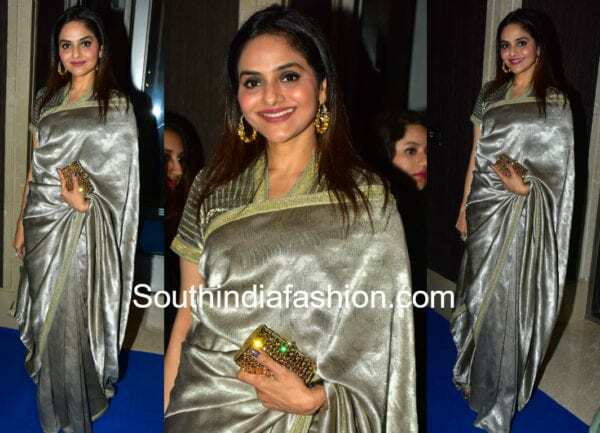 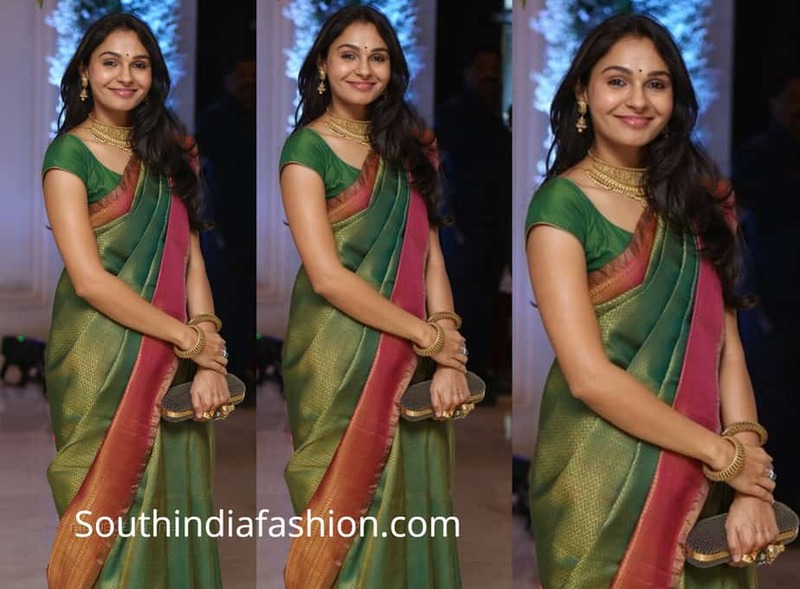 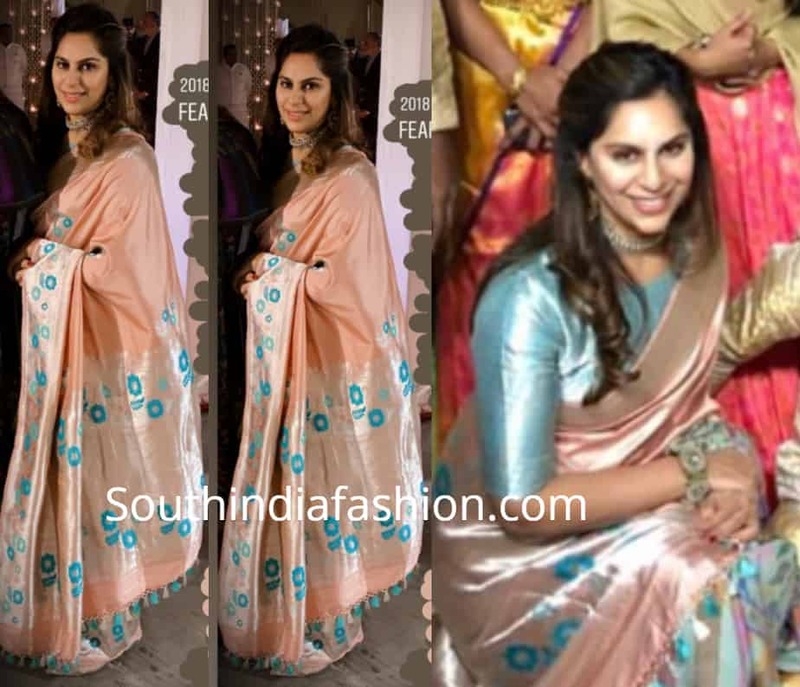 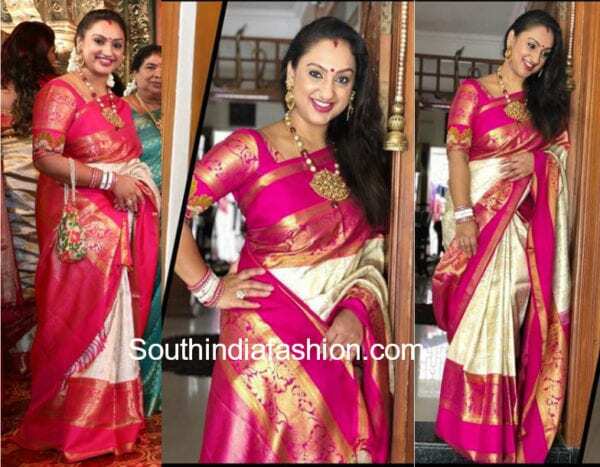 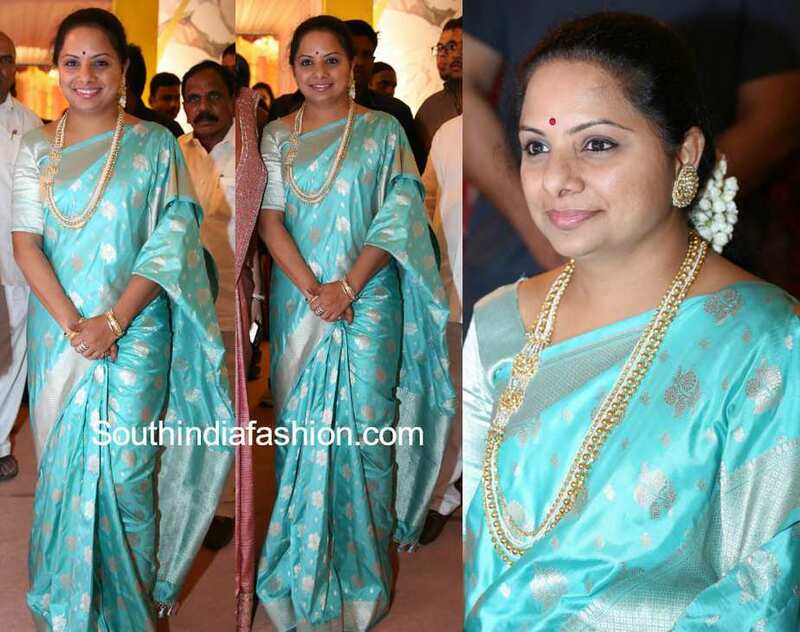 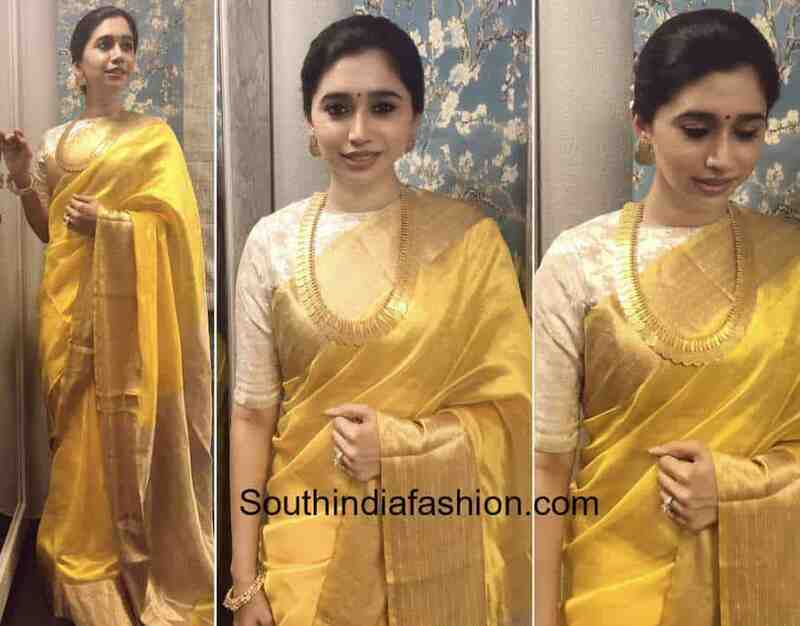 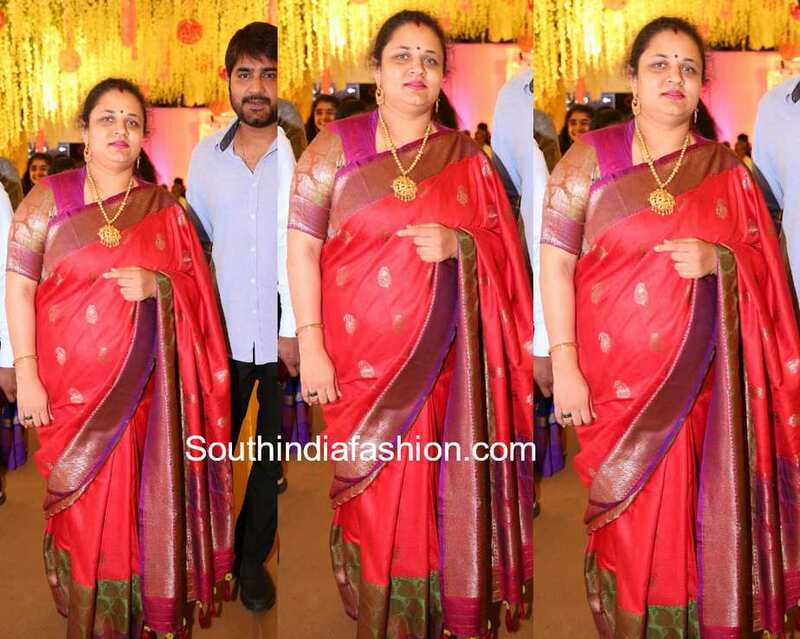 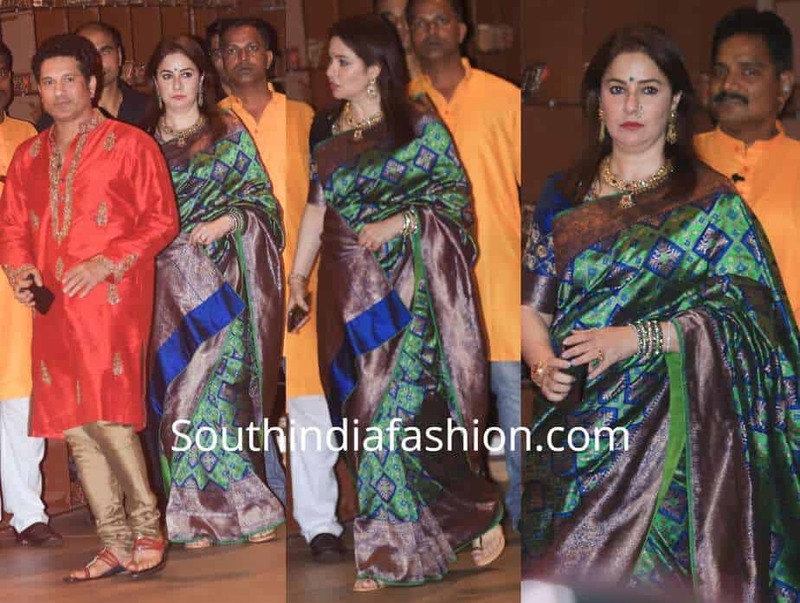 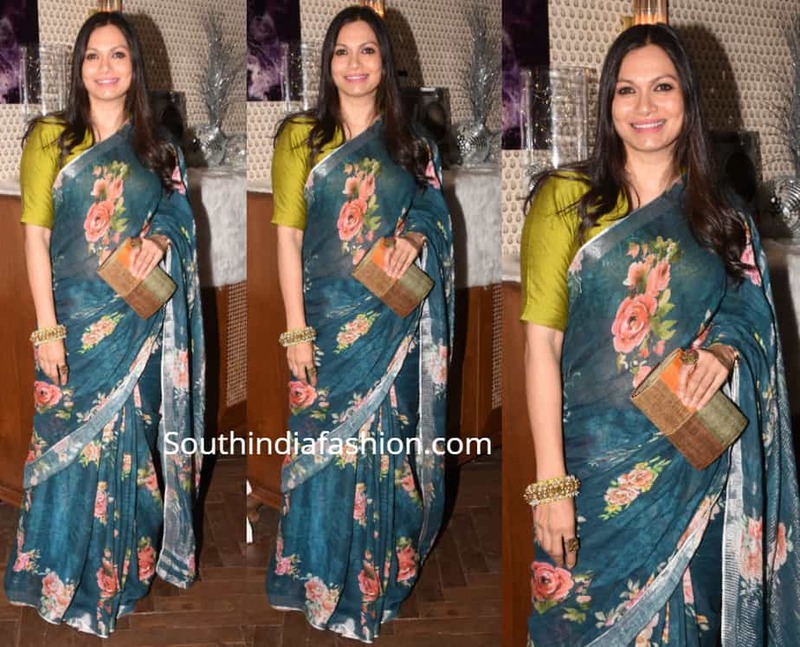 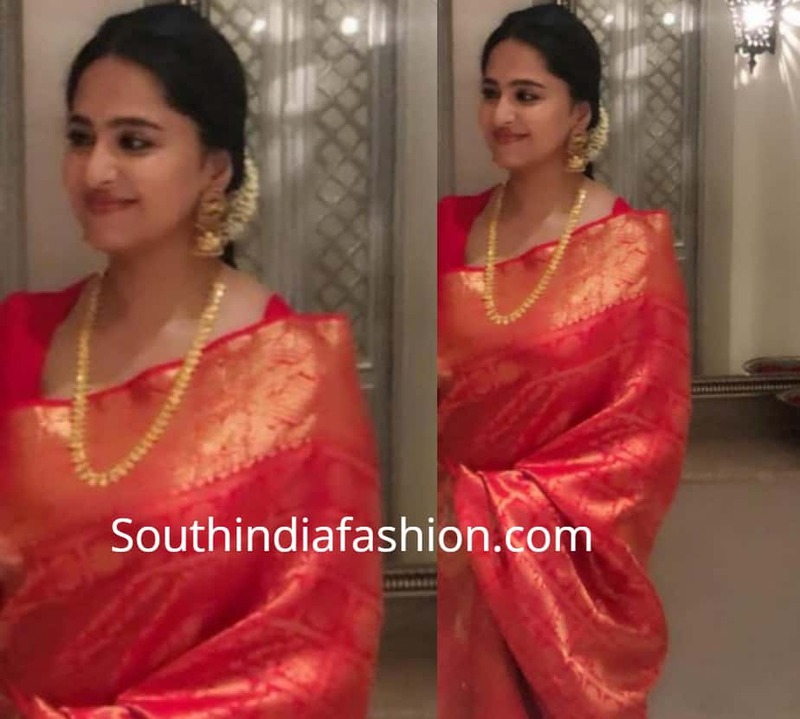 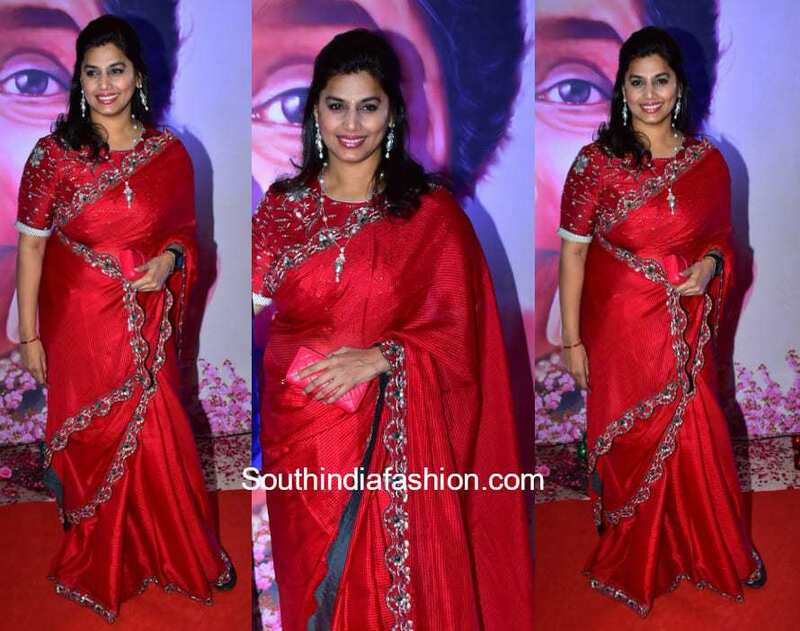 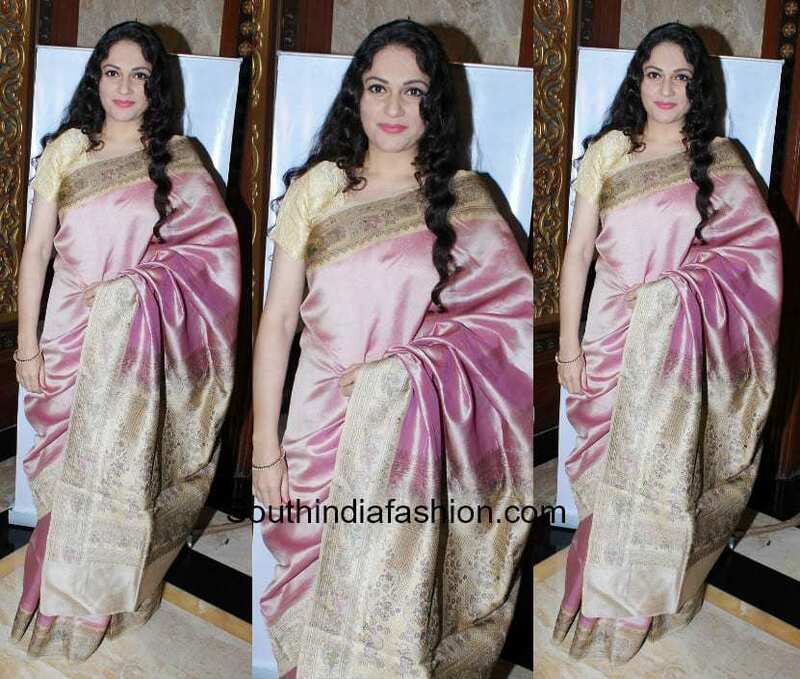 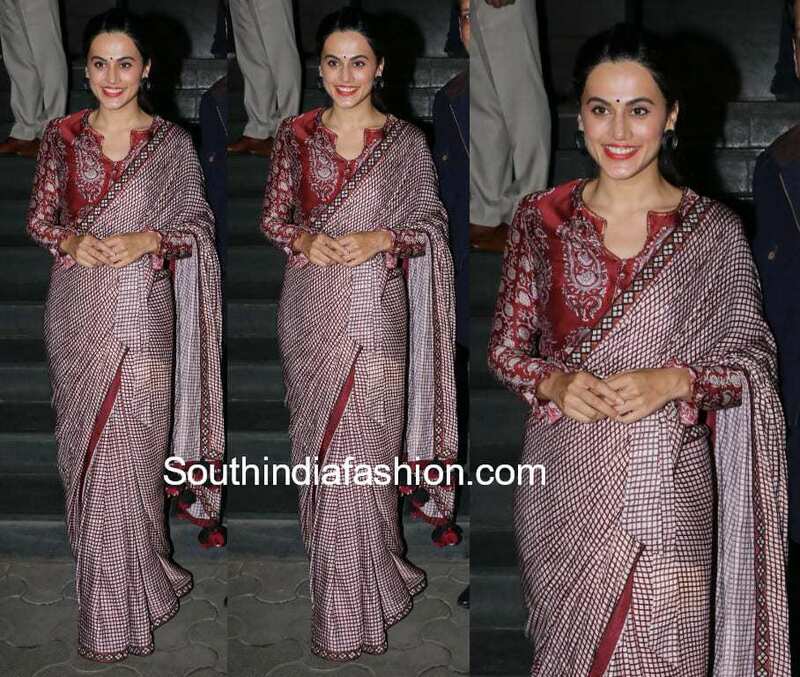 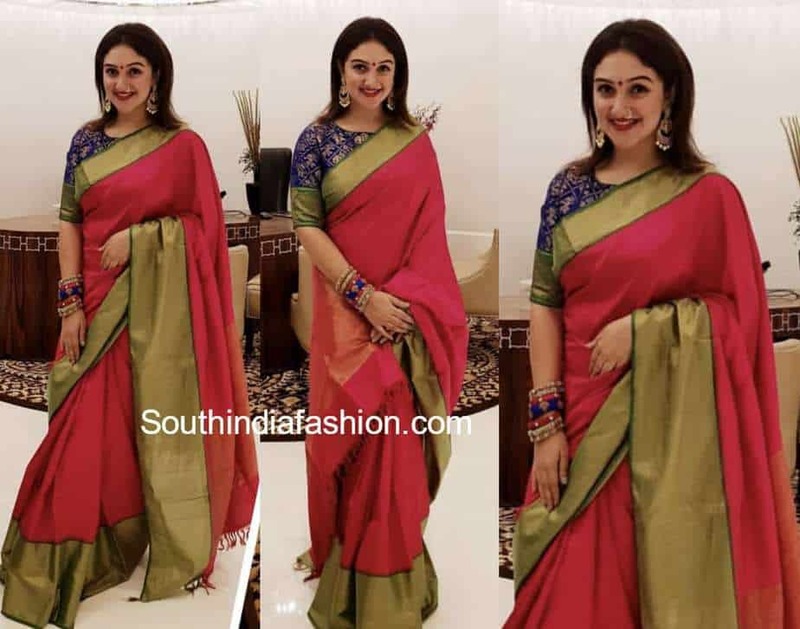 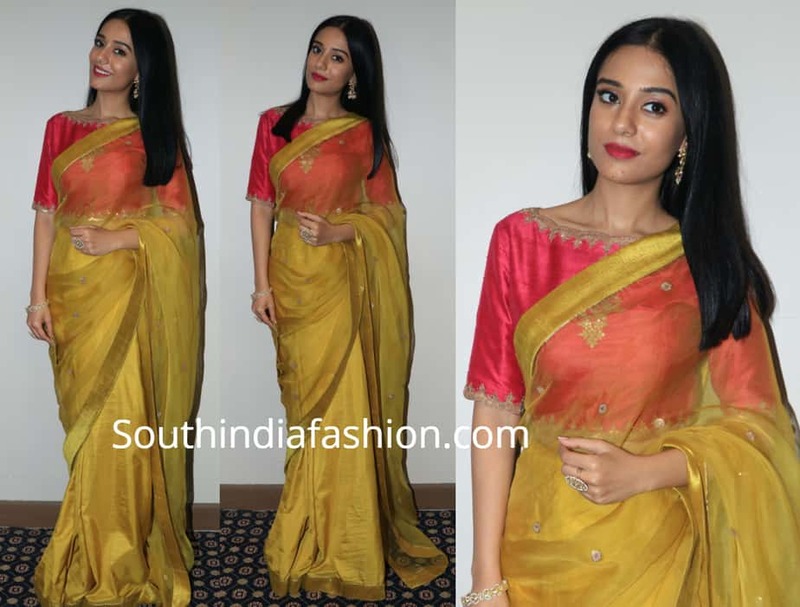 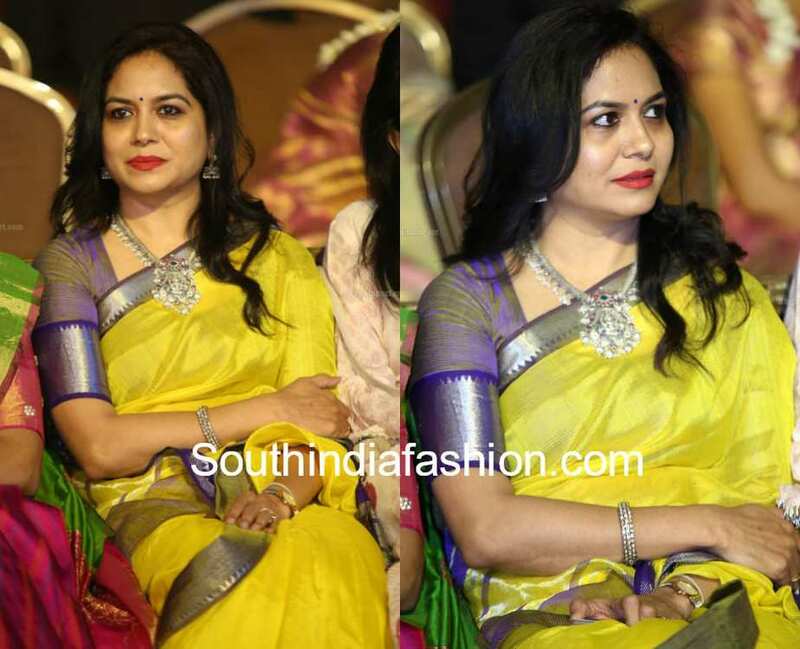 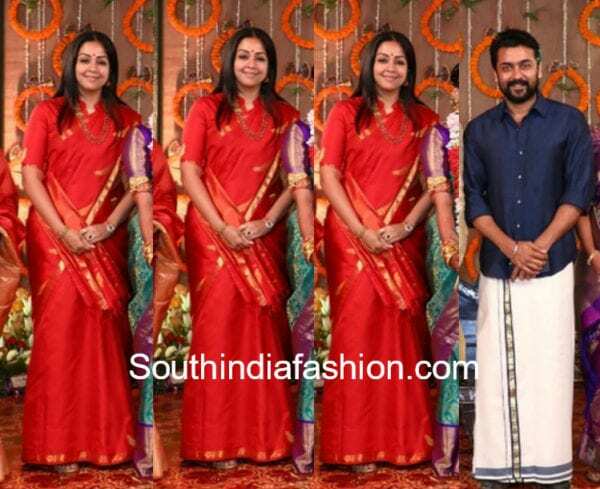 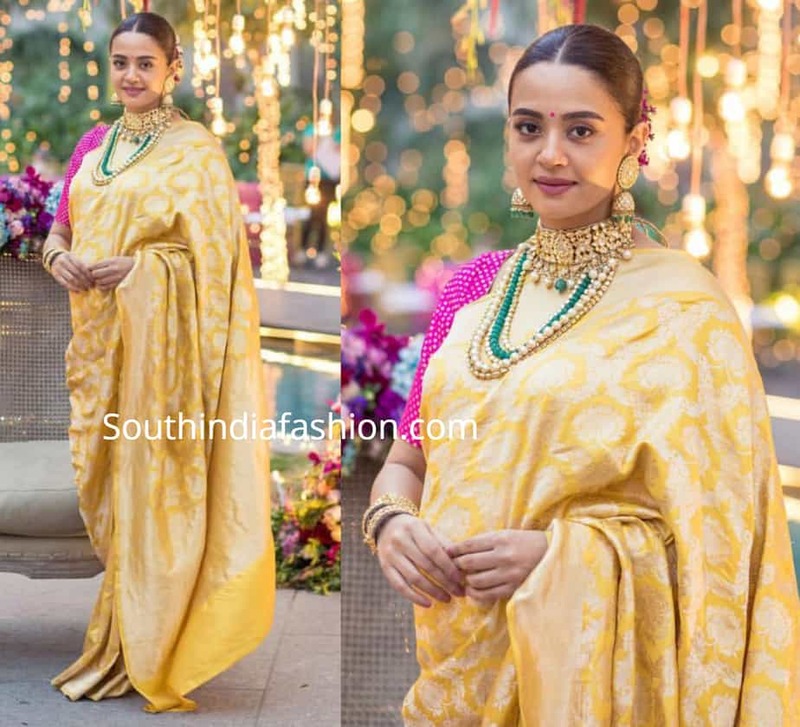 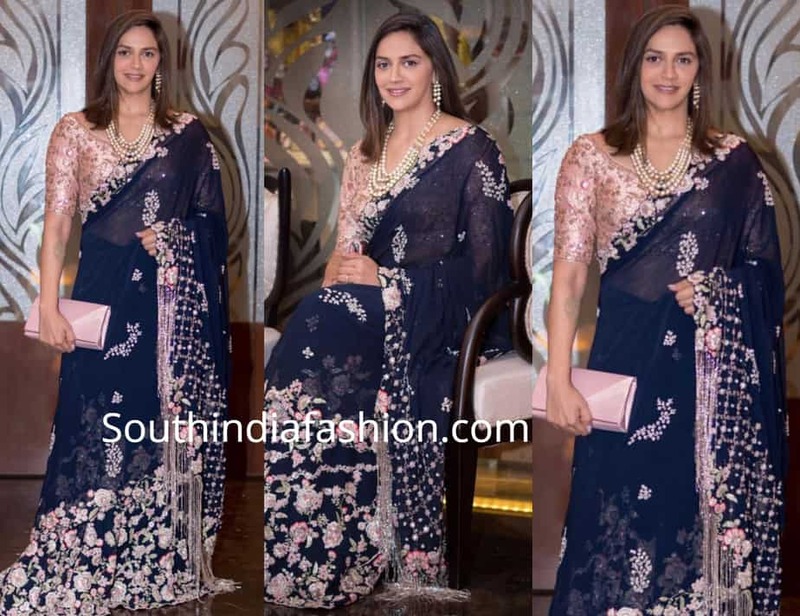 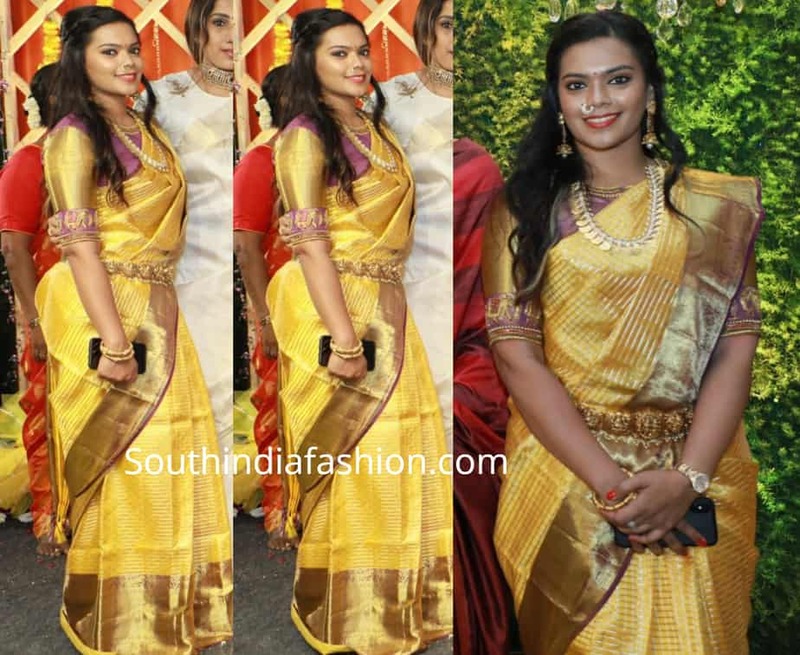 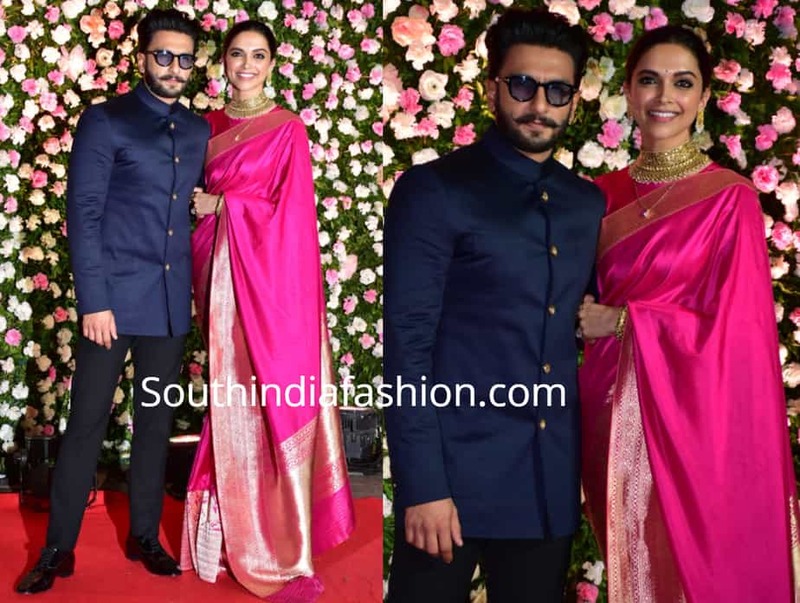 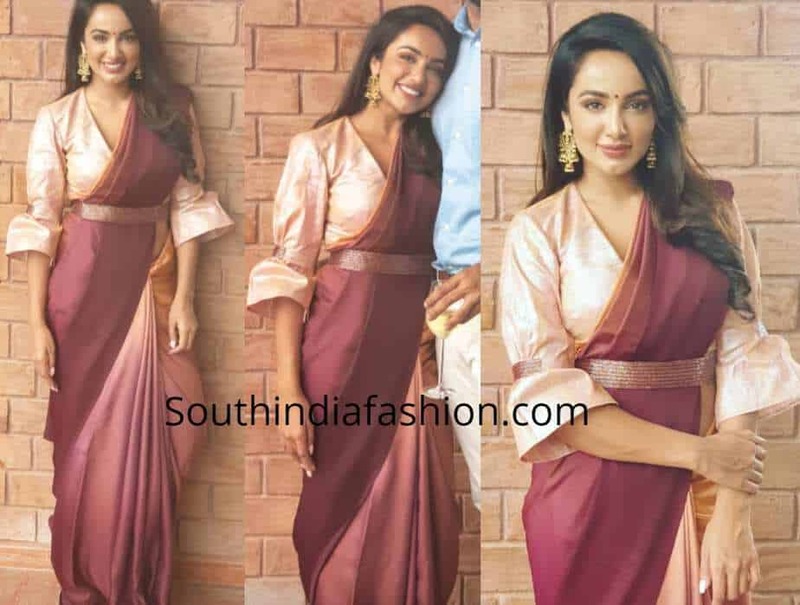 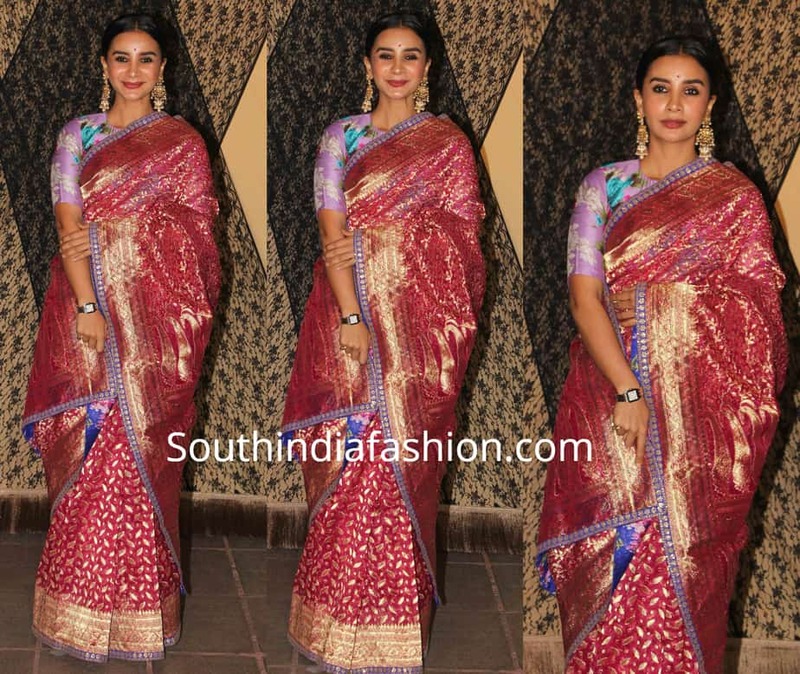 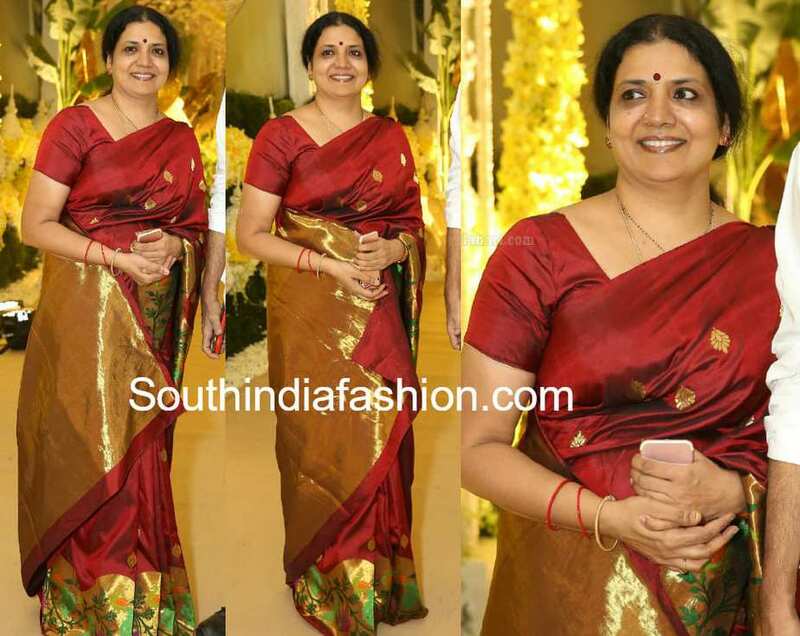 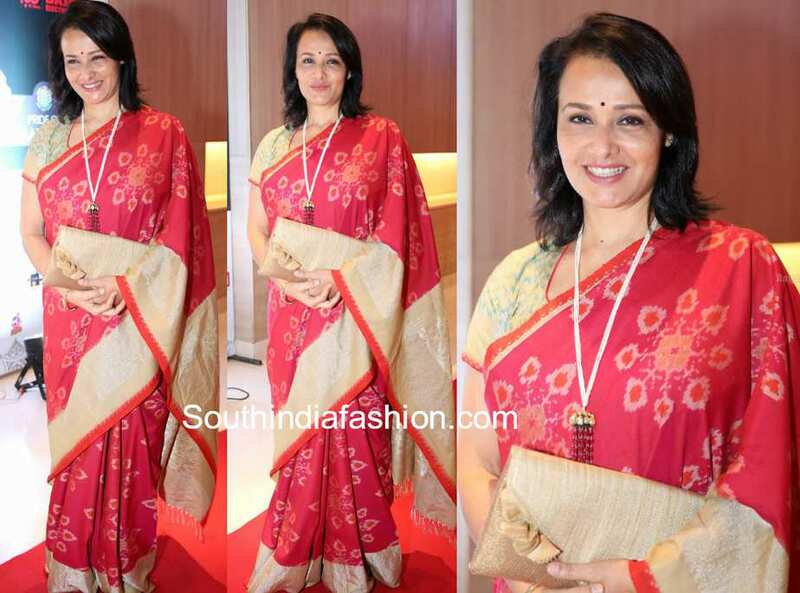 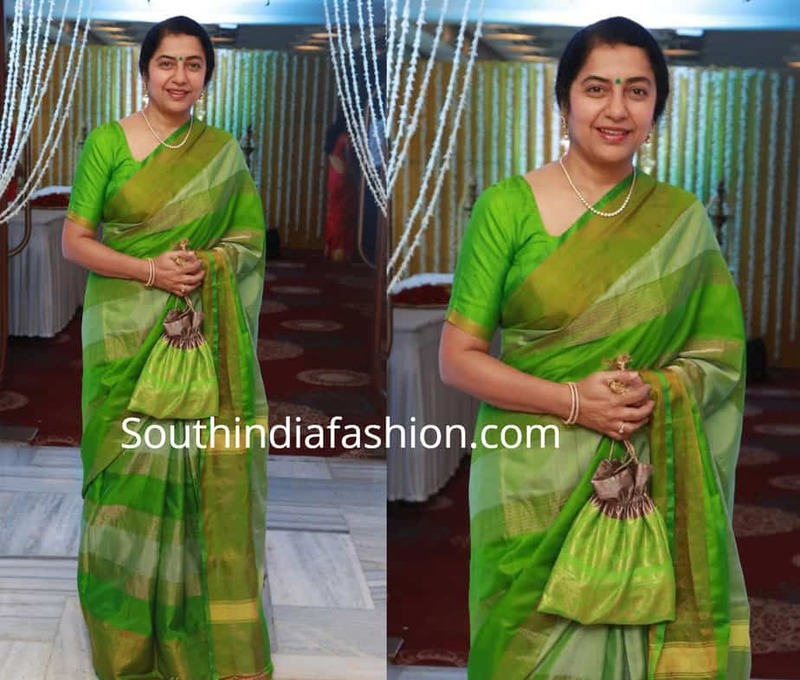 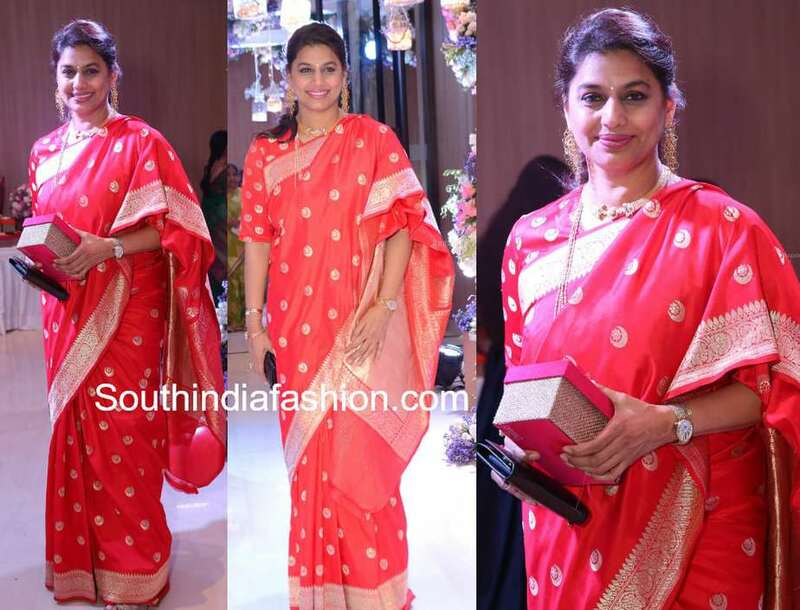 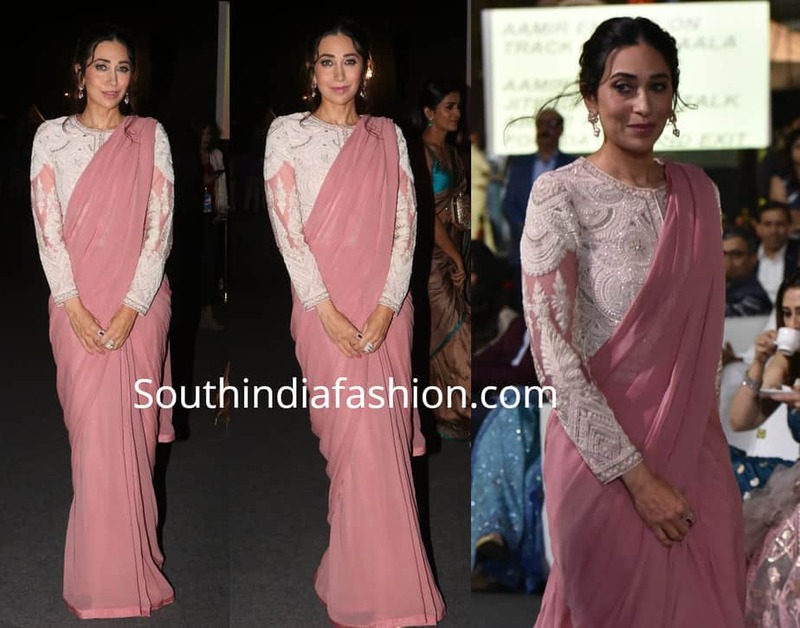 Soundarya Rajinikanth in a traditional saree at Anirudh Reddy’s Sangeeth! 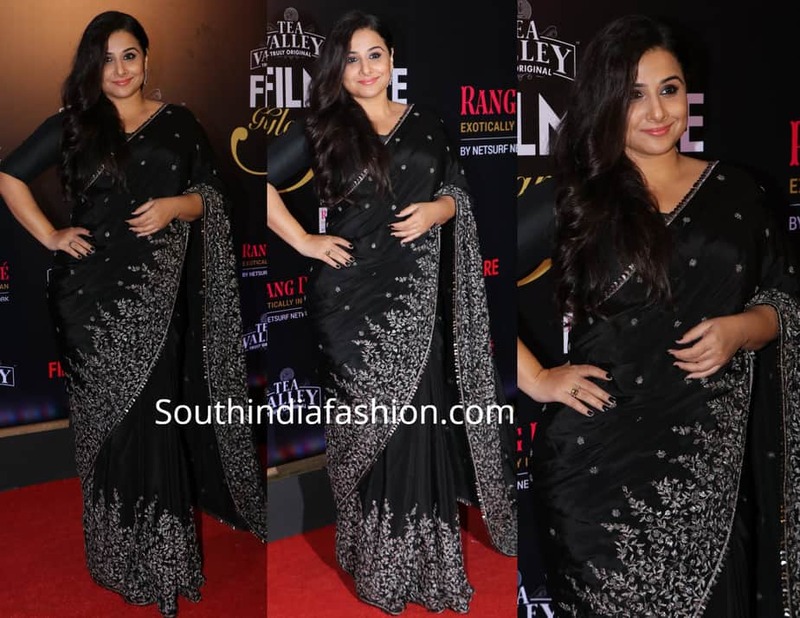 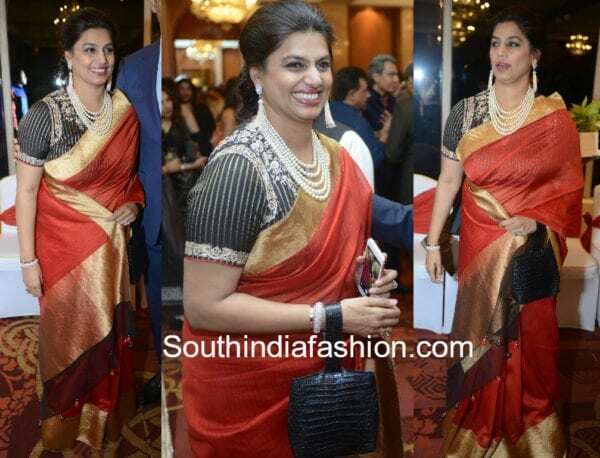 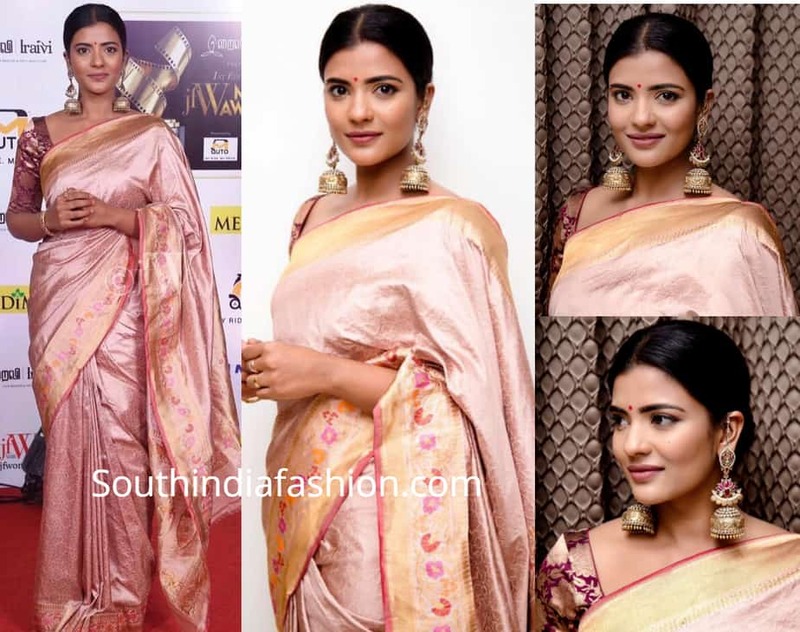 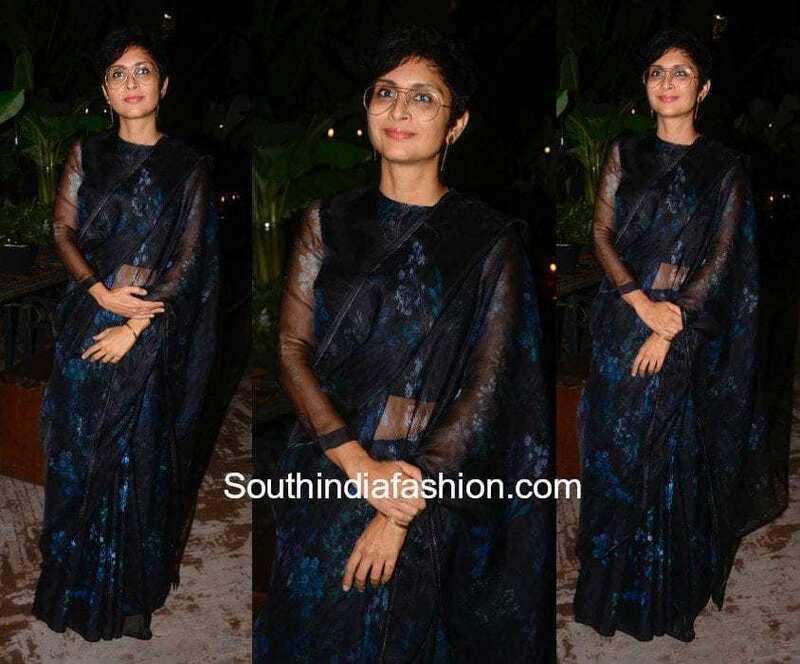 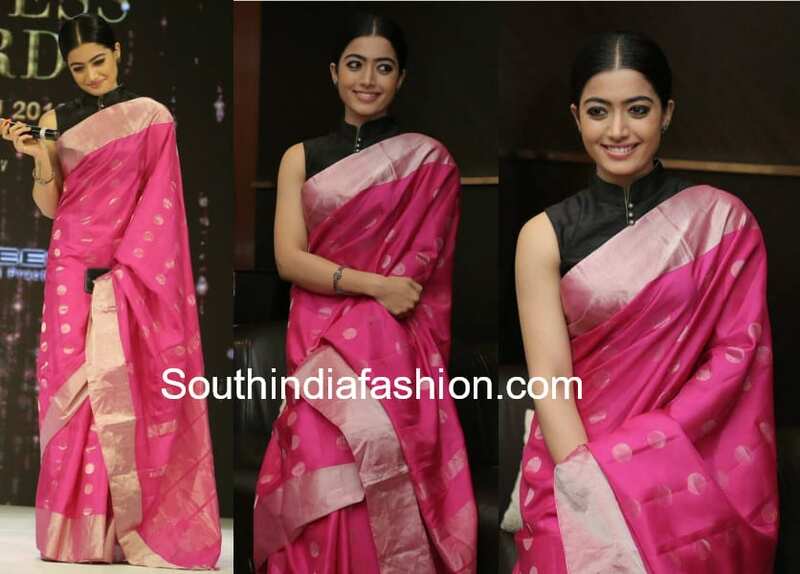 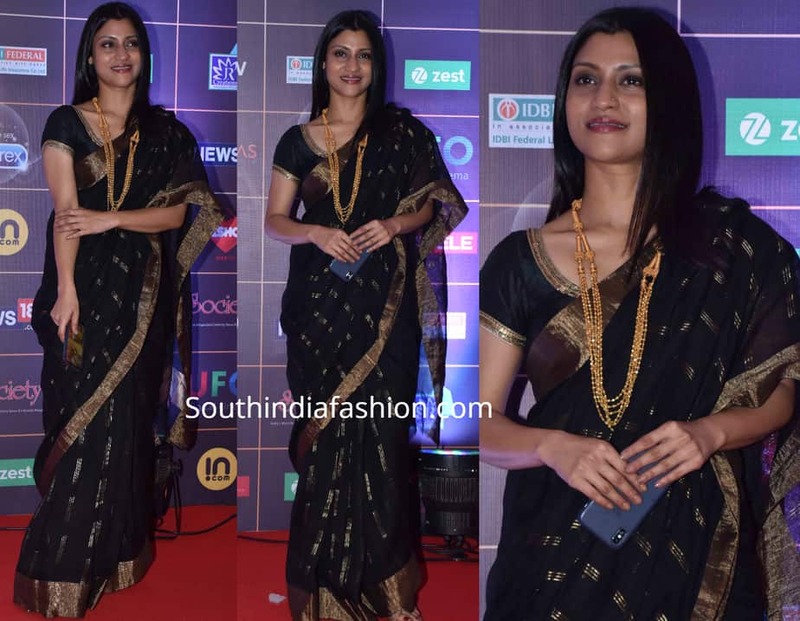 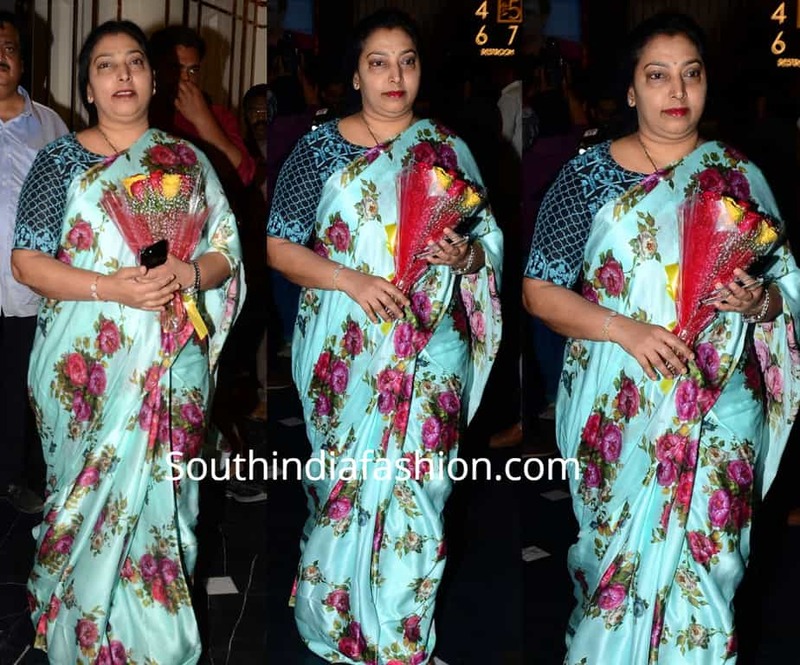 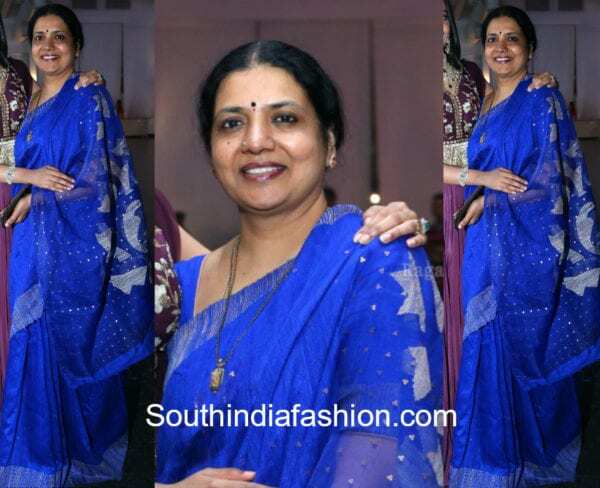 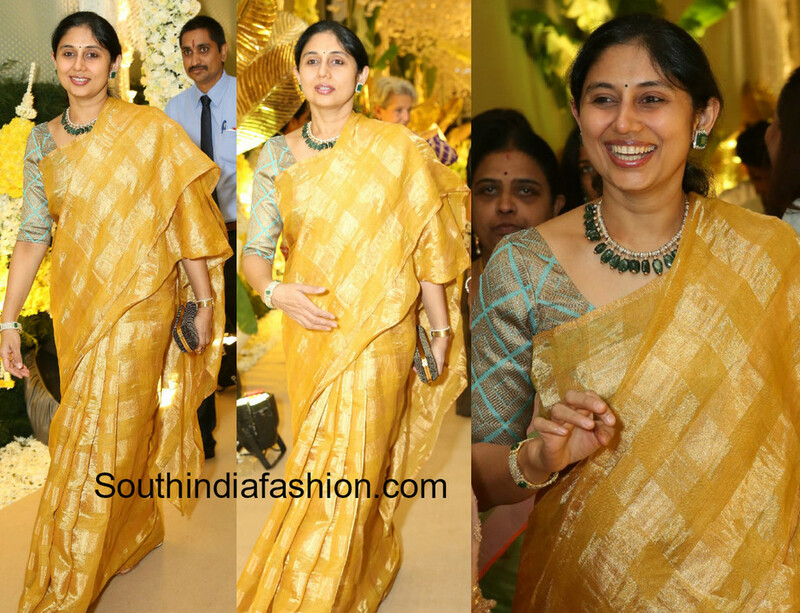 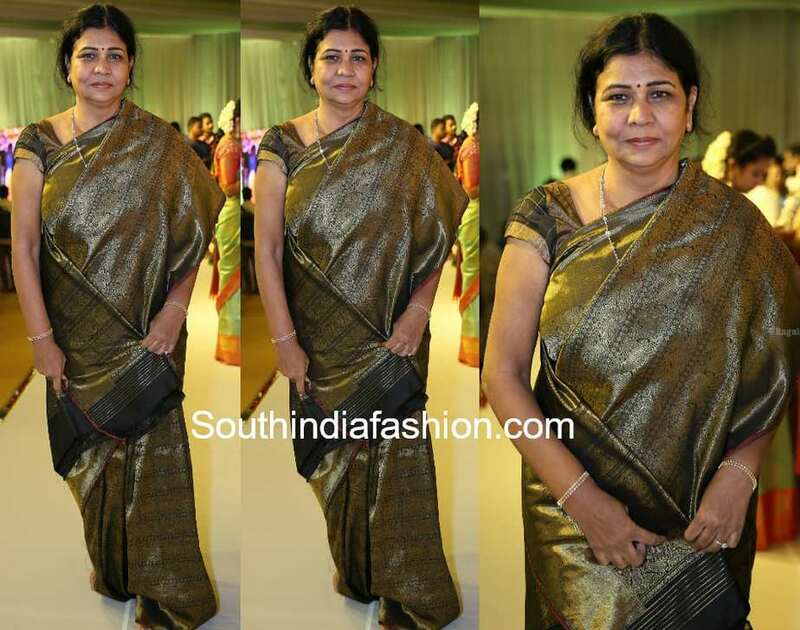 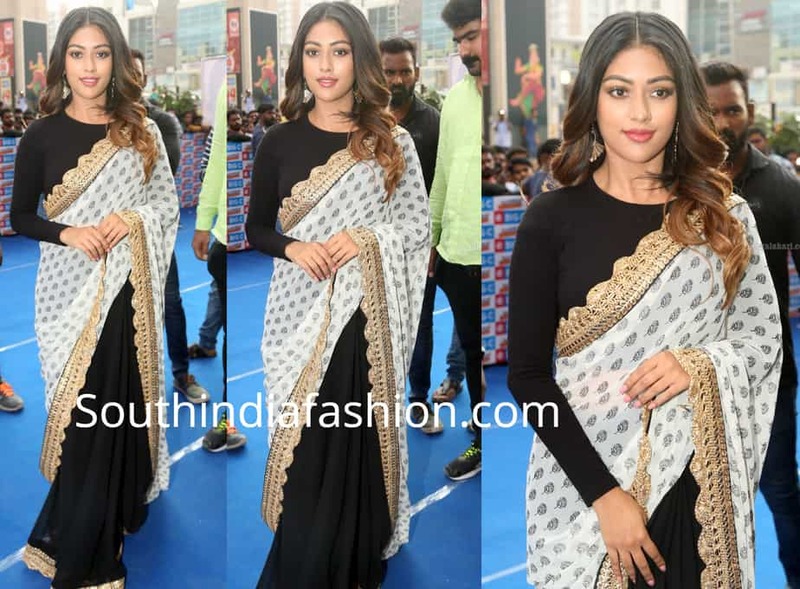 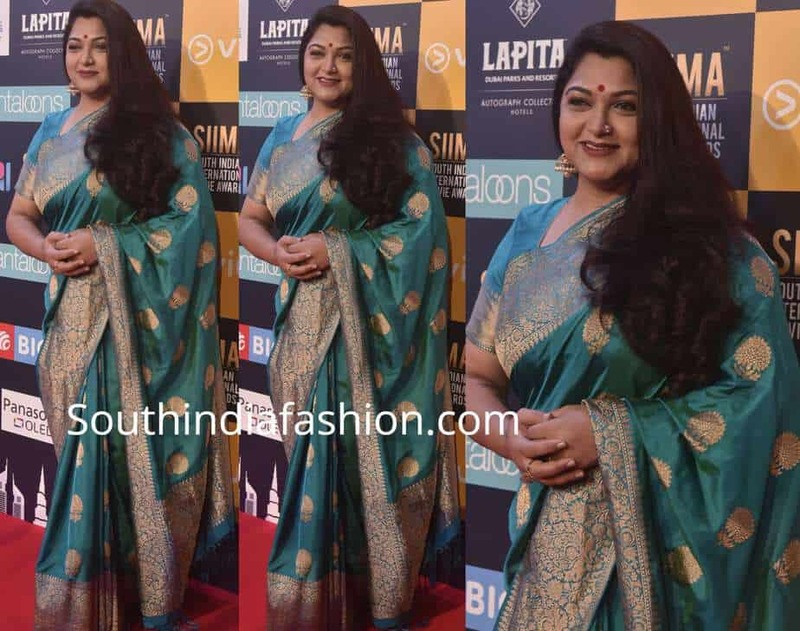 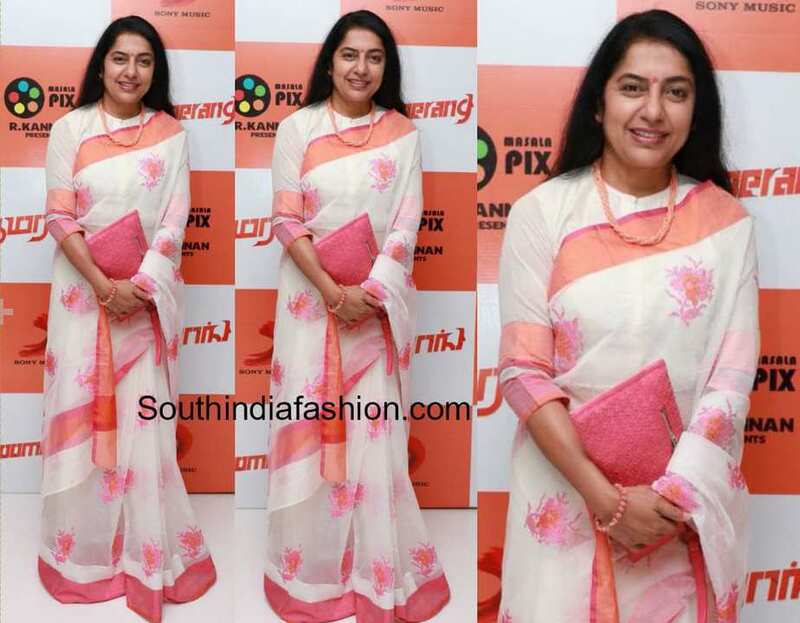 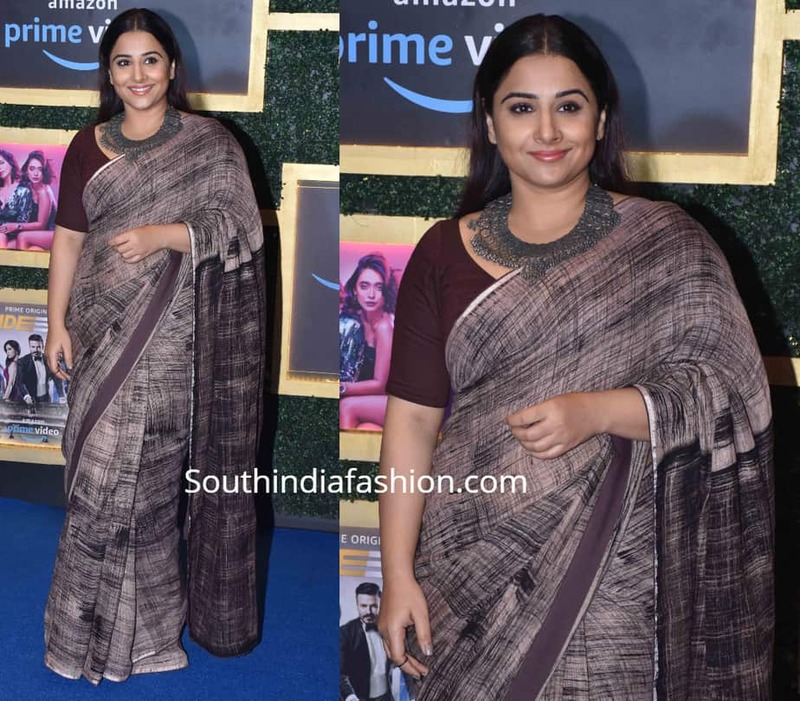 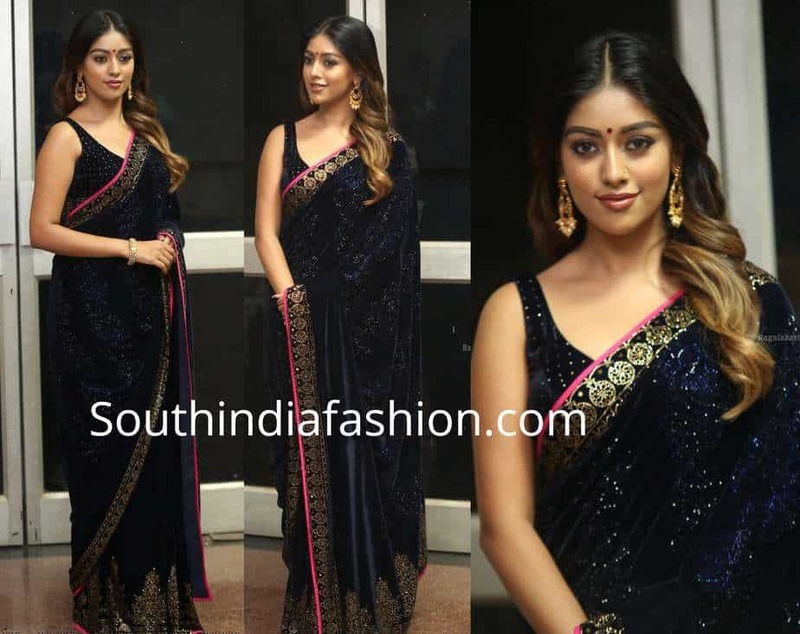 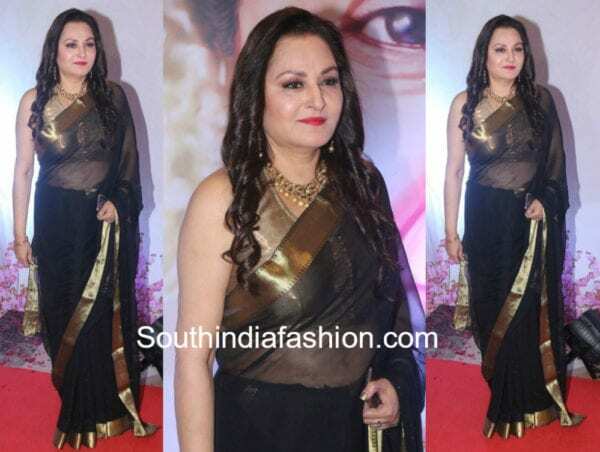 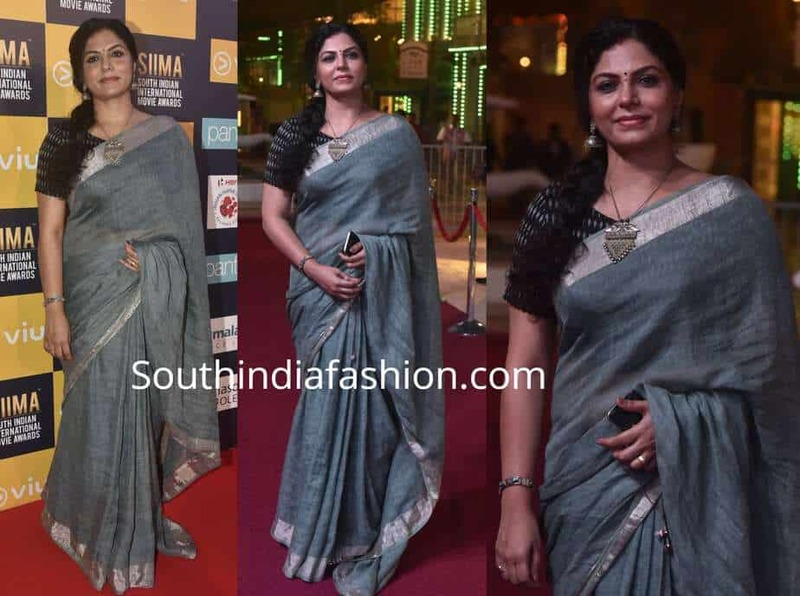 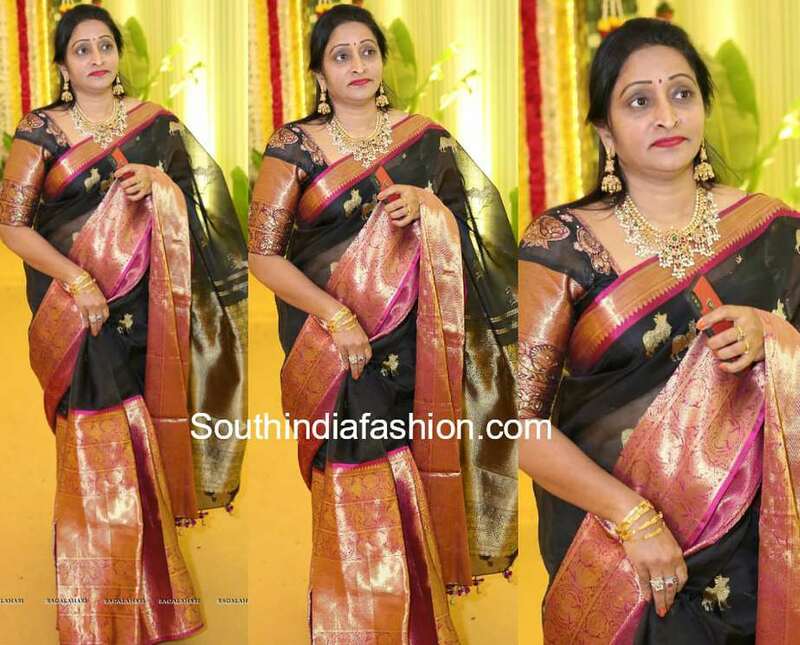 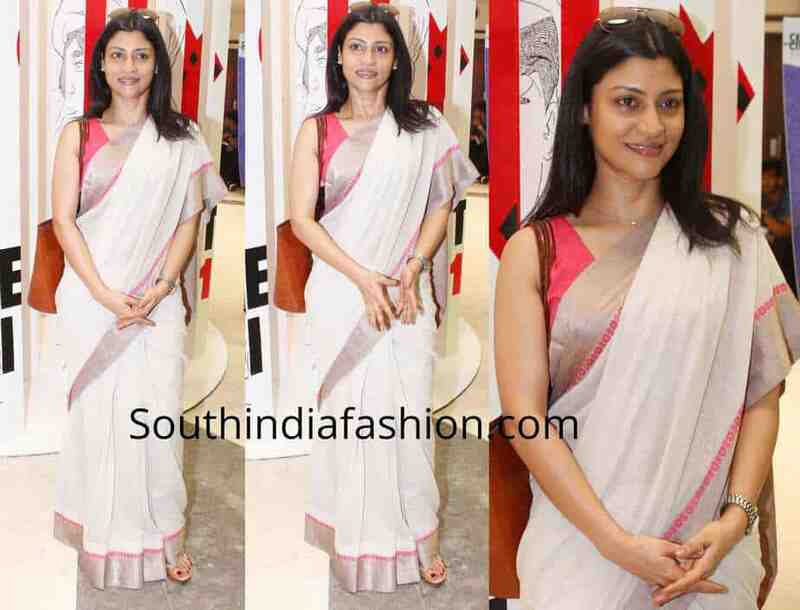 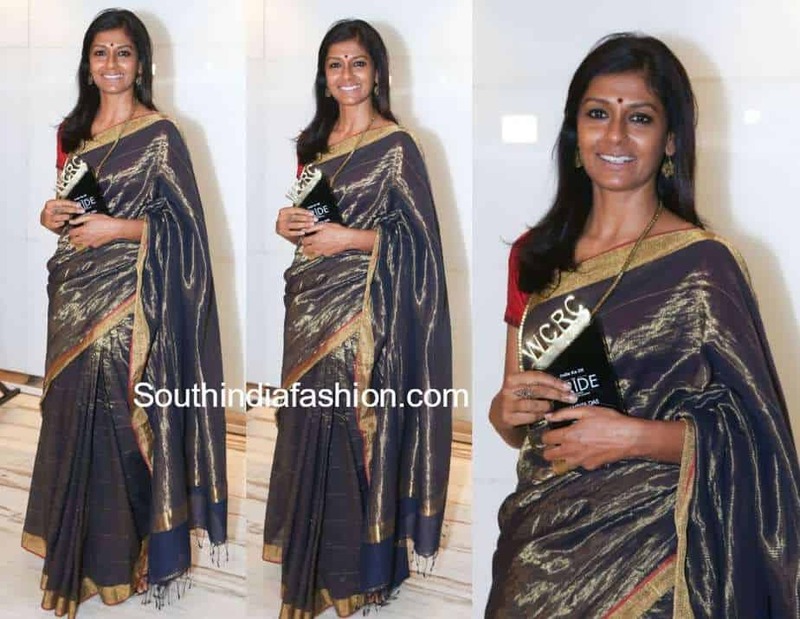 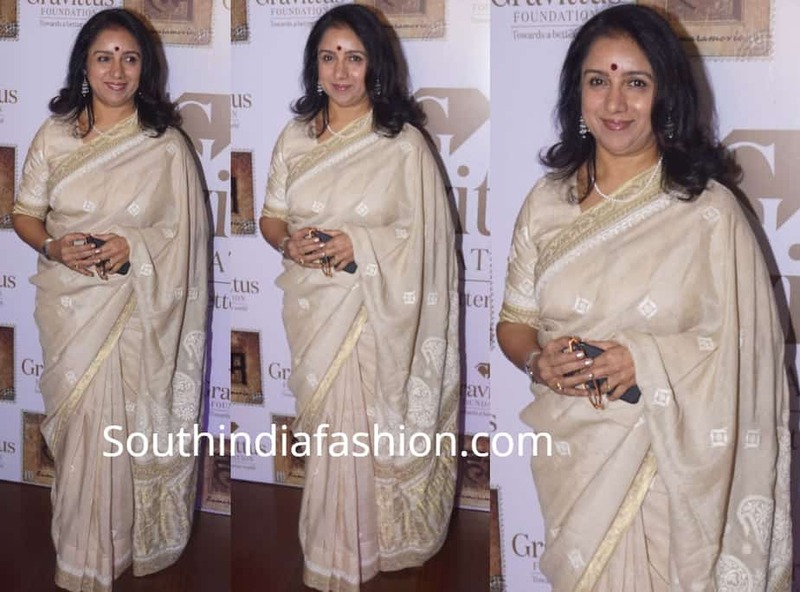 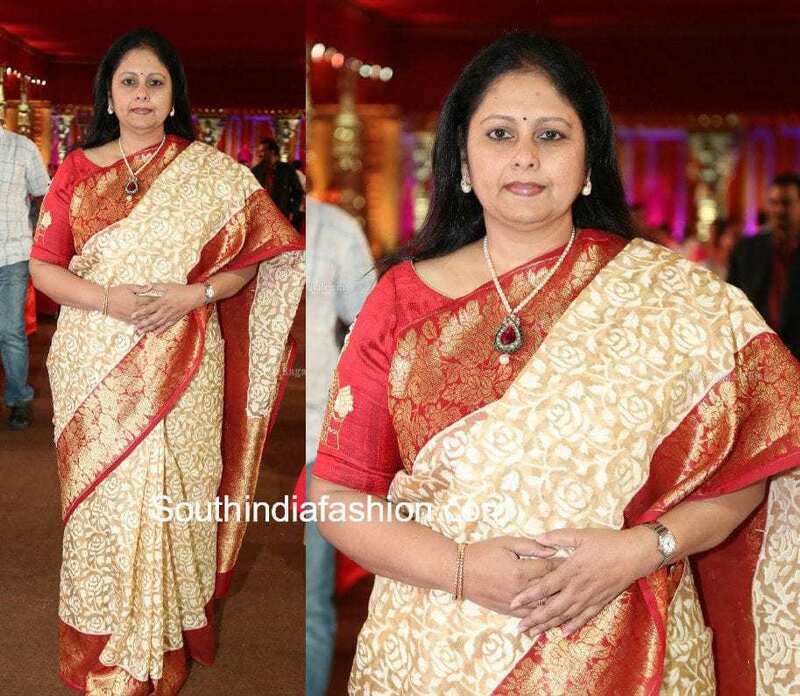 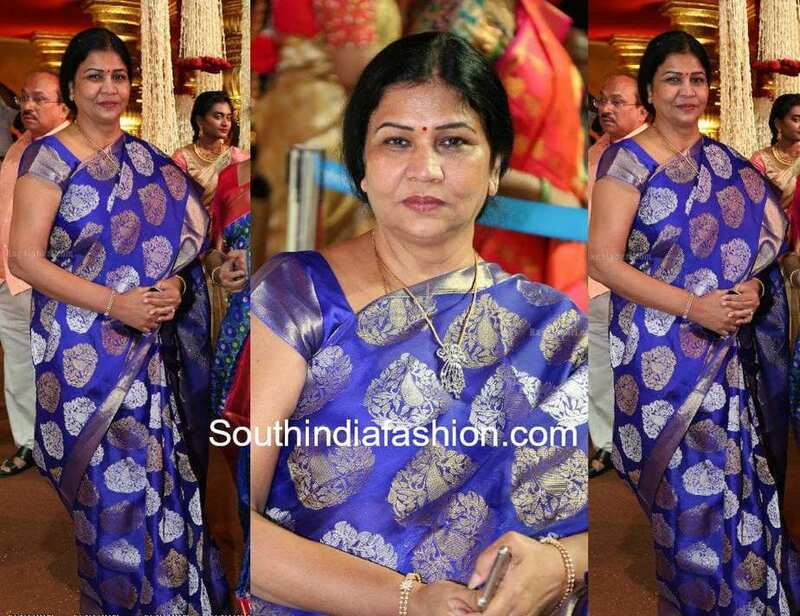 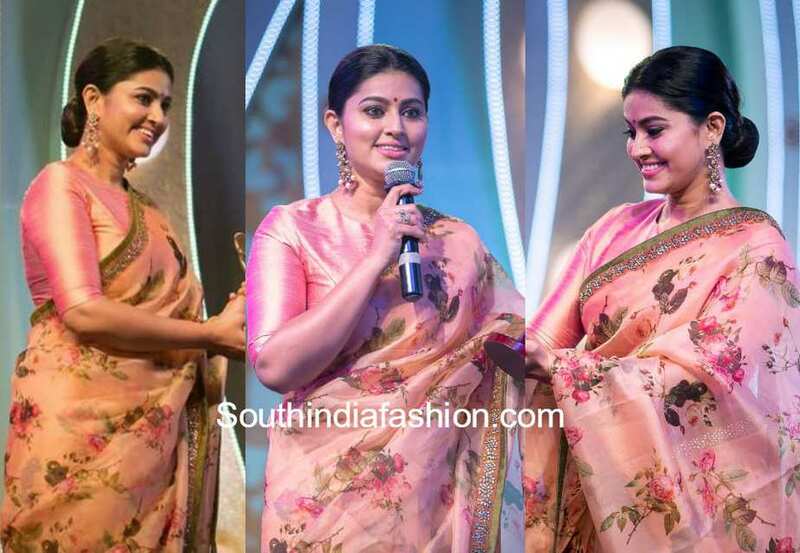 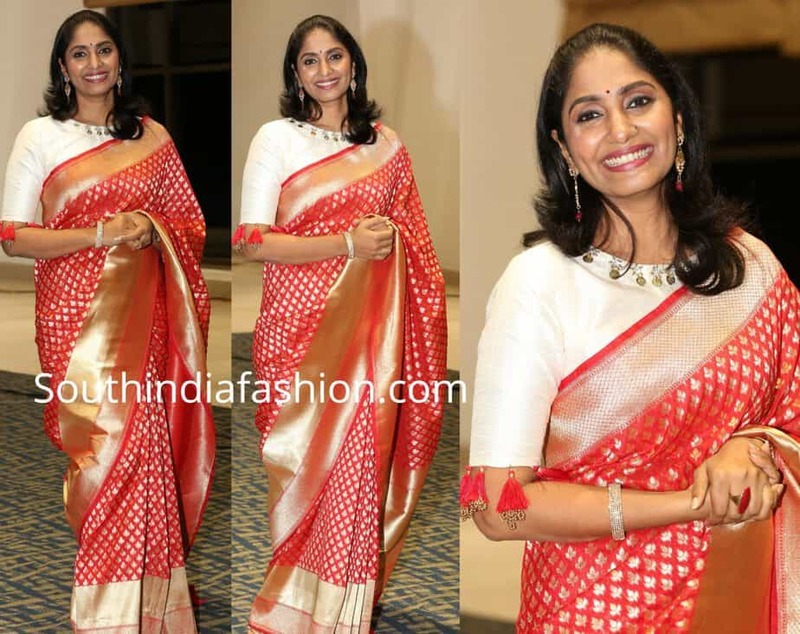 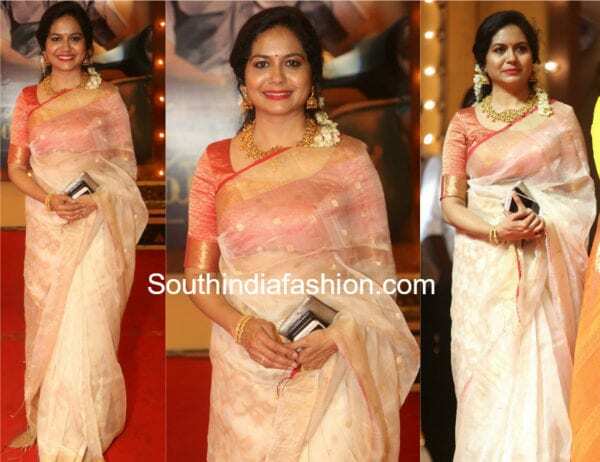 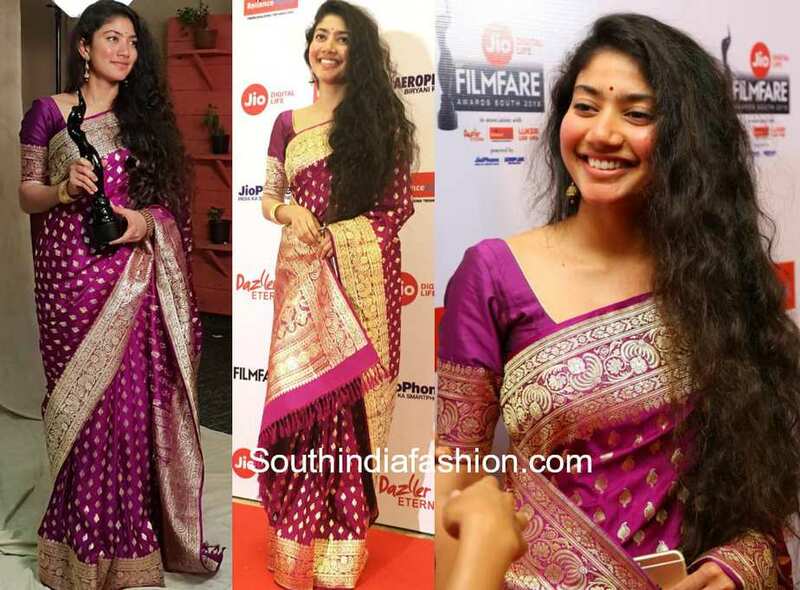 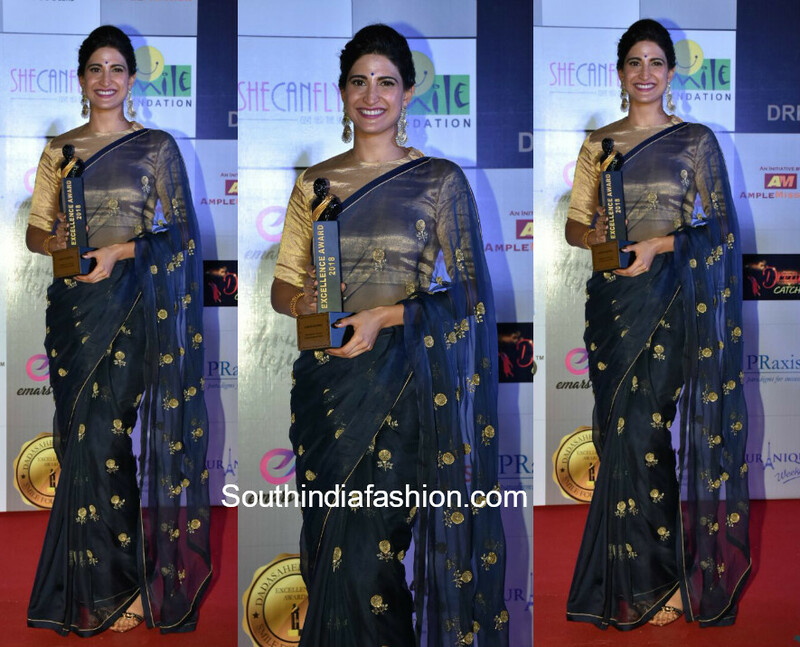 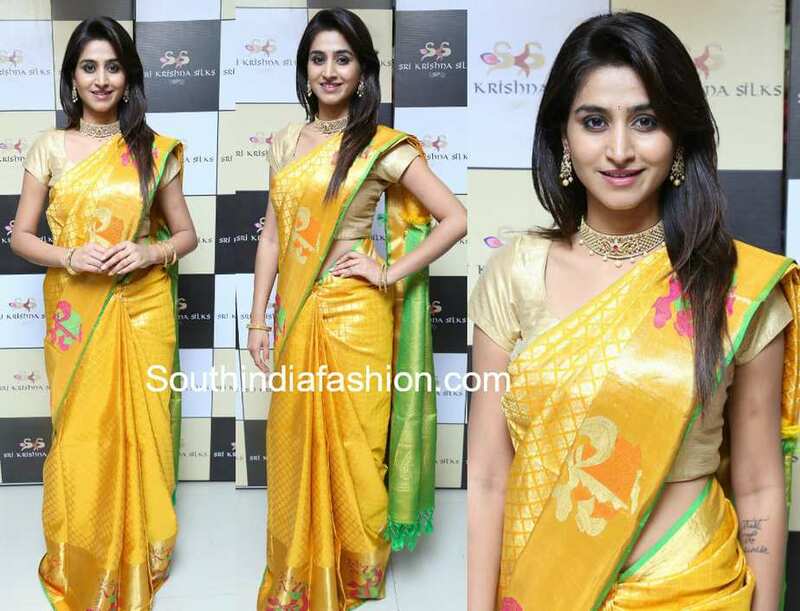 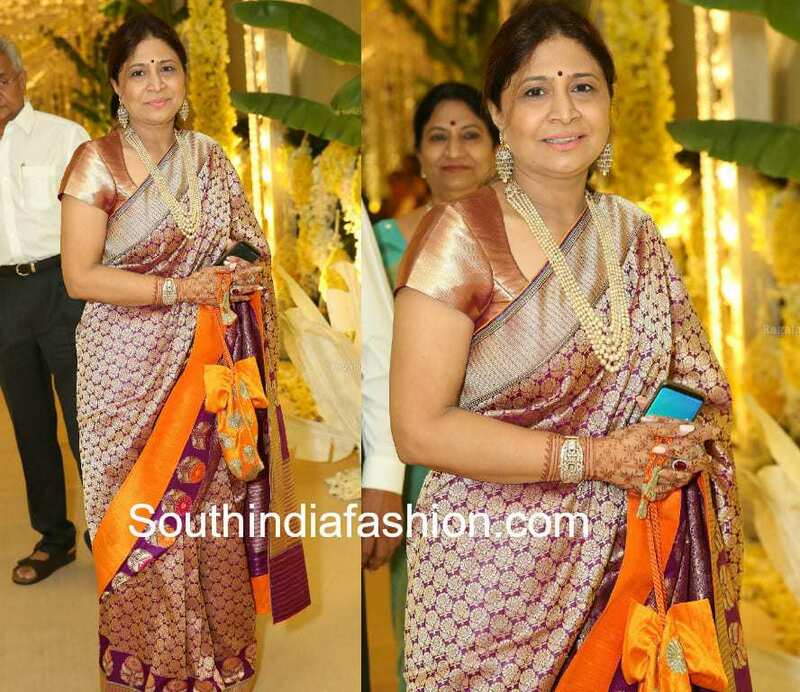 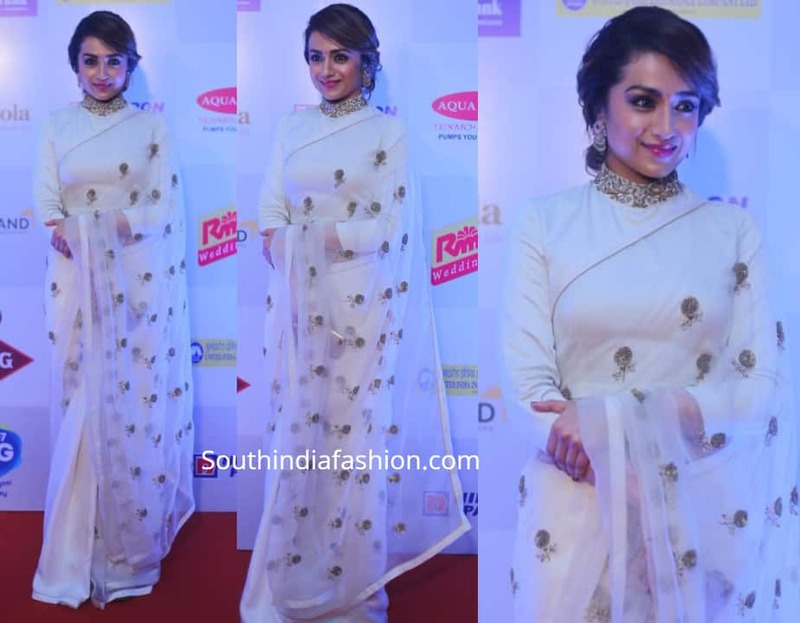 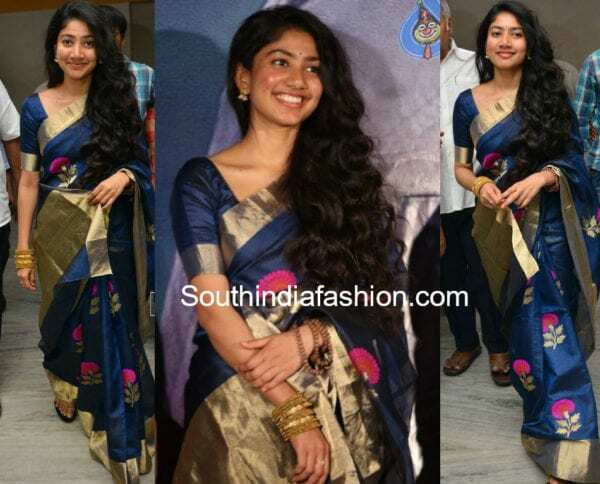 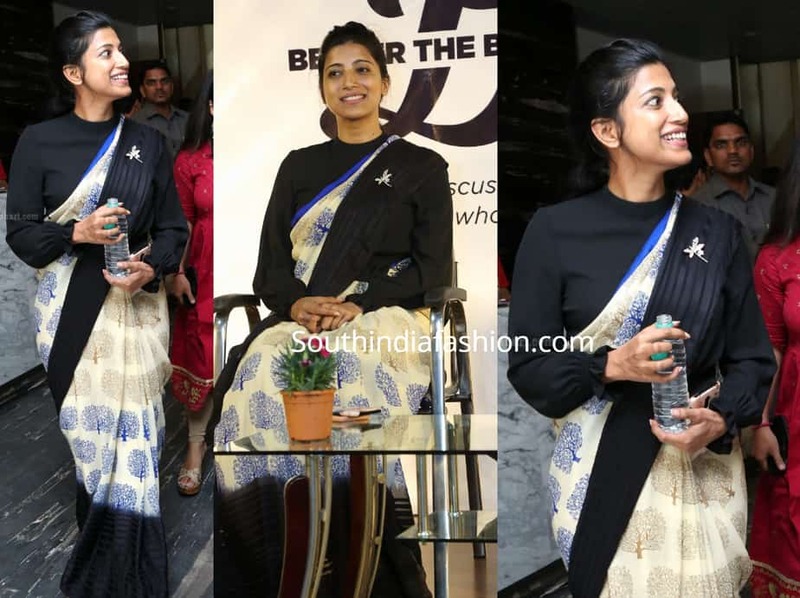 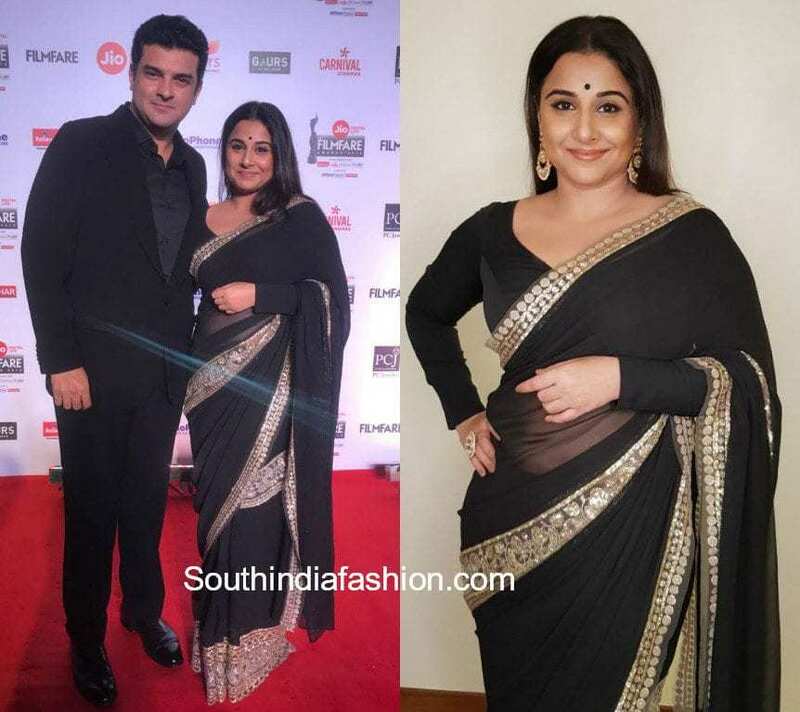 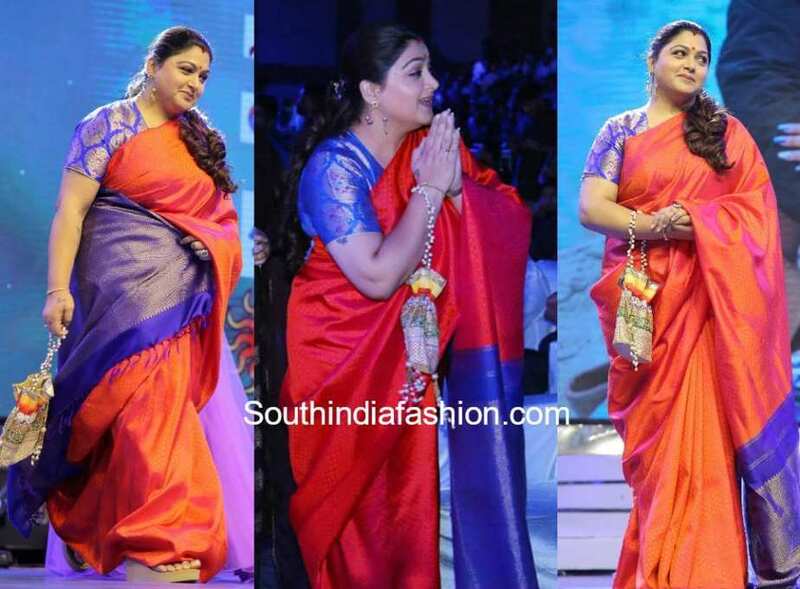 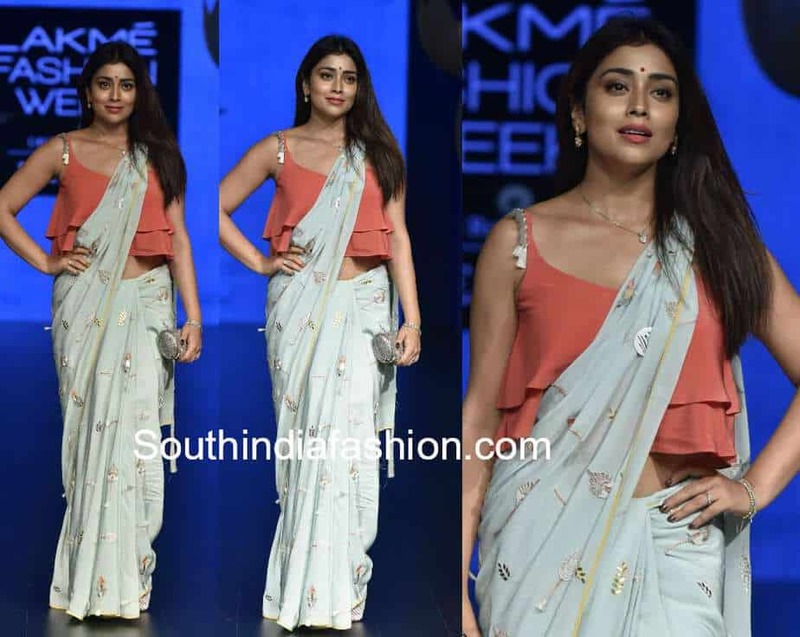 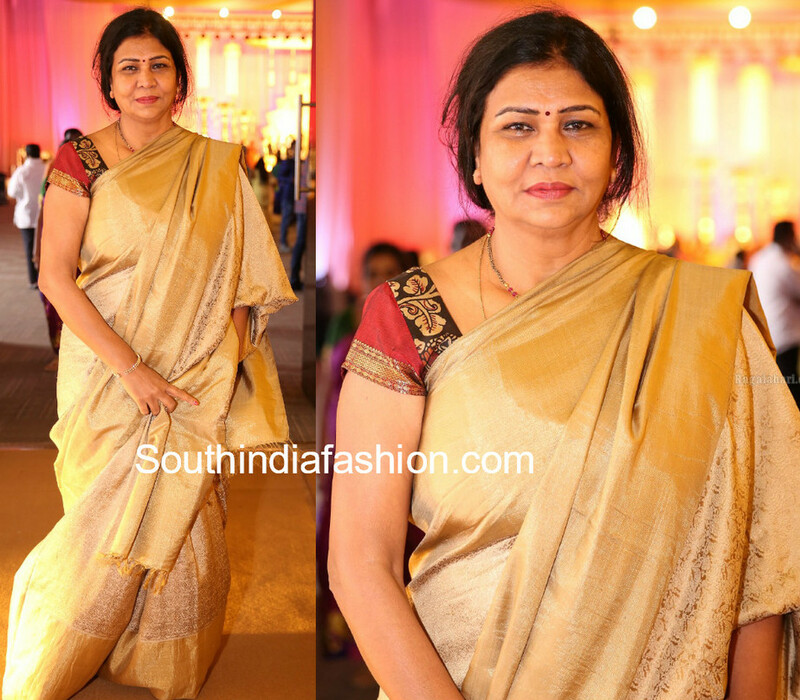 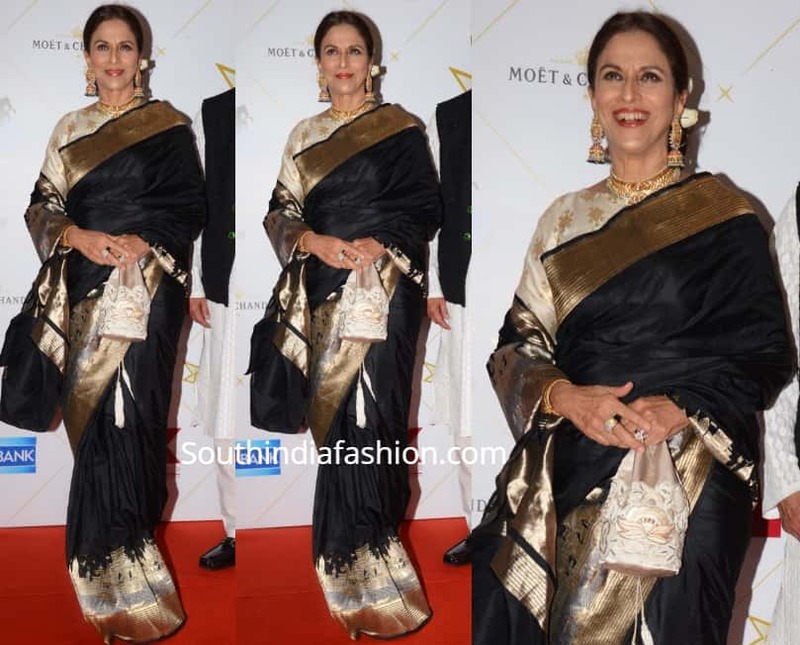 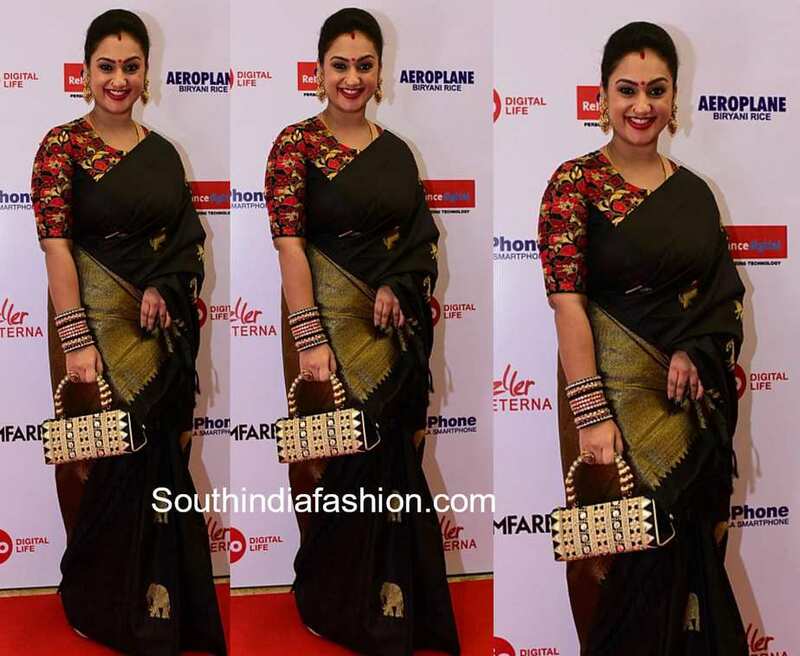 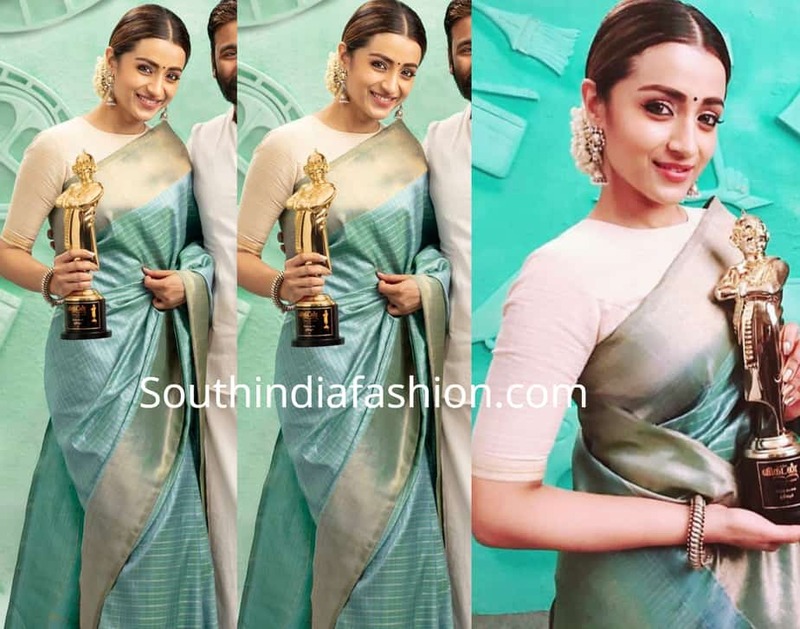 Kasthuri’s saree look at the Filmfare Awards South! 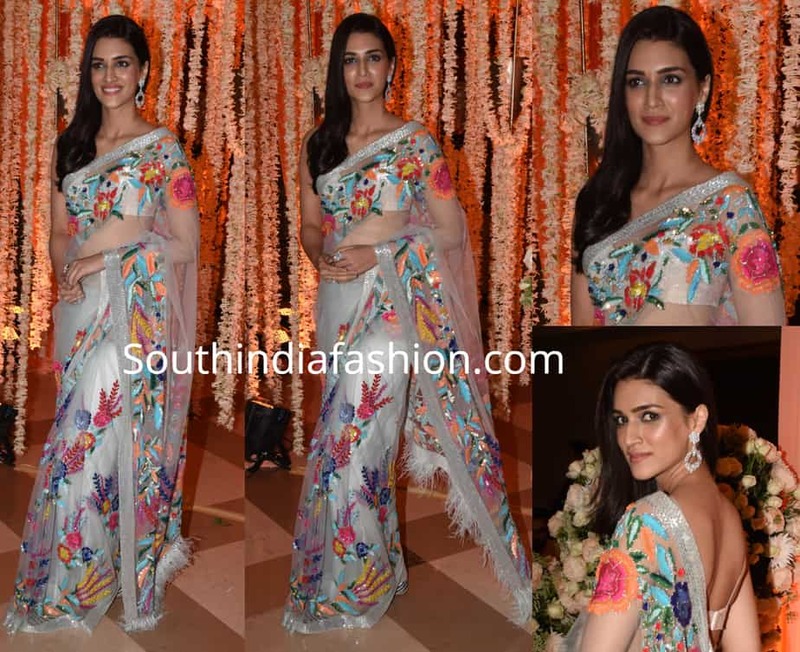 Kriti Sanon in Arpita Mehta! 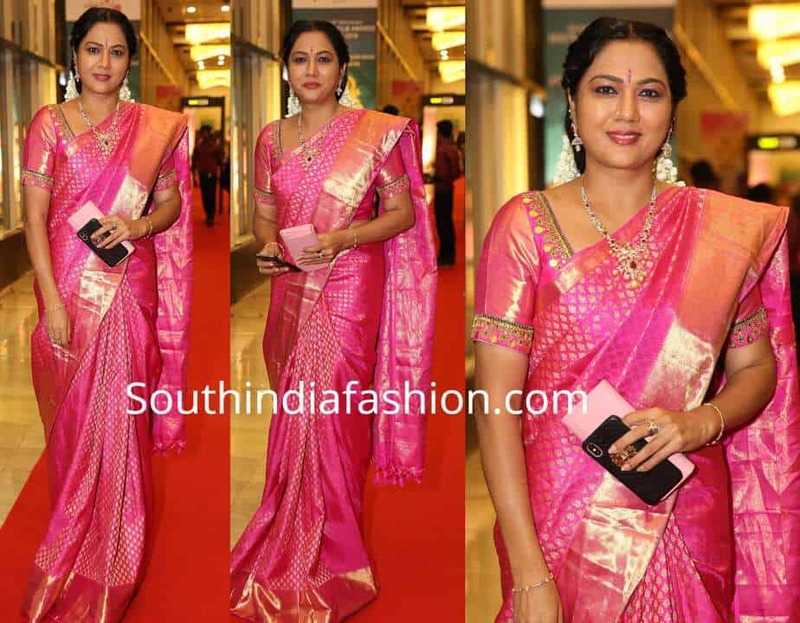 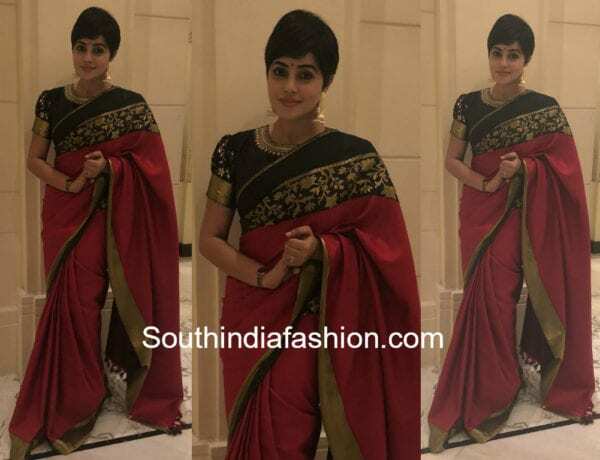 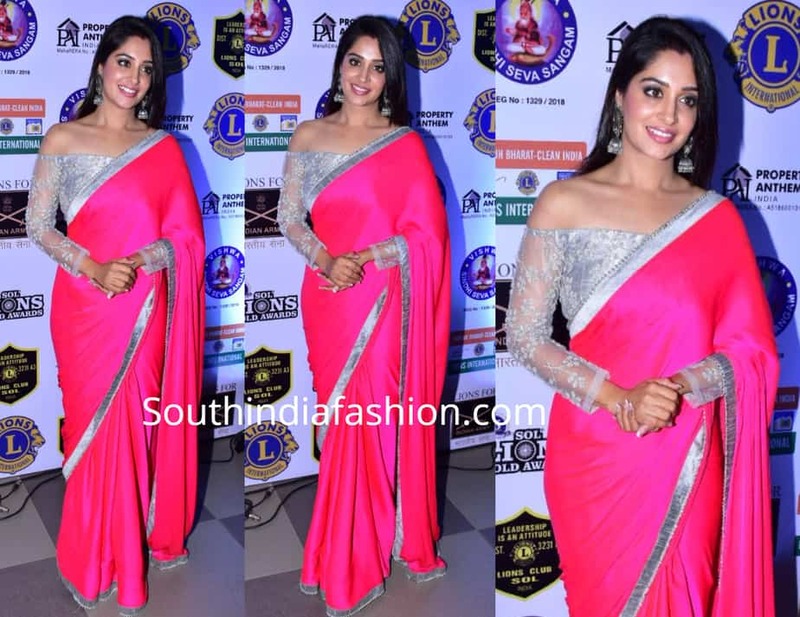 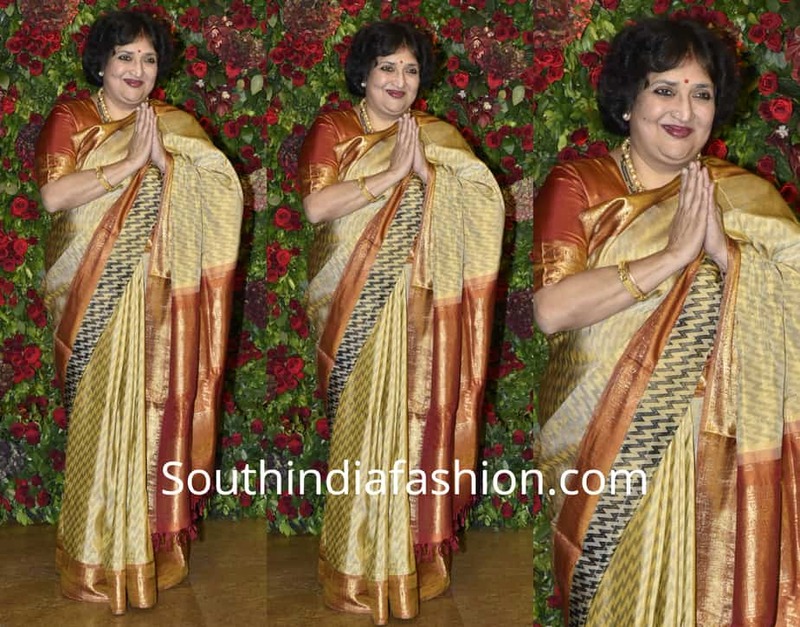 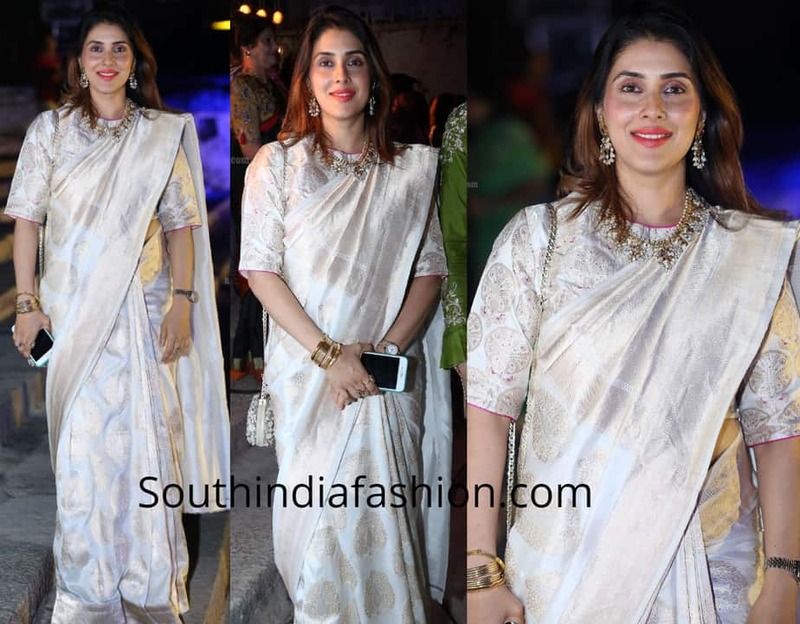 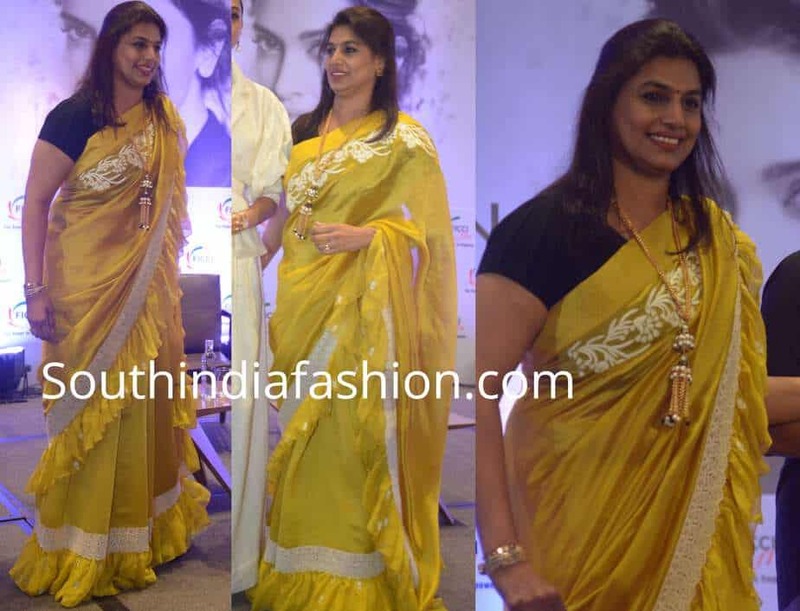 Pinky Reddy stuns in a kanjeevaram saree! 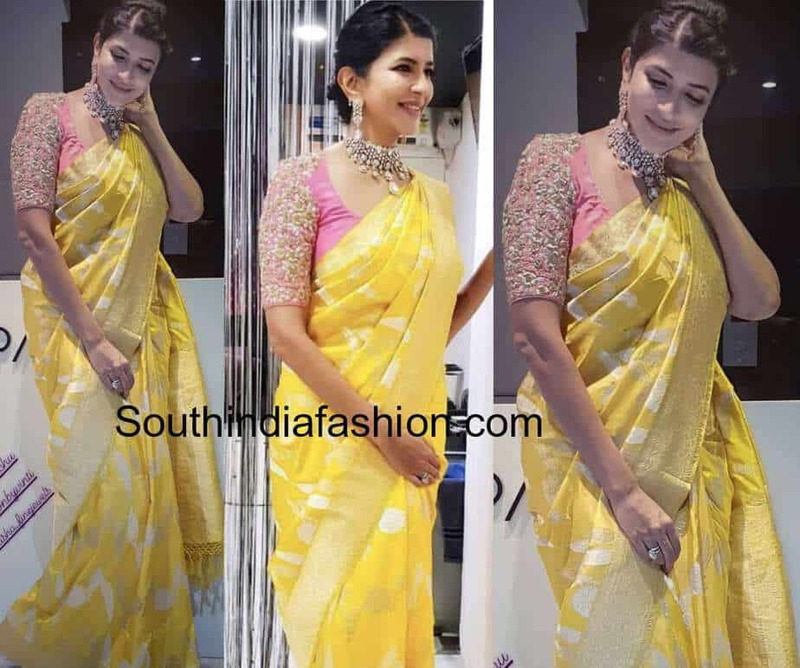 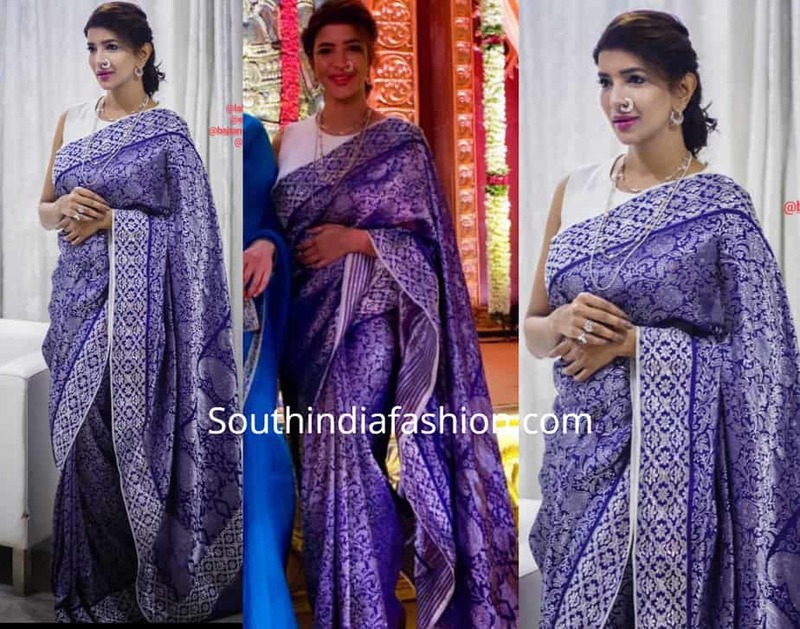 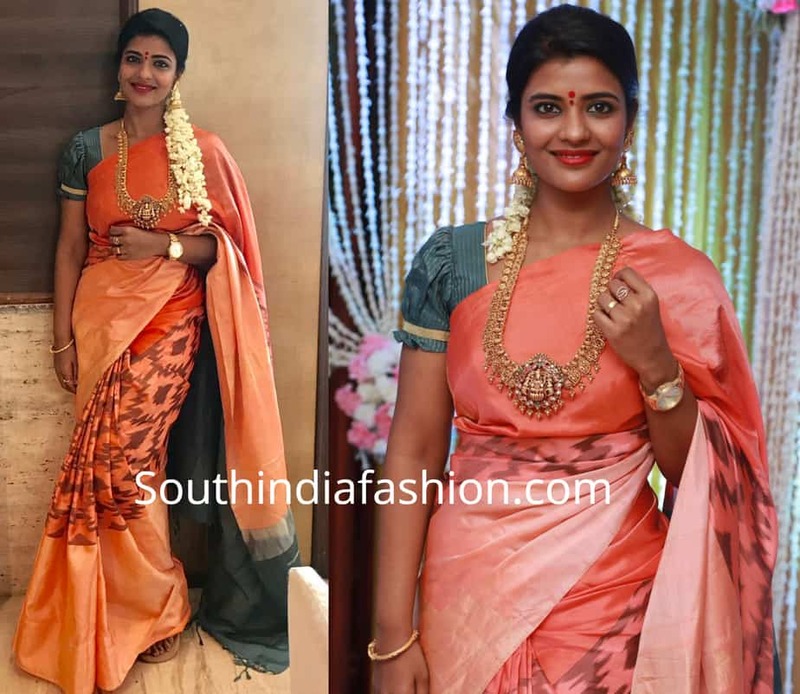 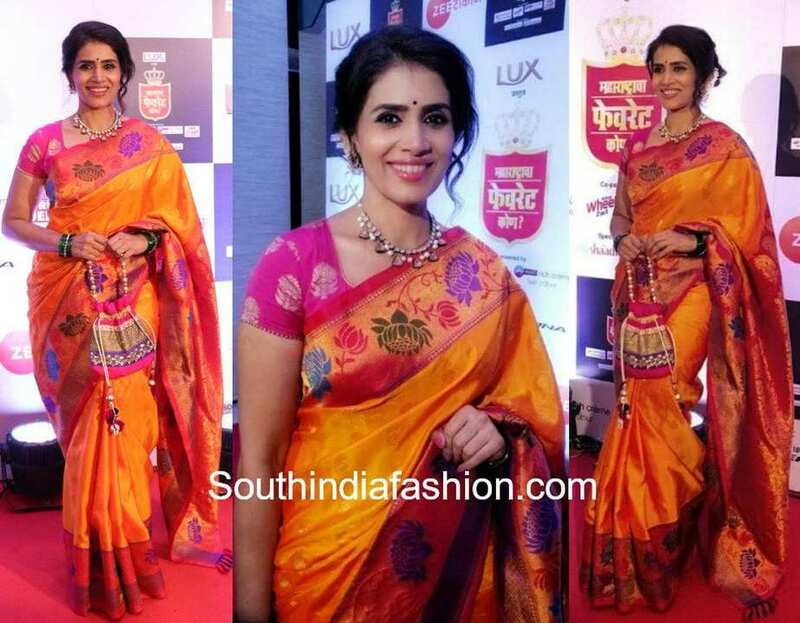 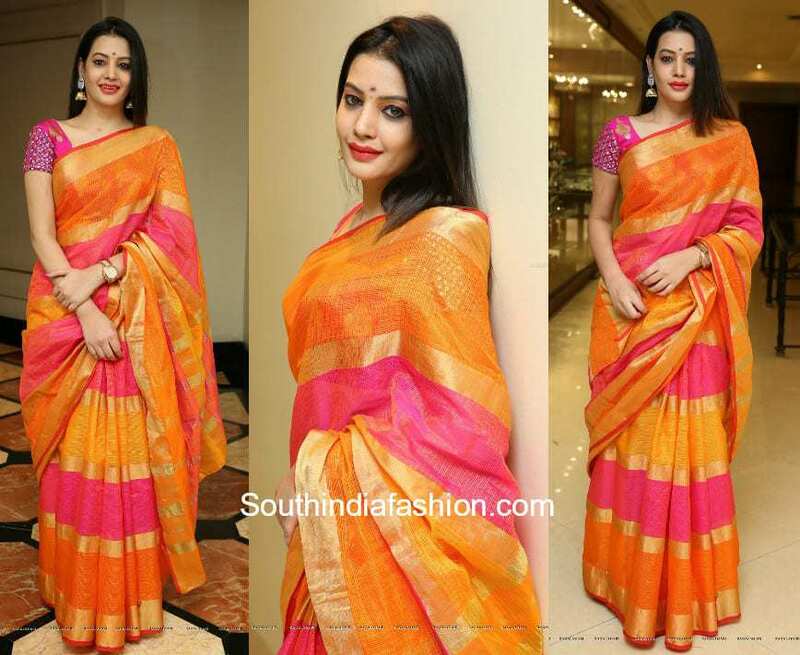 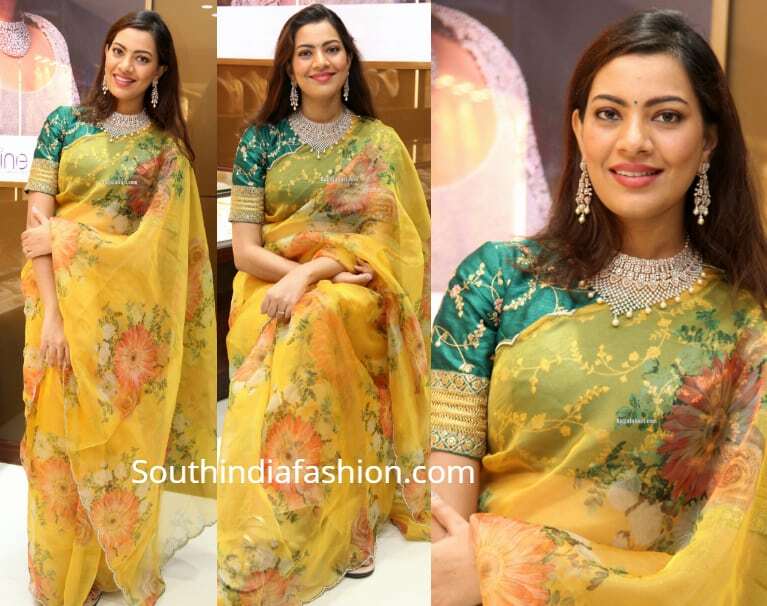 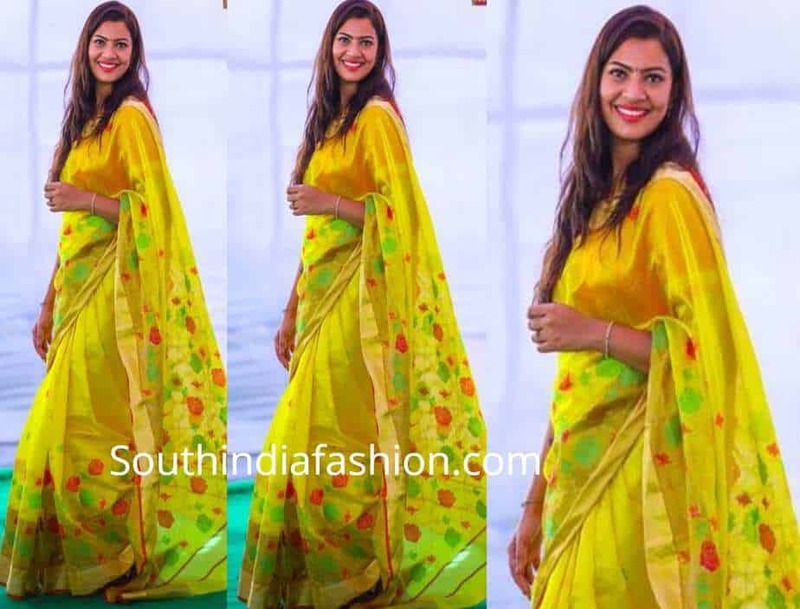 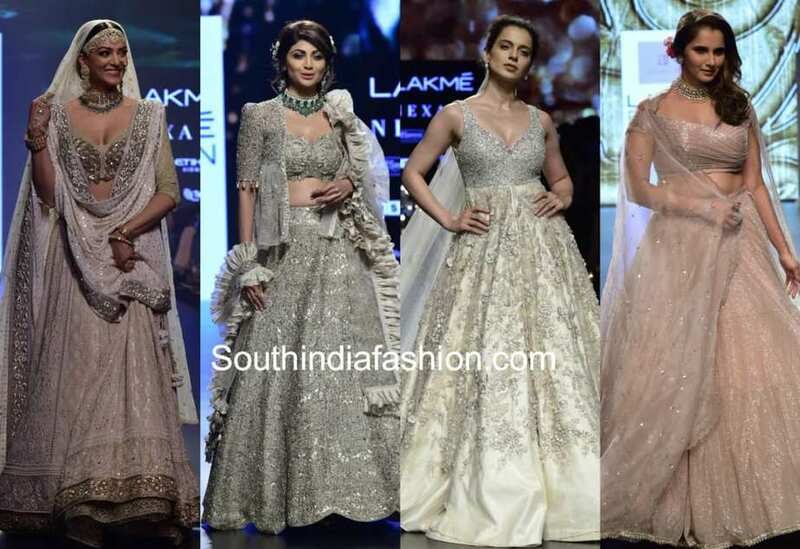 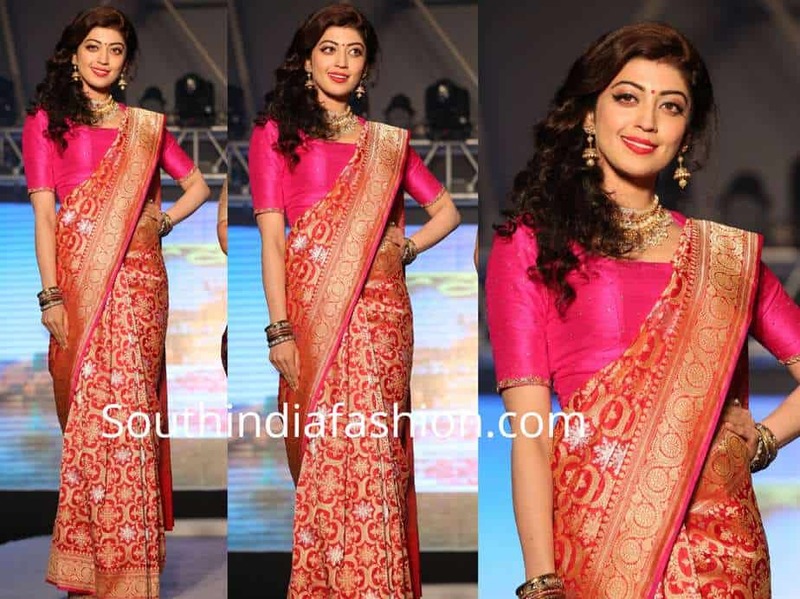 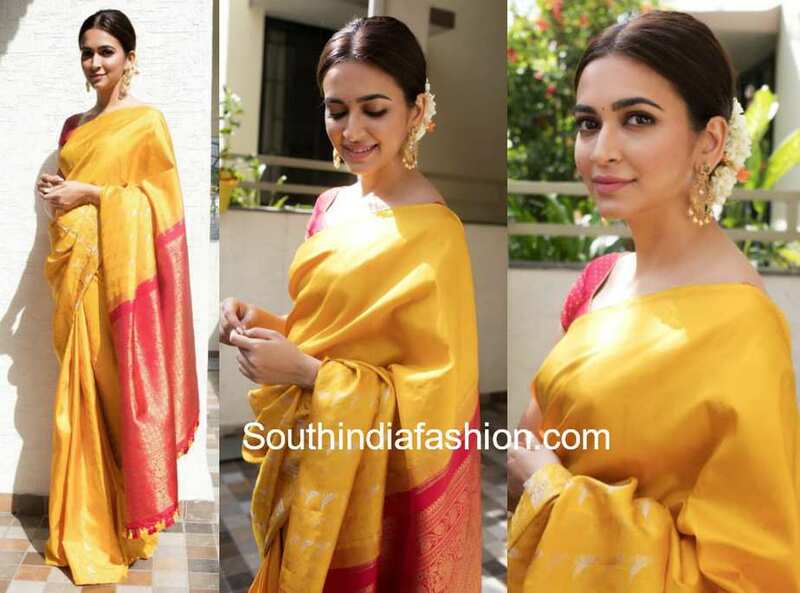 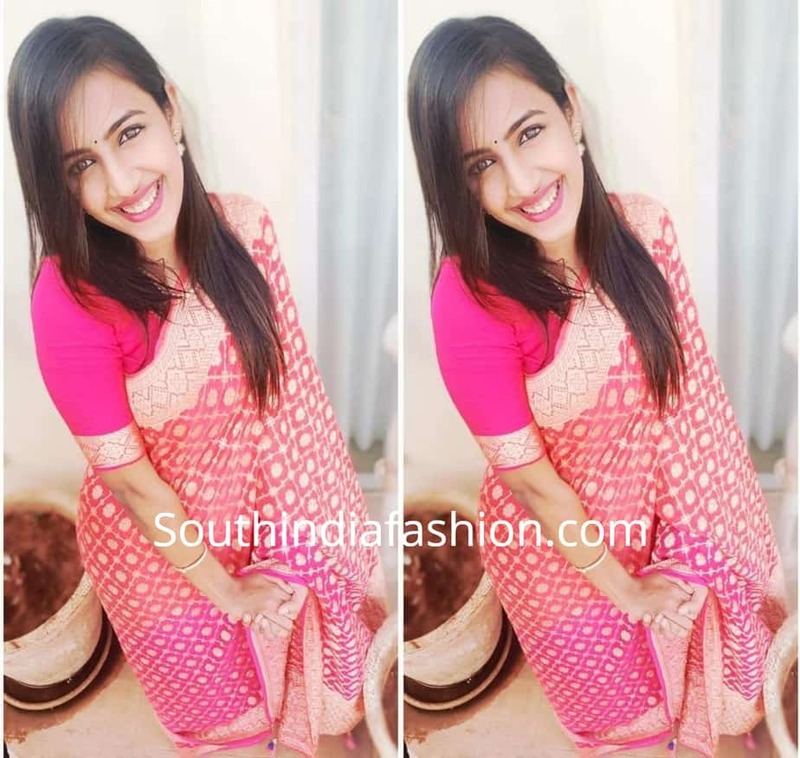 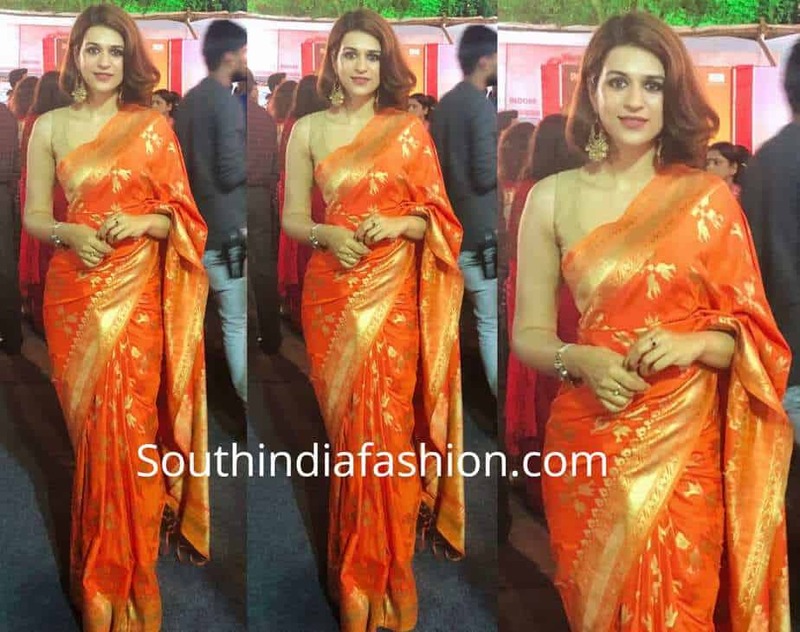 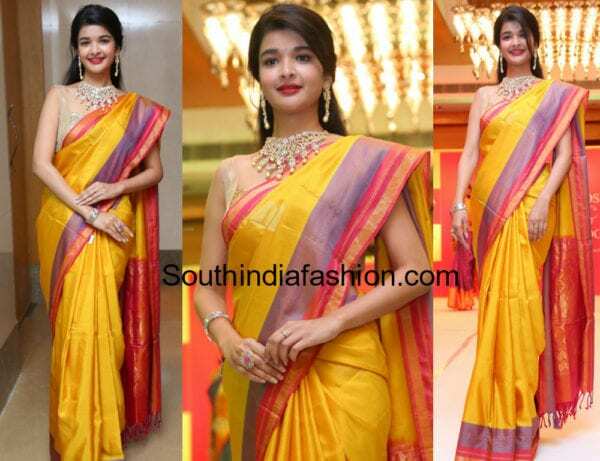 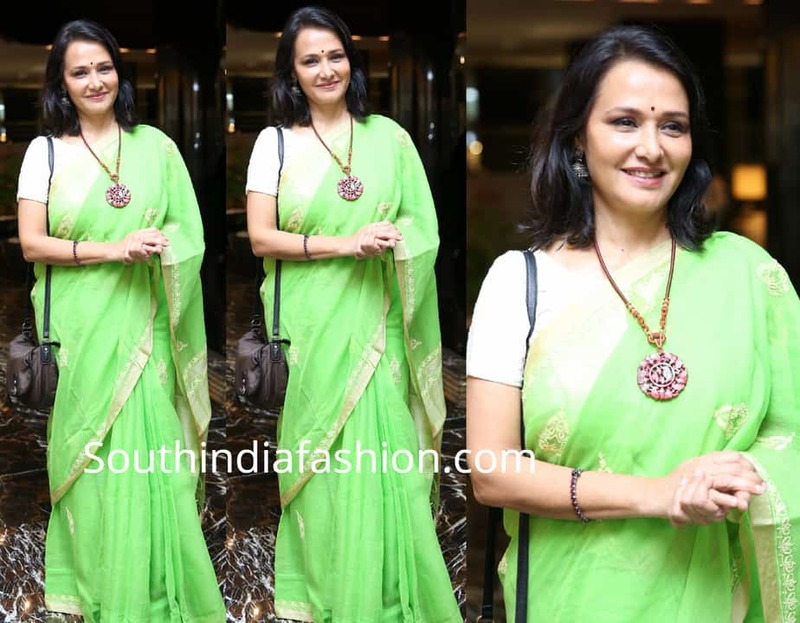 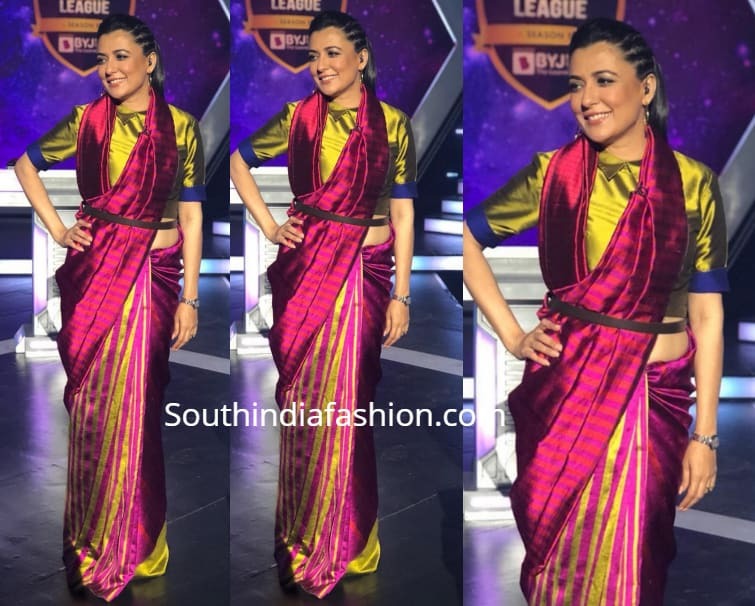 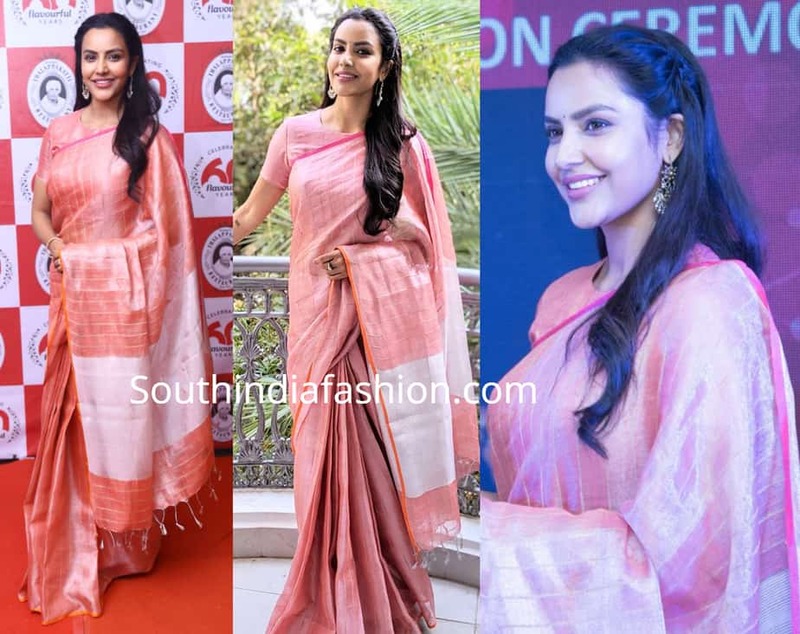 3 Contemporary Saree Looks Of Lakshmi Manchu! 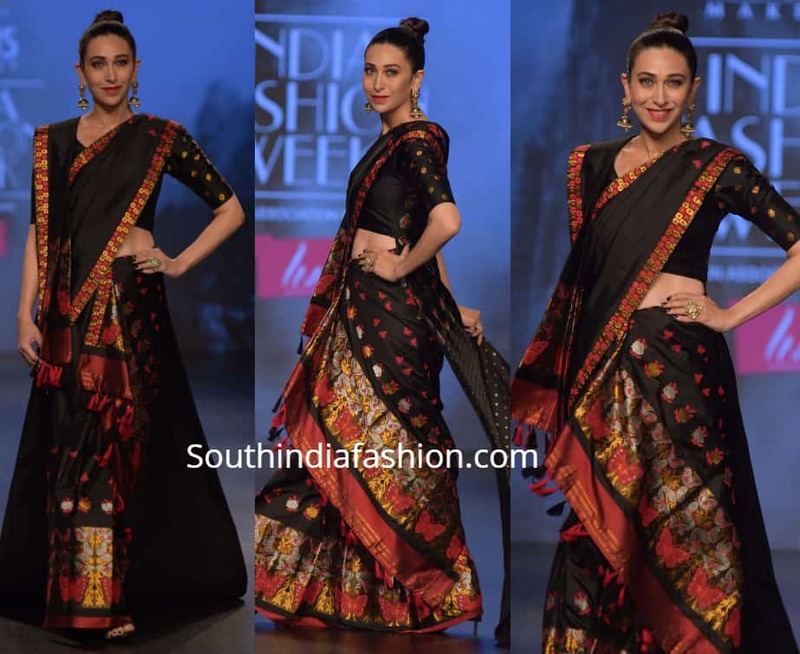 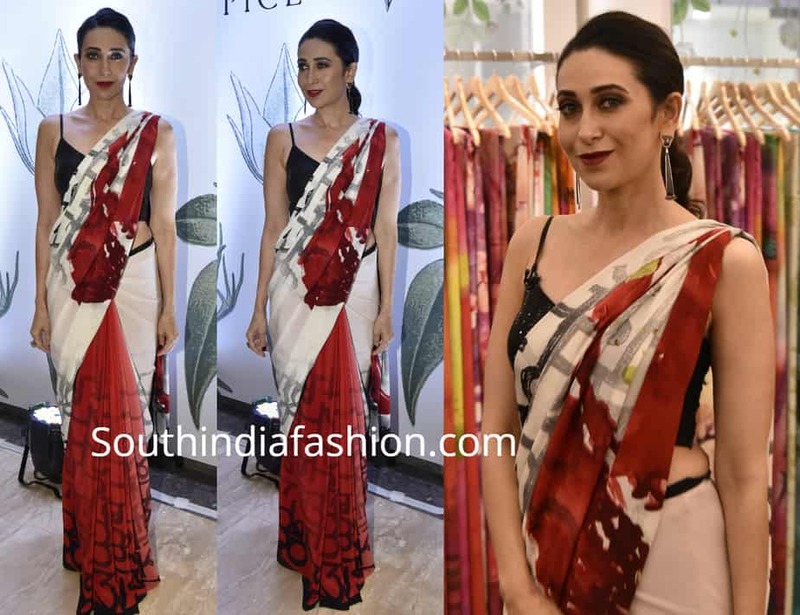 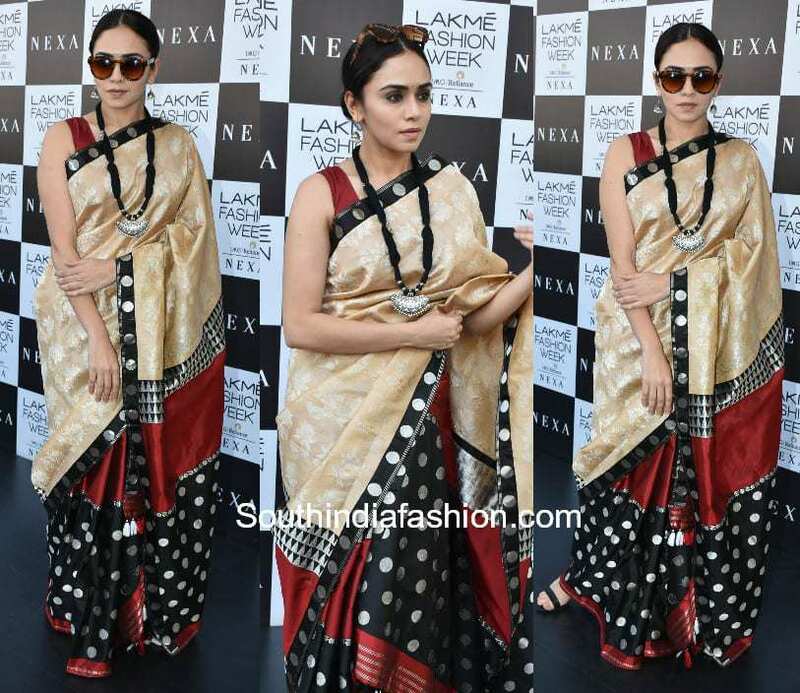 Roshni Chopra gives a modern twist to a floral saree! 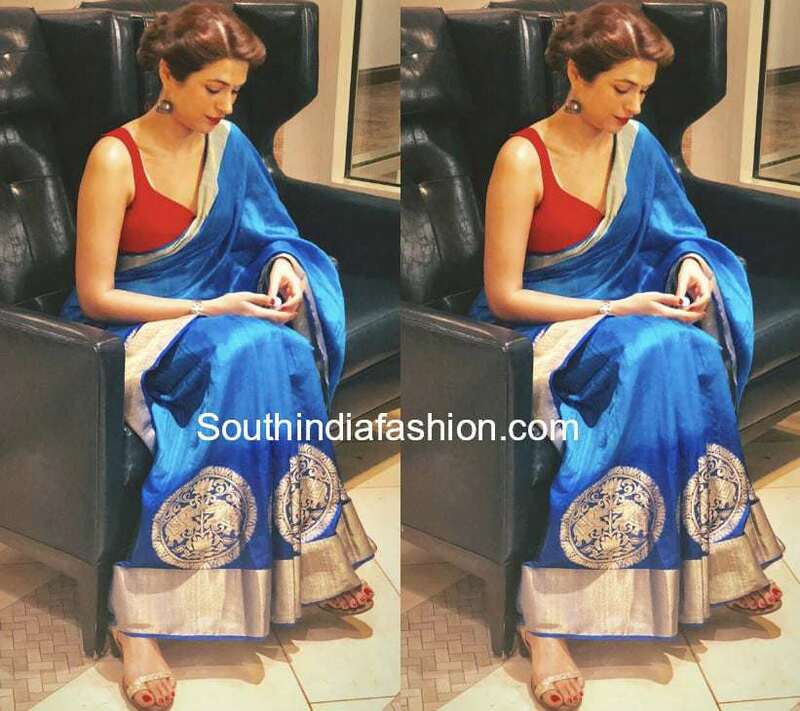 Pranitha Subhash in a white saree! 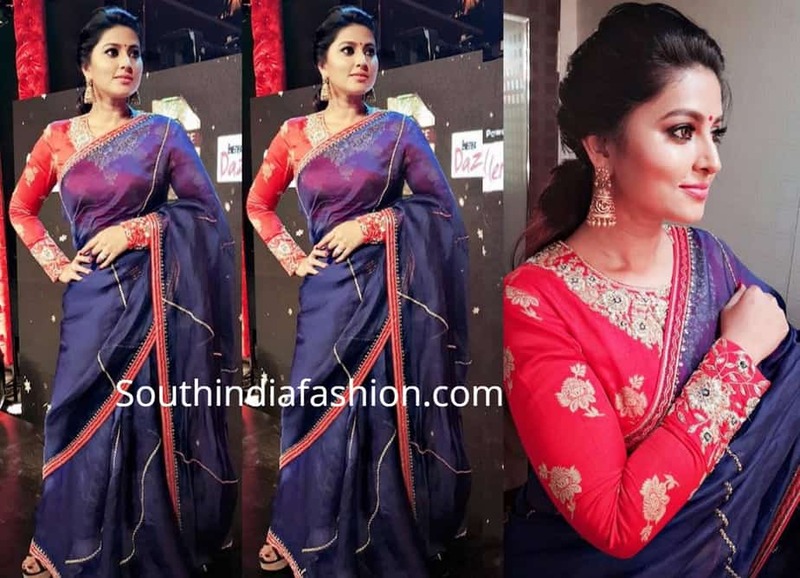 Neetu Chandra in a Blue Saree! 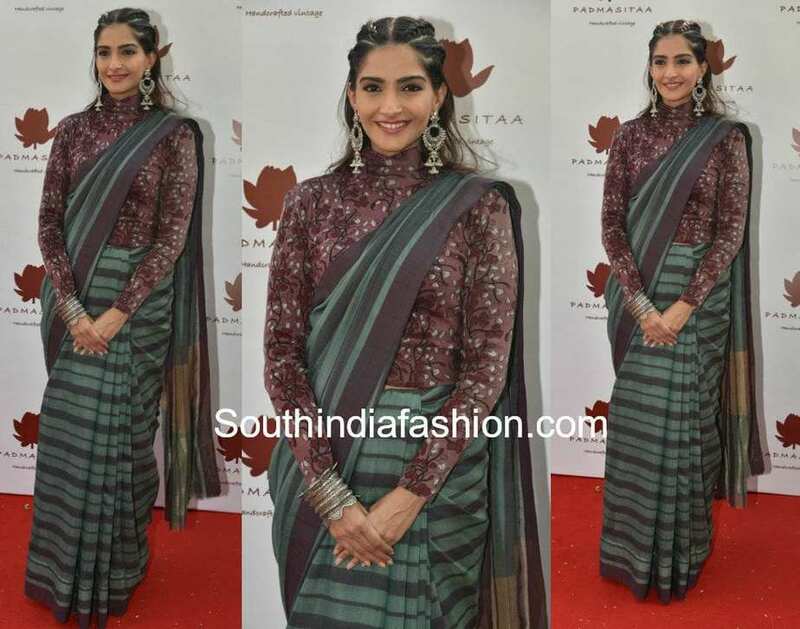 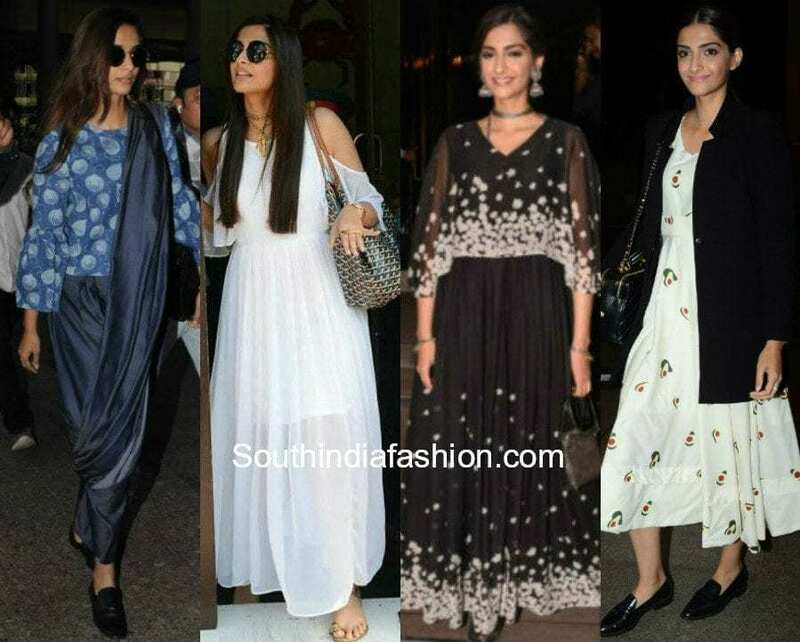 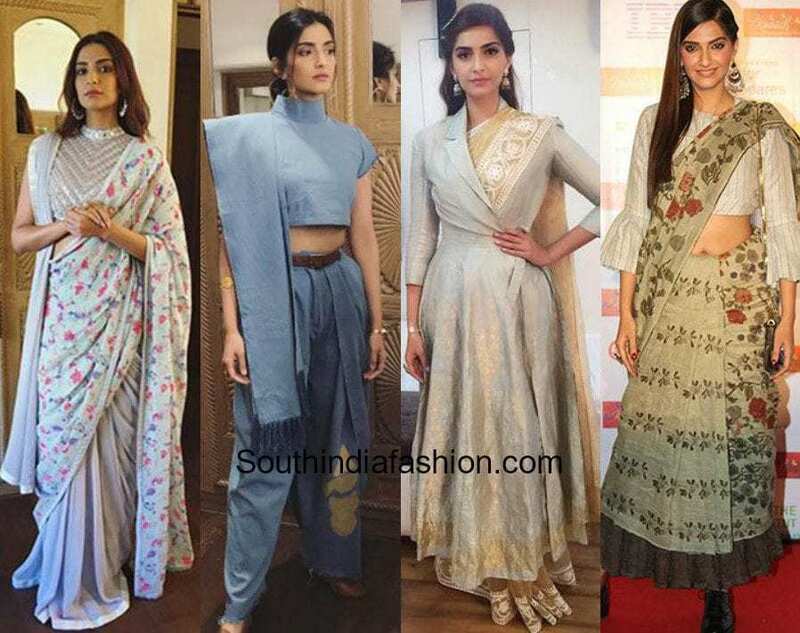 Sonam Kapoor Styles A Saree With A Twist! 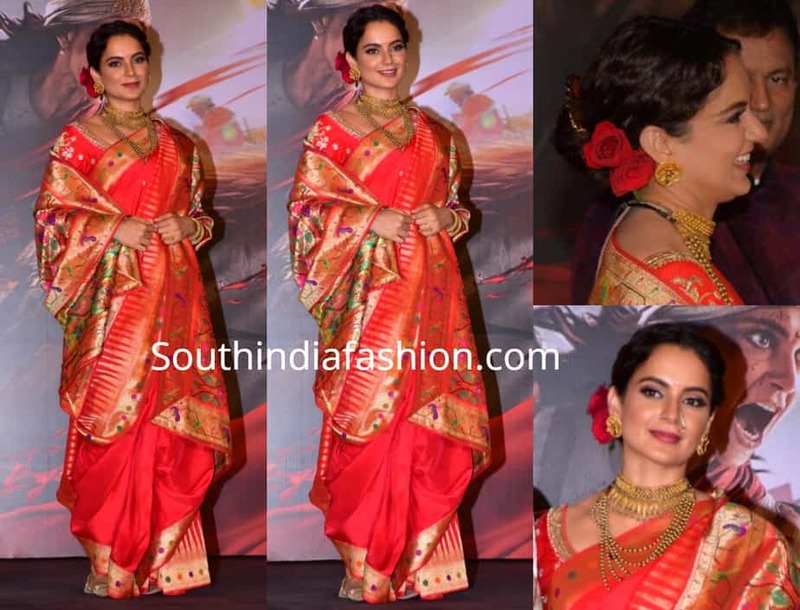 Kangana Ranaut in Via East Saree! 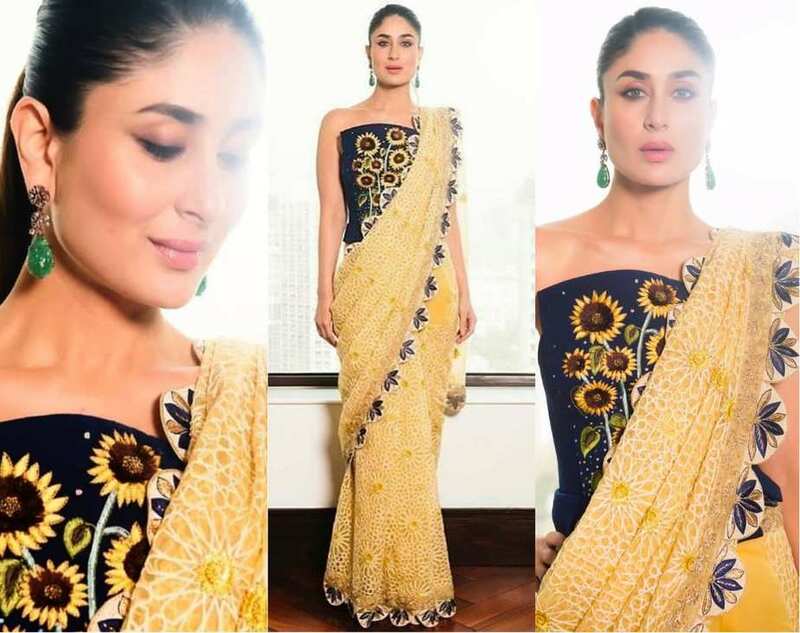 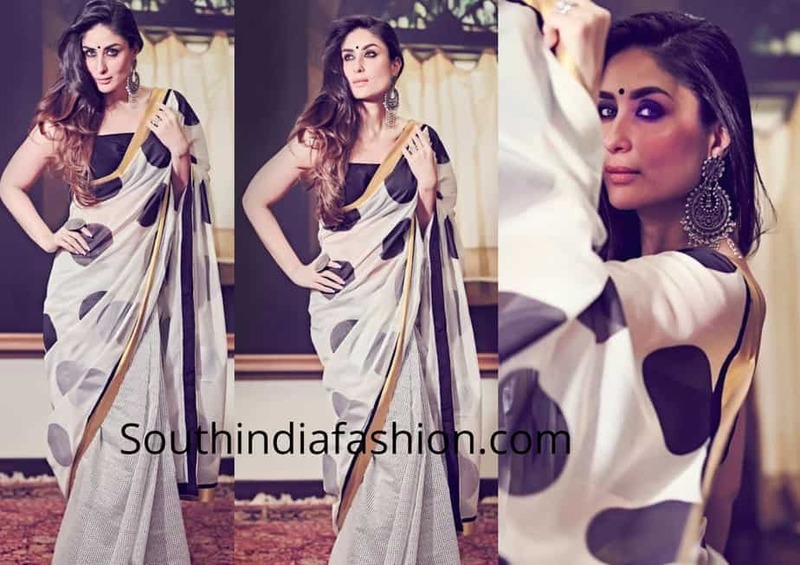 Kareena Kapoor Khan Glowing In A Hand-Embroidered Rahul Mishra Saree! 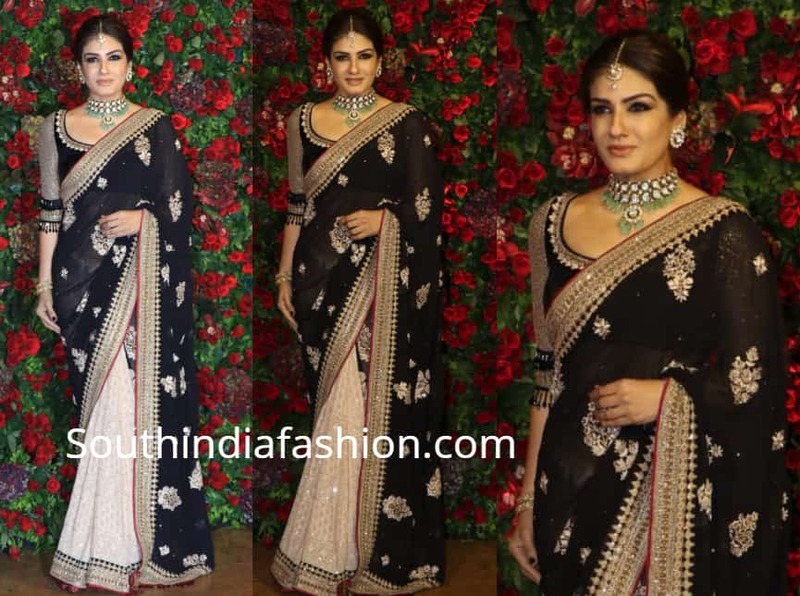 Zareen Khan in a bright traditional saree! 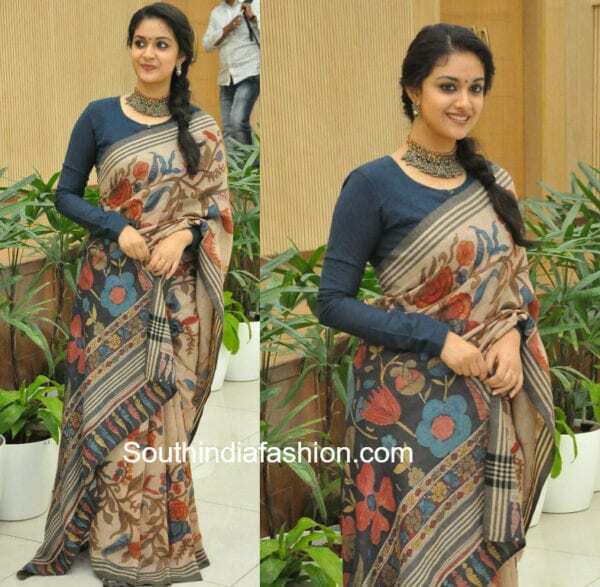 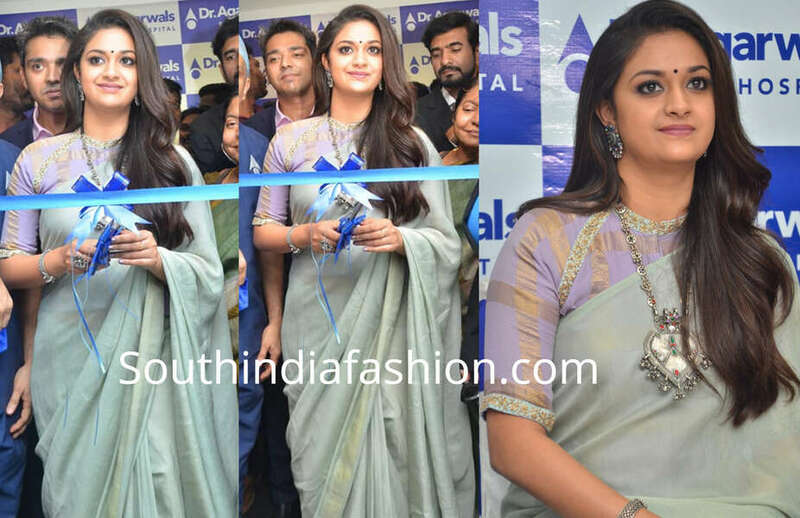 Keerthy Suresh looks ethereal in a handloom Kalamkari saree! 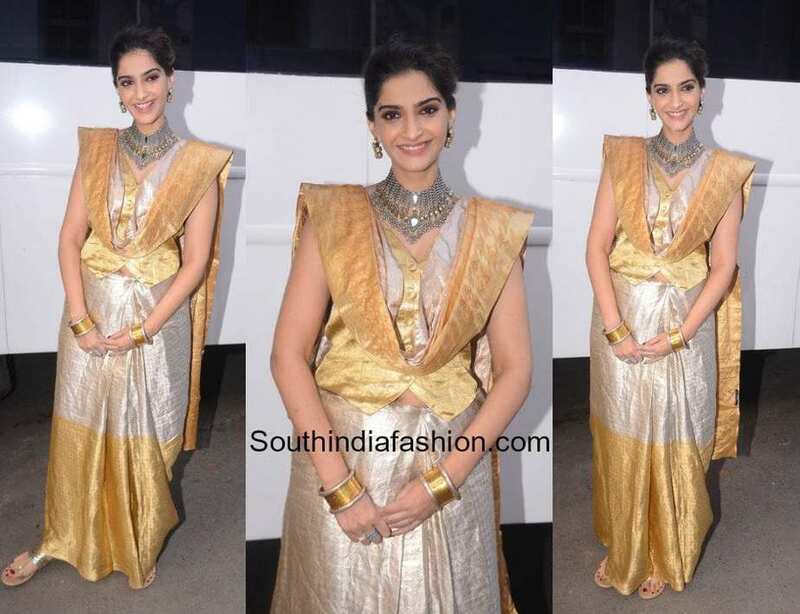 Sonam Kapoor in a ripped denim saree! 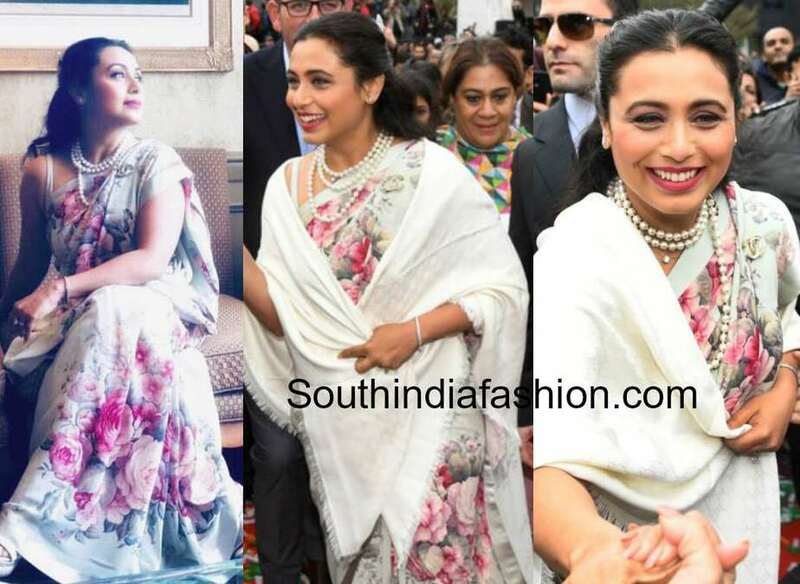 Mahie Gill in a floral saree! 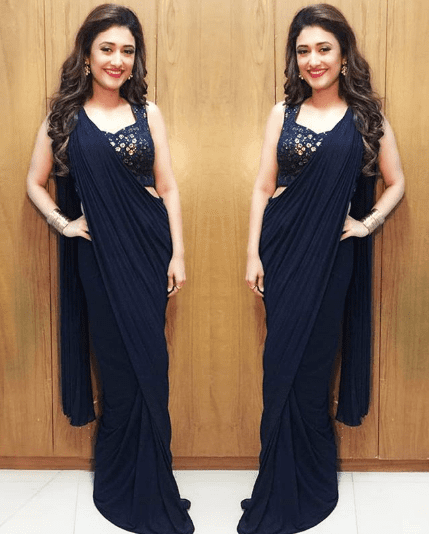 Ragini Khanna in a black cocktail saree! 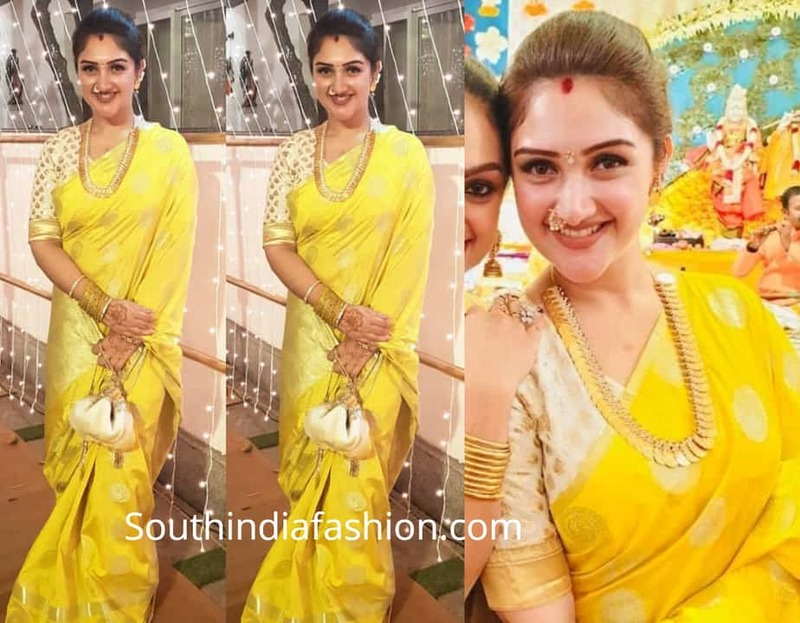 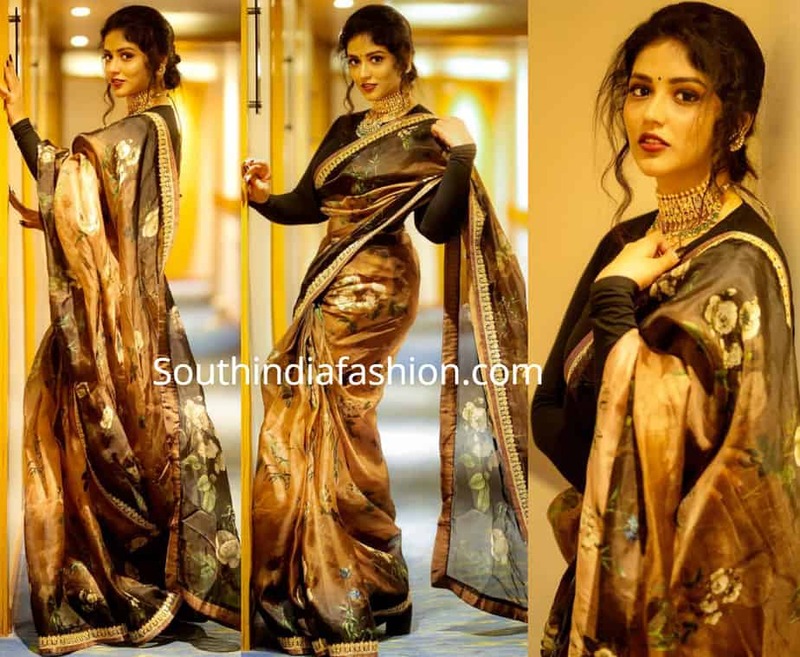 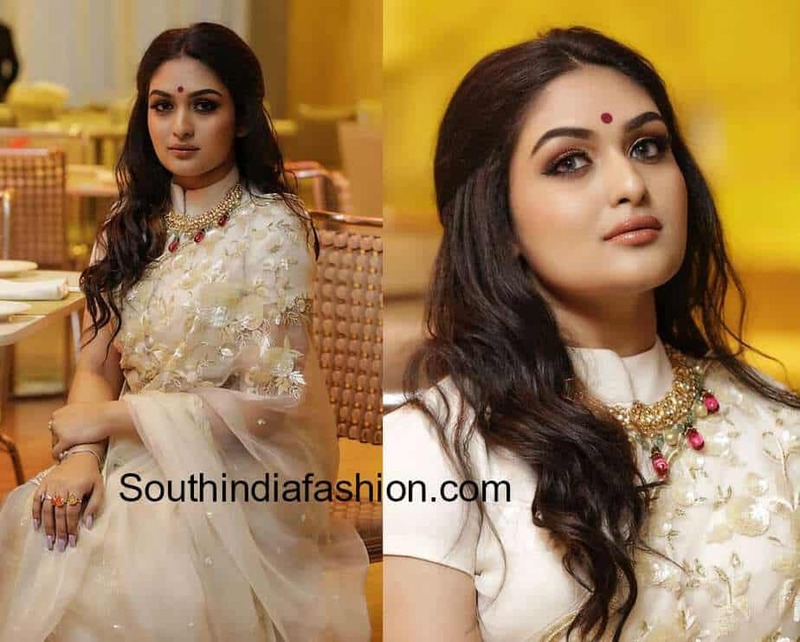 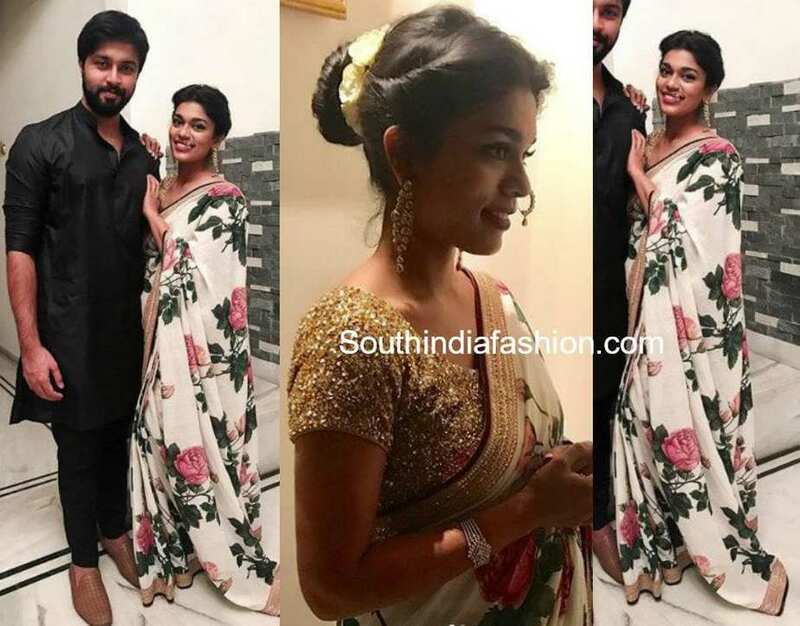 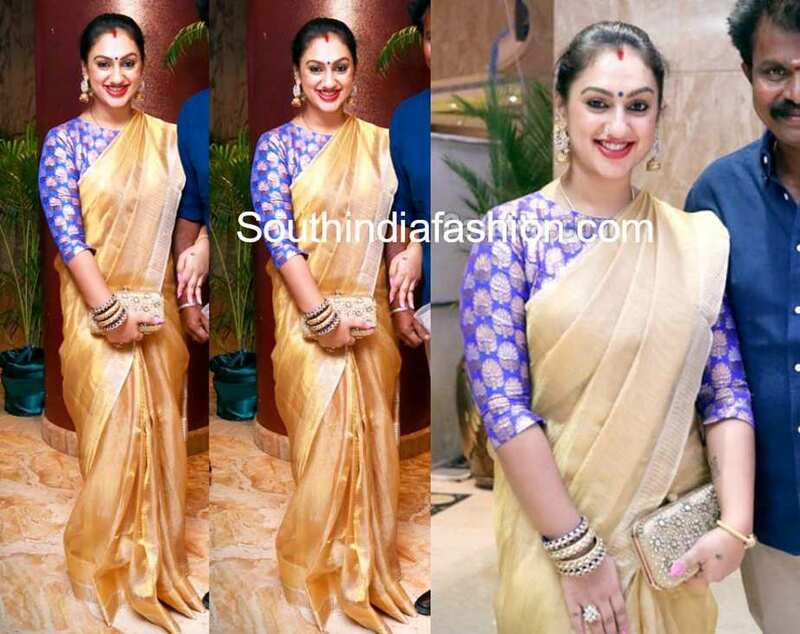 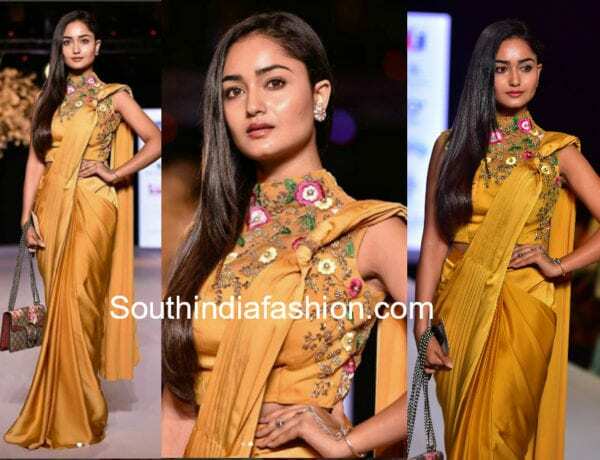 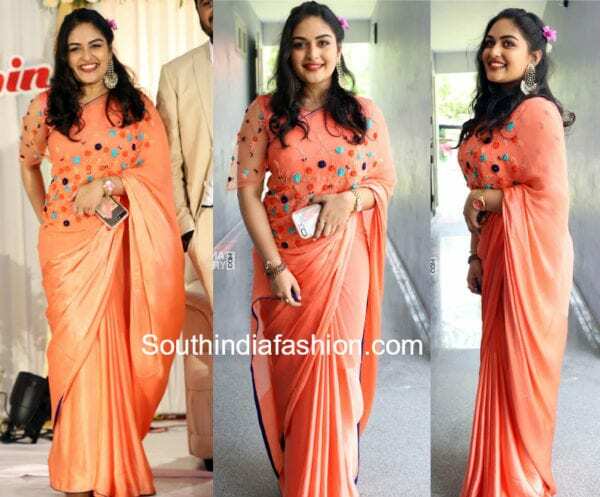 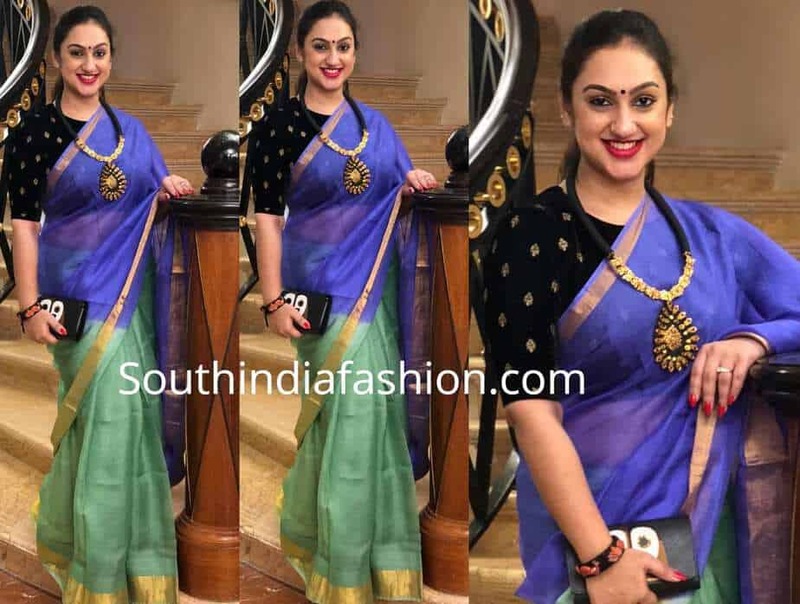 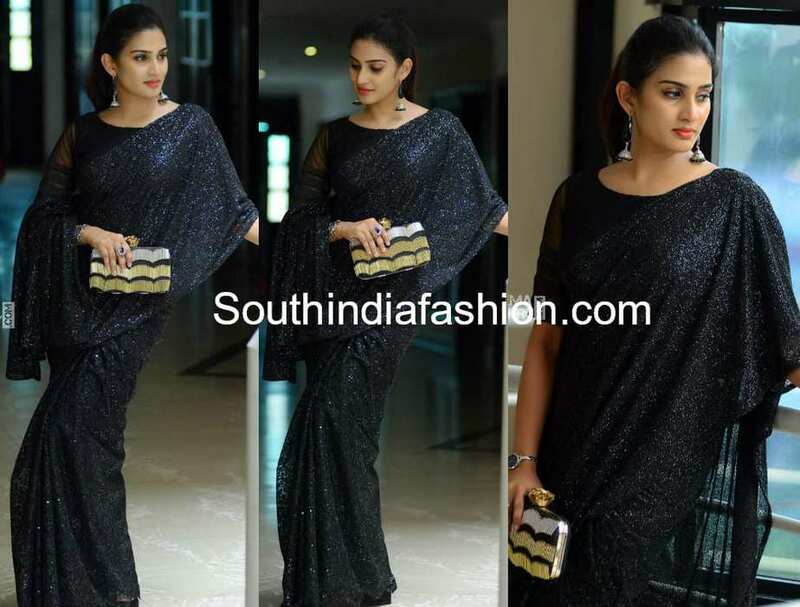 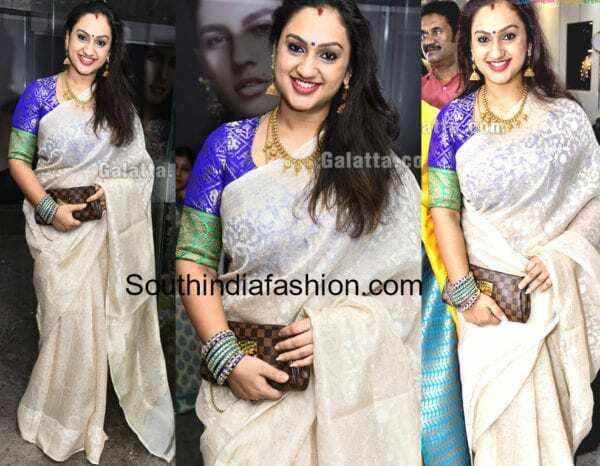 Prayaga Martin’s Saree Style Is Perfect For A Day Wedding! 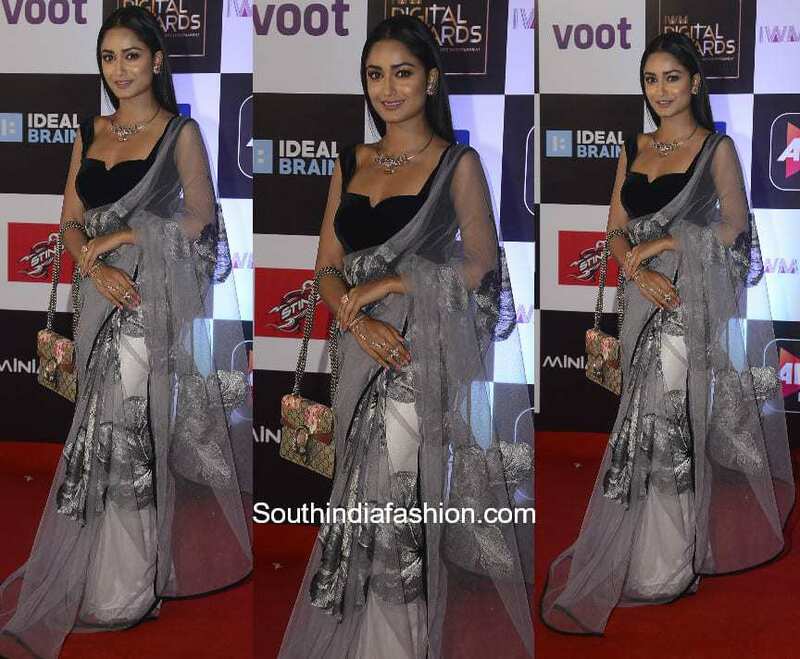 Hina Khan’s stylish saree look for Rajiv Gandhi Excellence Awards! 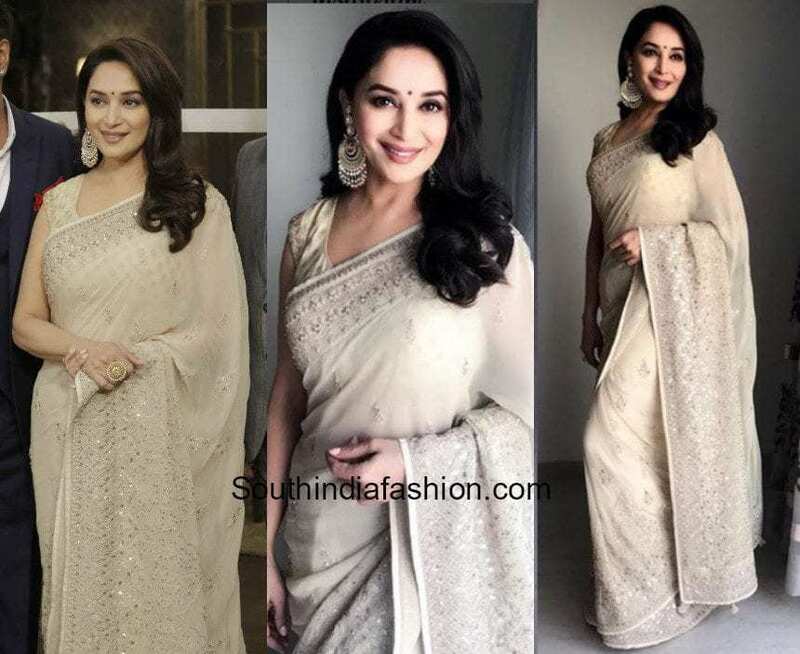 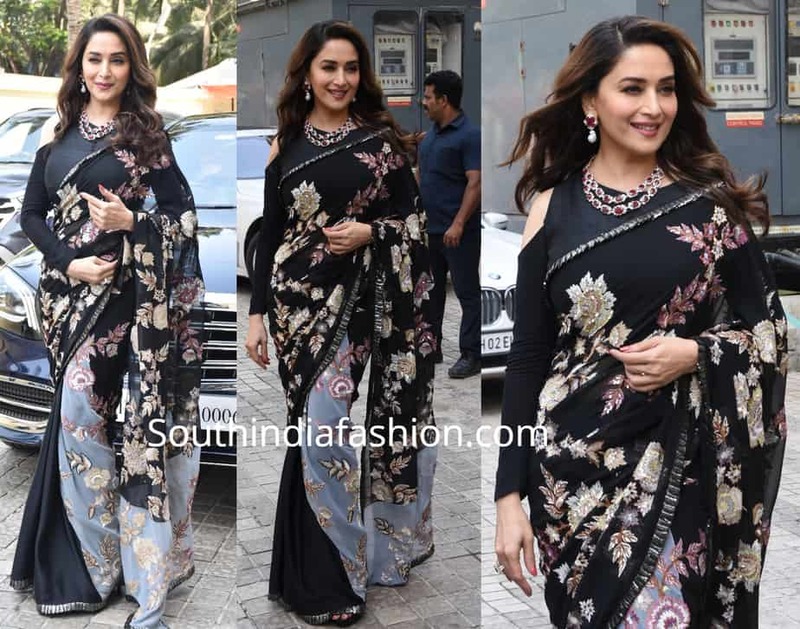 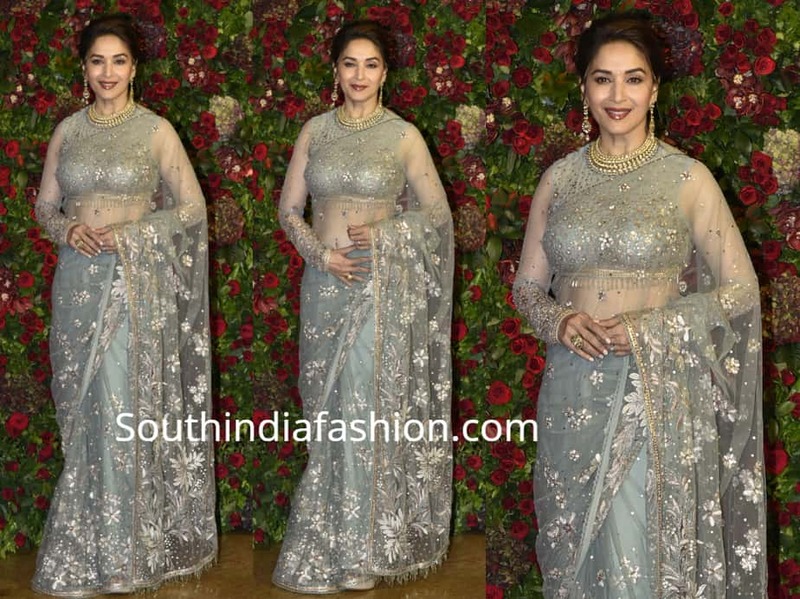 Madhuri Dixit’s Dreamy Saree from Jade by Monica and Karishma! 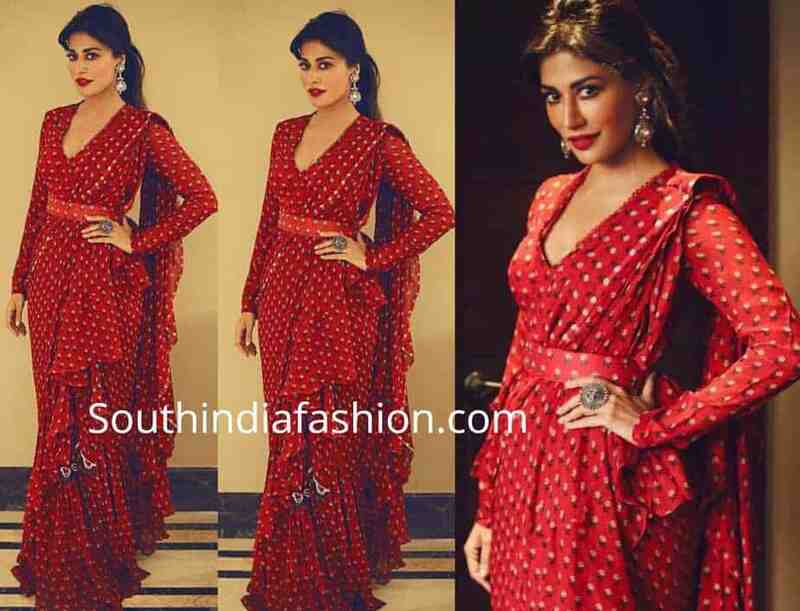 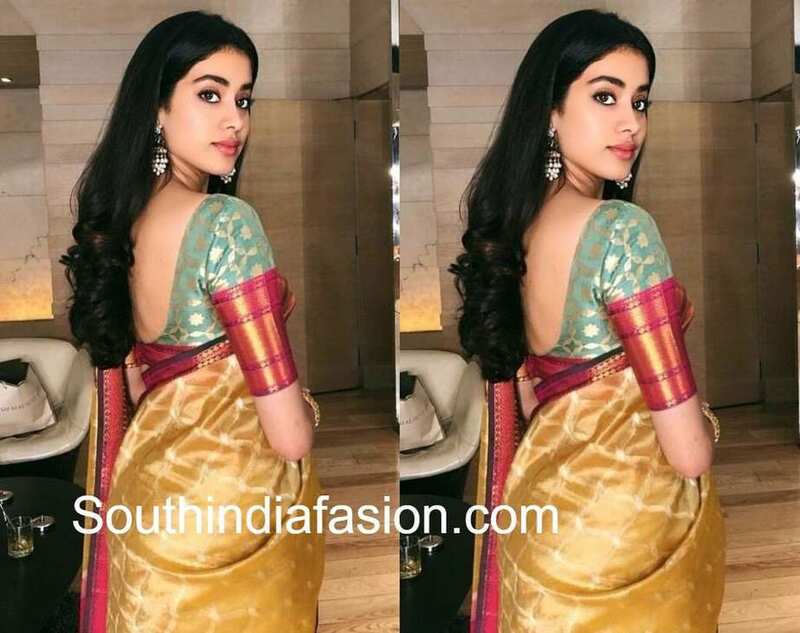 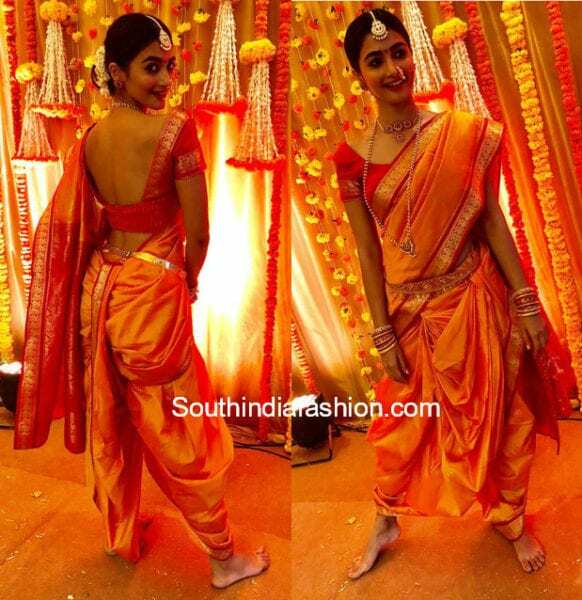 Pooja Hegde looks like the perfect Maharashtrian bridesmaid at her best friend wedding! 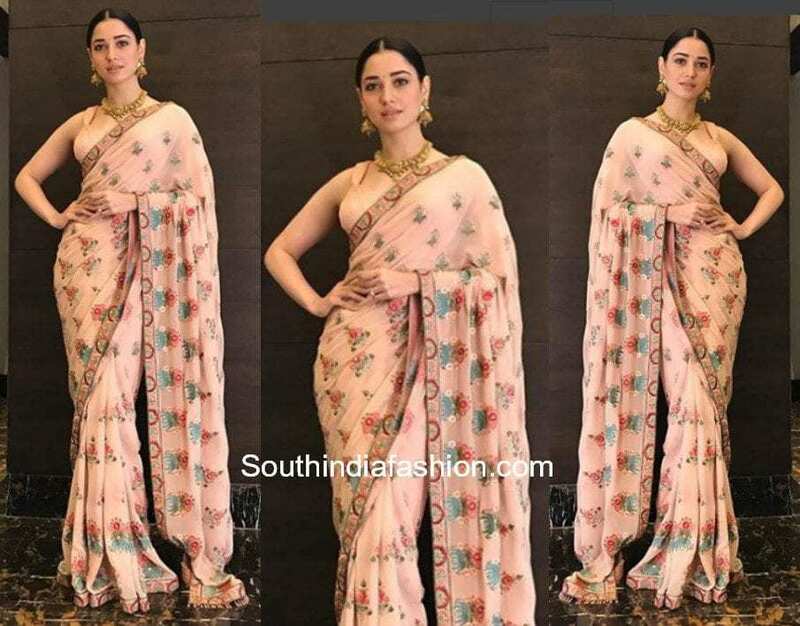 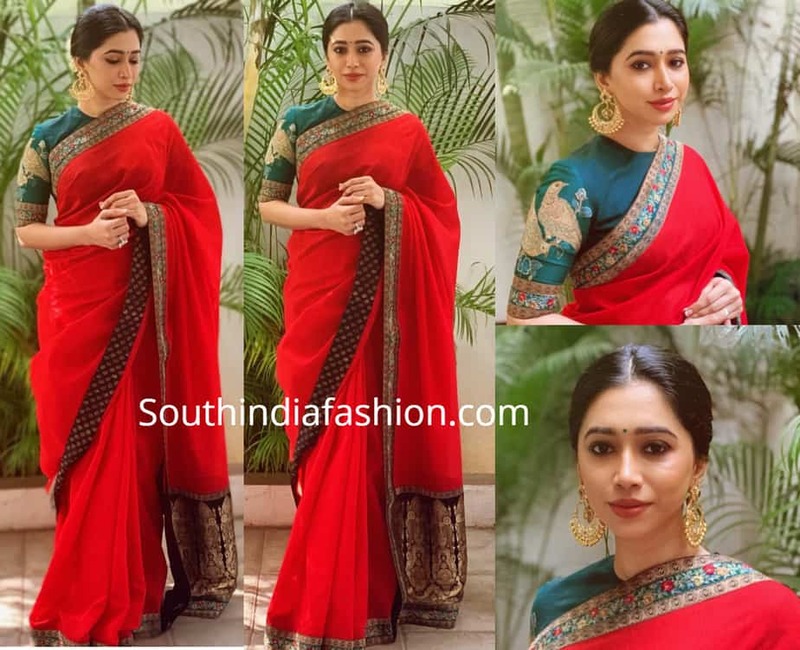 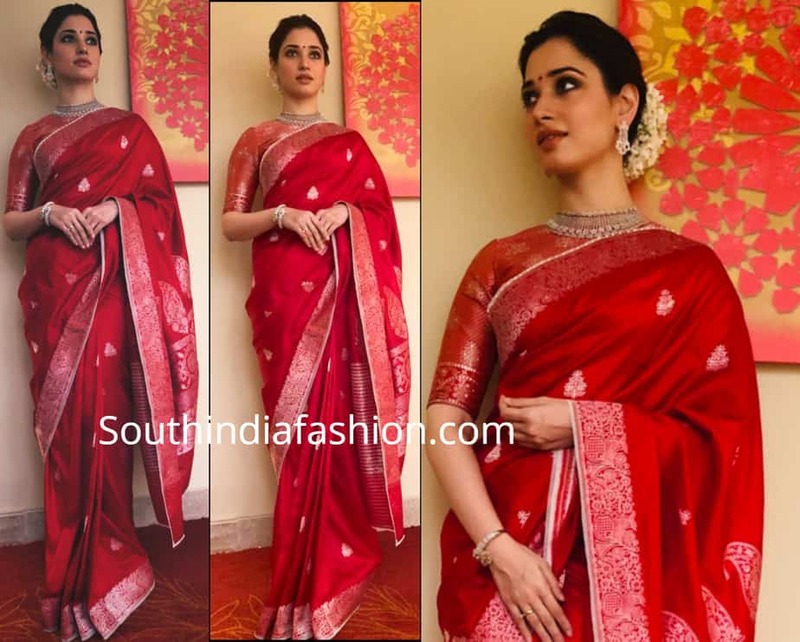 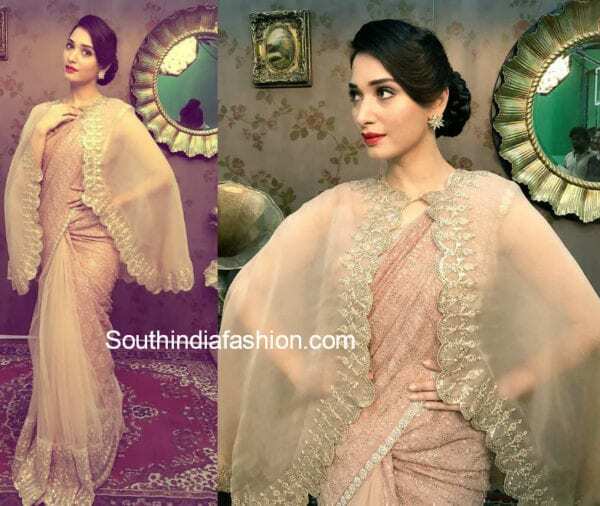 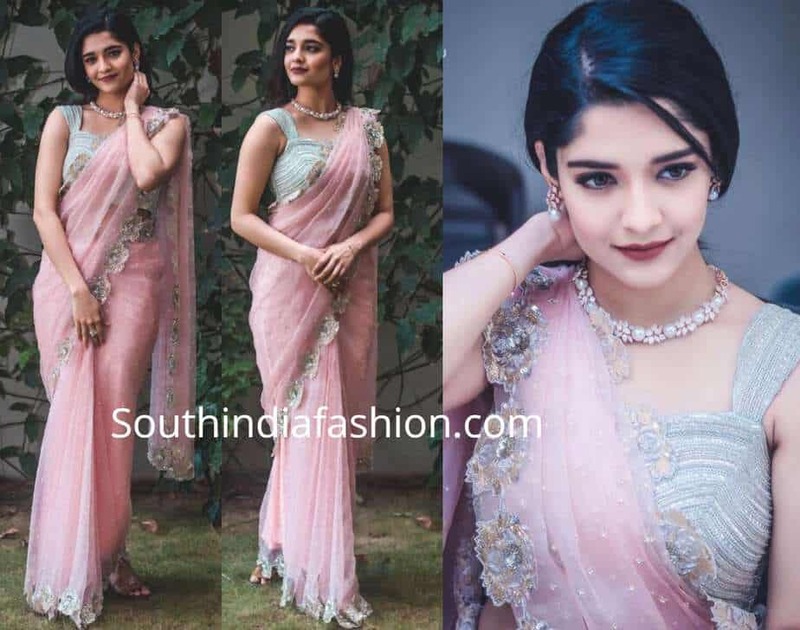 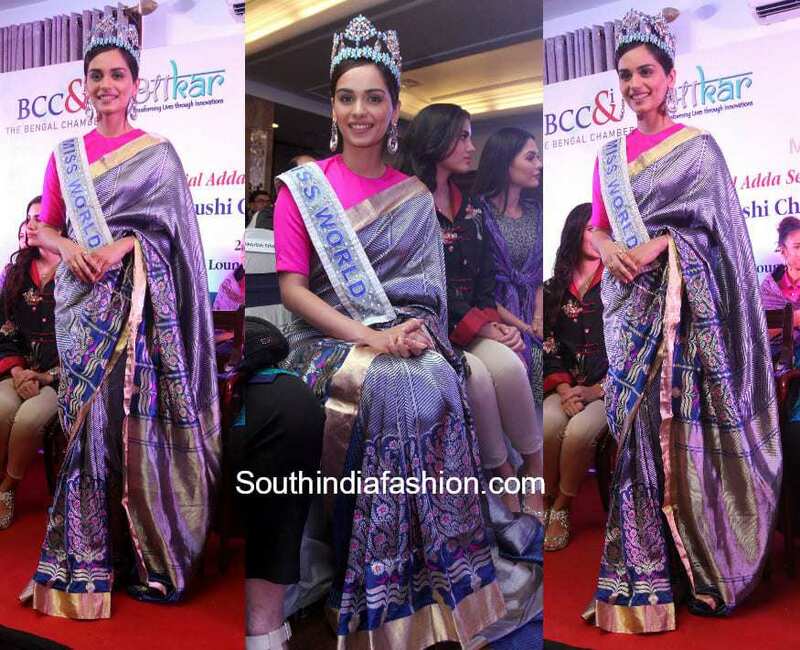 Two Gorgeous Saree Looks of Tamannaah Bhatia! 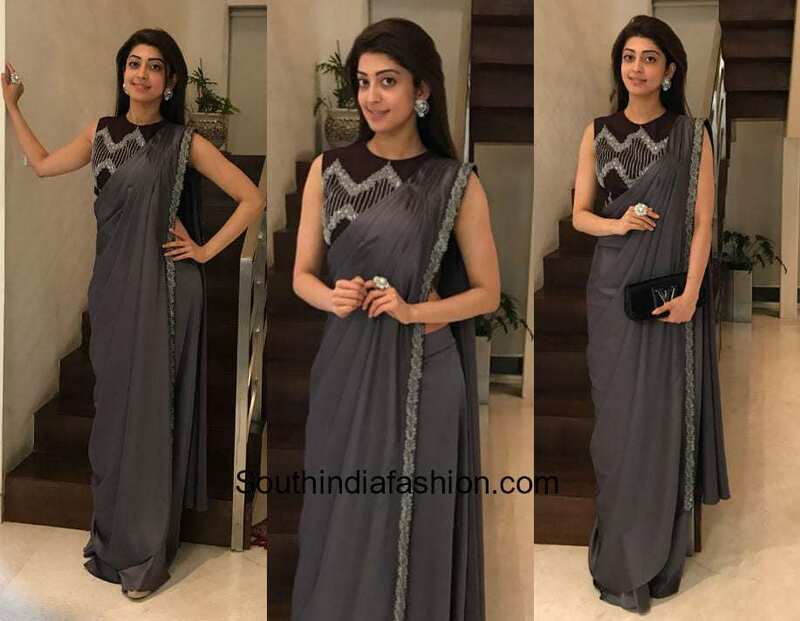 Nikki Galrani turns heads in a contemporary saree drape! 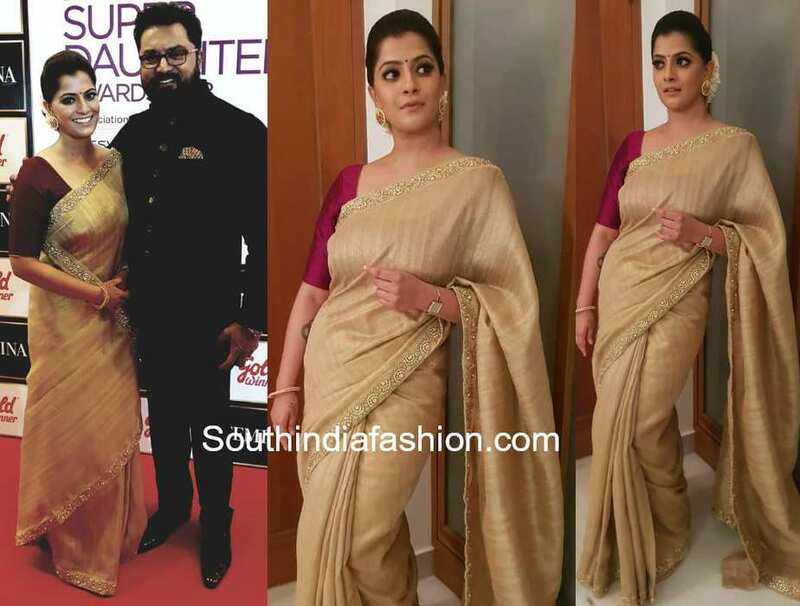 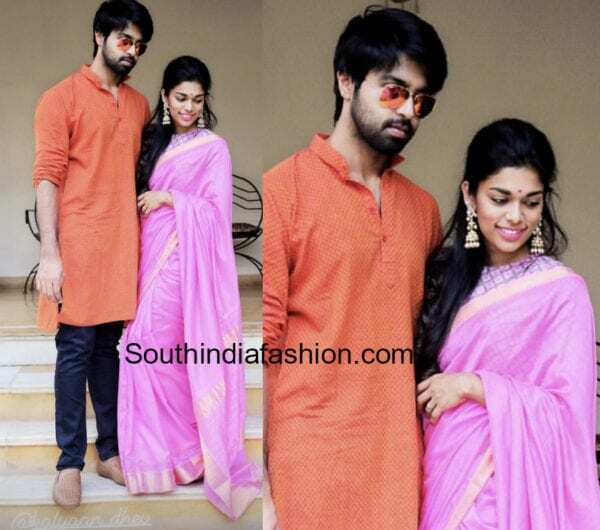 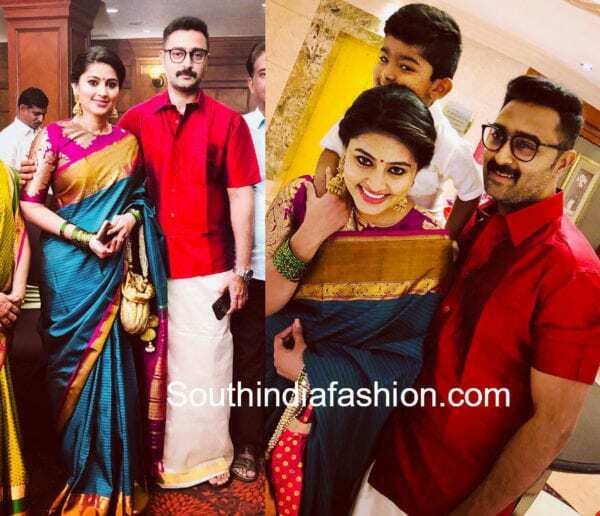 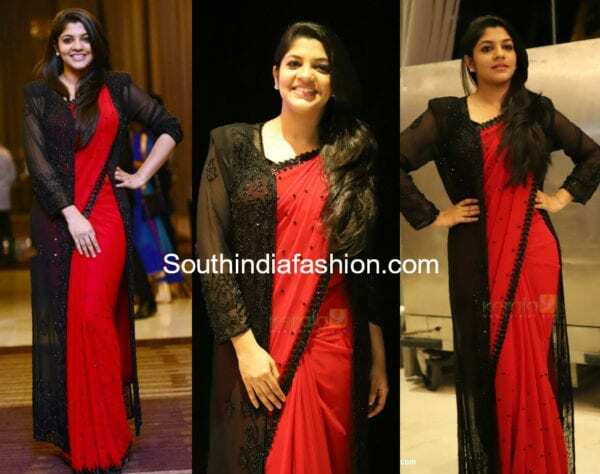 Aparna Balamurali stuns in a red saree with long jacket! 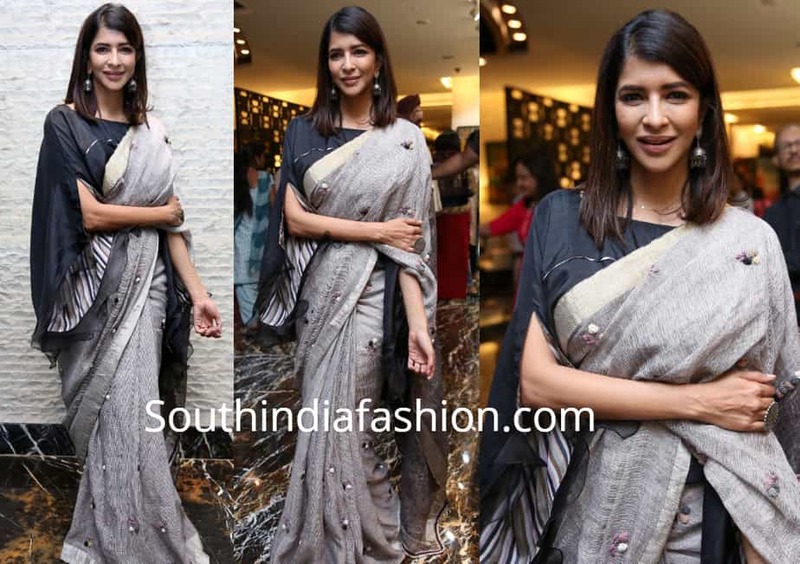 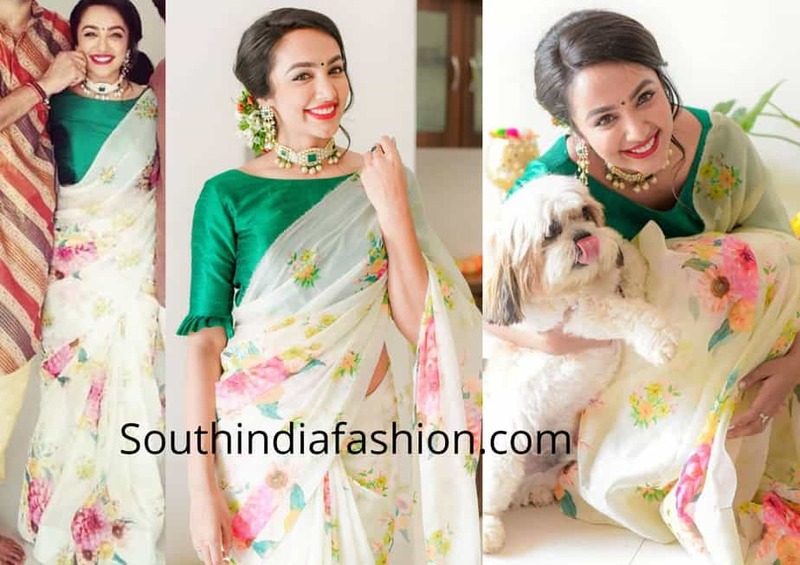 Lakshmi Manchu Shows Us 3 Ways To Style A Saree! 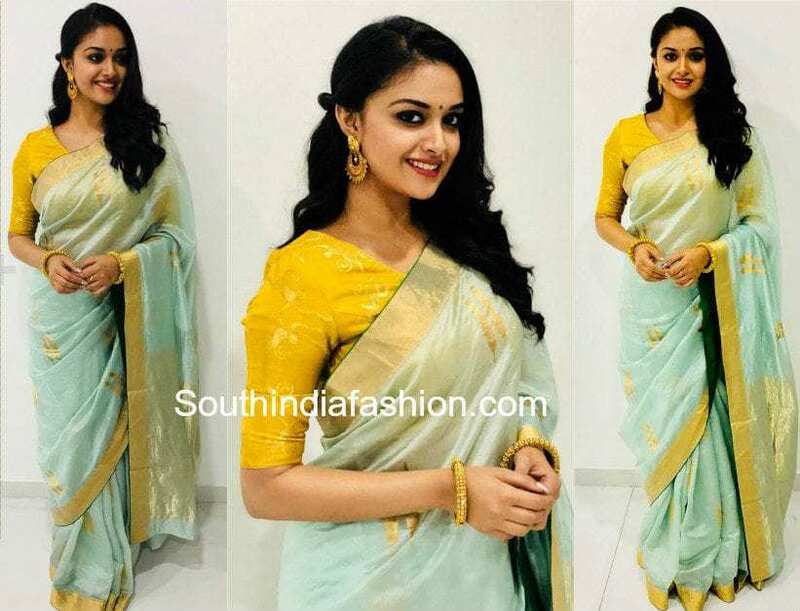 Keerthy Suresh looks ethereal in Singhanias traditional saree! 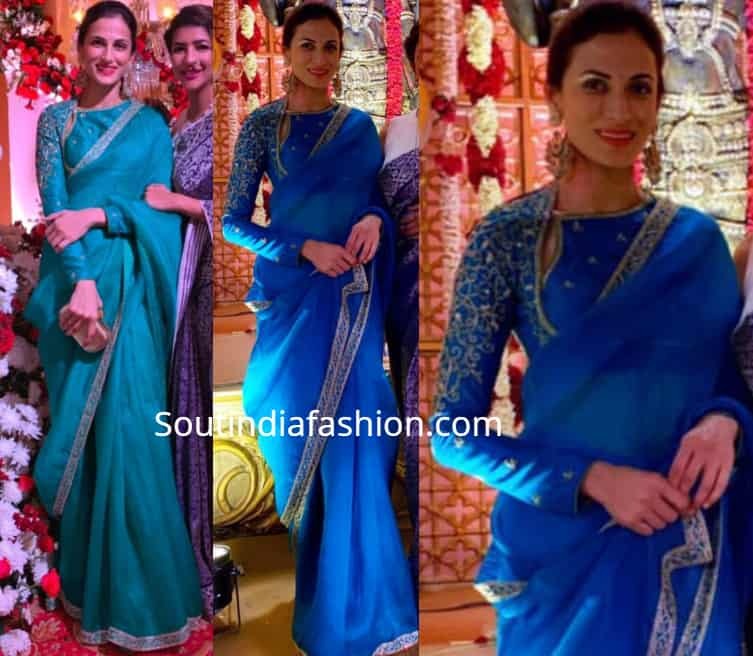 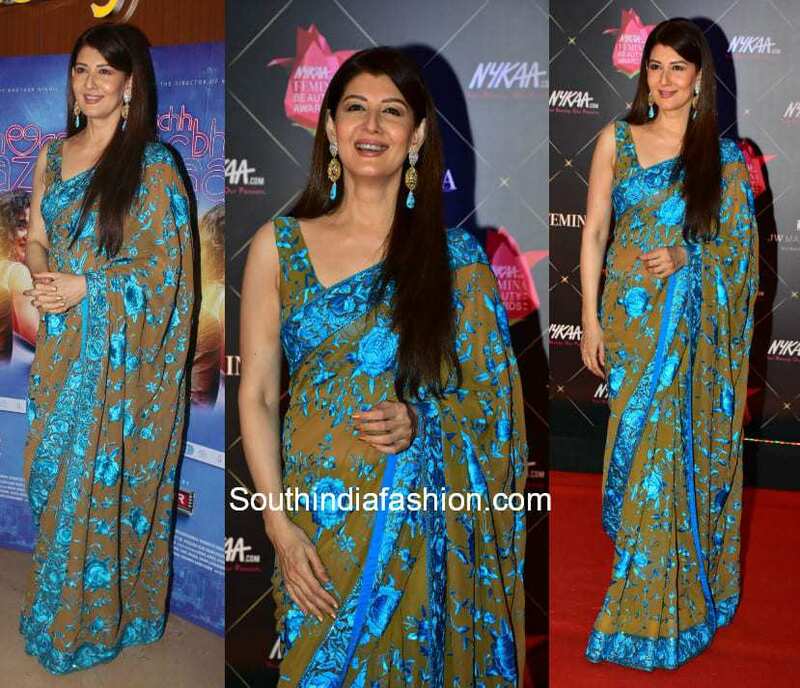 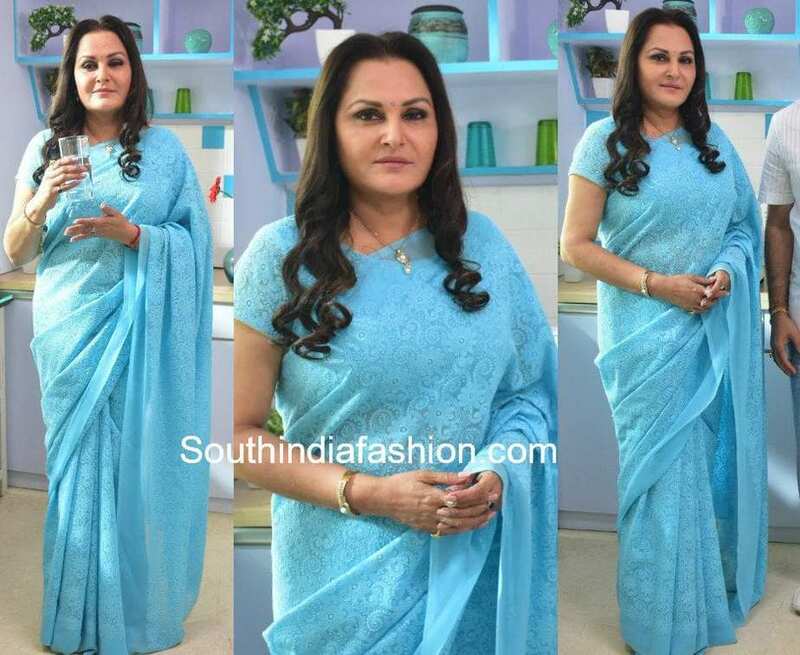 Sonali Bendre In This Blue Saree Will Make You Beat Your Monday Blues! 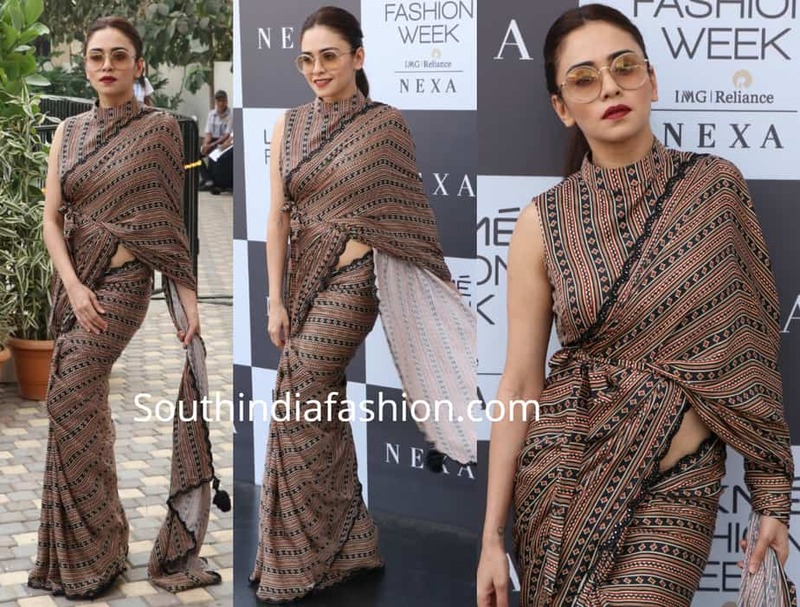 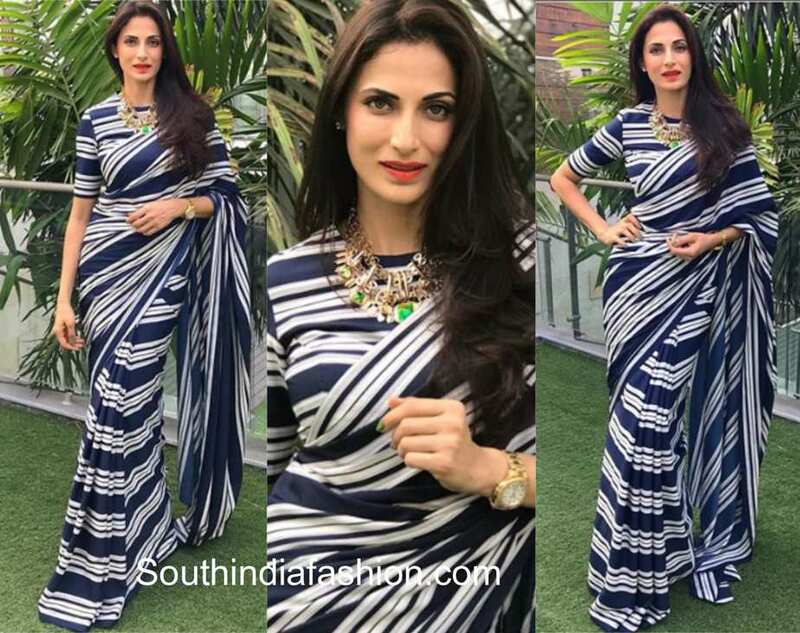 Shilpa Reddy Makes A Statement With Bold Striped Saree! 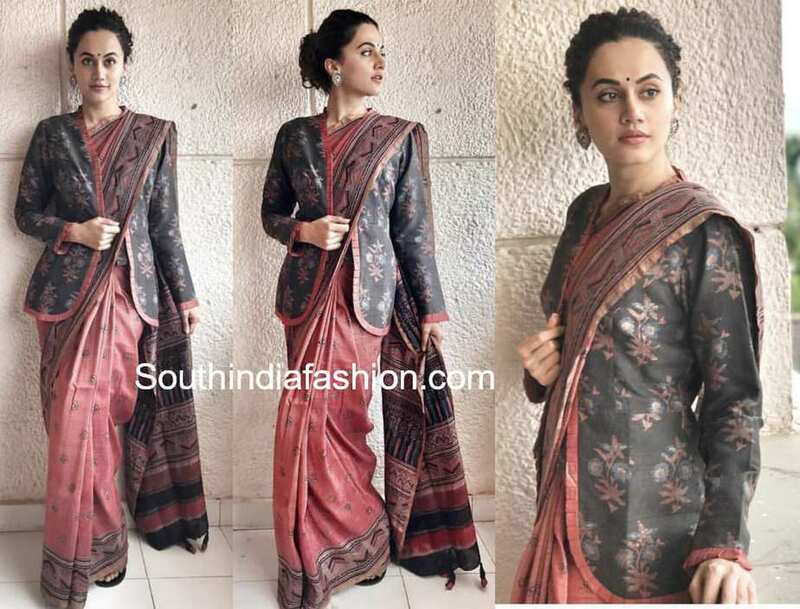 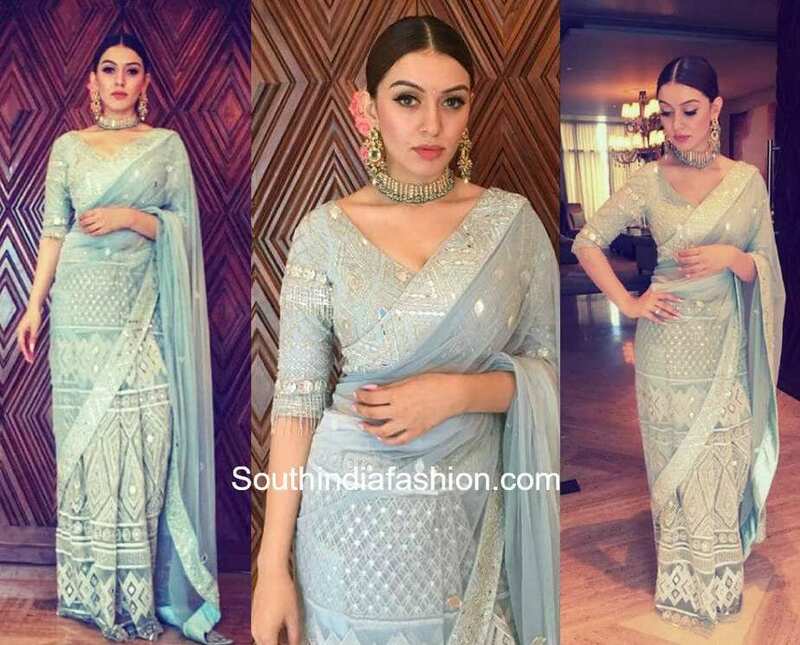 Taapsee Pannu’s Saree Style Will Give You Fashion Goals! 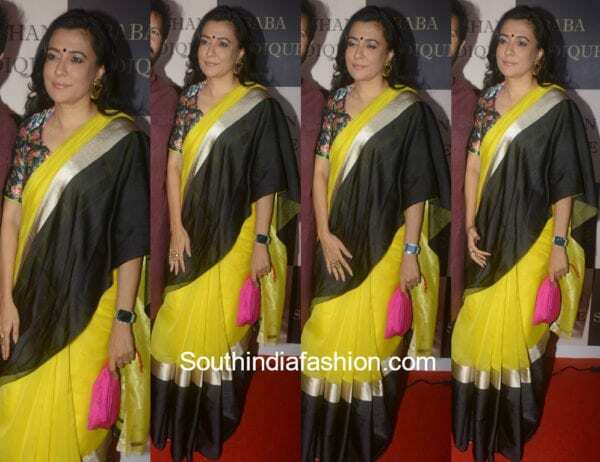 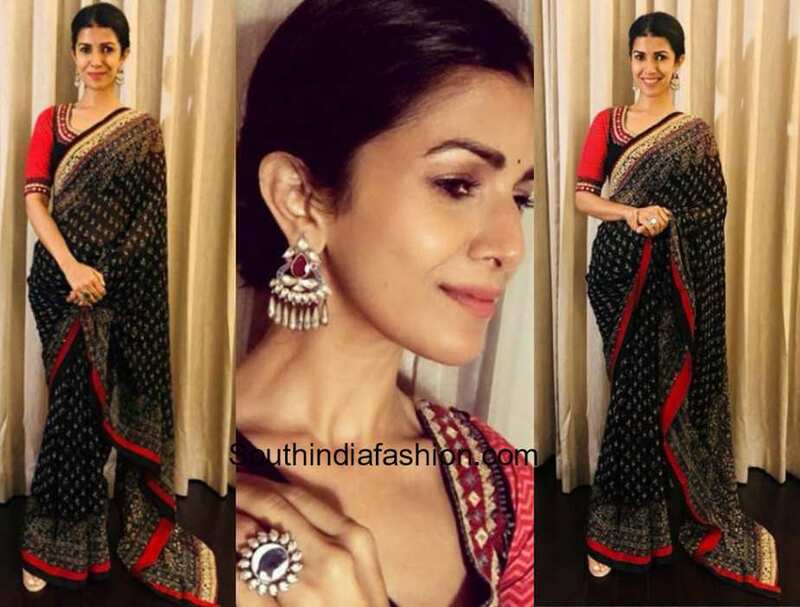 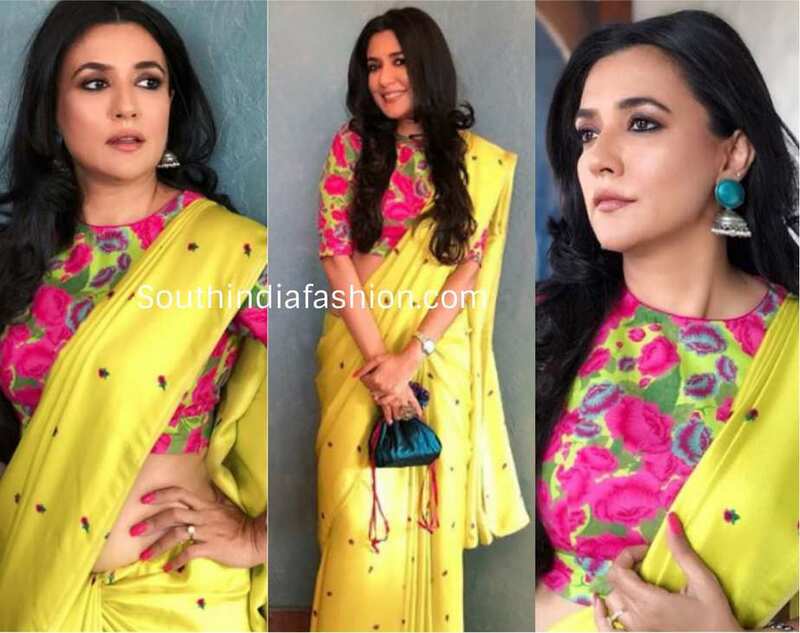 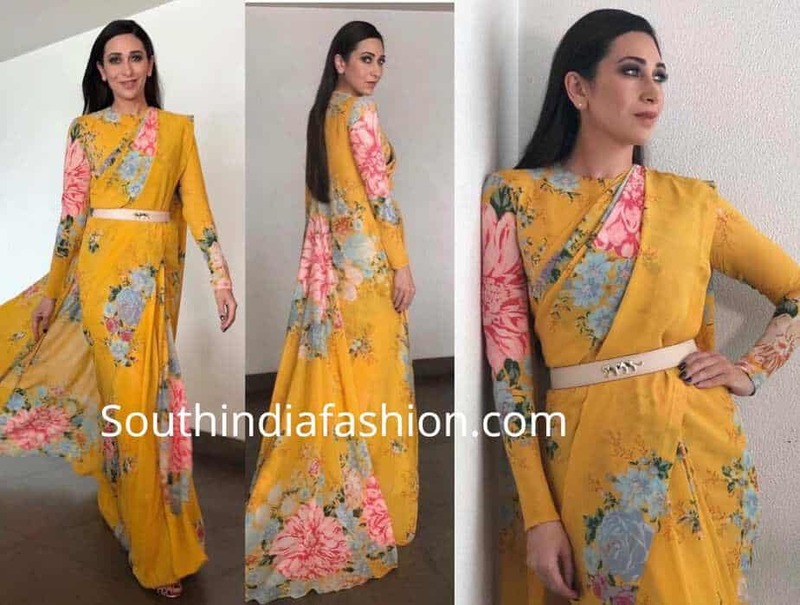 Mini Mathur’s Raw Mango Saree Will Brighten Up Your Day! 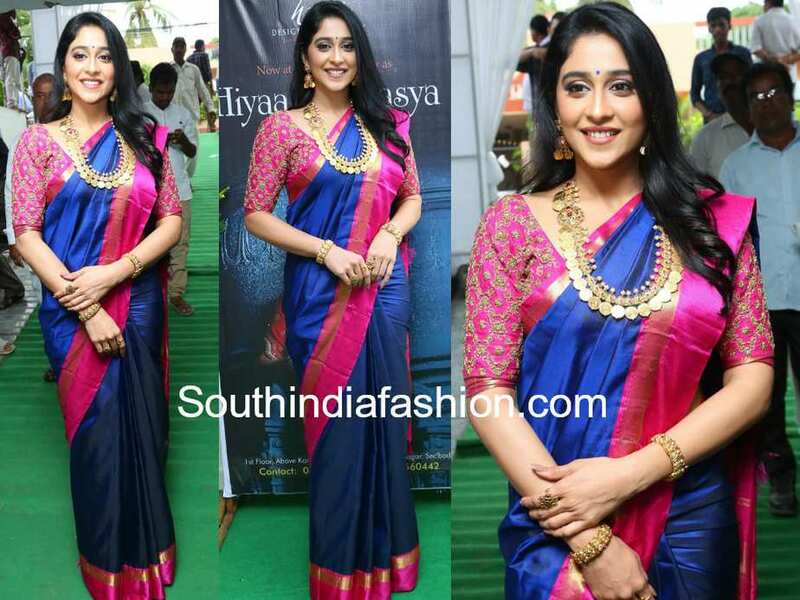 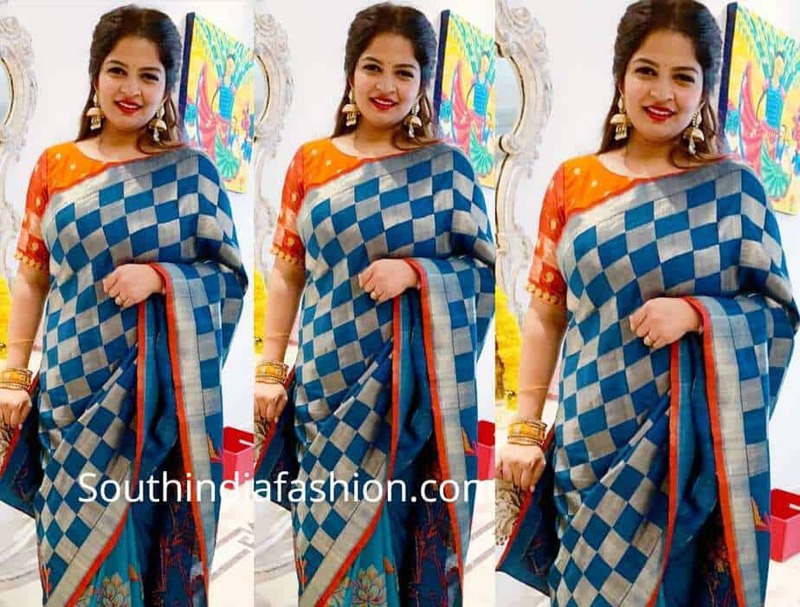 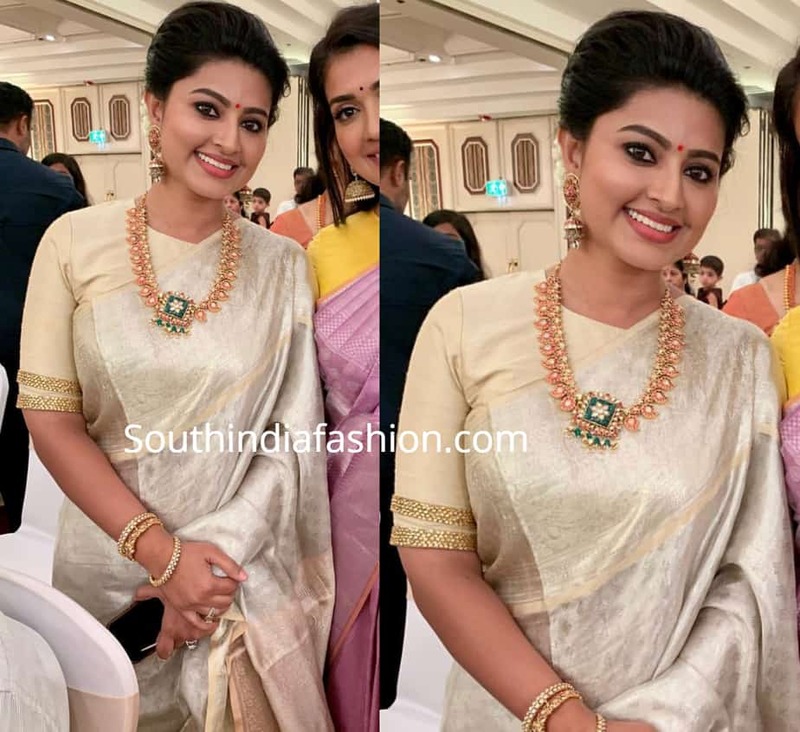 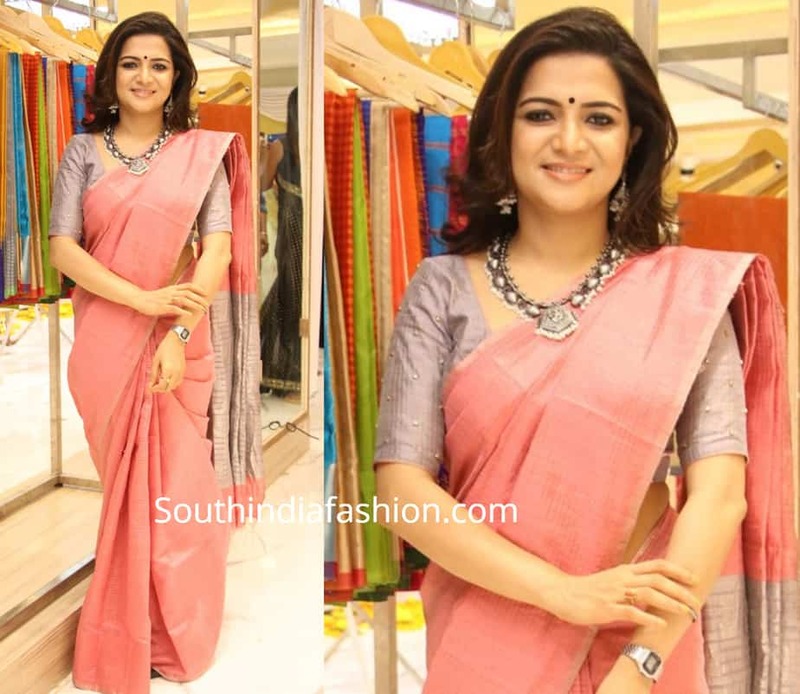 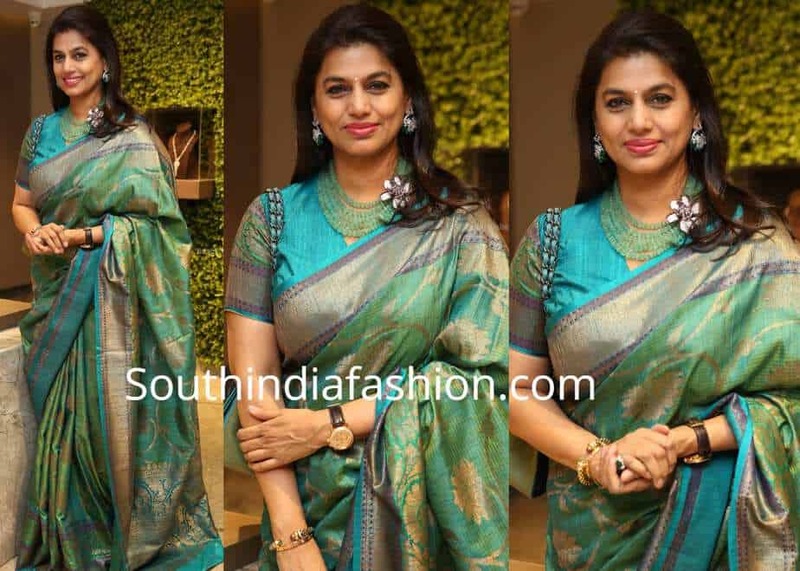 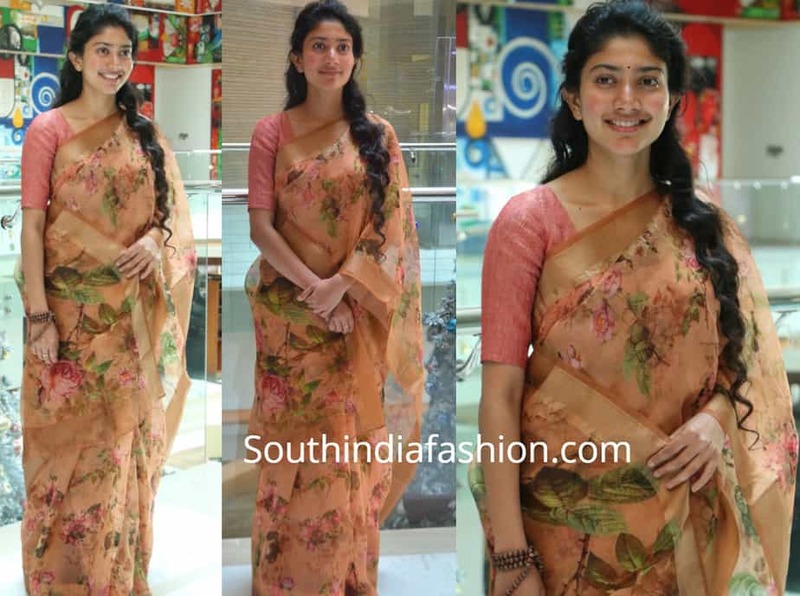 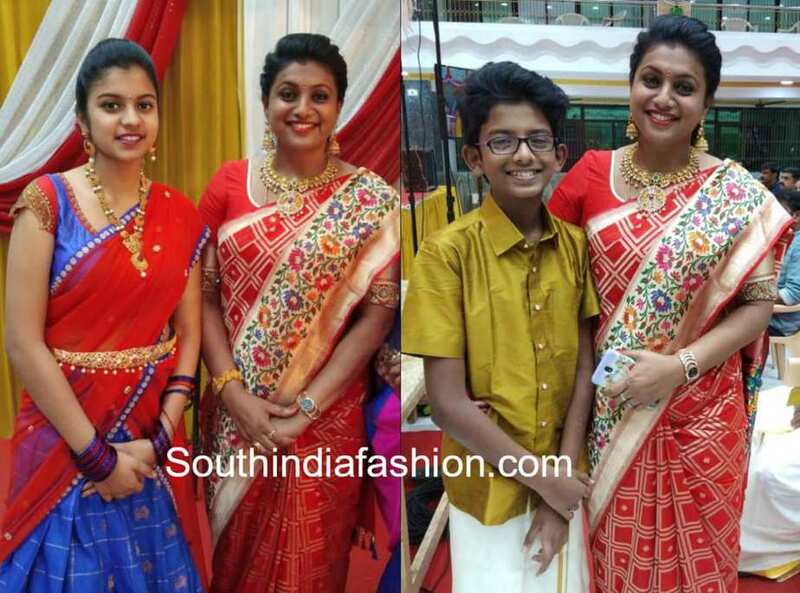 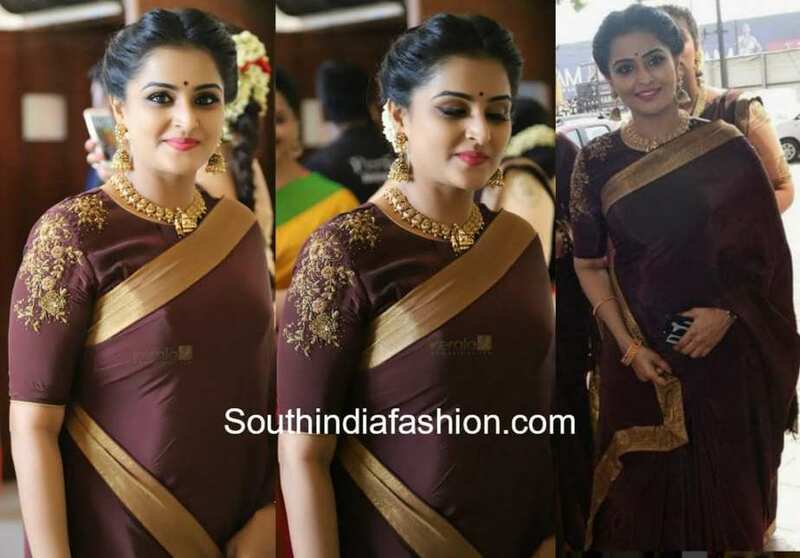 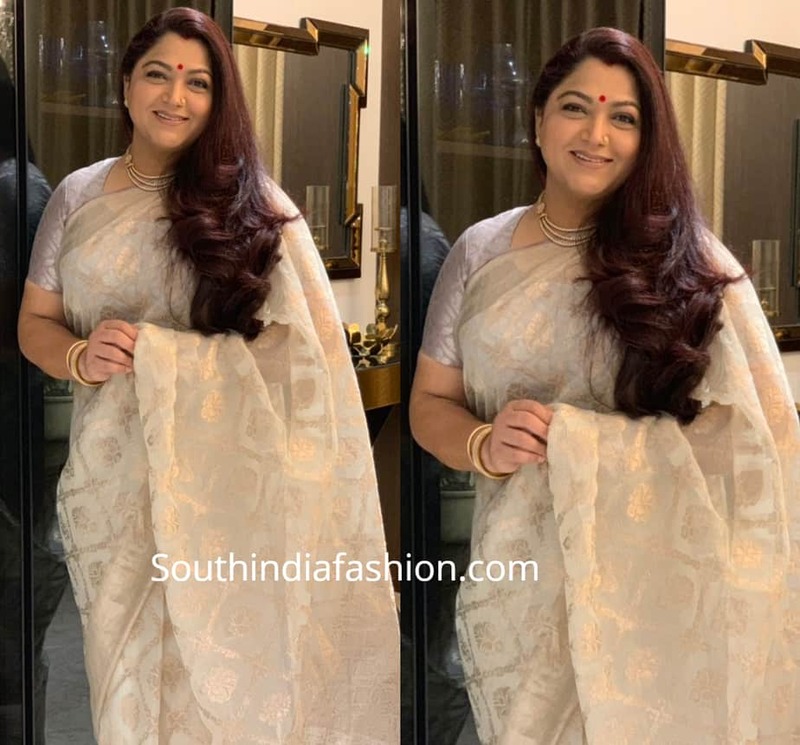 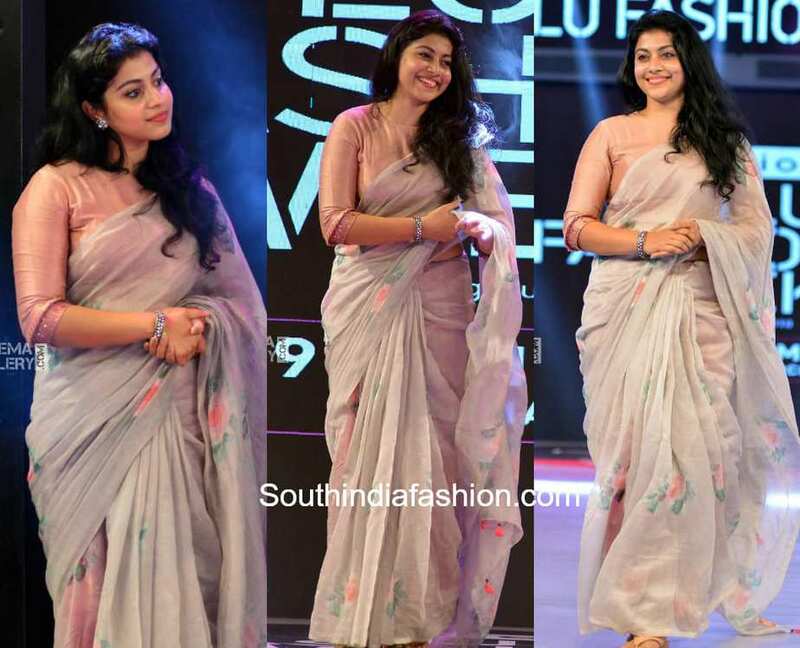 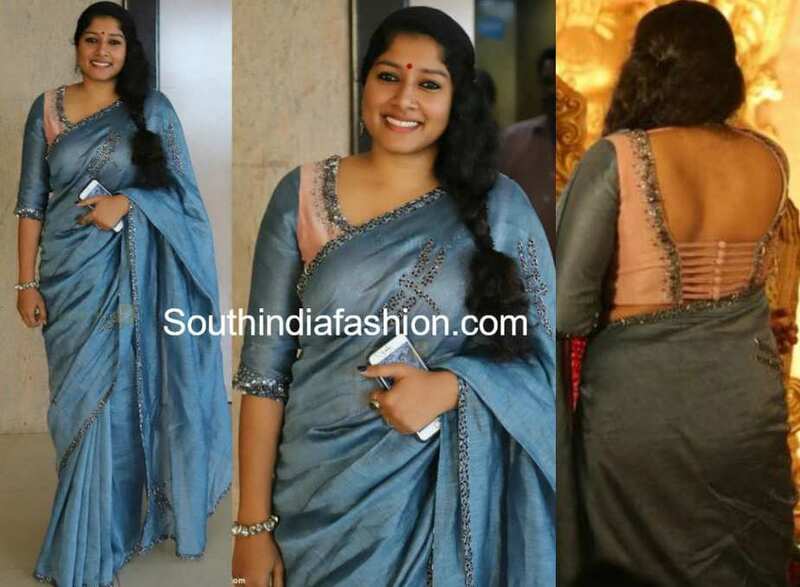 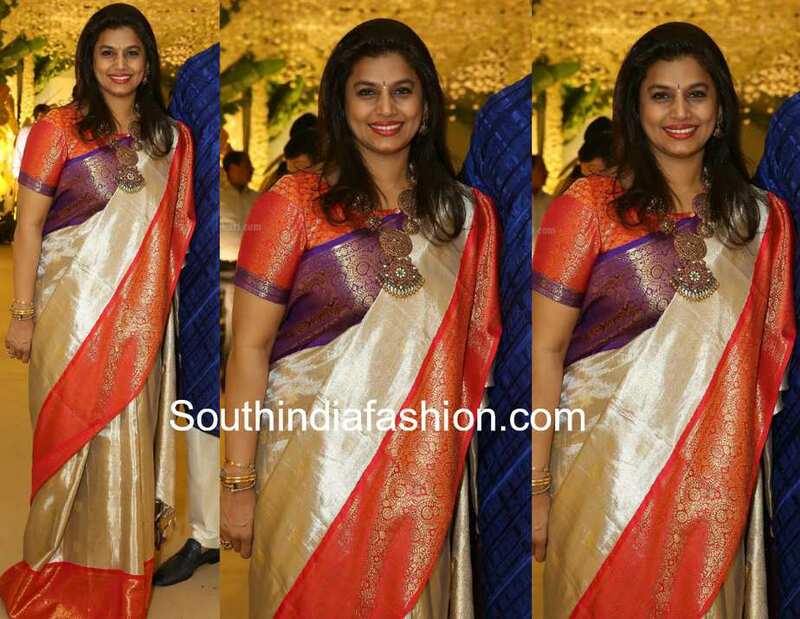 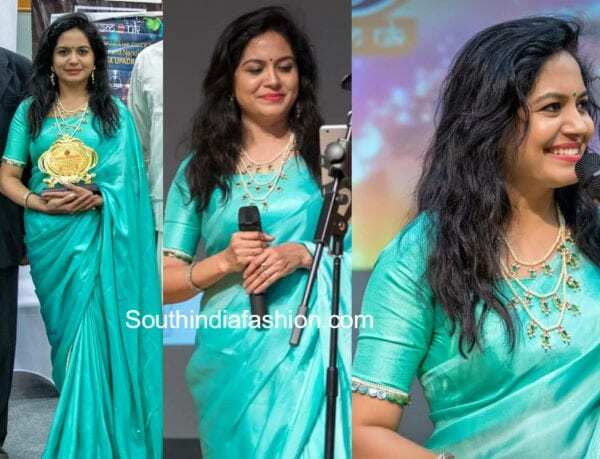 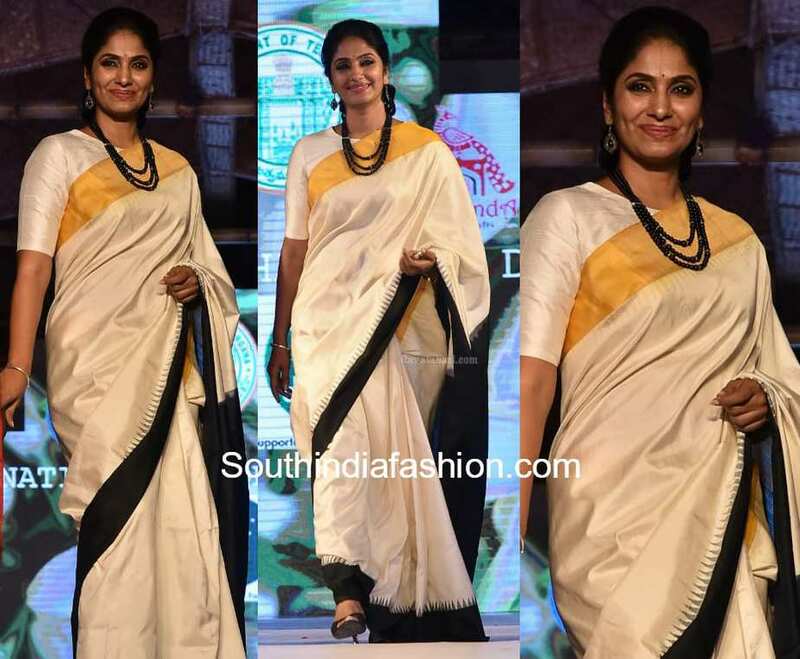 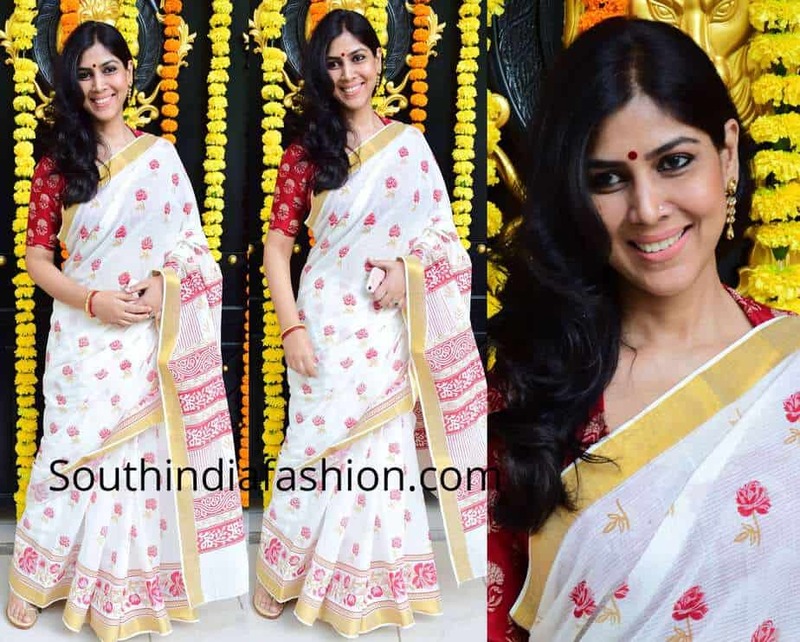 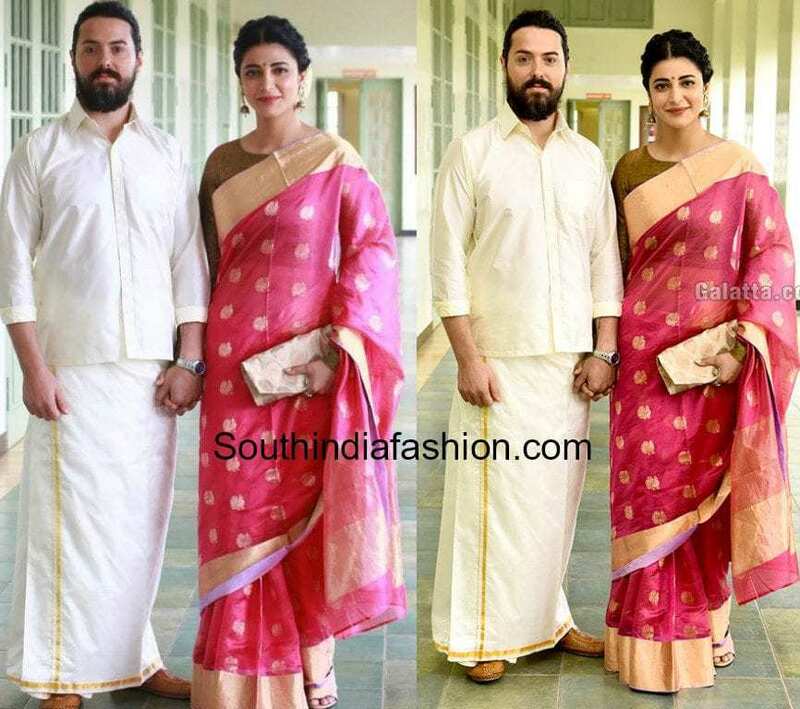 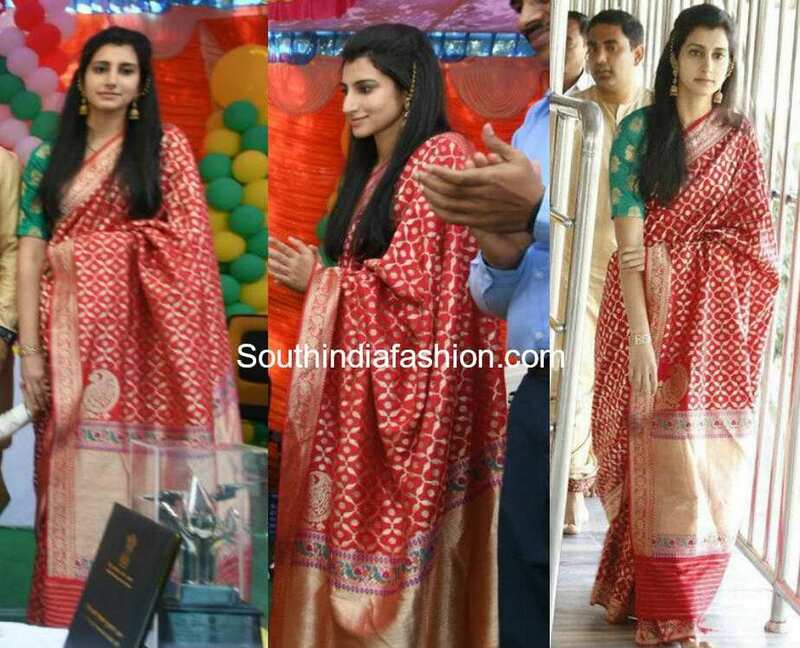 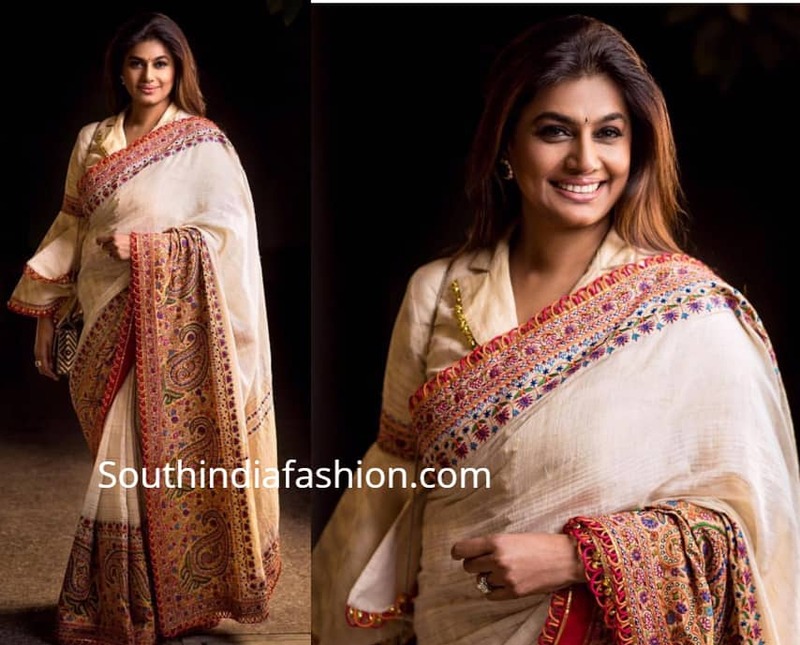 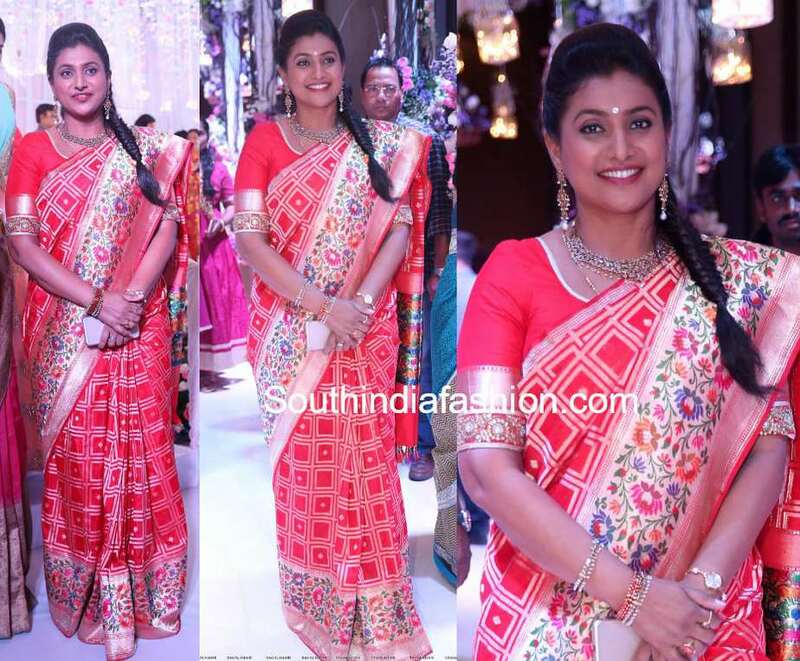 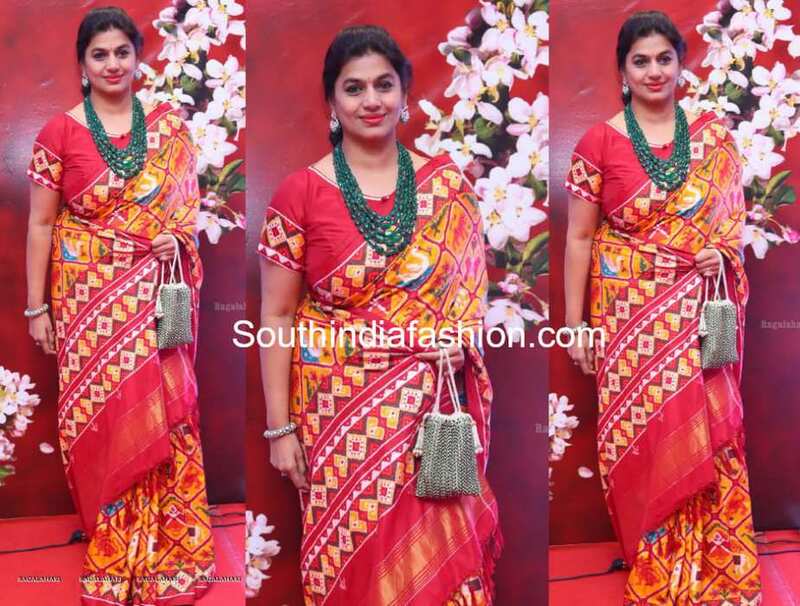 Meera Nandan stuns in a traditional saree! 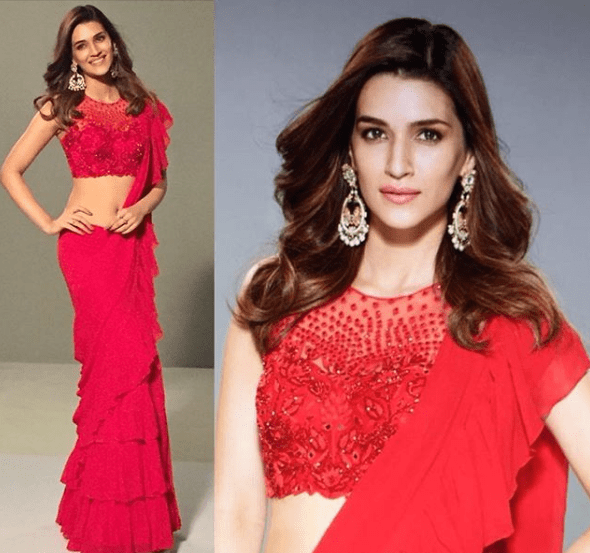 Karishma Tanna in Jade by Monica and Karishma! 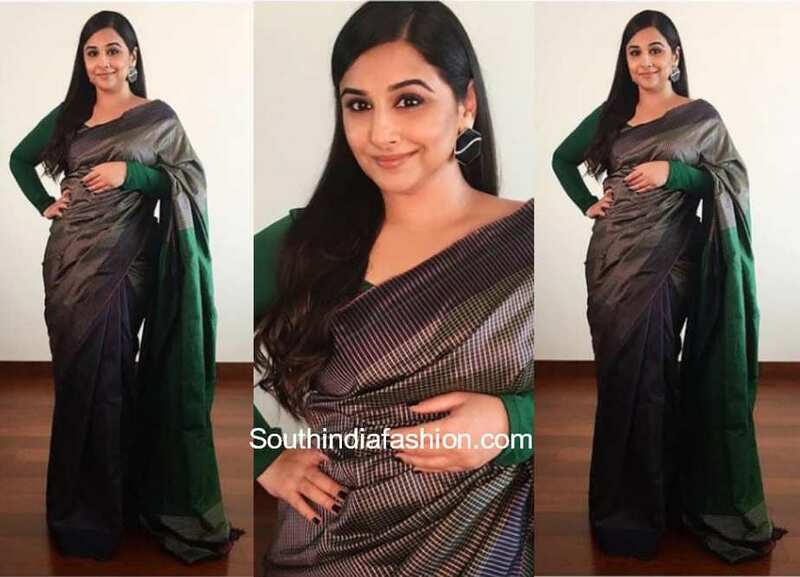 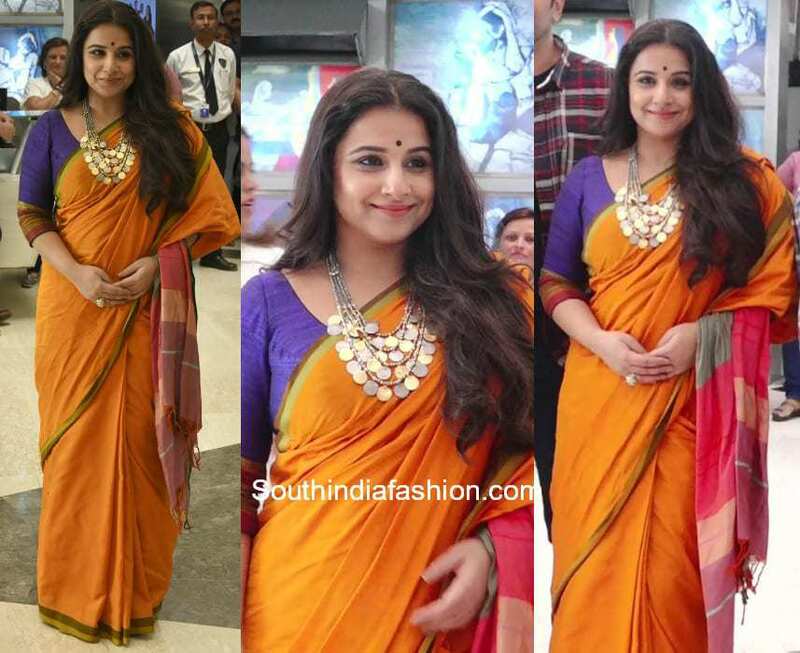 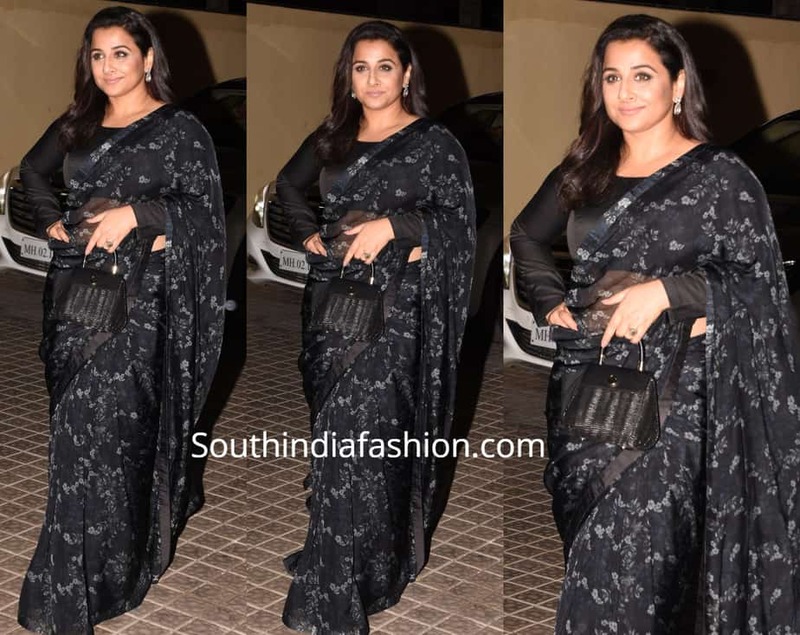 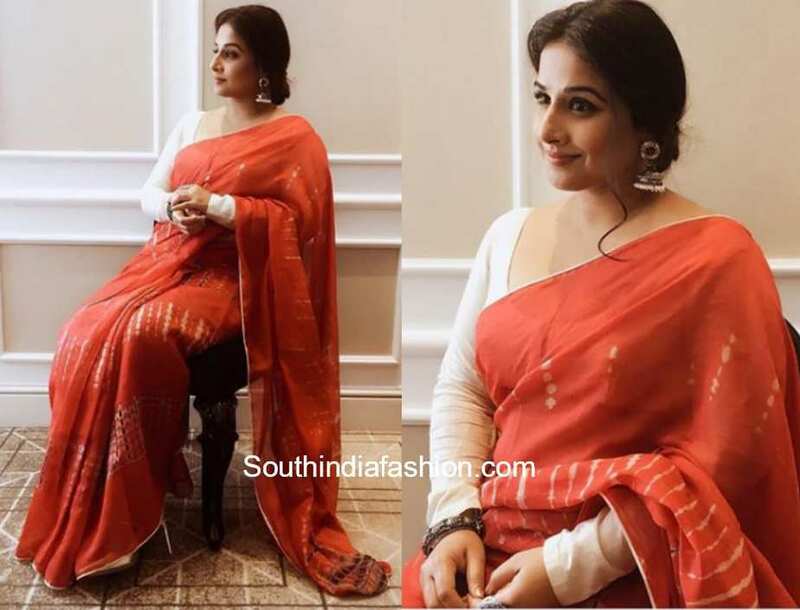 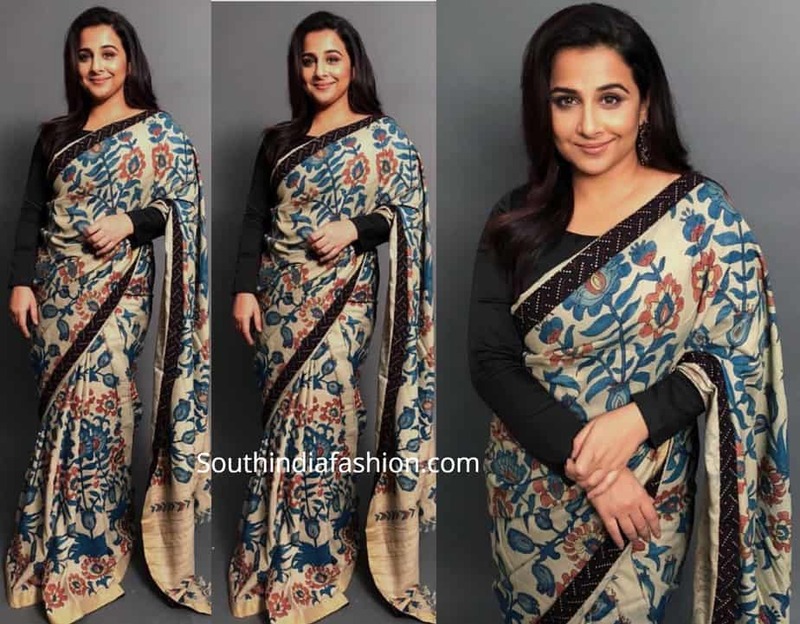 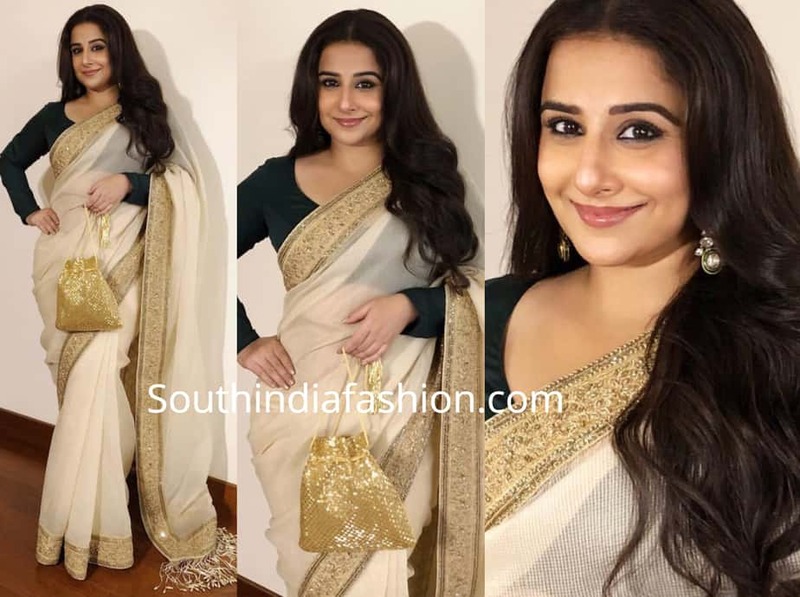 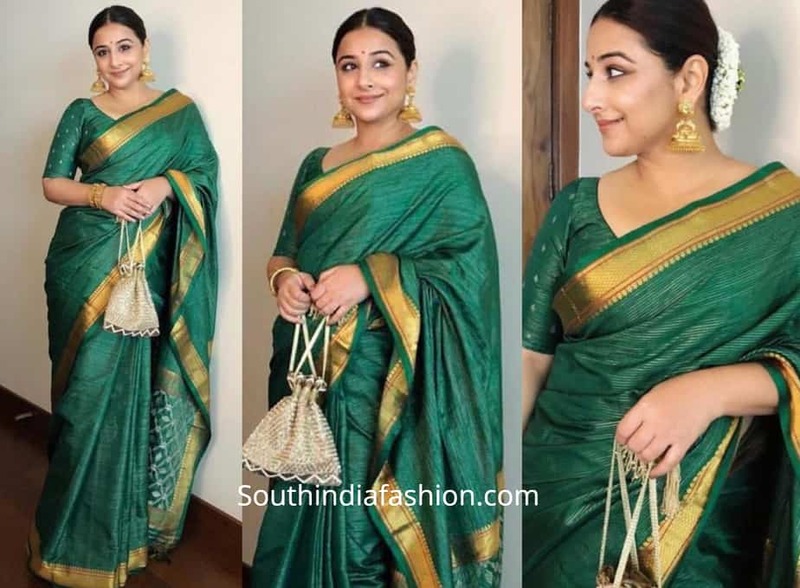 Vidya Balan in traditional saree from Āroka! 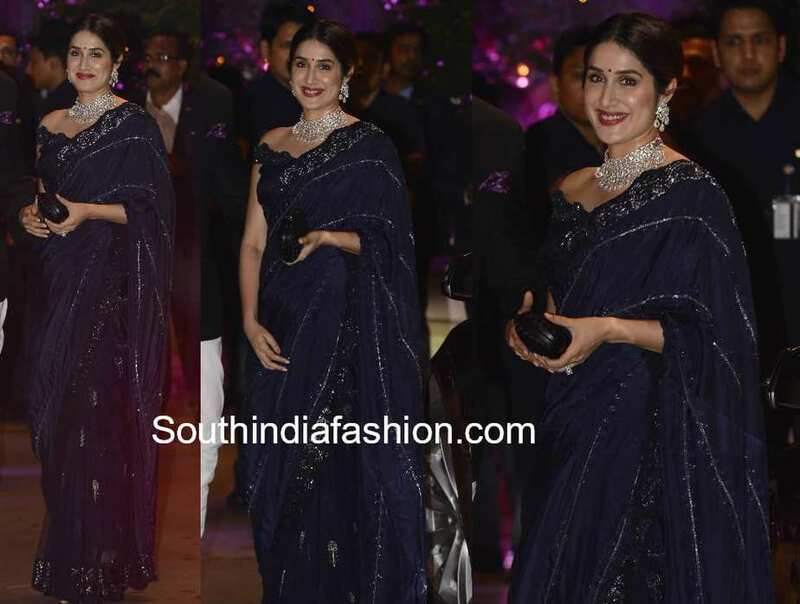 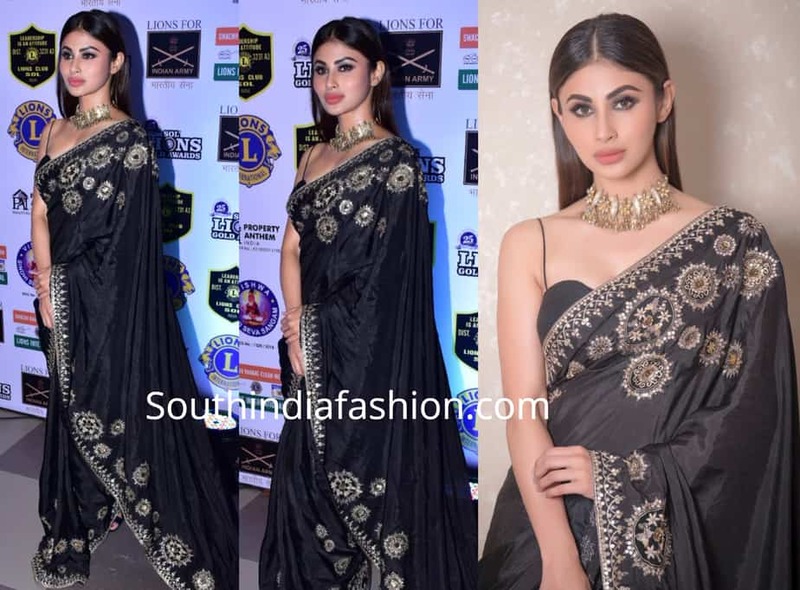 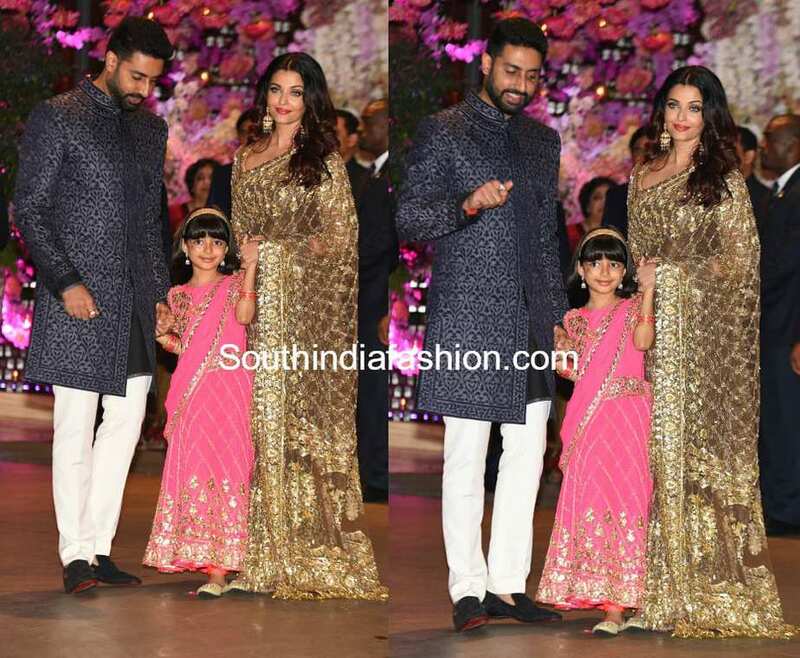 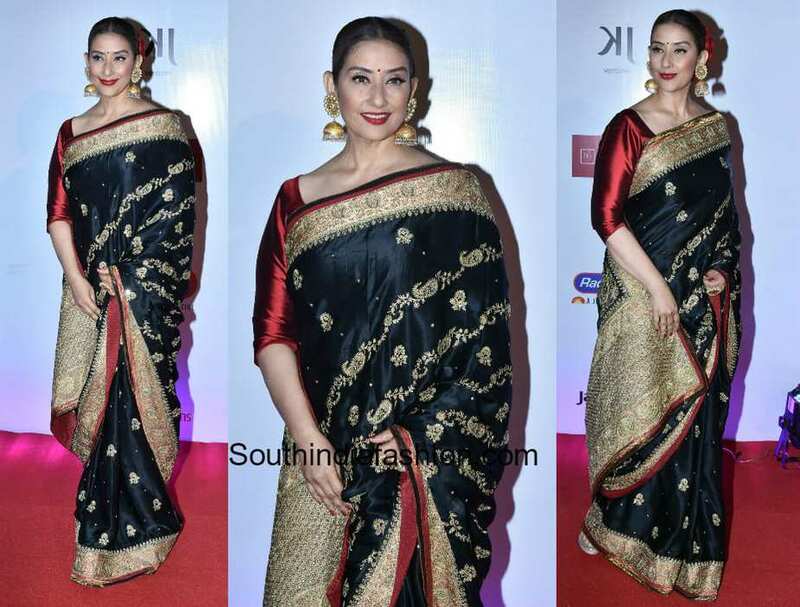 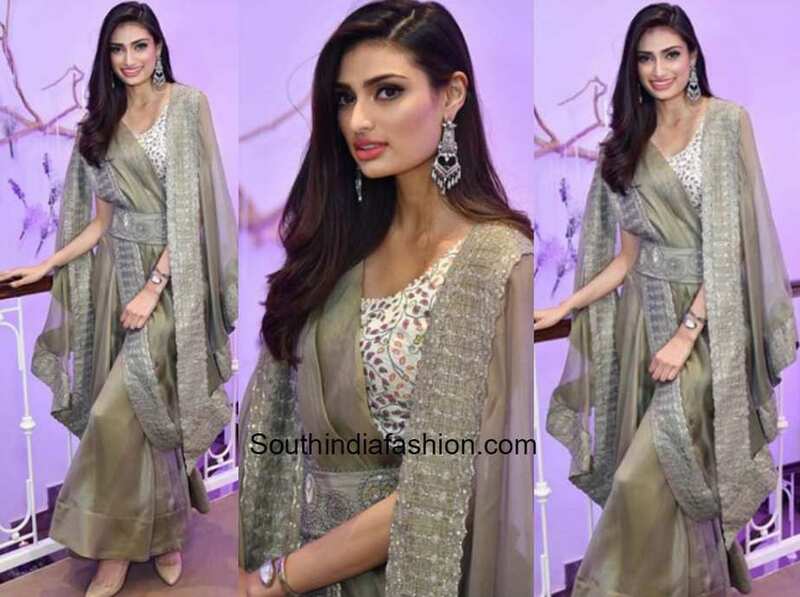 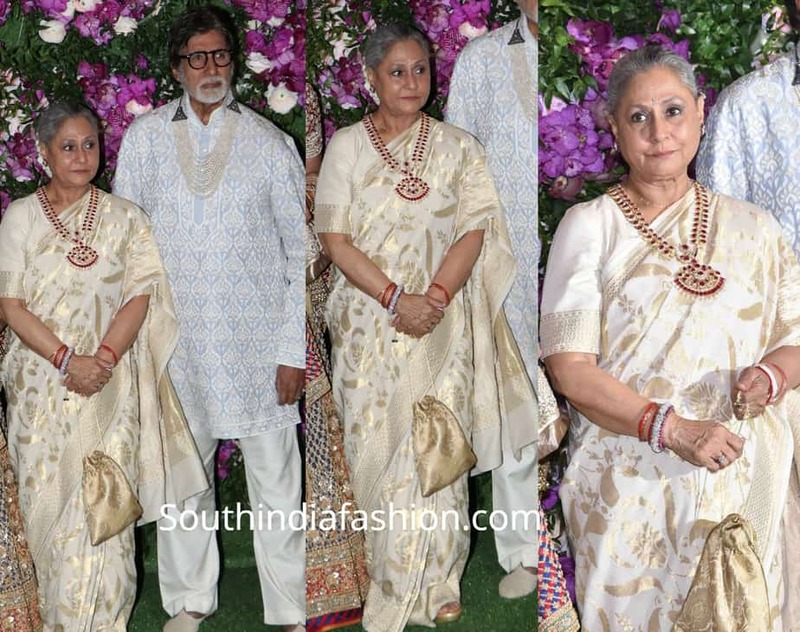 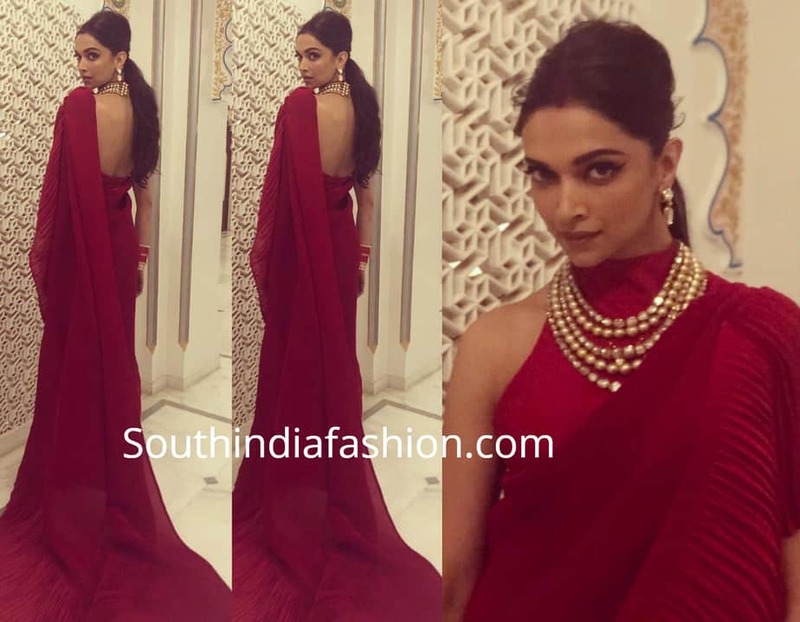 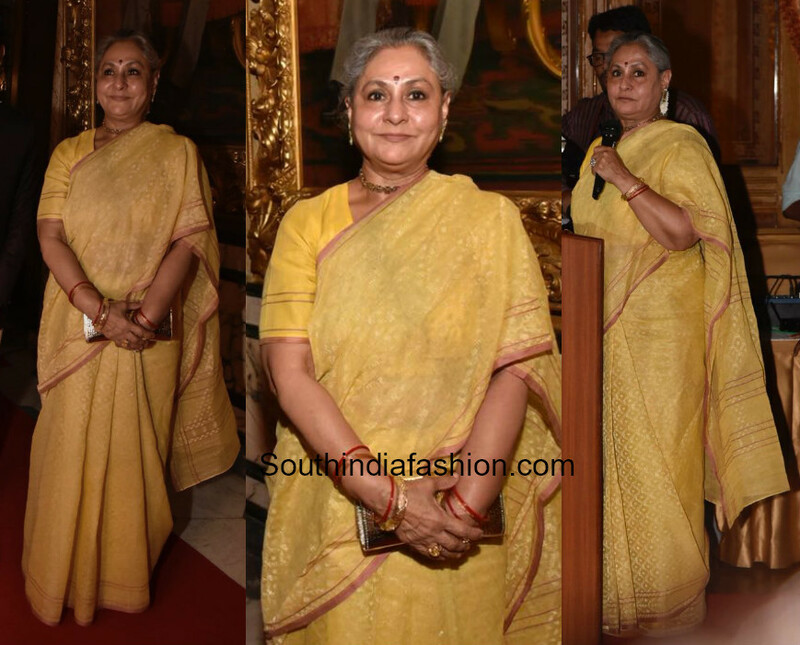 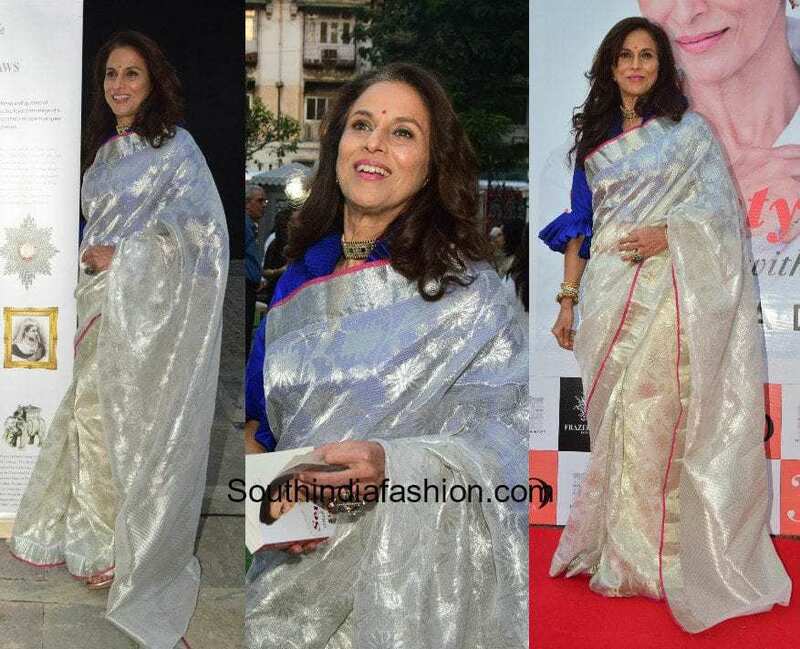 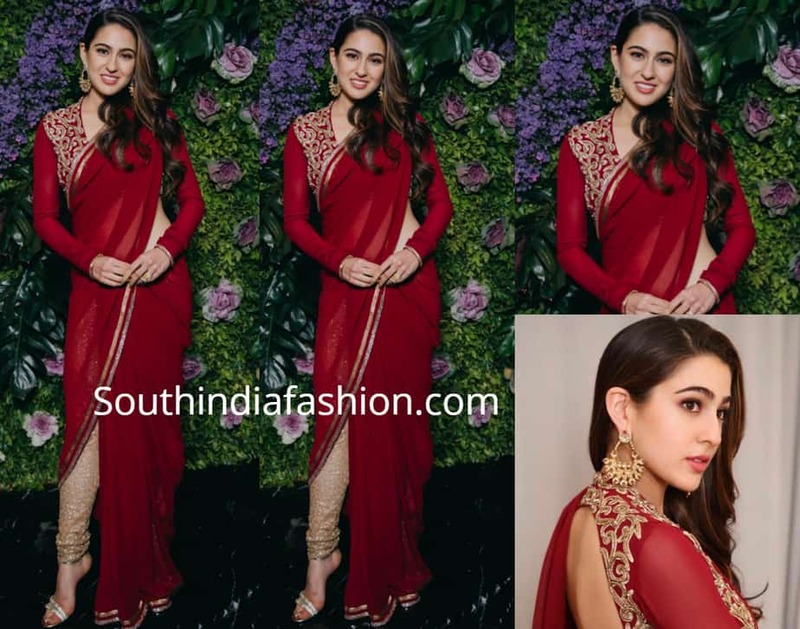 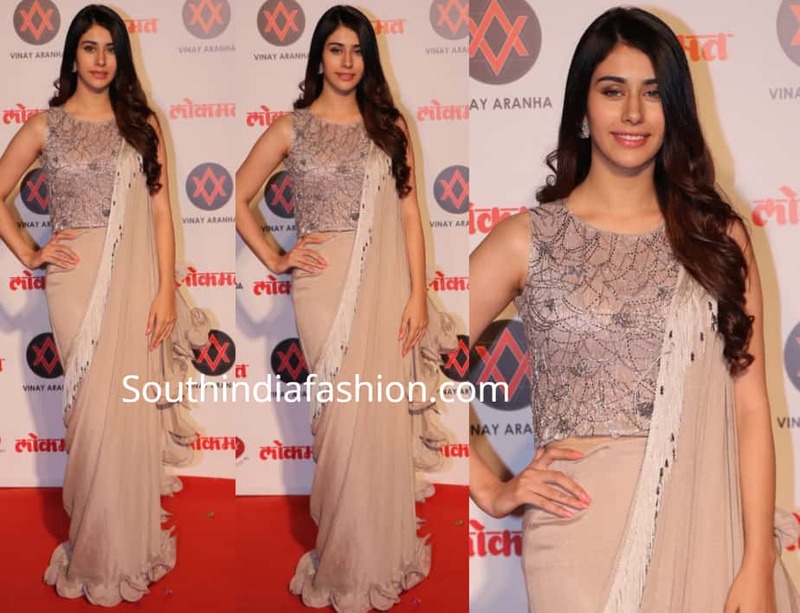 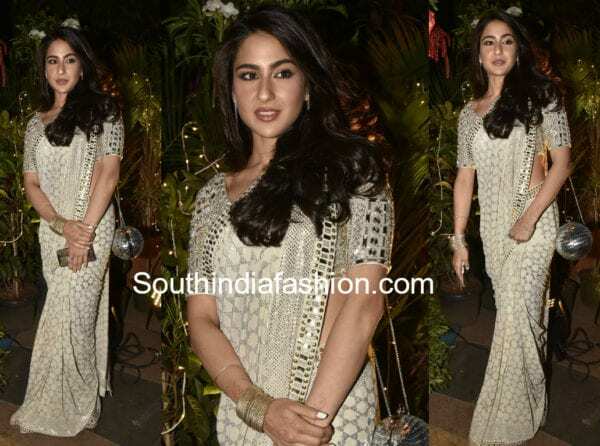 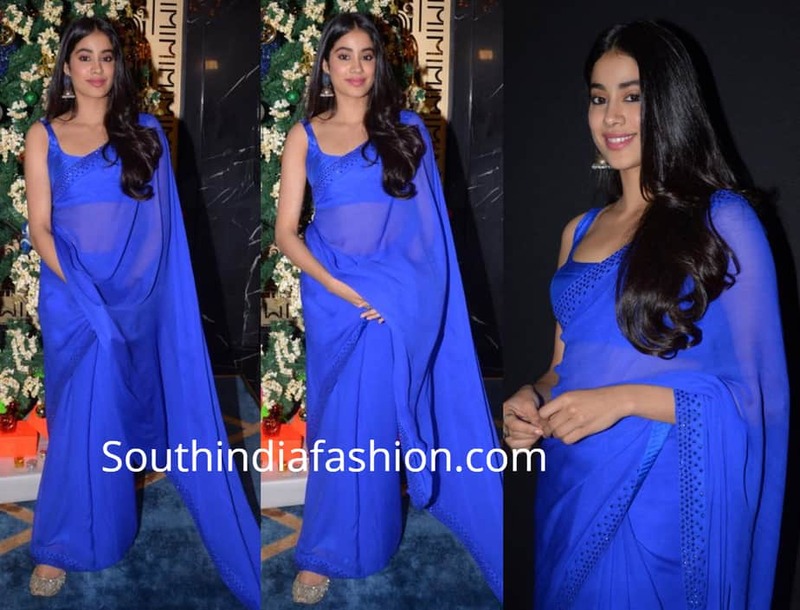 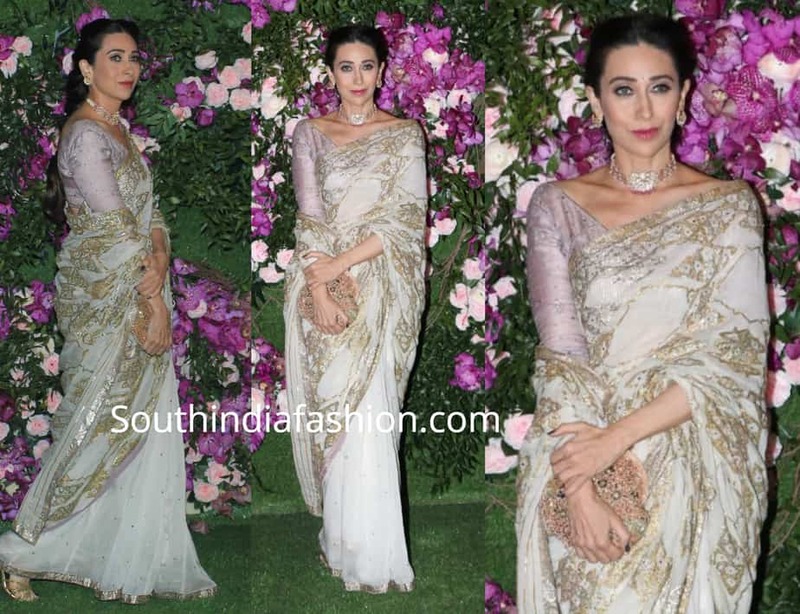 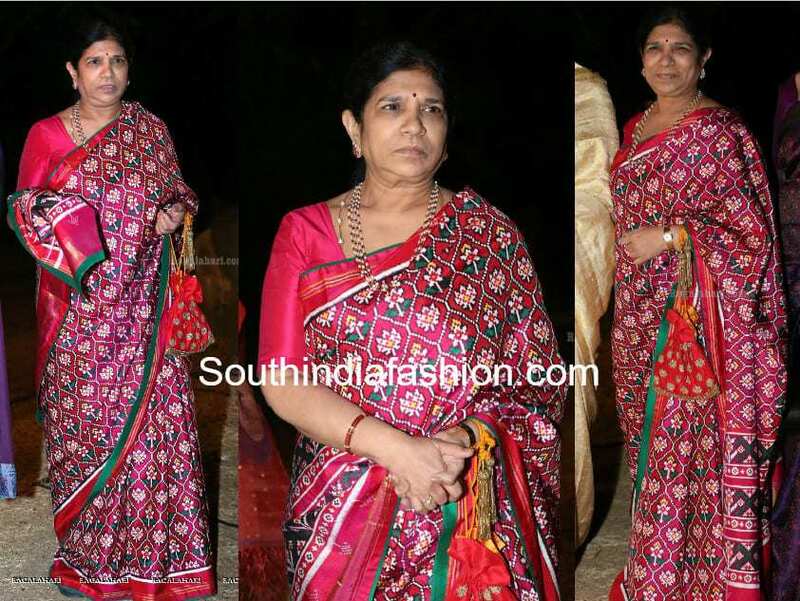 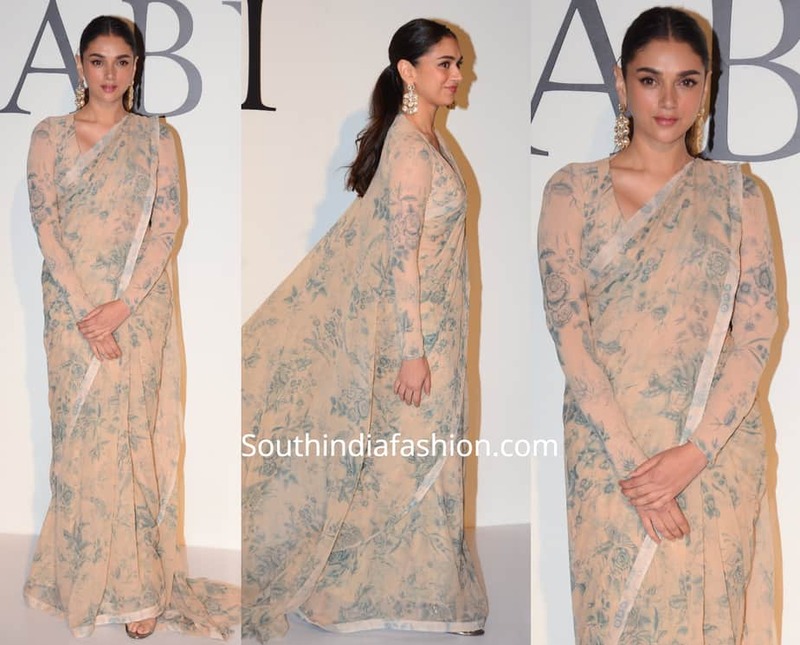 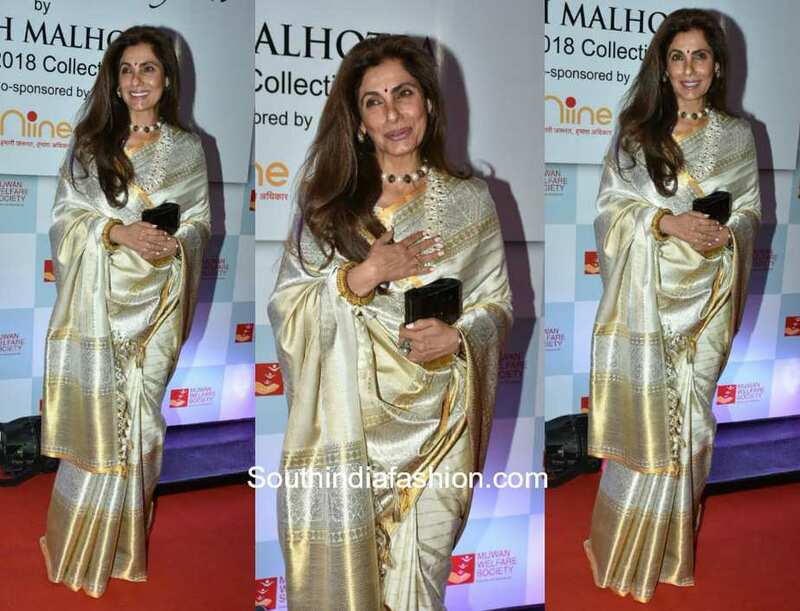 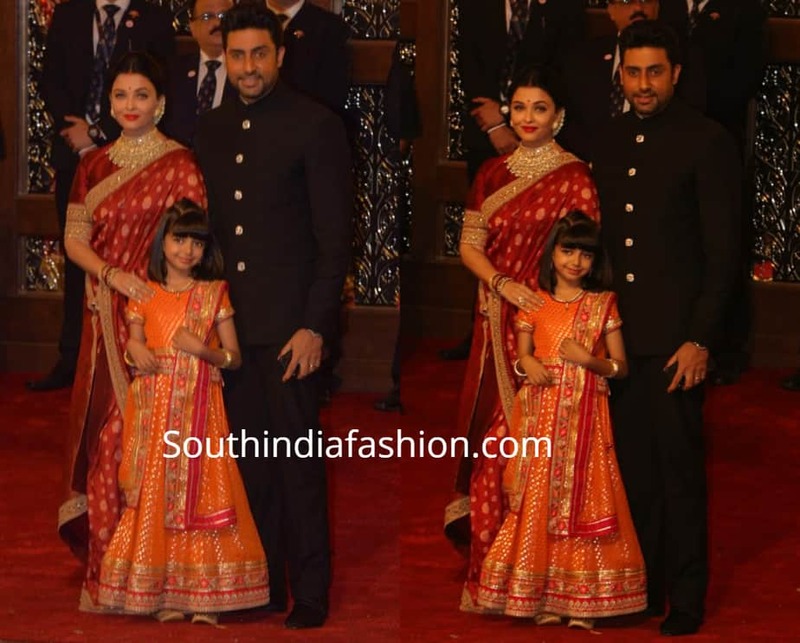 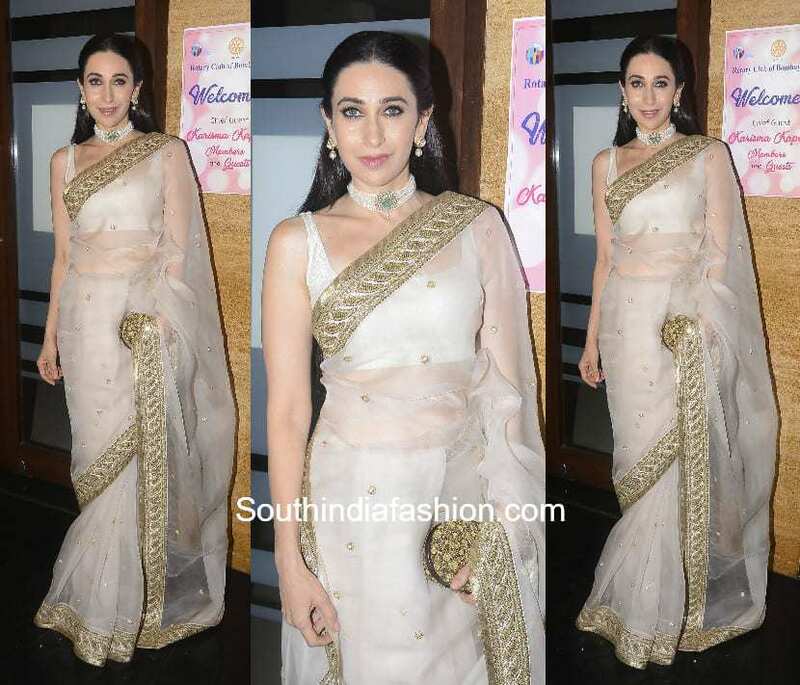 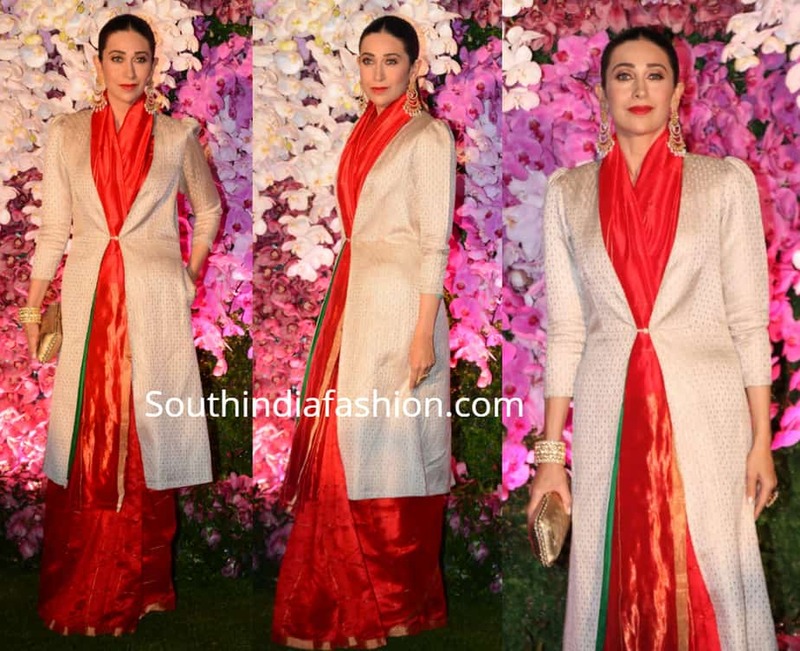 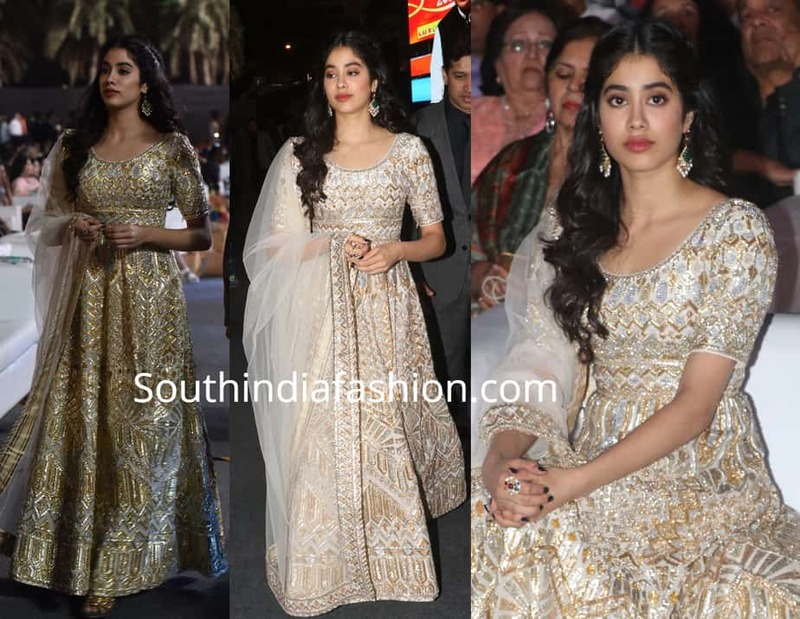 Pernia Qureshi in Manish Malhotra at Sonam Kapoor’s Sangeet! 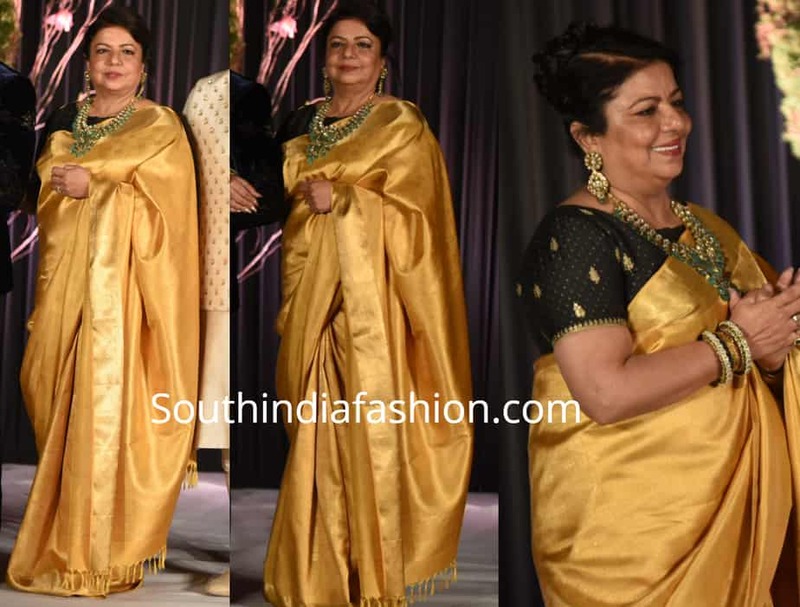 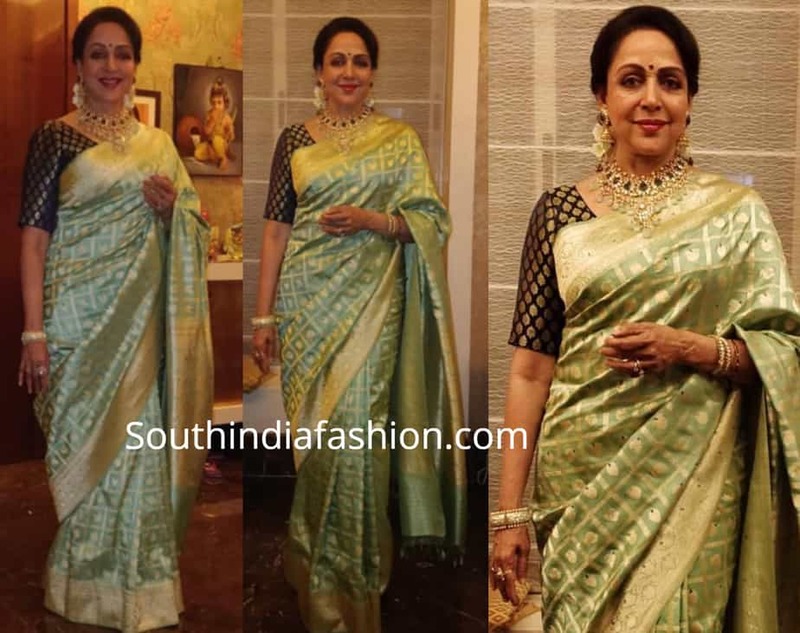 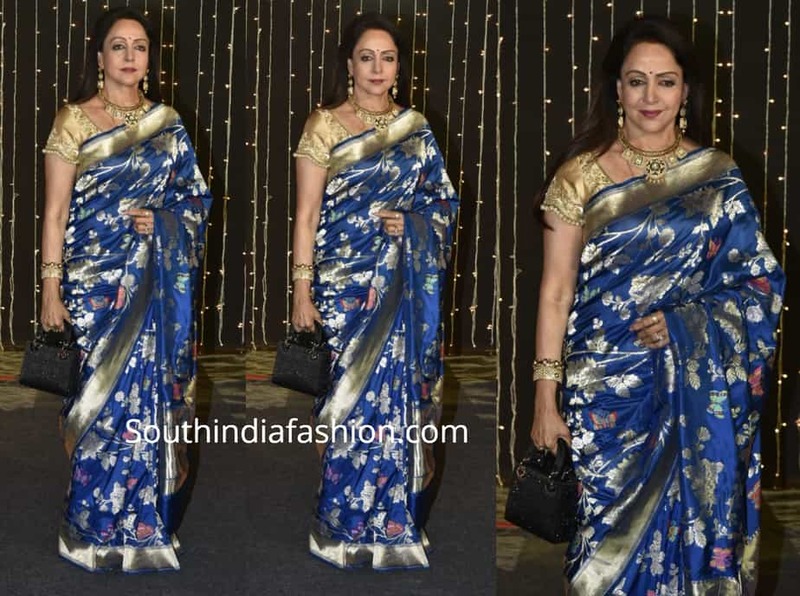 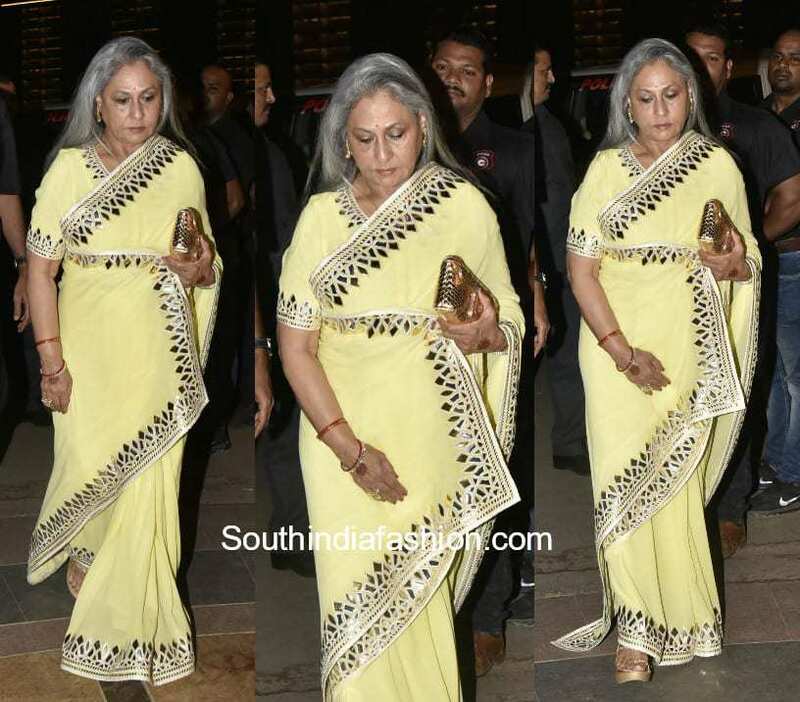 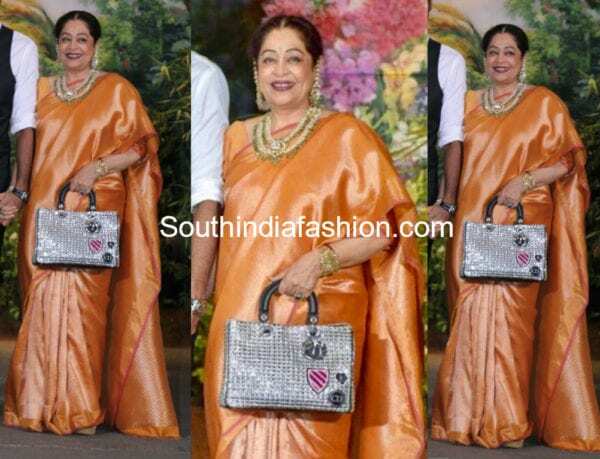 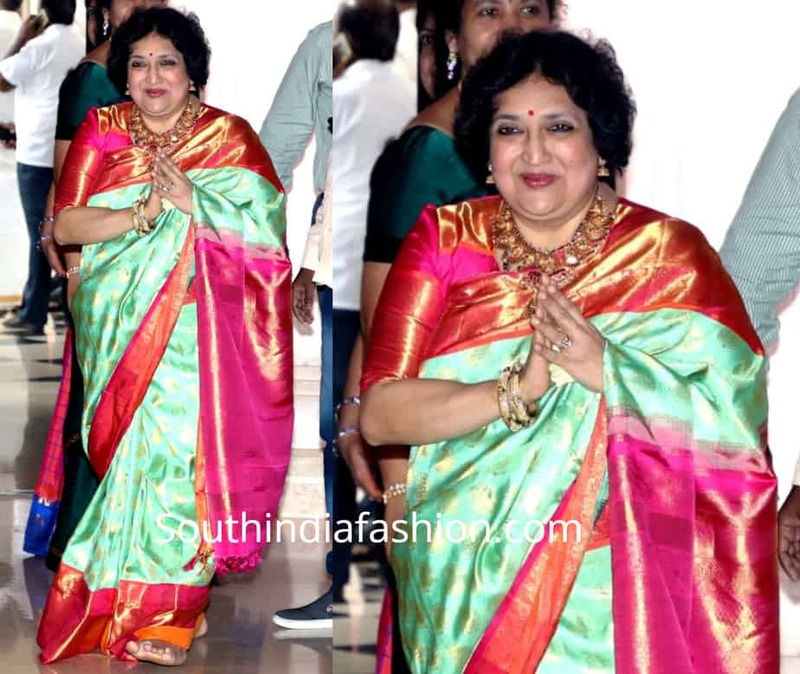 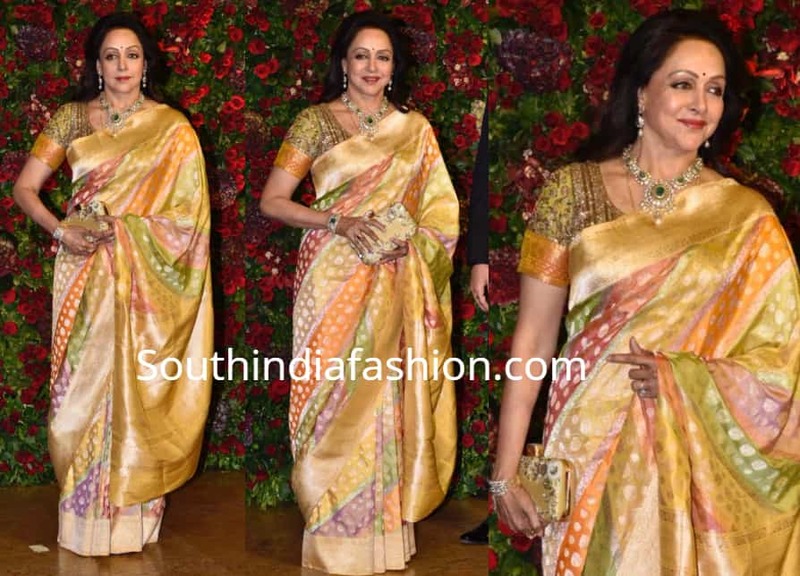 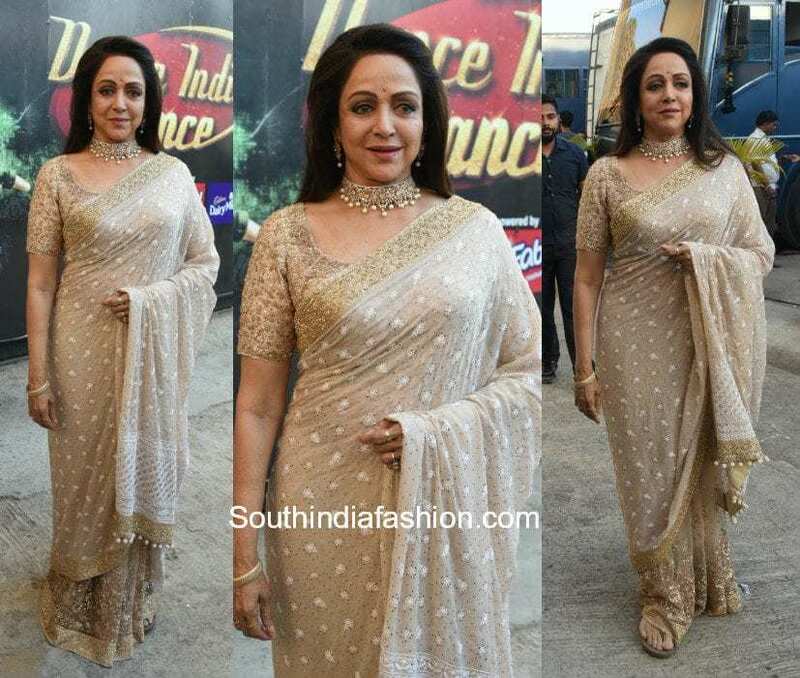 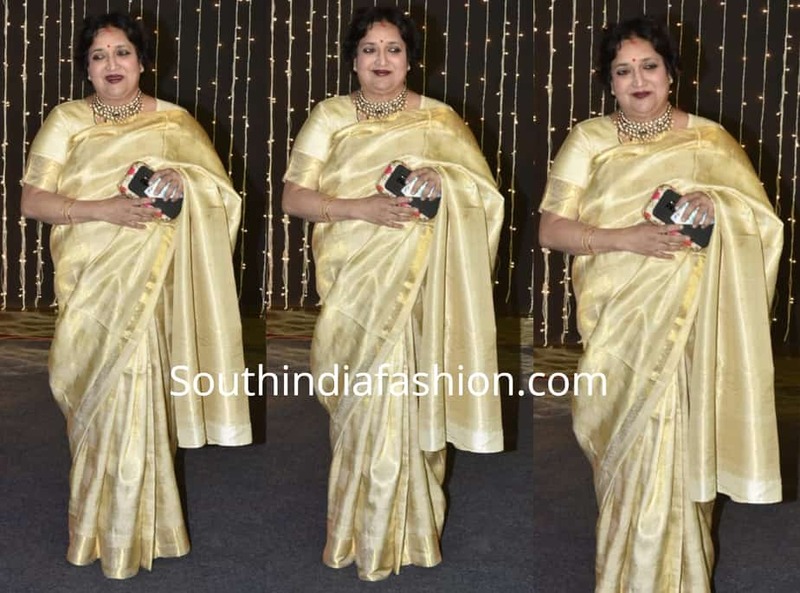 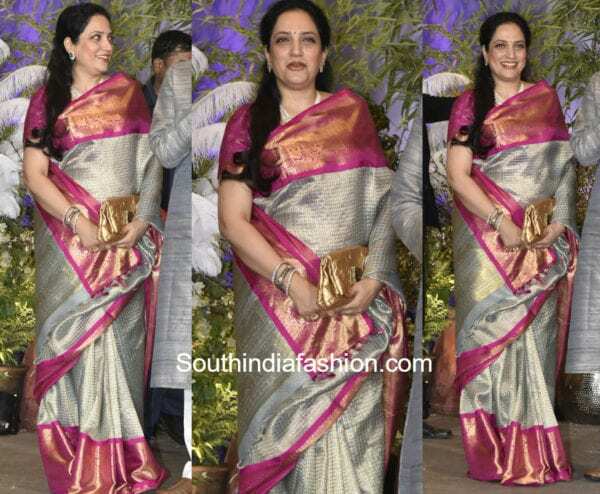 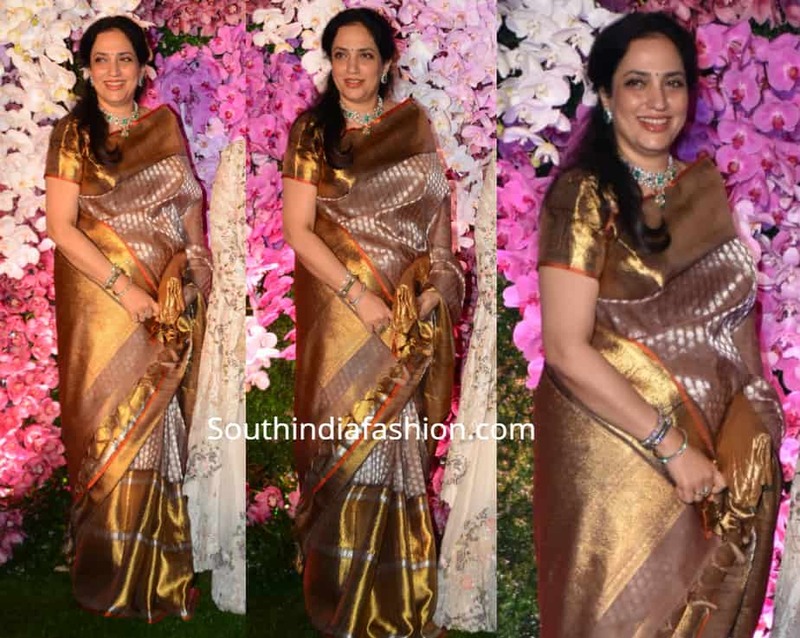 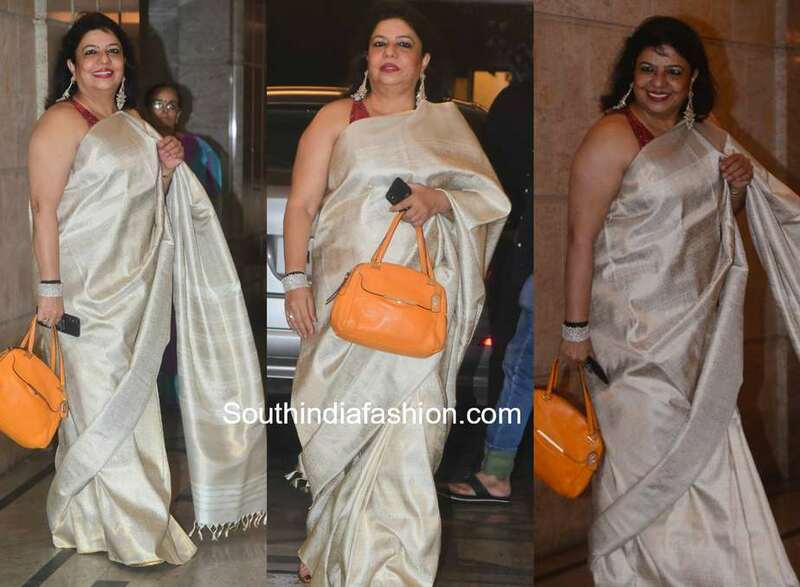 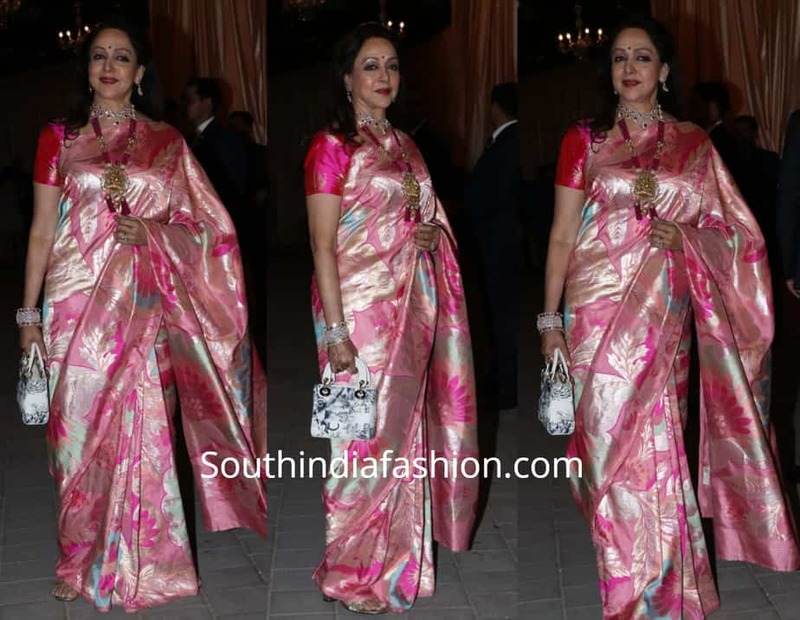 Kirron Kher in Gaurang Shah at Sonam Kapoor’s Wedding Reception! 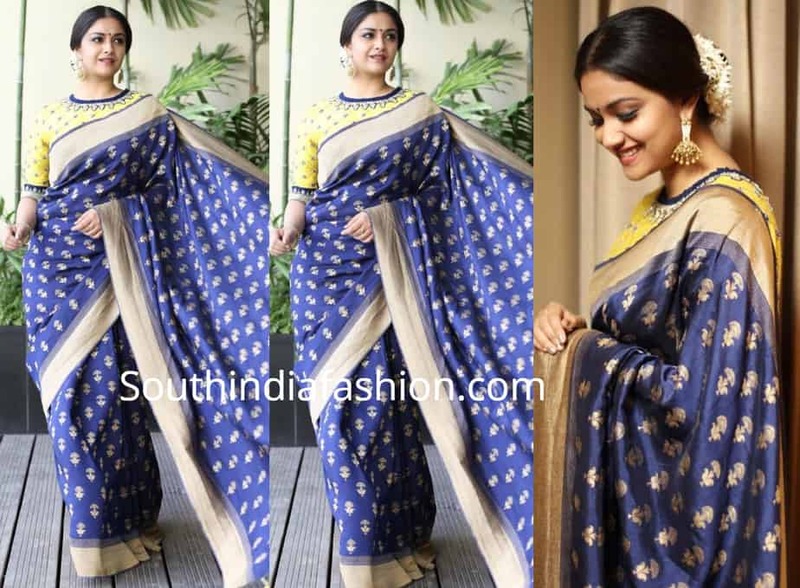 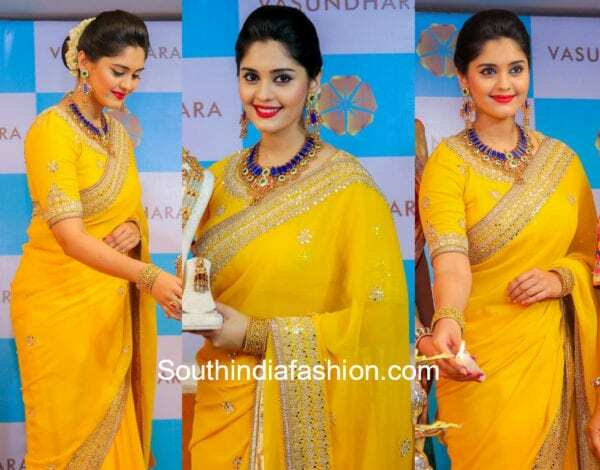 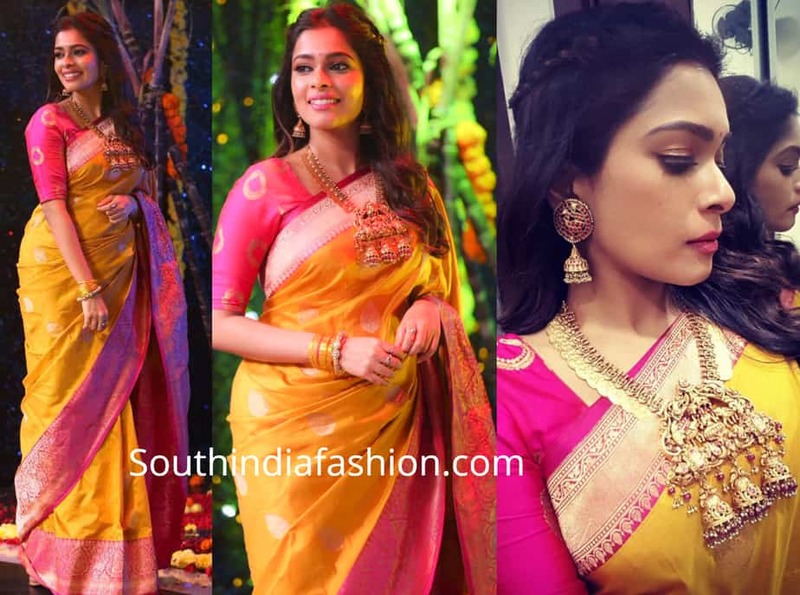 Keerthy Suresh shines in a bright yellow saree by Nikasha! 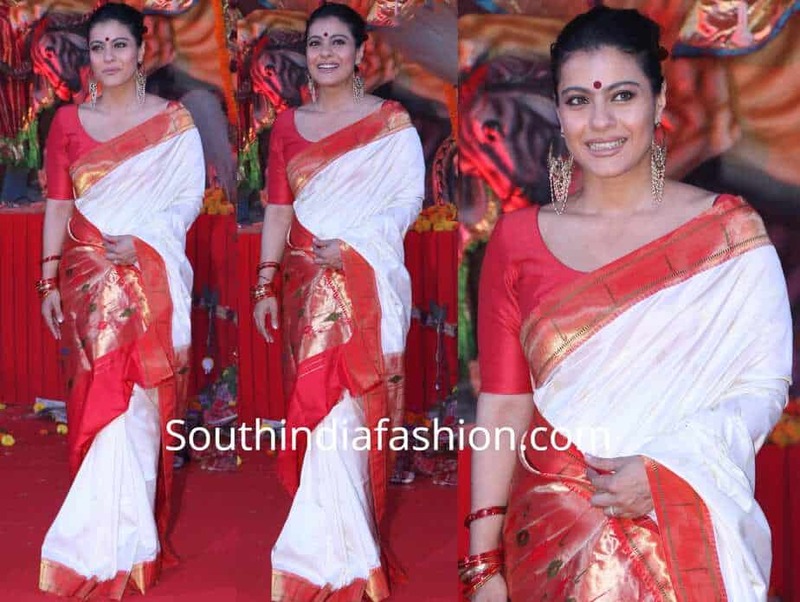 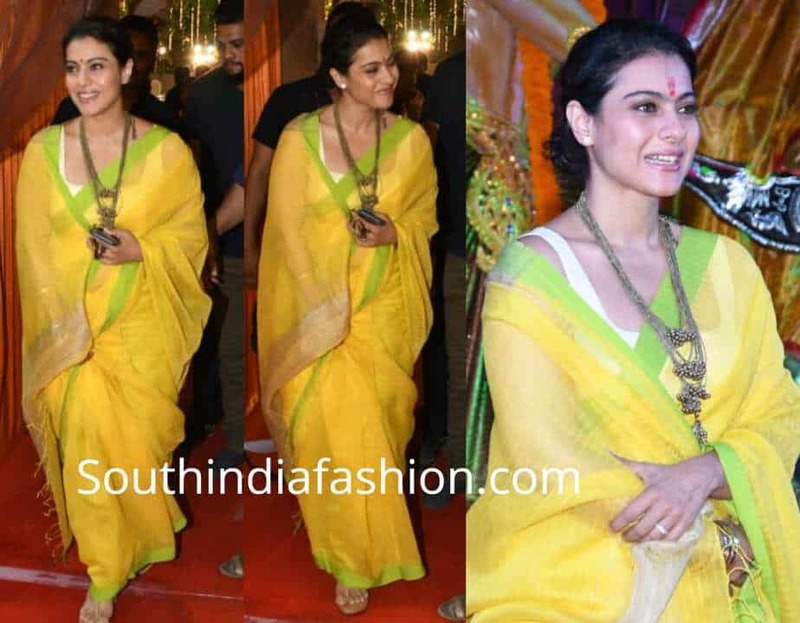 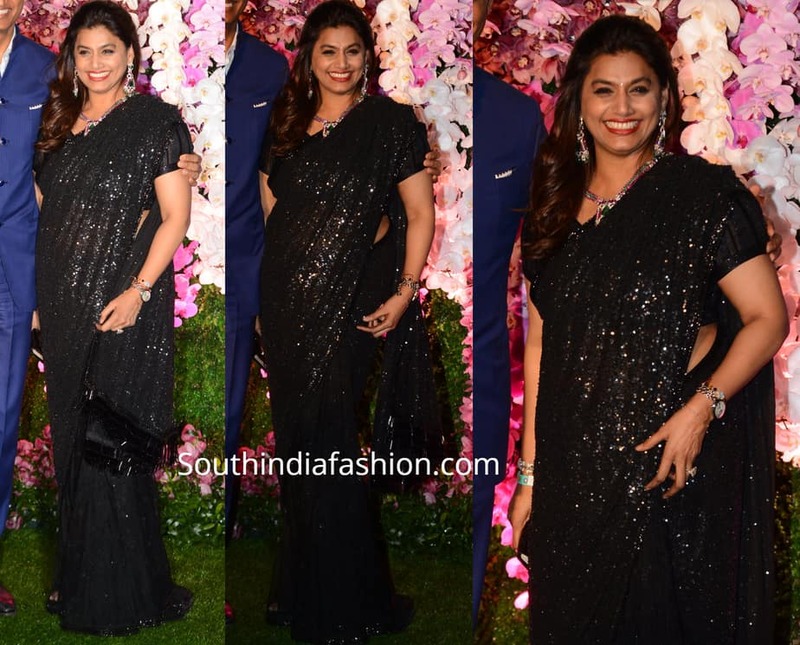 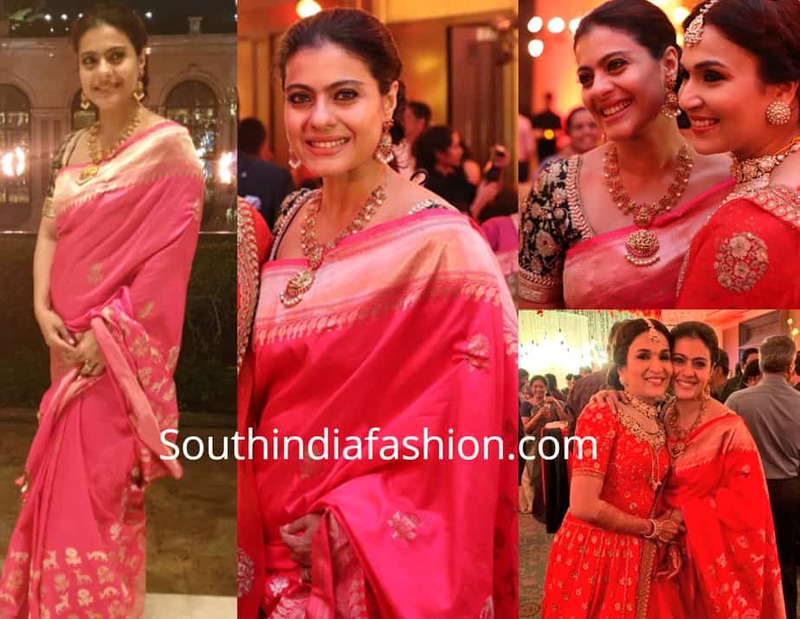 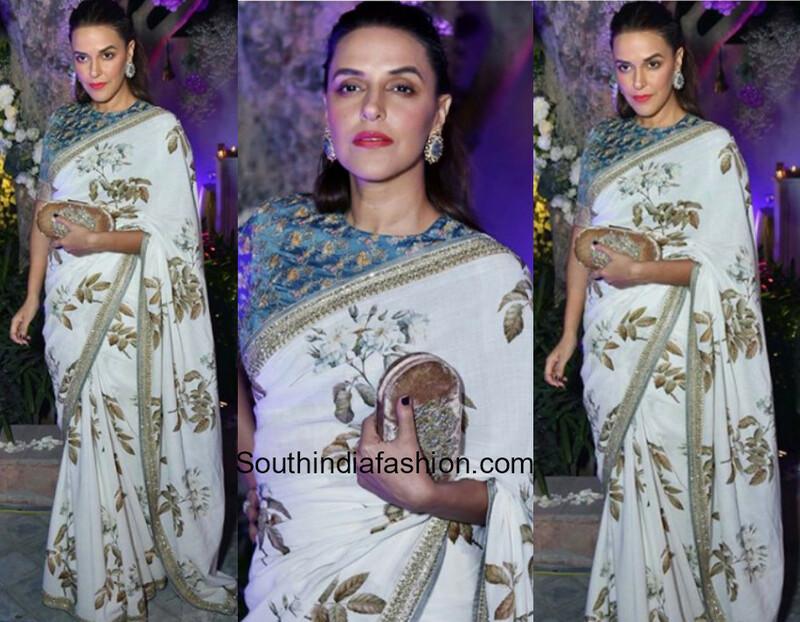 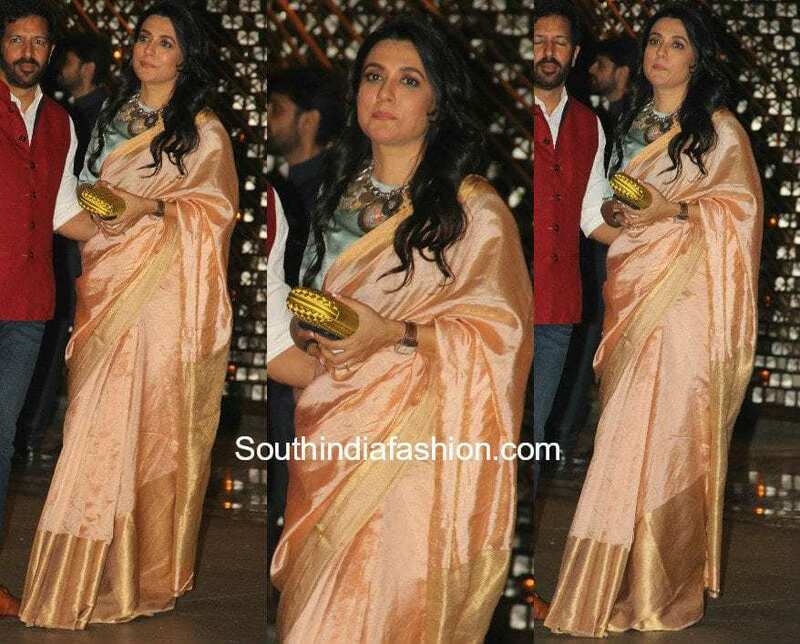 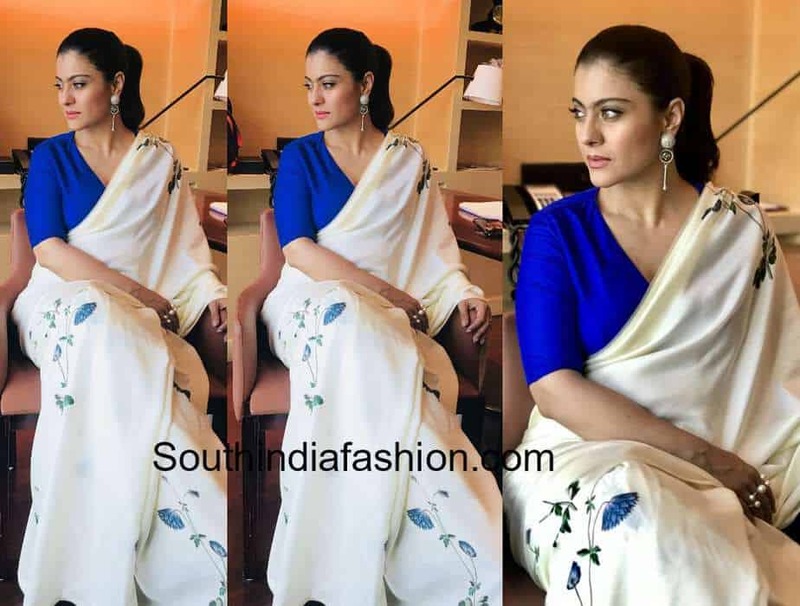 Kajol Devgan in Manish Malhotra Saree for Kapoor-Ahuja’s Reception! 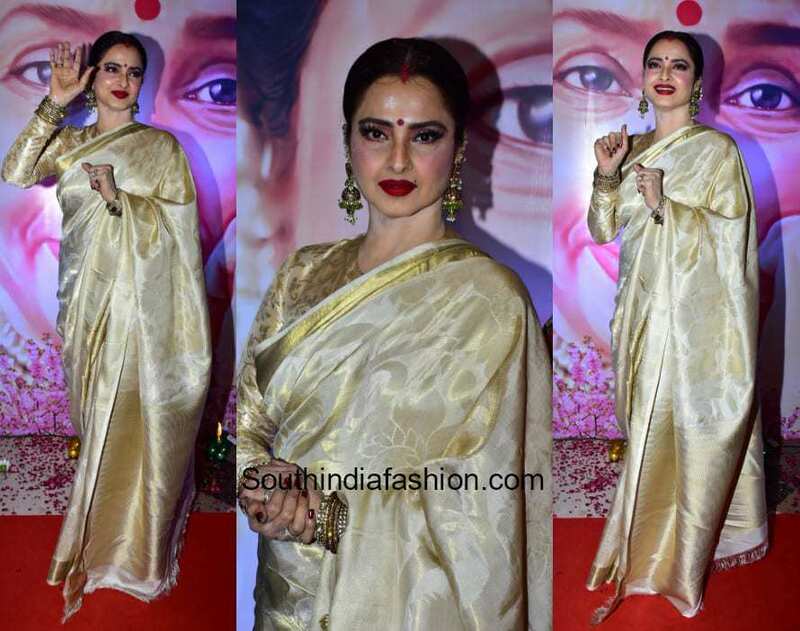 Kangana Ranaut stunned in a retro look for her Cannes debut! 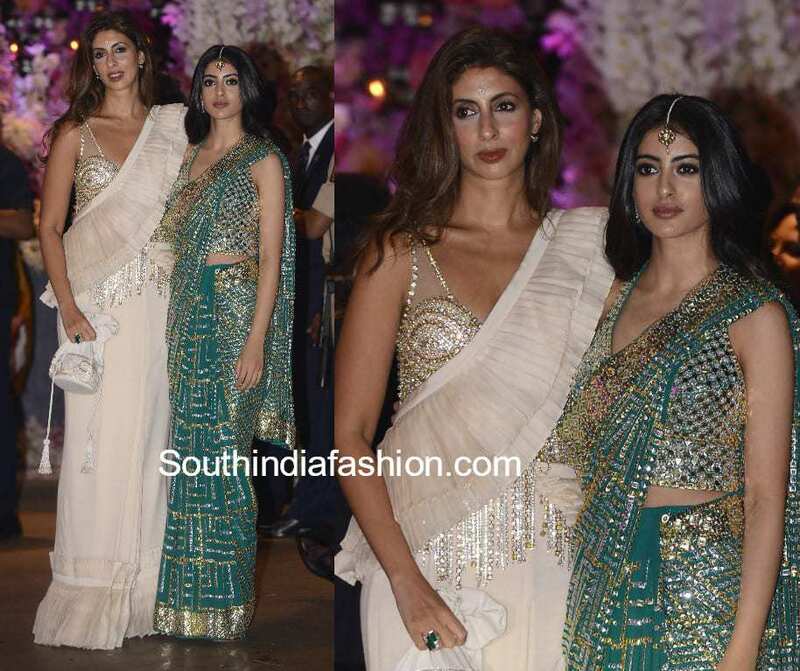 Jacqueline Fernandez is a vision in white at Sonam’s Reception! 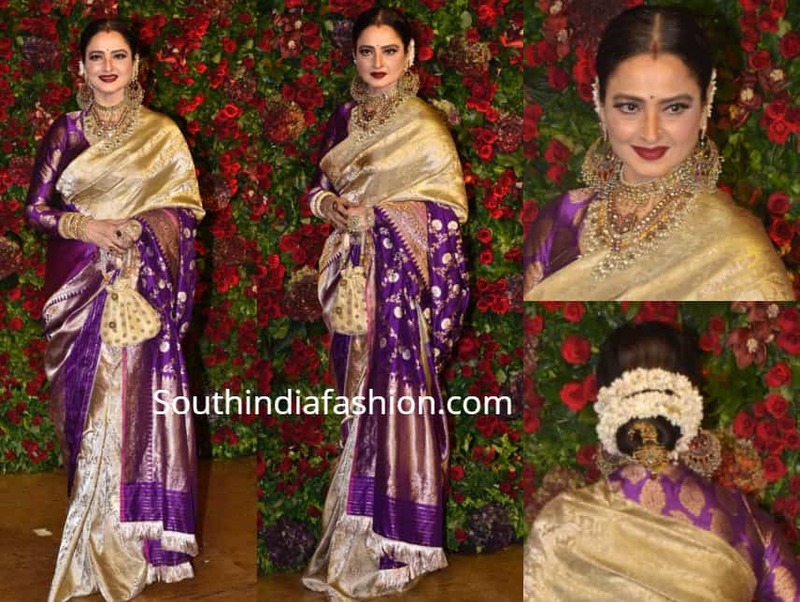 Kangana Ranaut Looks Drop Dead Gorgeous At Sonam Kapoor’s Wedding Reception! 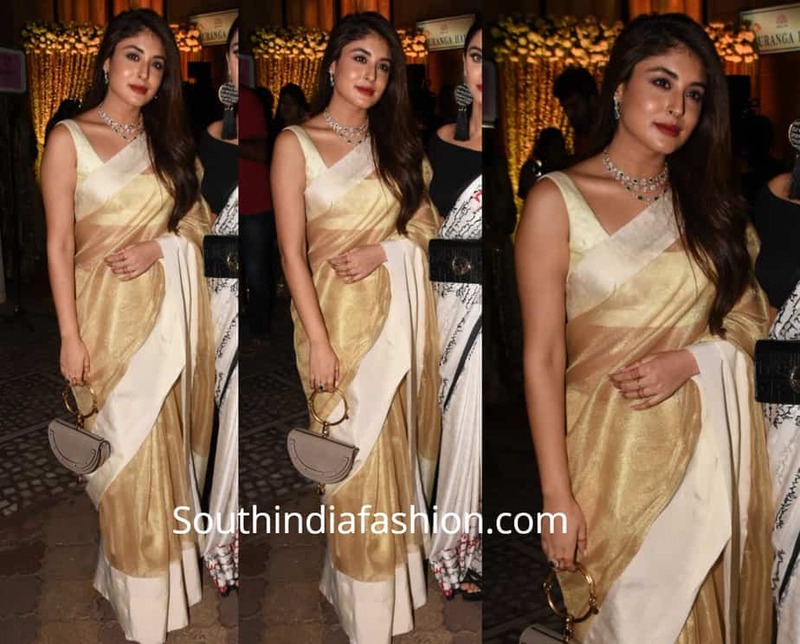 Priyanka Chopra Radiating In A White Silk Saree! 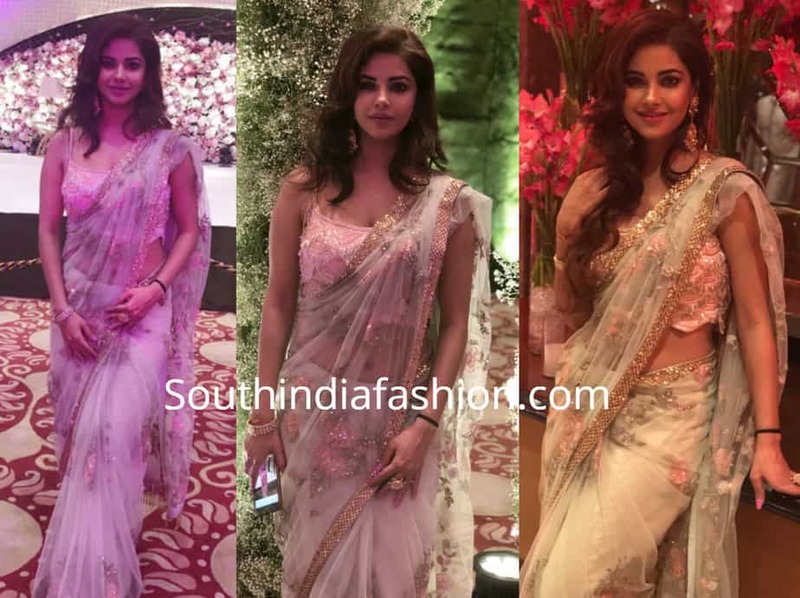 Priya Varrier ‘Blushing in Pink’ Saree at a wedding reception! 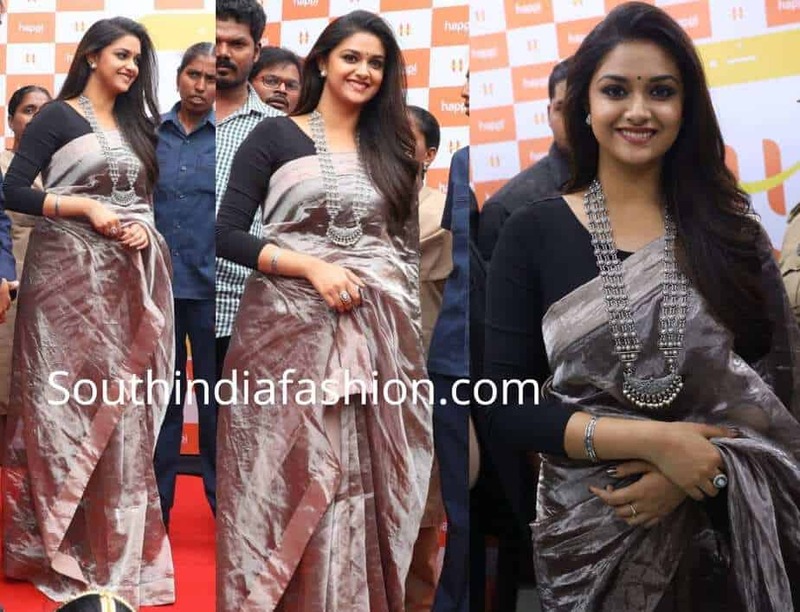 Keerthy Suresh’s traditional saree at Mahanati Audio Launch is a must-have for every Saree lover! 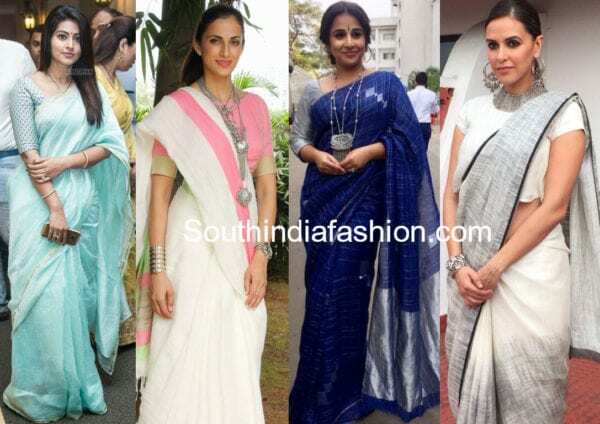 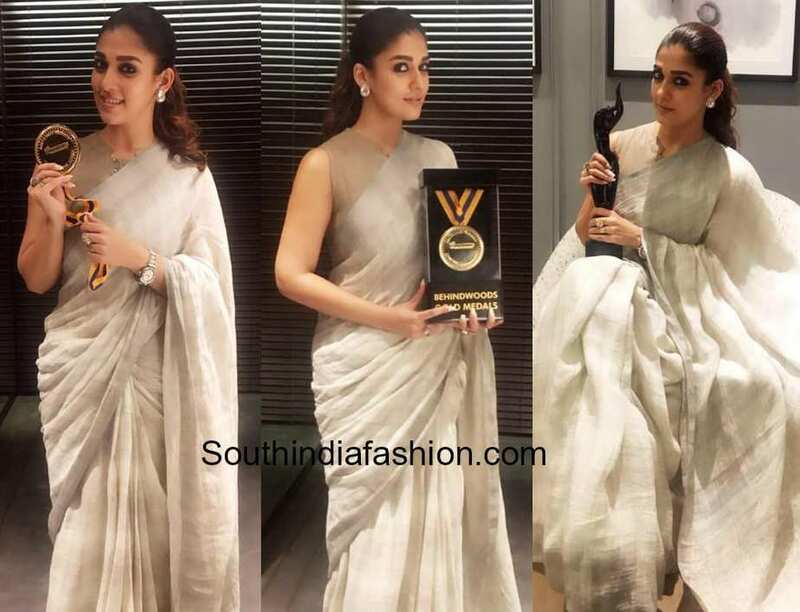 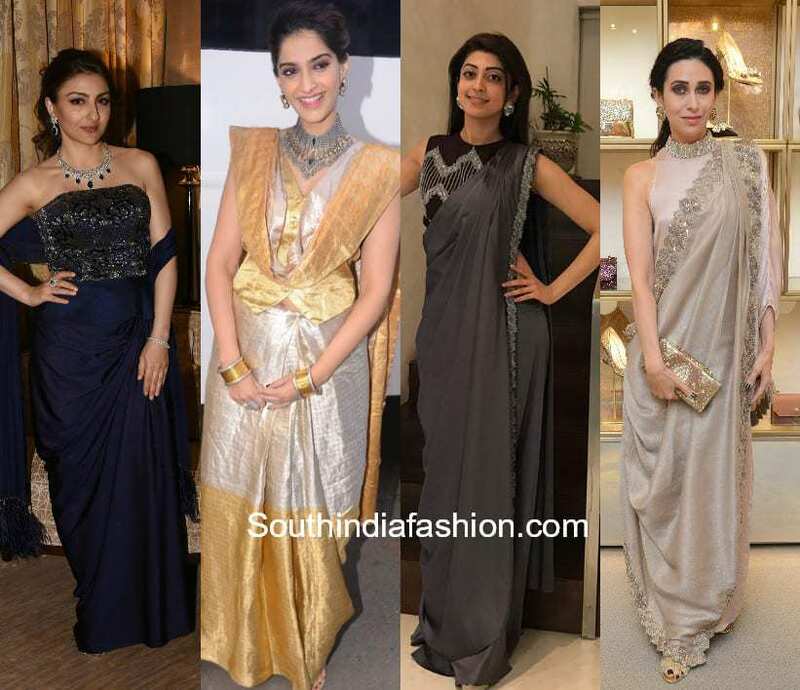 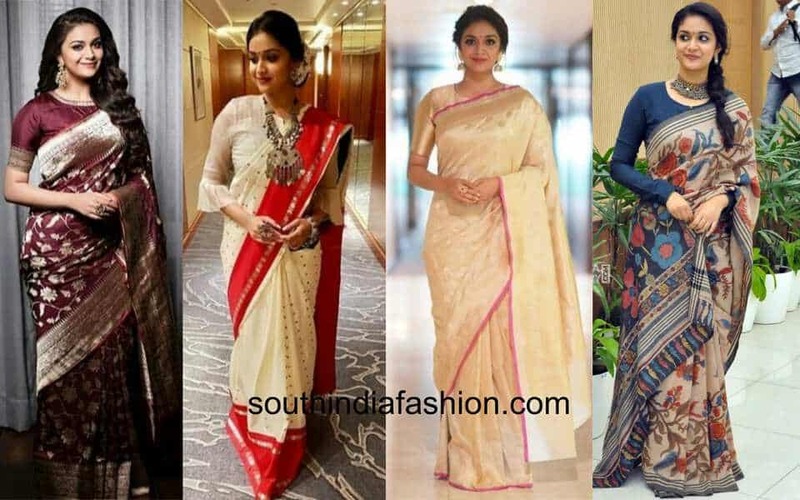 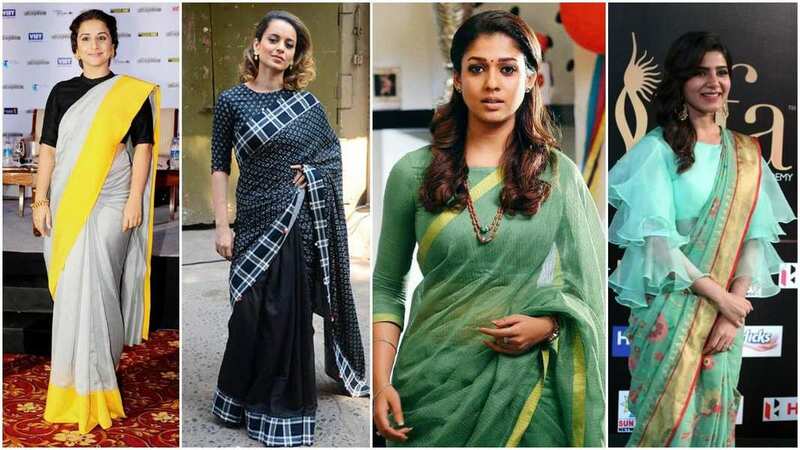 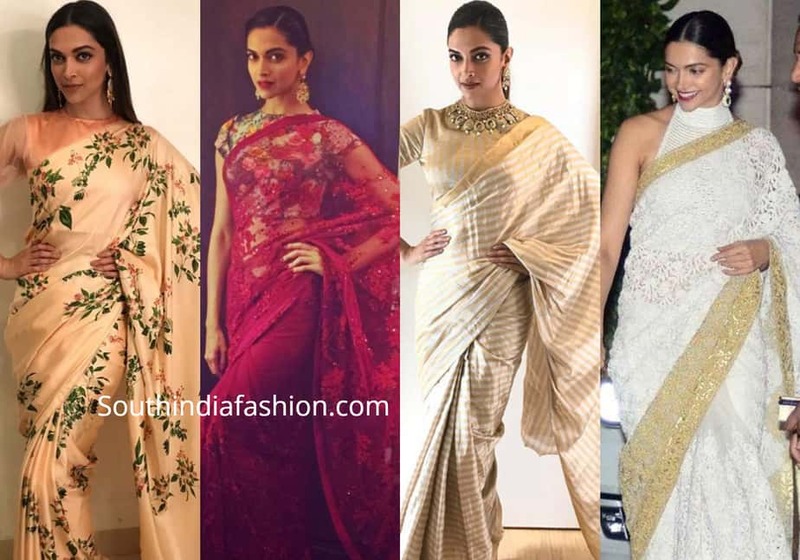 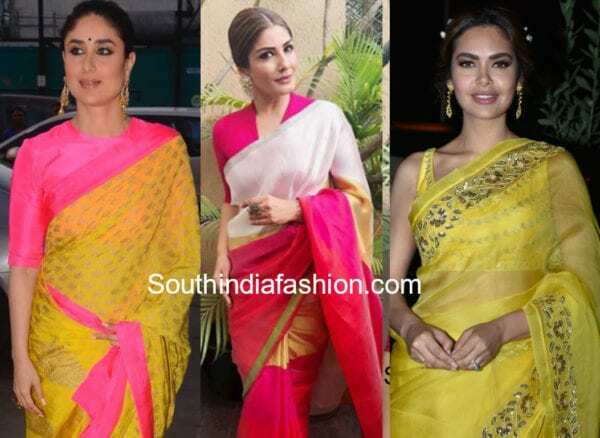 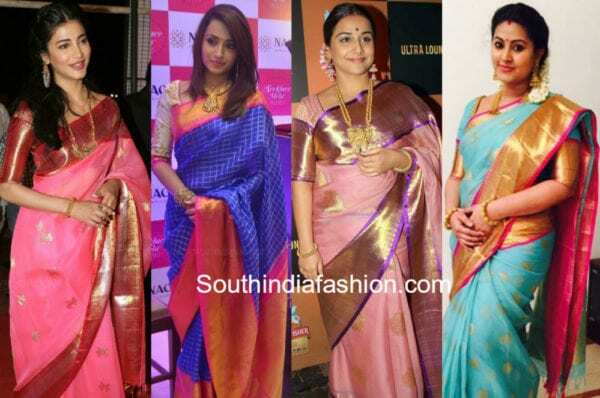 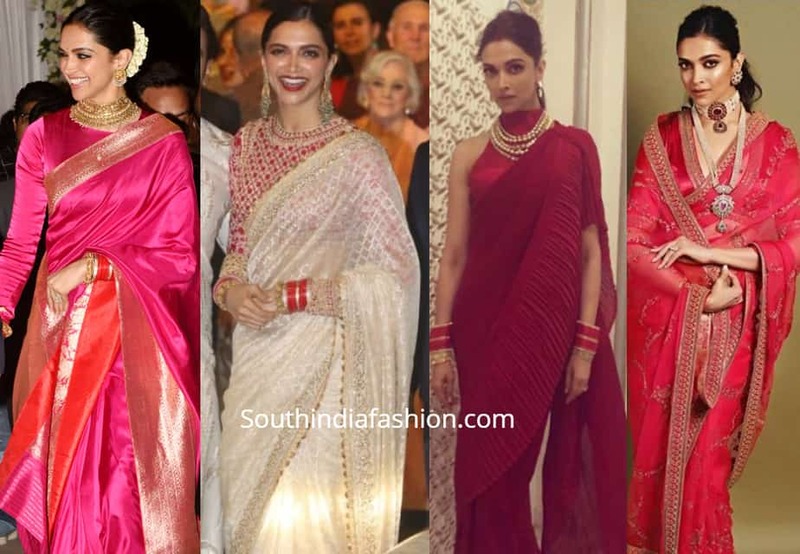 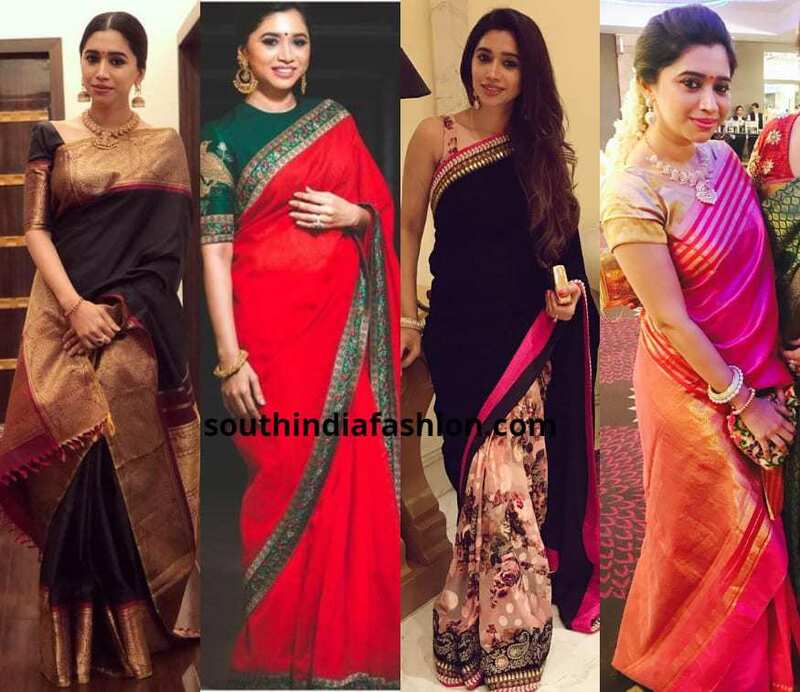 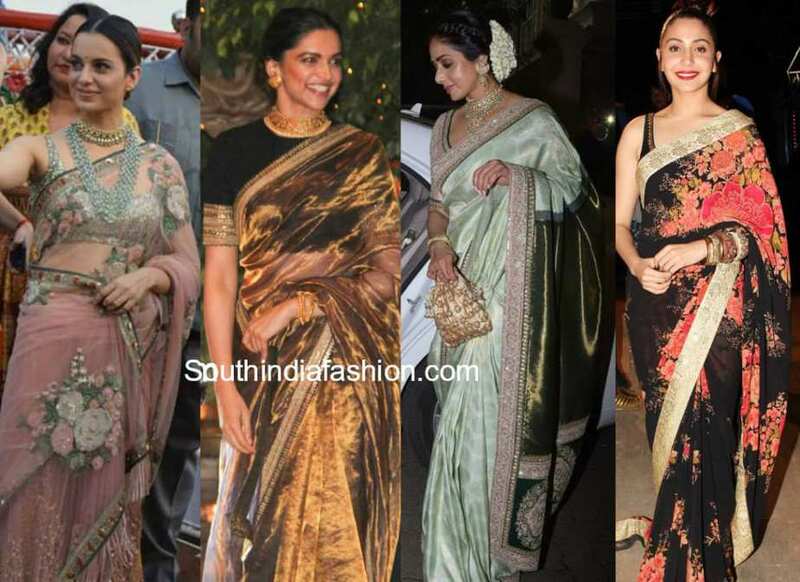 Four Actresses Who Are Making Saree the Biggest Fashion Trend! 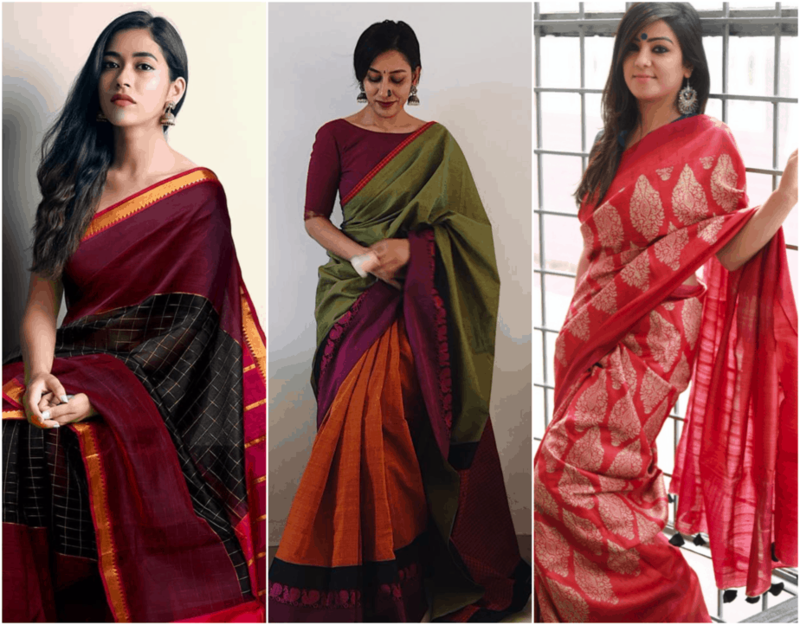 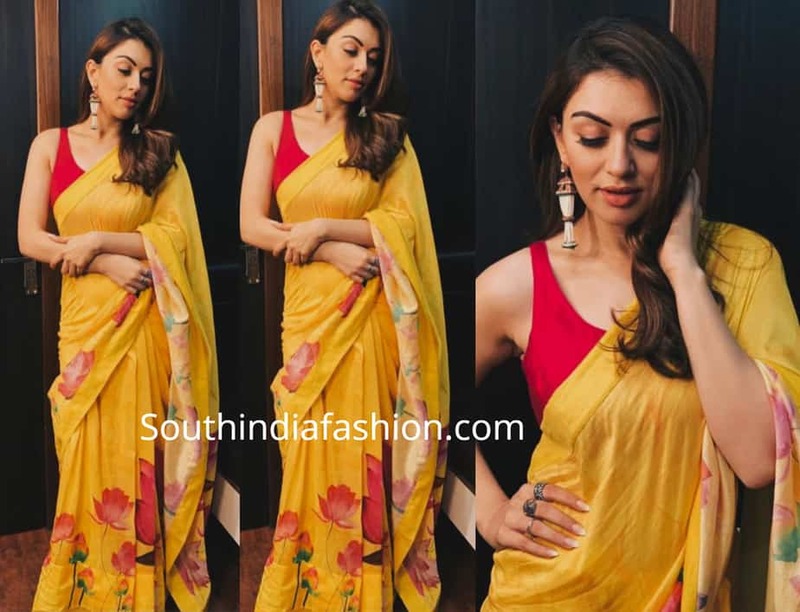 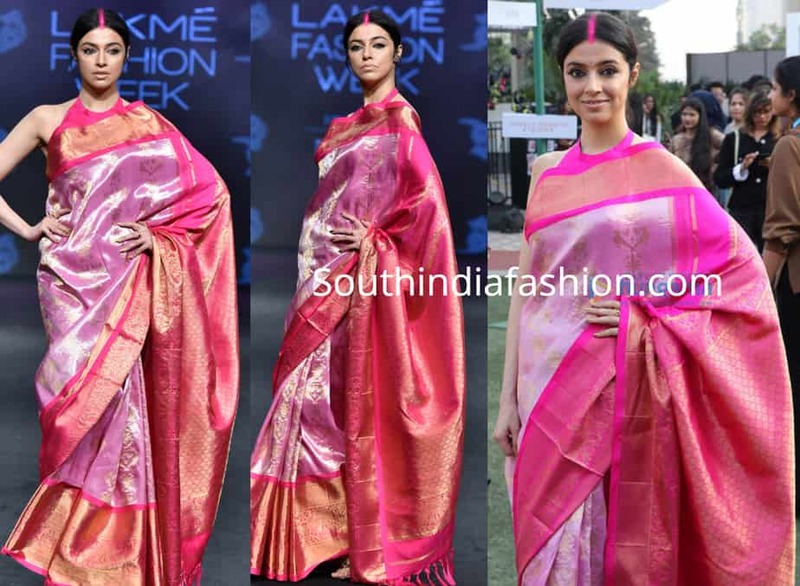 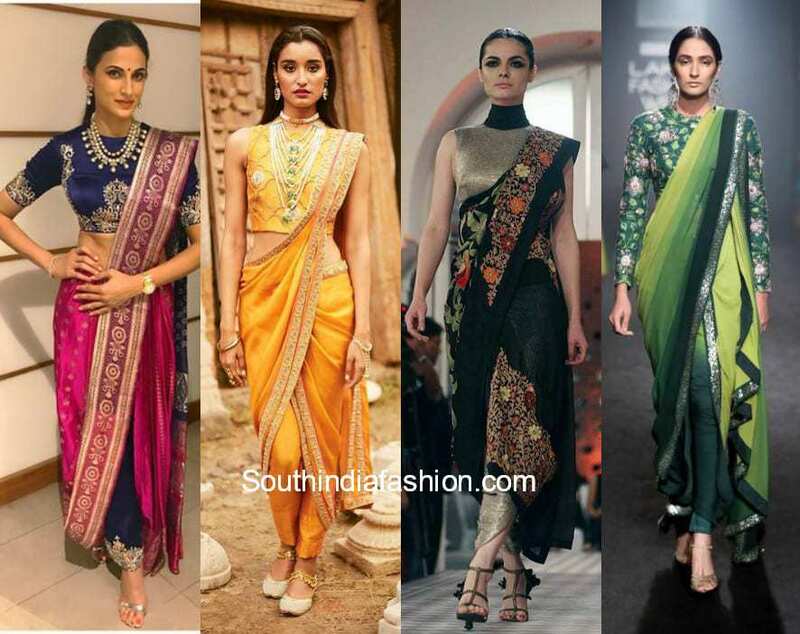 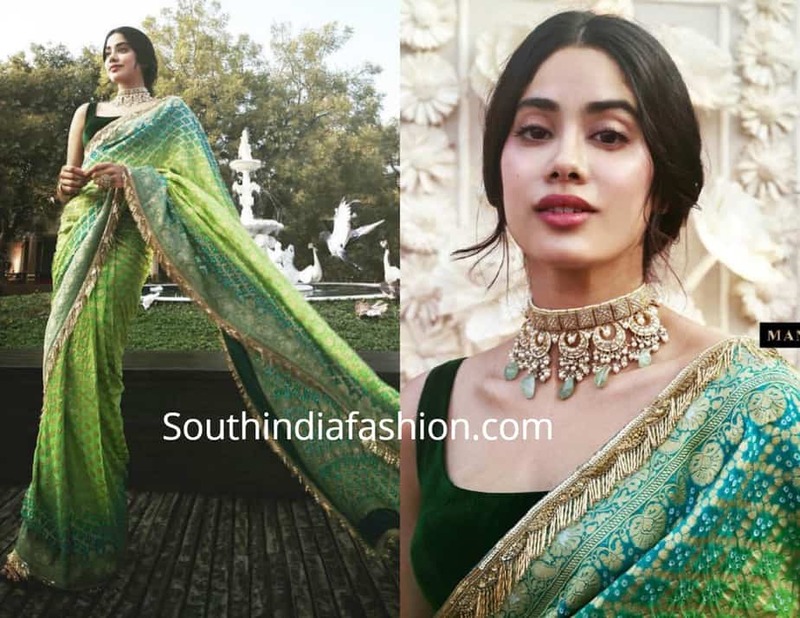 The Saree Story: How to style bold saree colours this summer and look amazing? 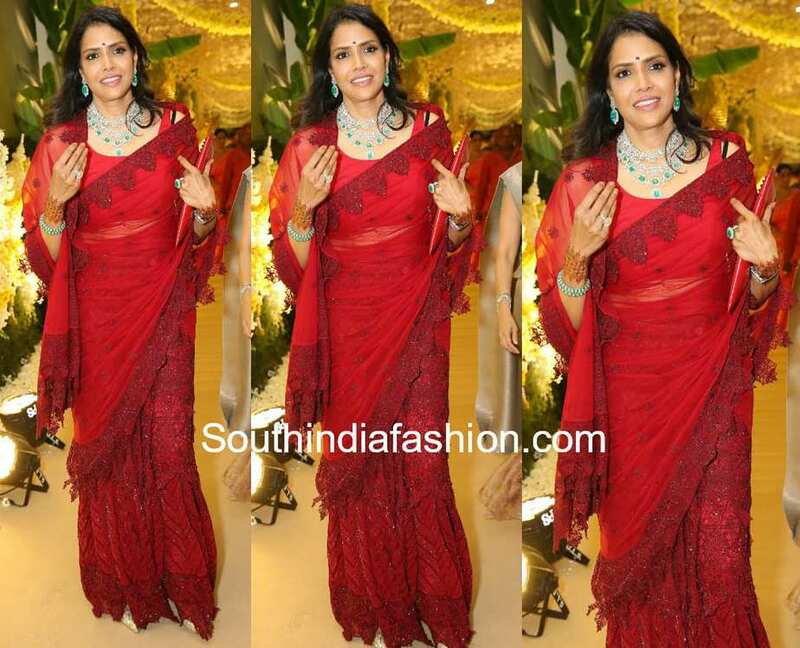 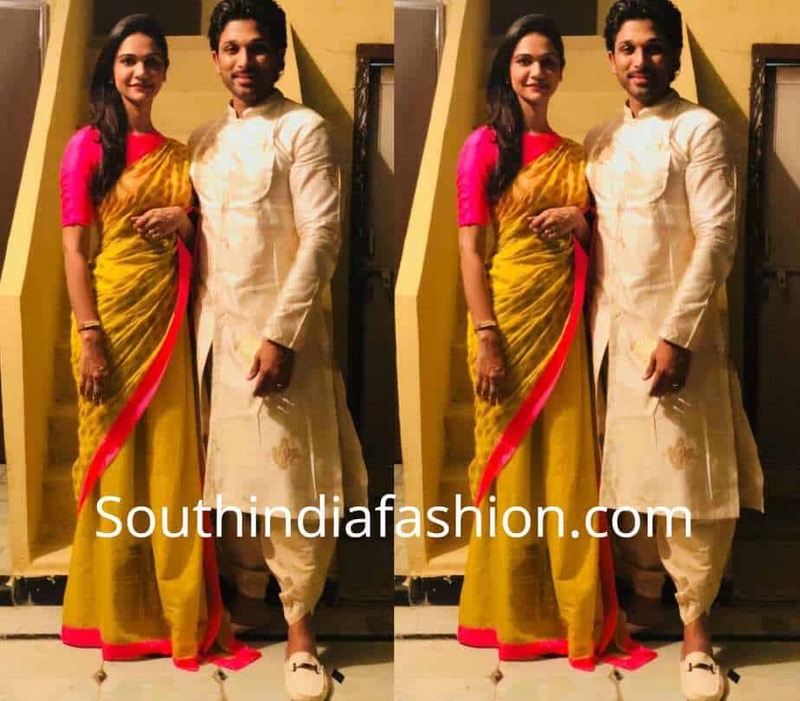 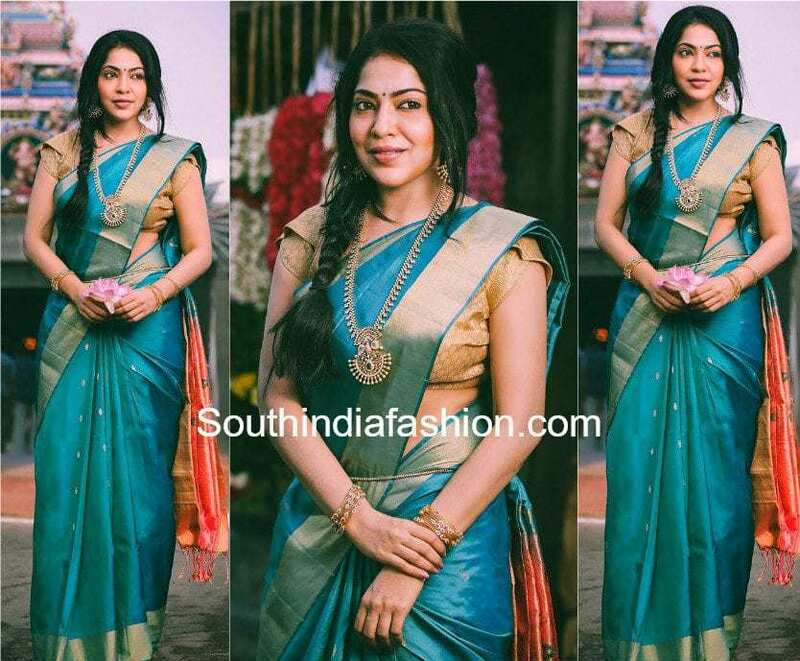 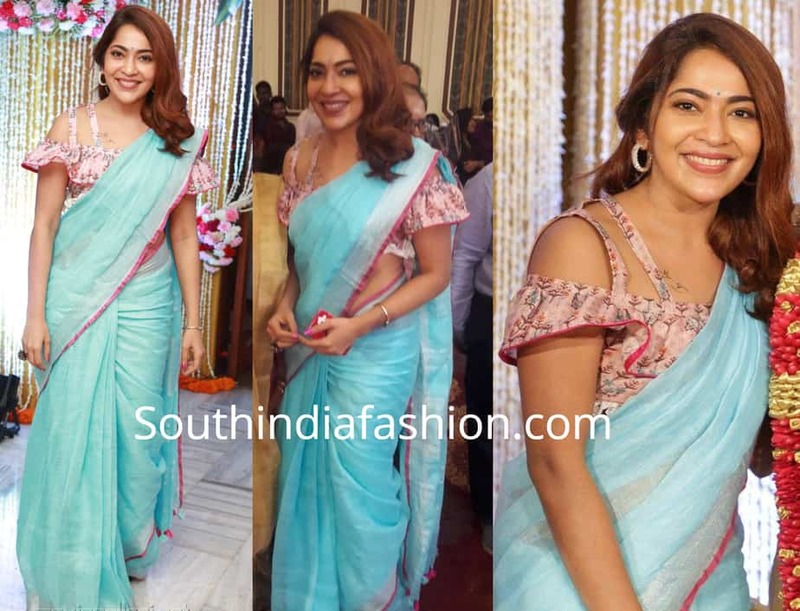 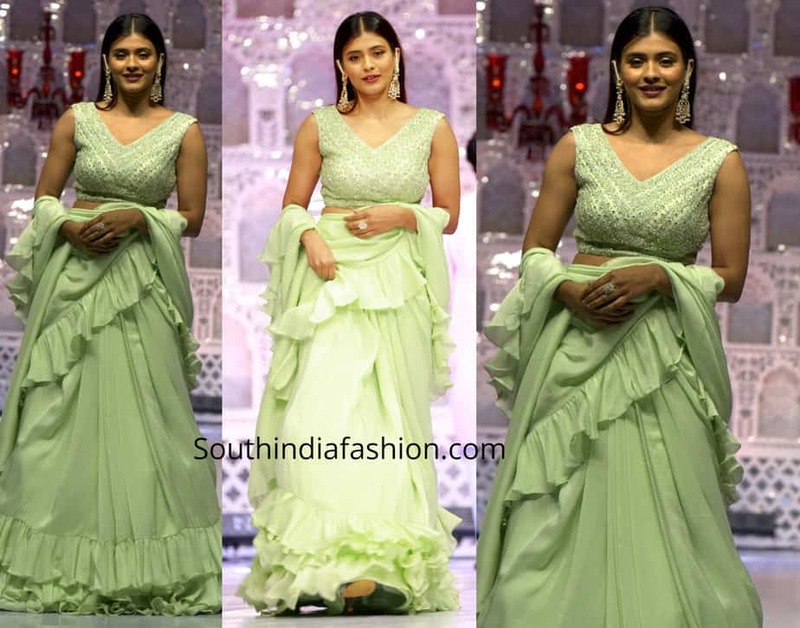 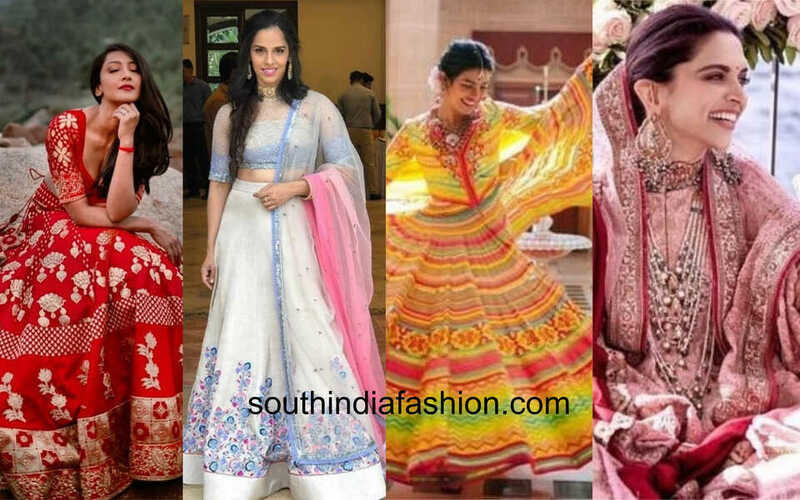 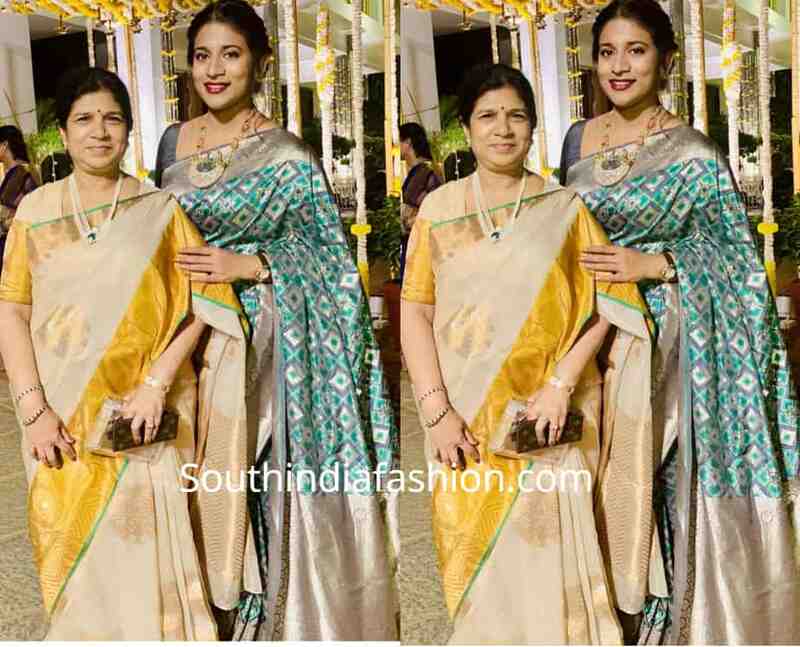 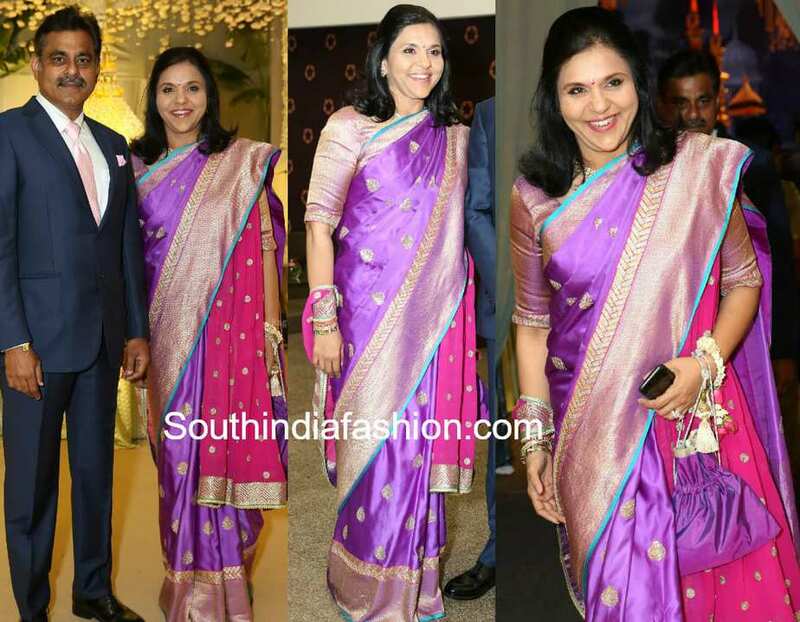 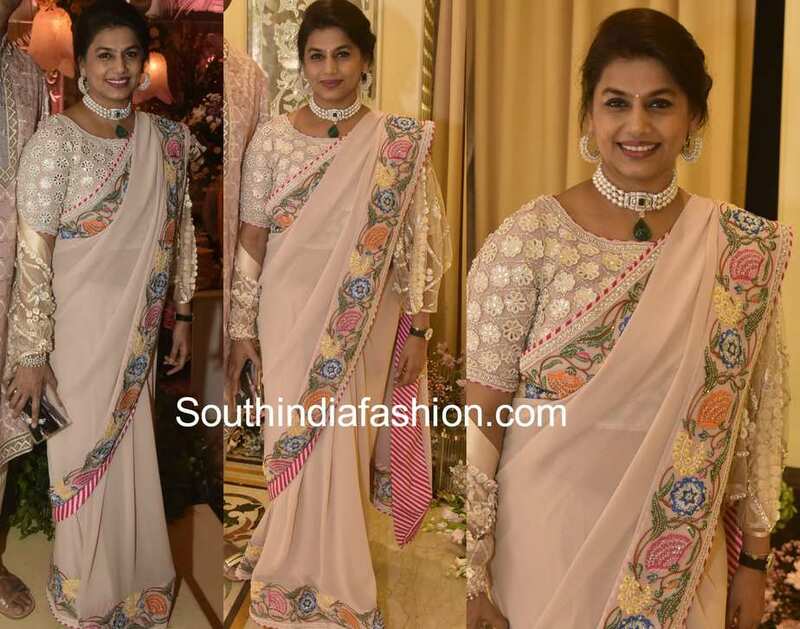 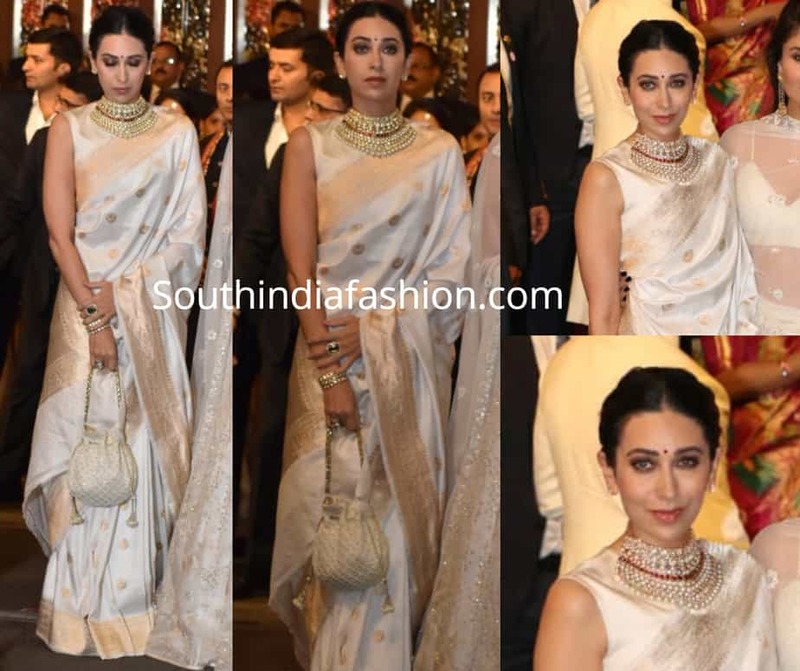 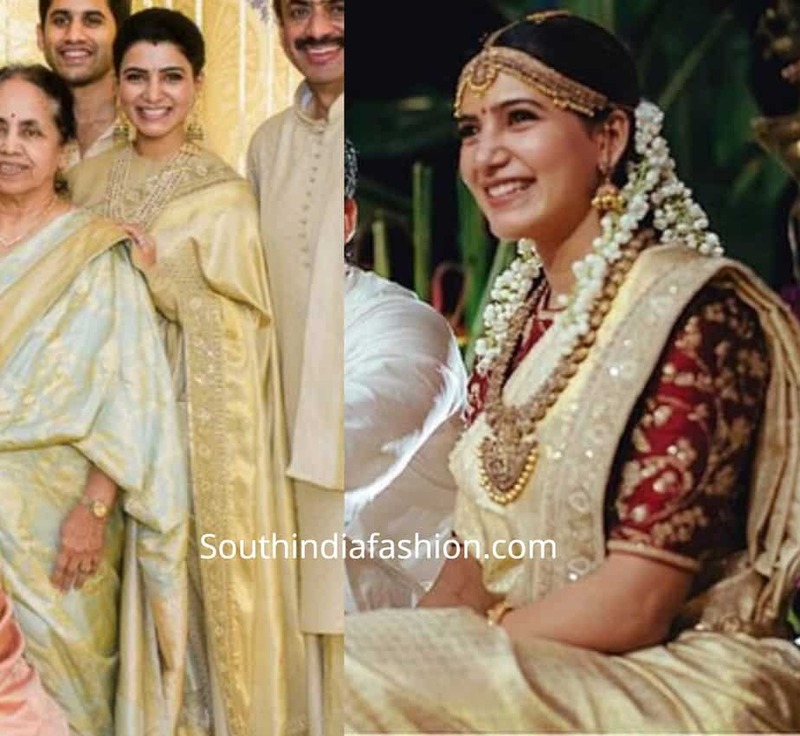 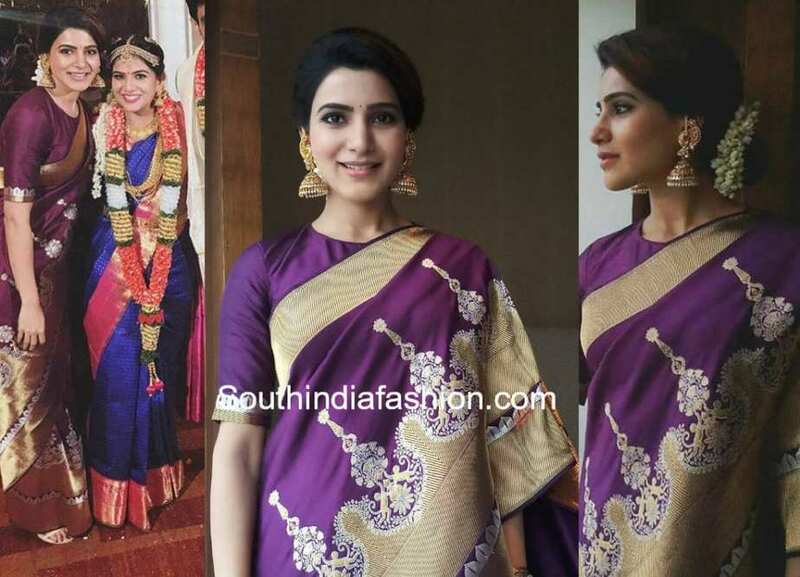 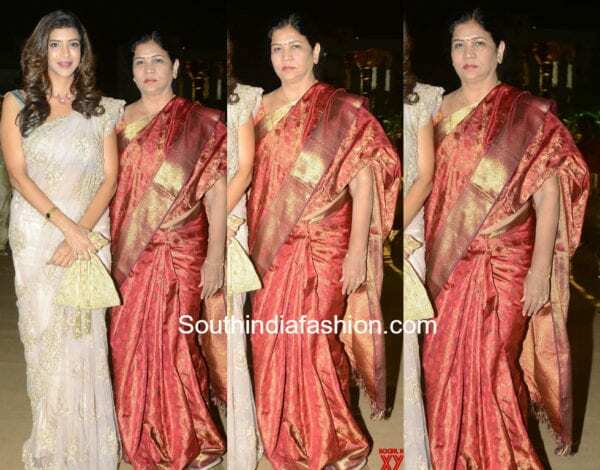 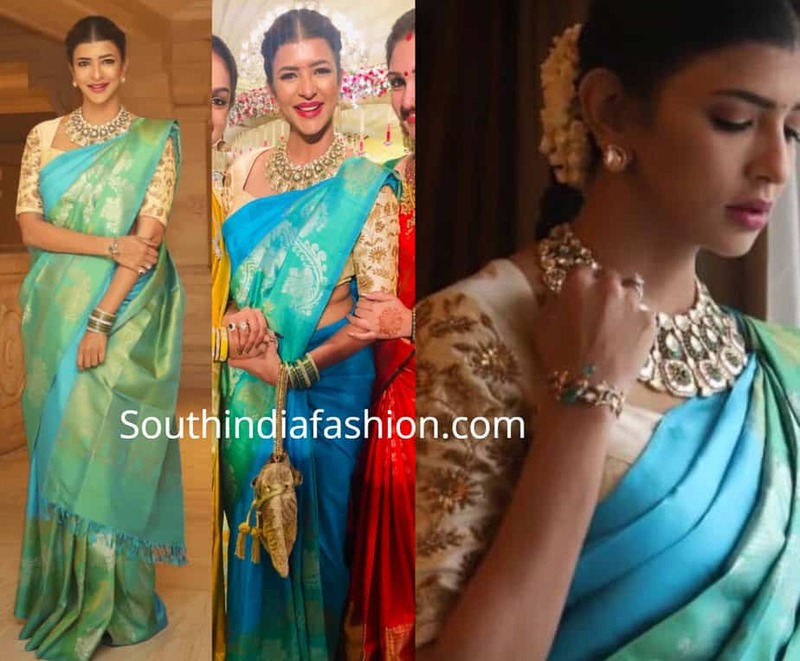 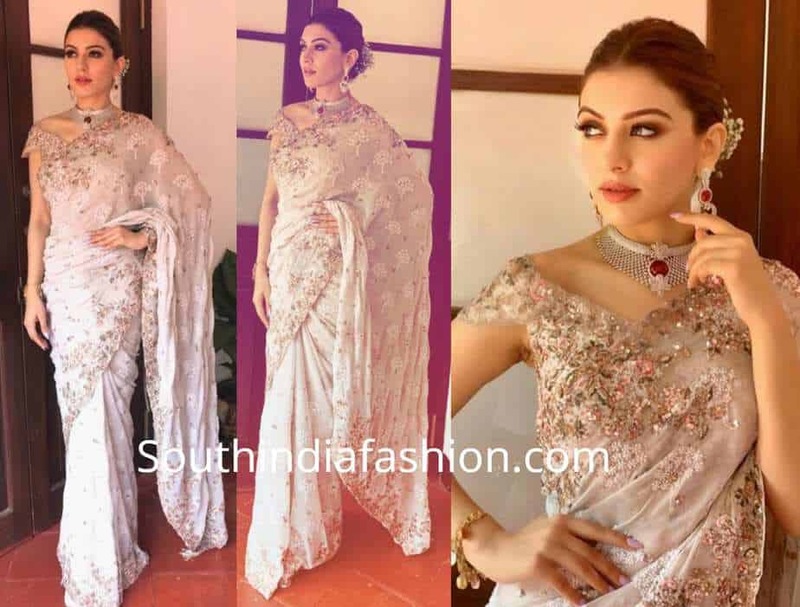 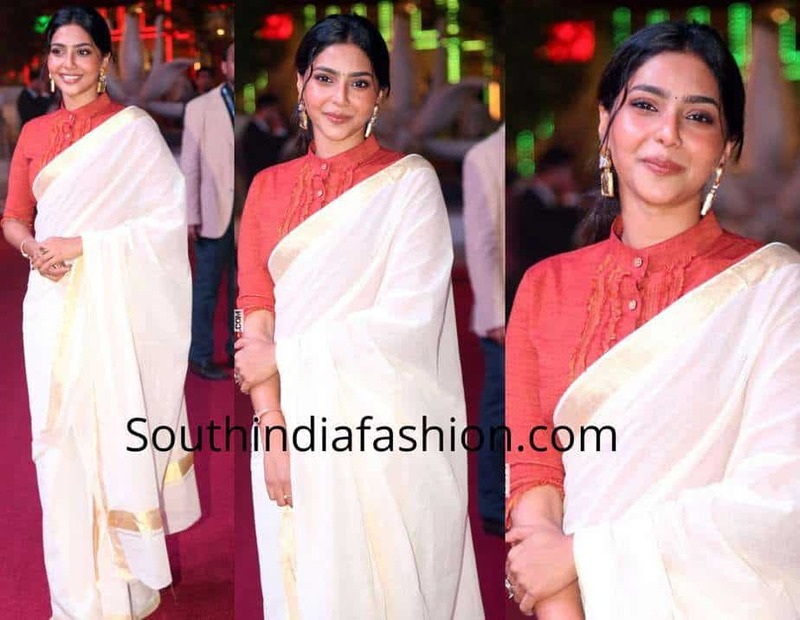 Lakshmi Manchu’s Wedding Guest Look!